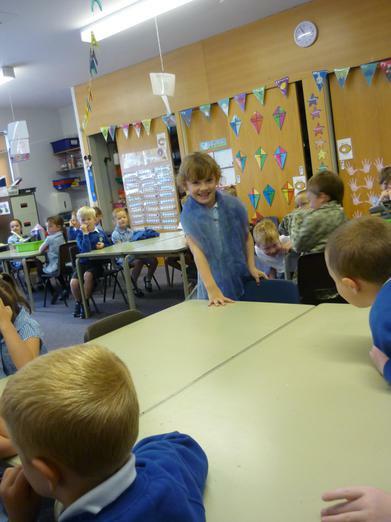 Welcome to Class 1M. 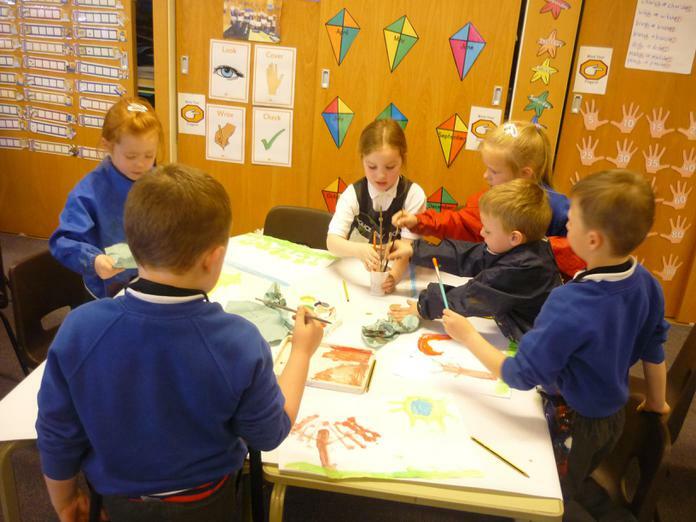 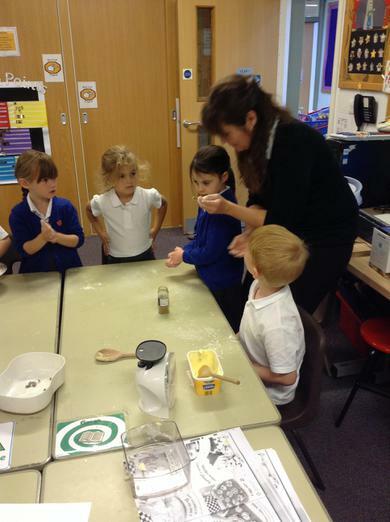 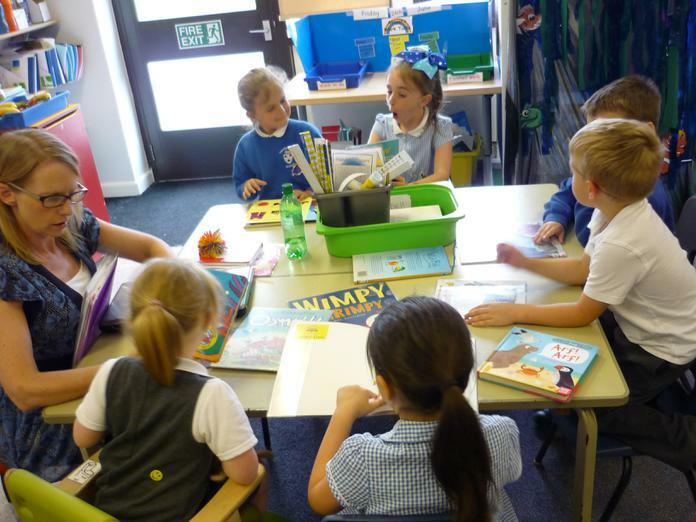 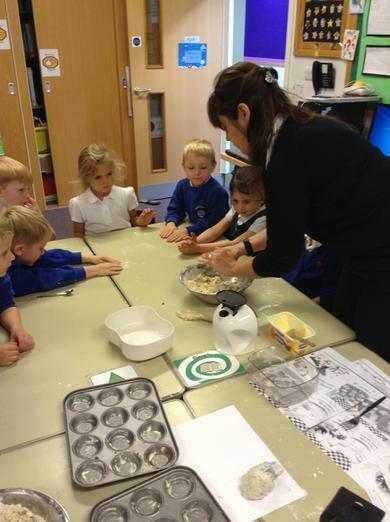 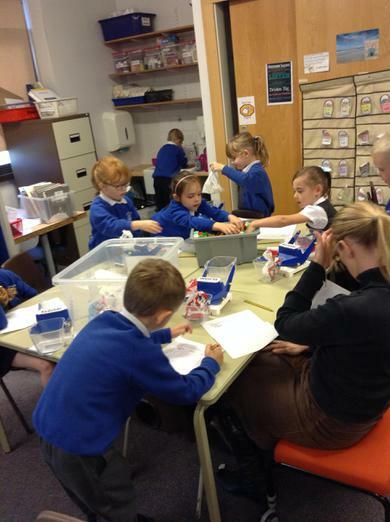 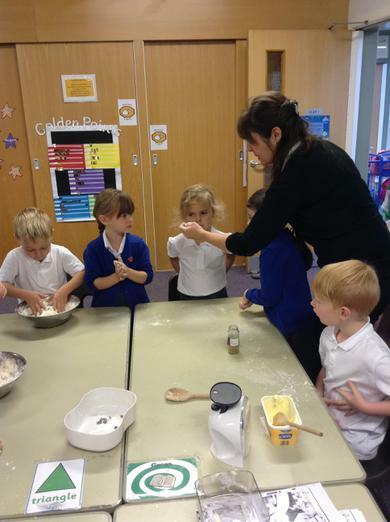 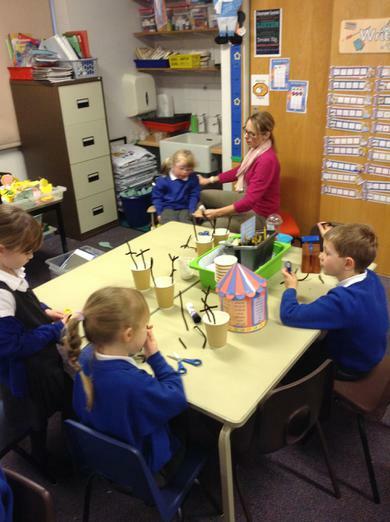 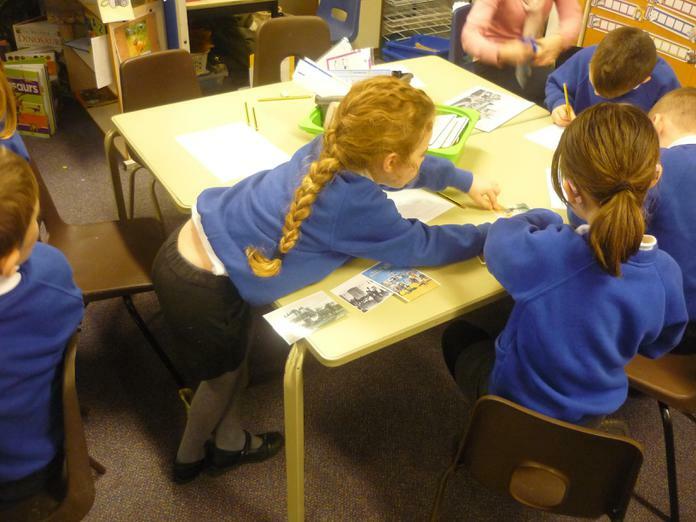 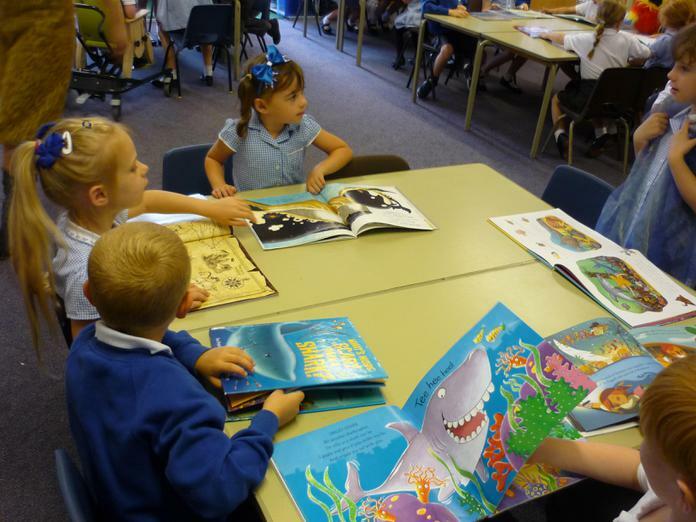 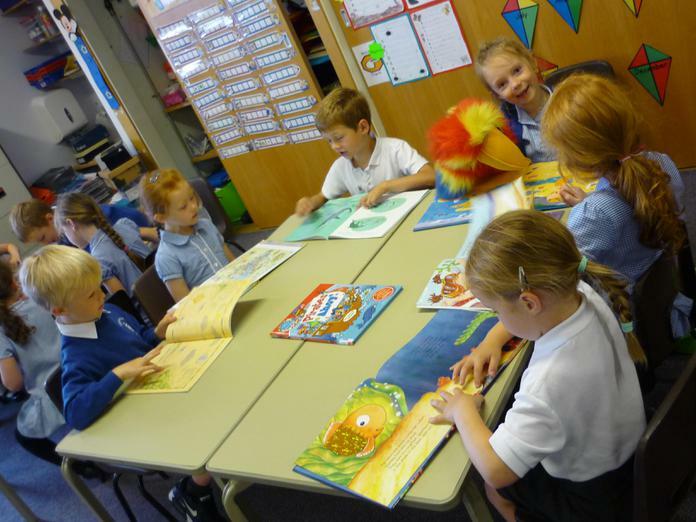 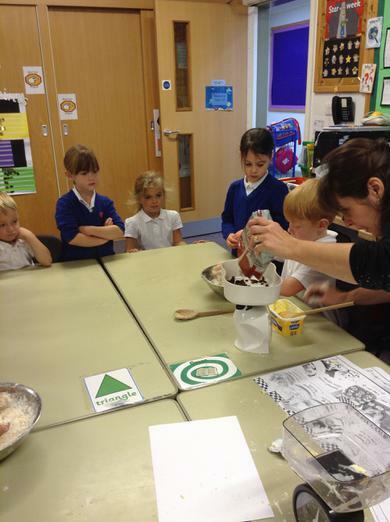 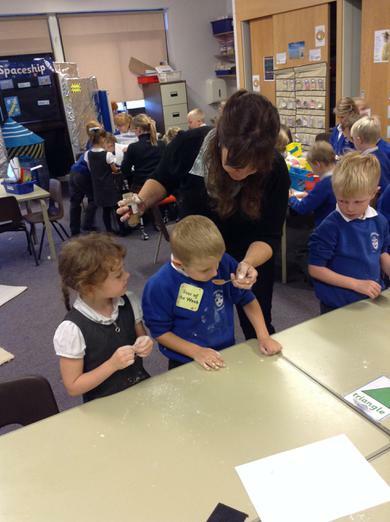 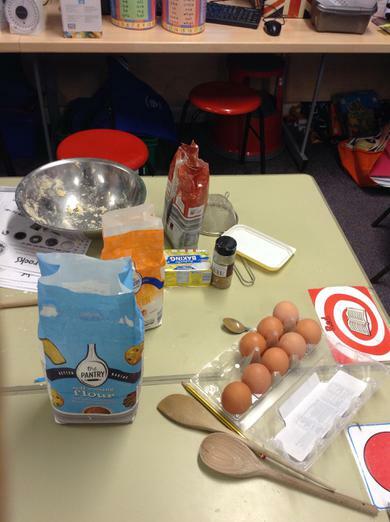 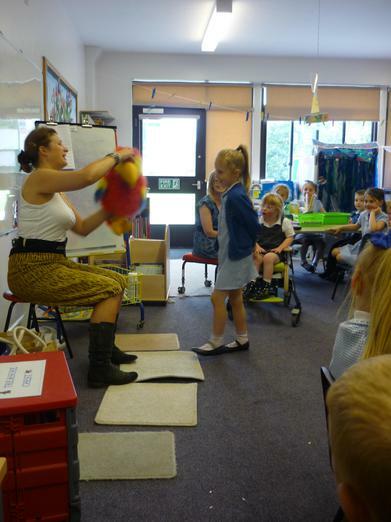 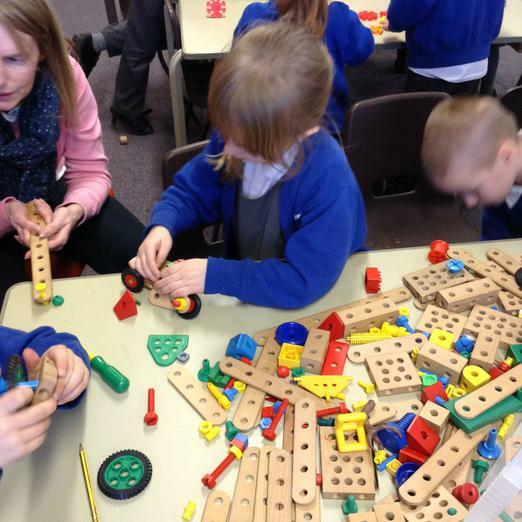 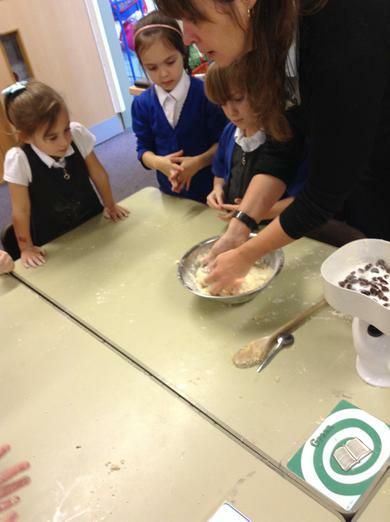 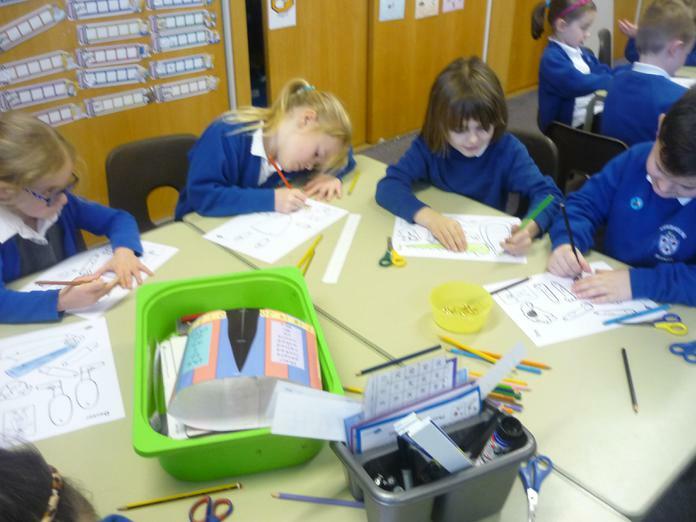 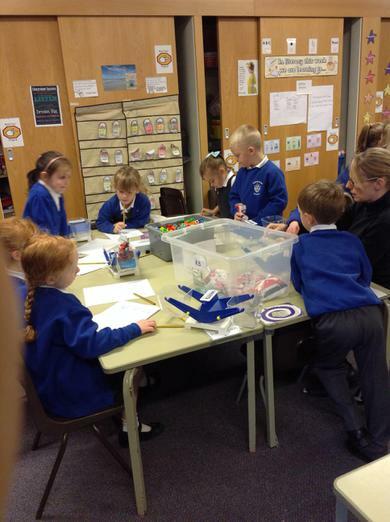 Your class teacher is Miss Metcalfe and also helping in the class are Mrs Davies and Mrs Harrison. 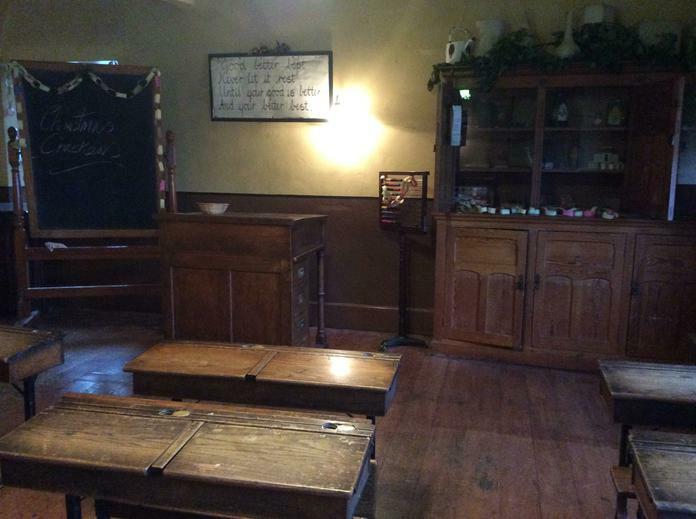 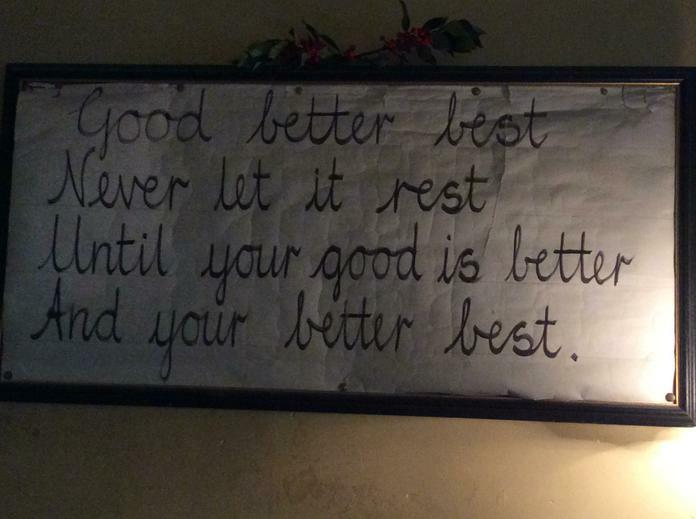 On Tuesdays the class will be taught by Mrs Green and Senora Pitcher. 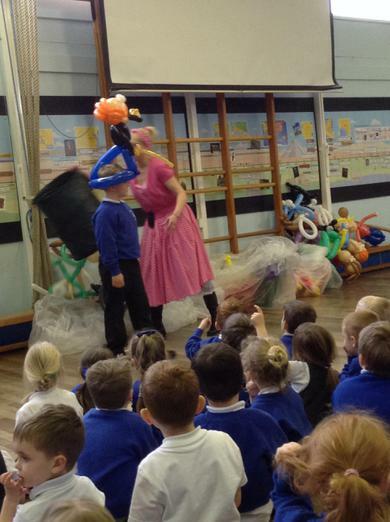 Our topic this half term is ’commotion in the ocean’. 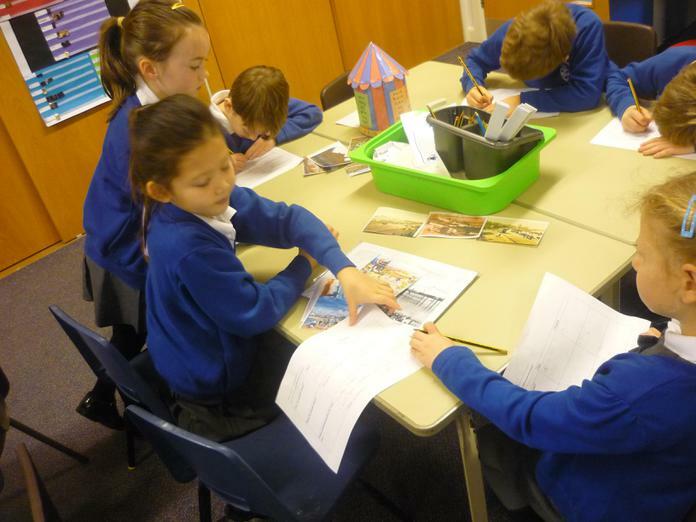 We are going to be learning about the United Kingdom, naming the countries and the capital cities. 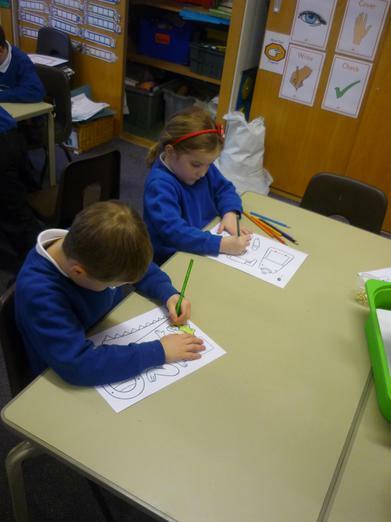 We will learn to name and locate the world’s continents and oceans. 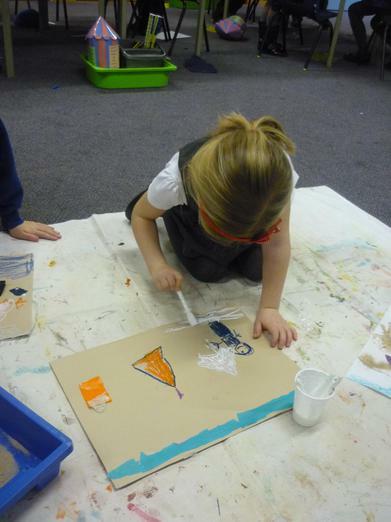 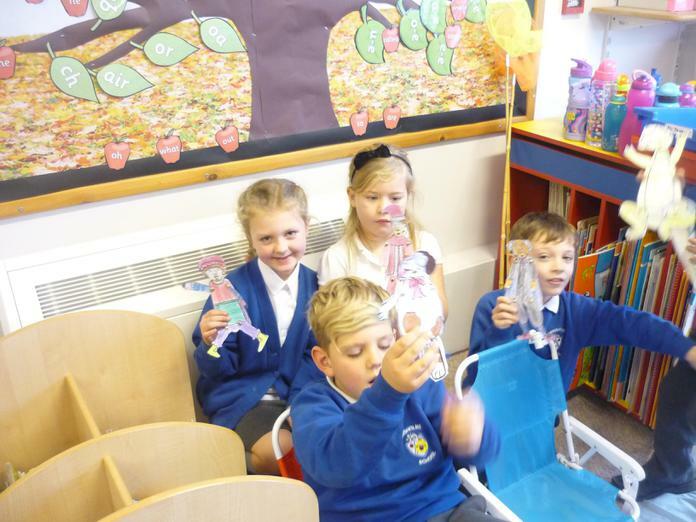 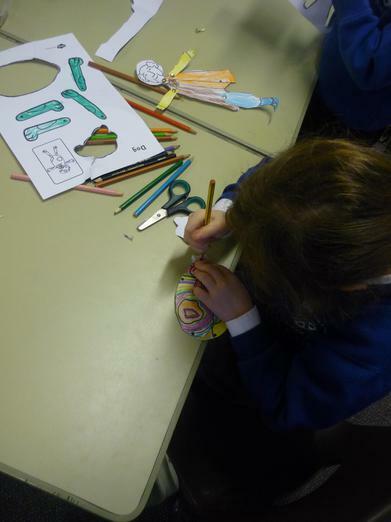 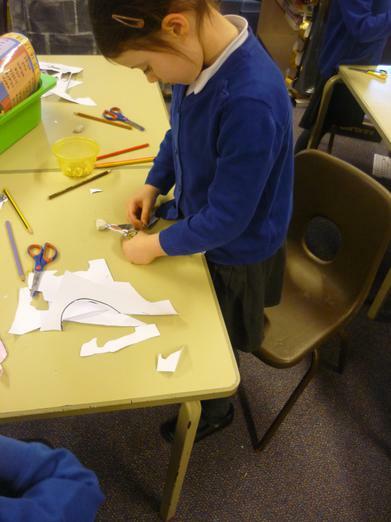 We will use simple sewing techniques to create a rainbow fish and make a moving picture using levers. 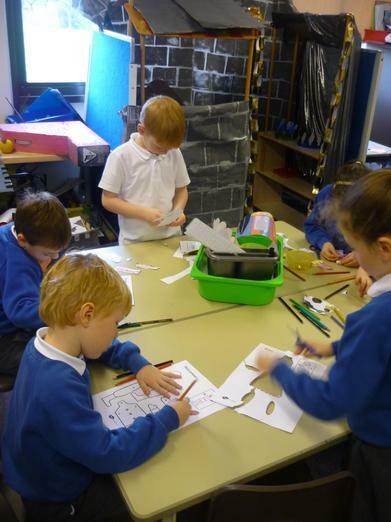 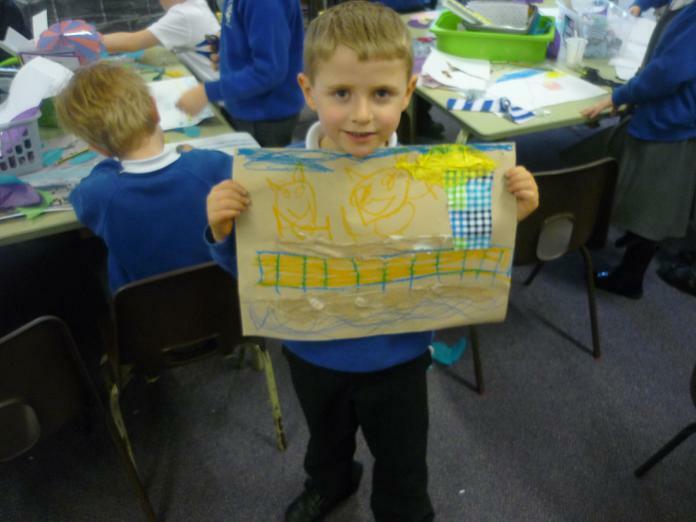 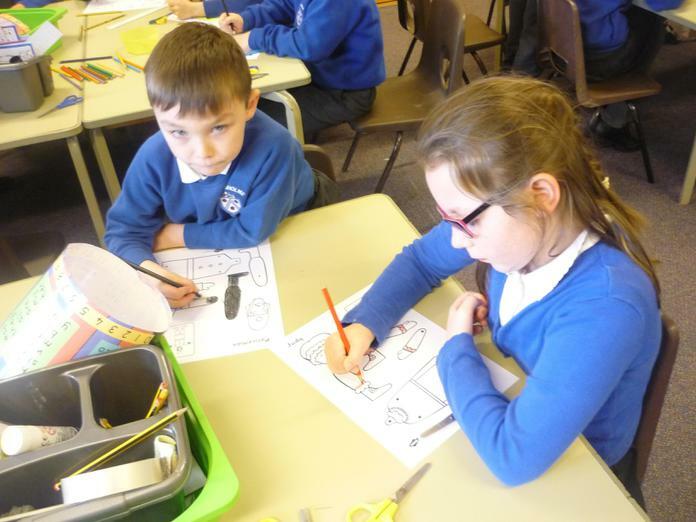 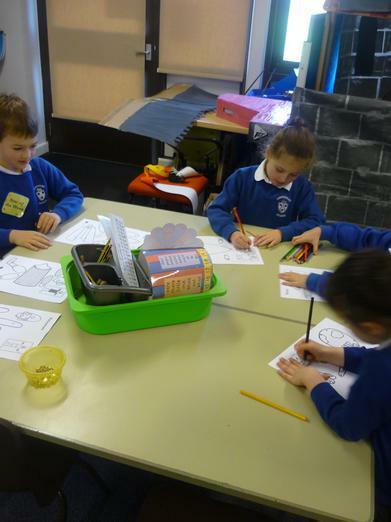 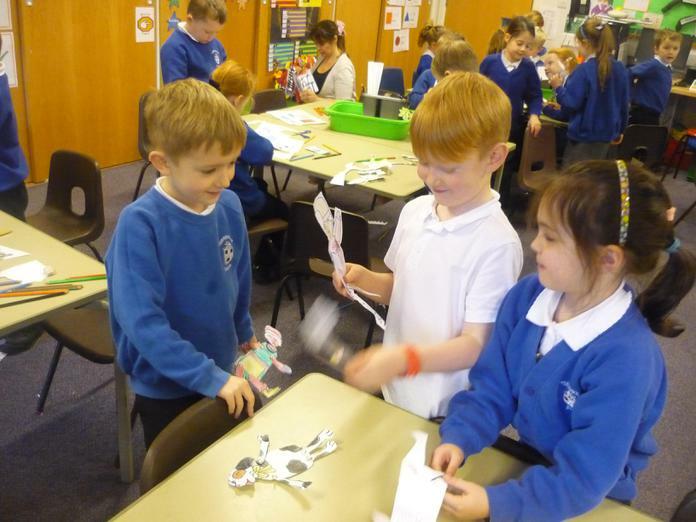 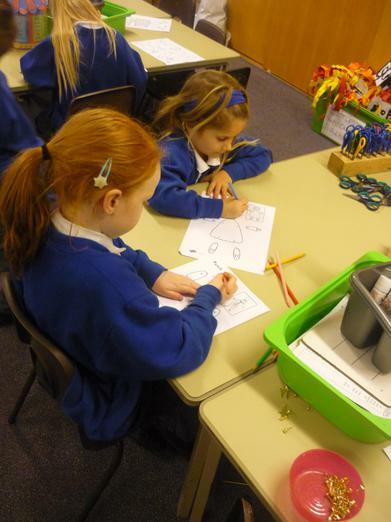 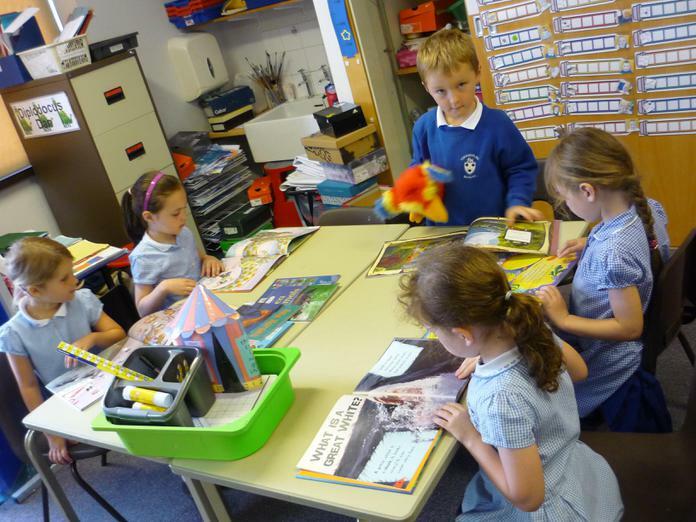 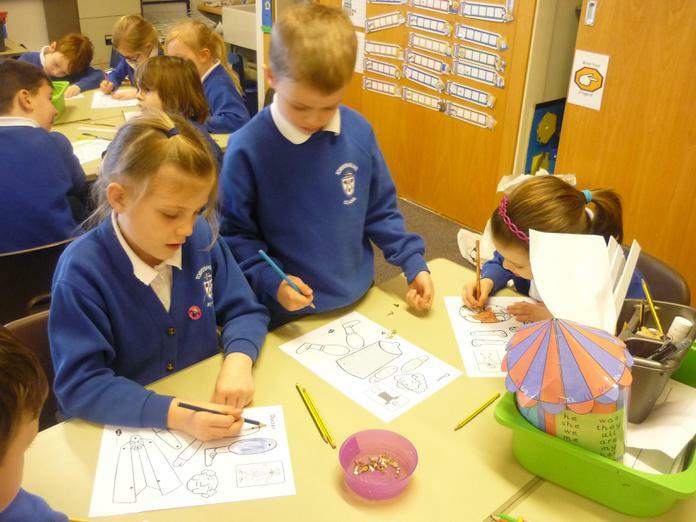 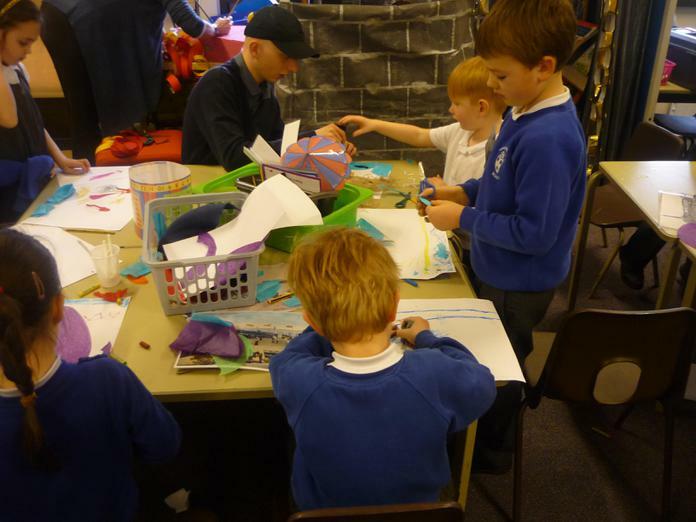 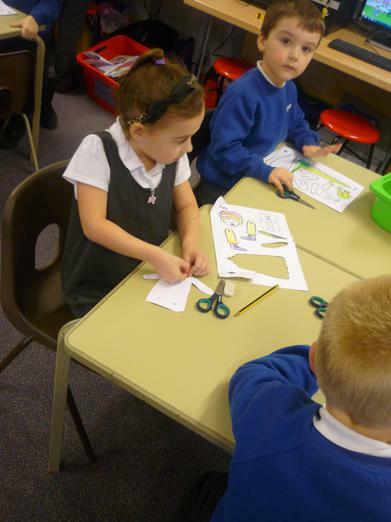 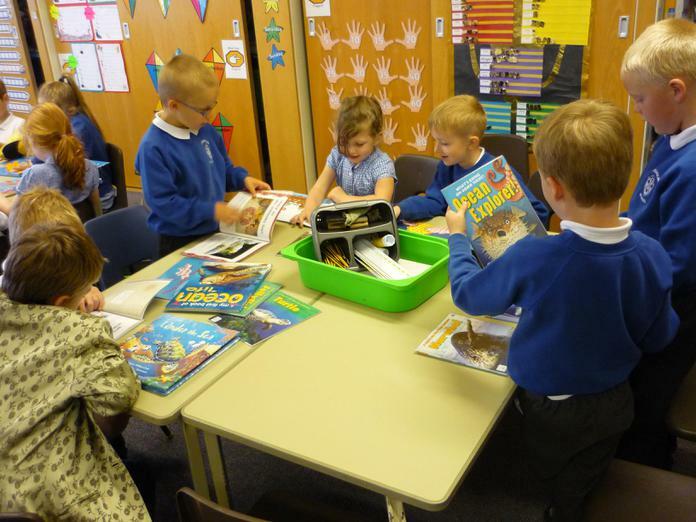 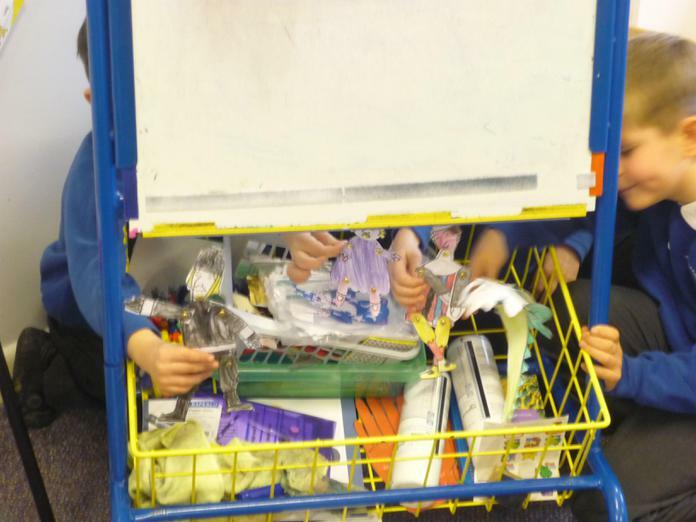 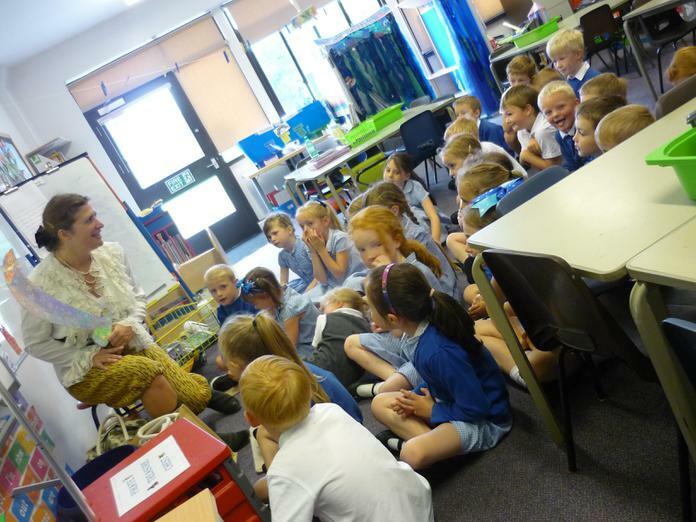 We are going to have a joint unit with the Reception classes where we learn about pirates. 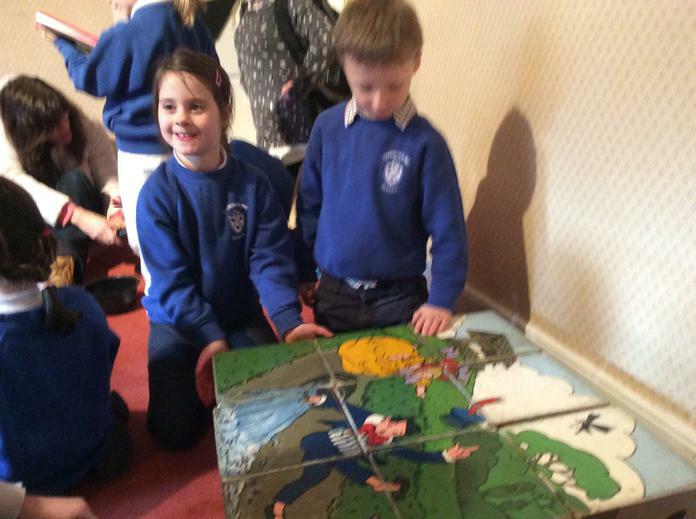 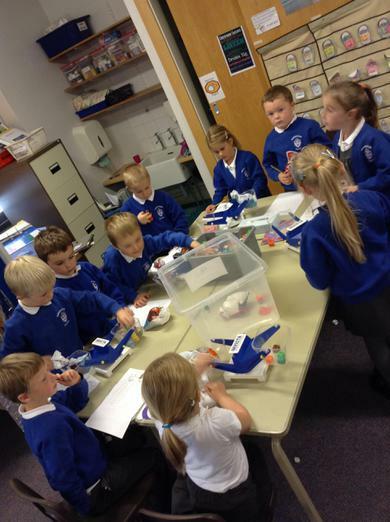 We will also learn about the history of the RNLI and how to be safe around water. 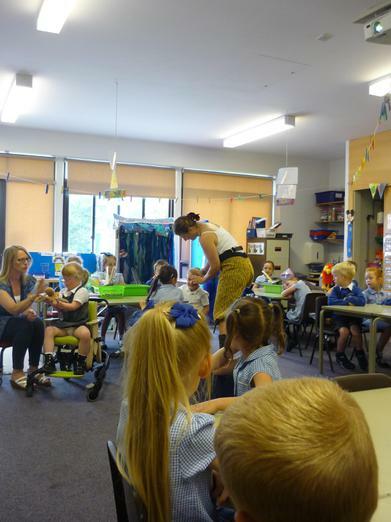 Watch Mr Thorne and Geraldine the Giraffe take you on a learning journey through the world of phonics, learning letters and sounds along the way. 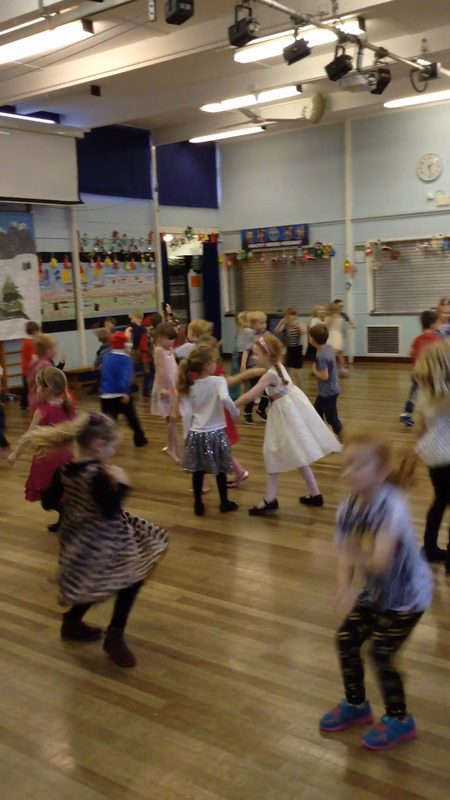 Please LIKE the video and SUBSCRIBE to our channel! 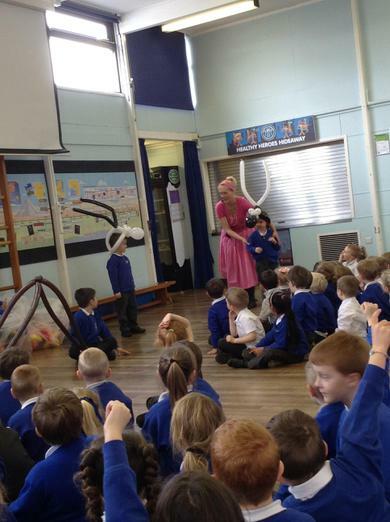 We were very lucky and we had Pirate Zoe come to visit us today. 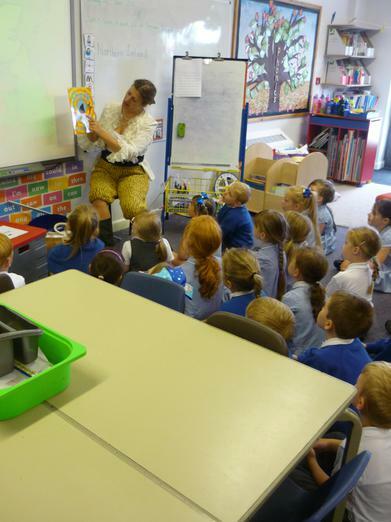 She read us pirate stories and we had great fun! 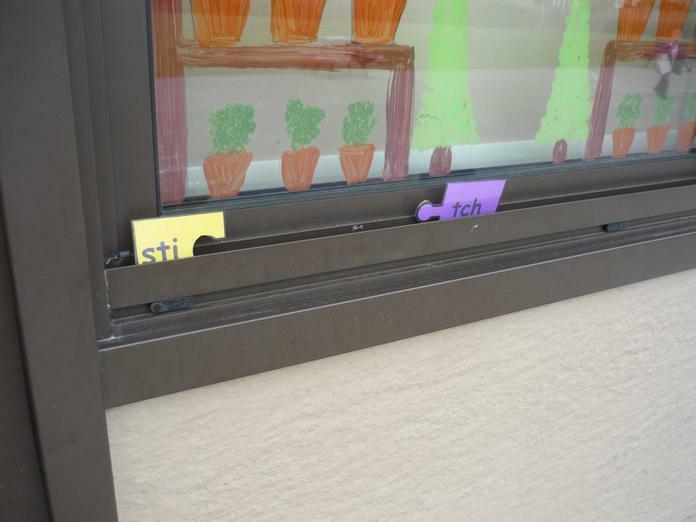 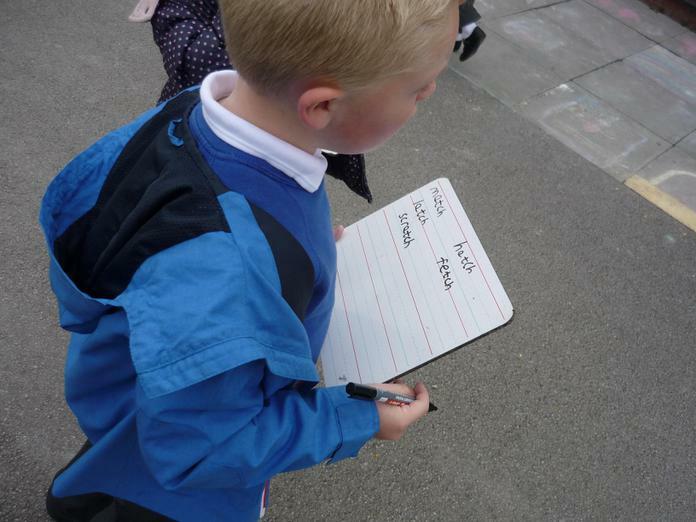 We have been looking at words containing 'tch' today. 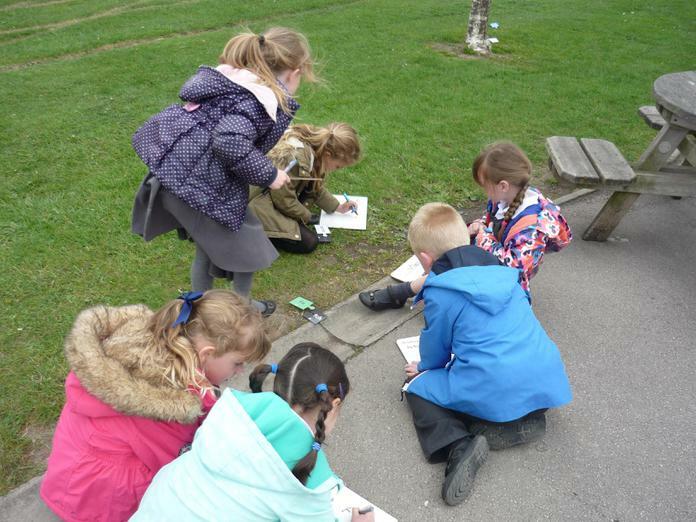 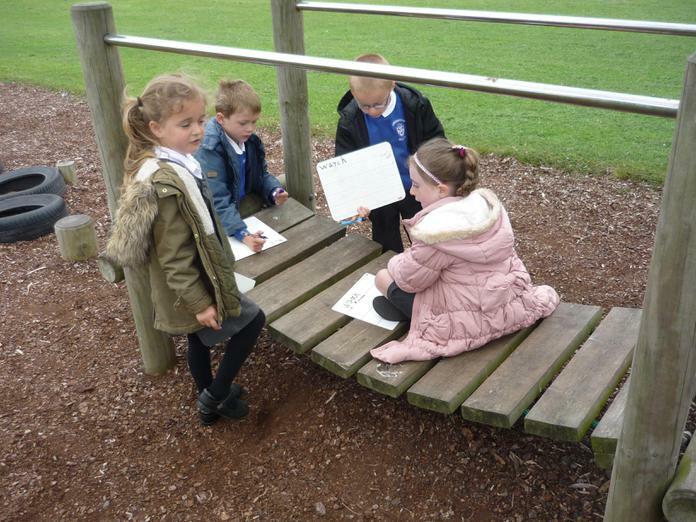 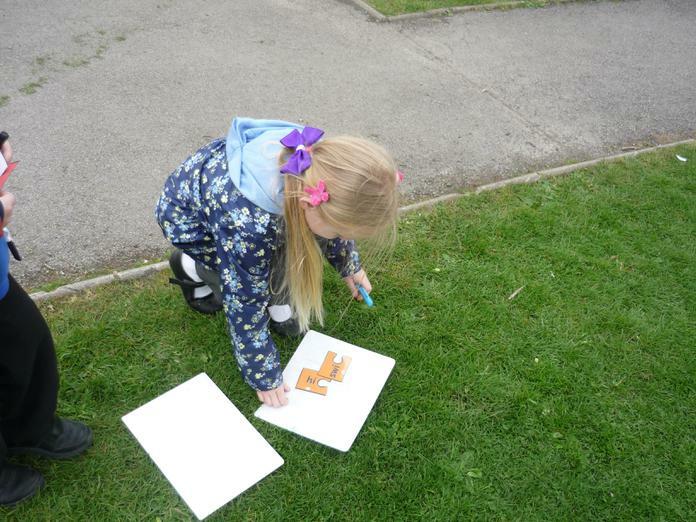 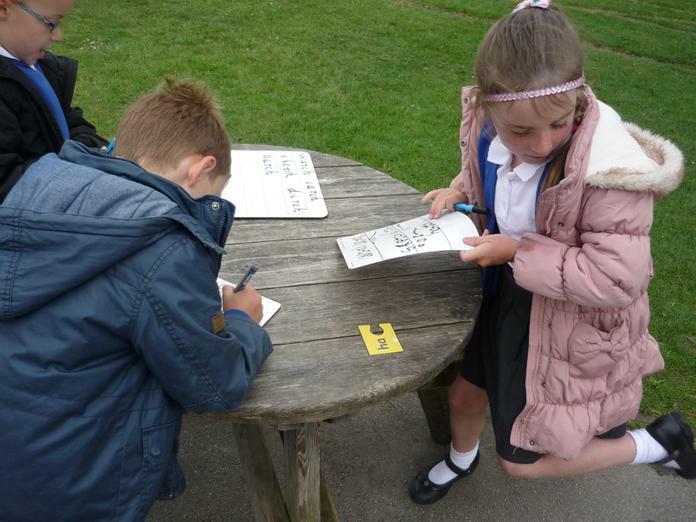 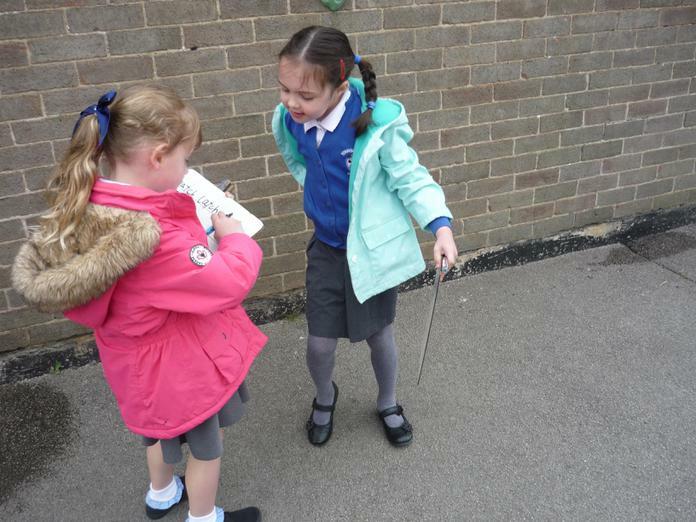 We went outside and matched jigsaw words up and then tried to add different suffixes. 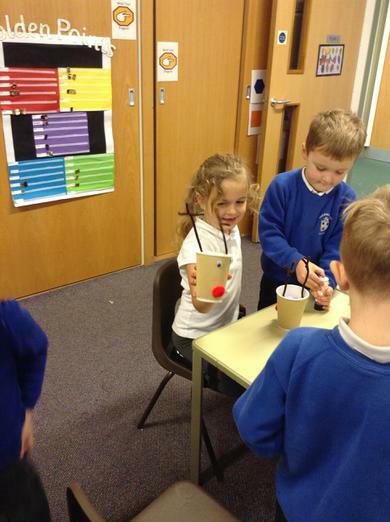 We will have spellings containing these sounds, please help us to practice. 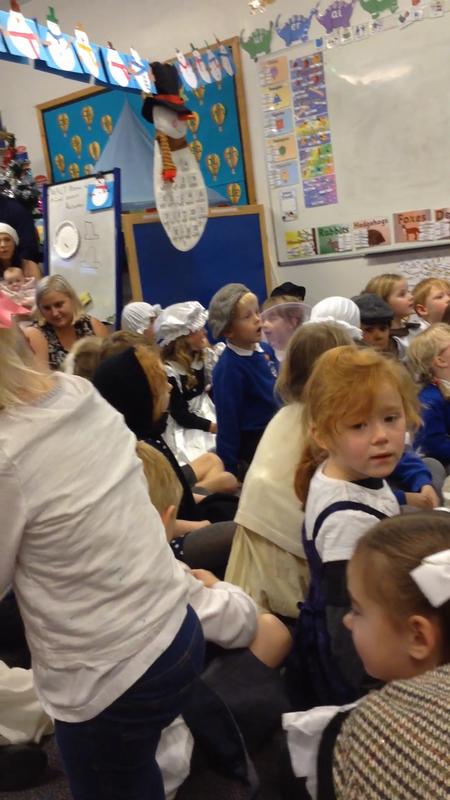 Well done to everyone in Year one for their fantastic performance of 'Rise and Shine'. 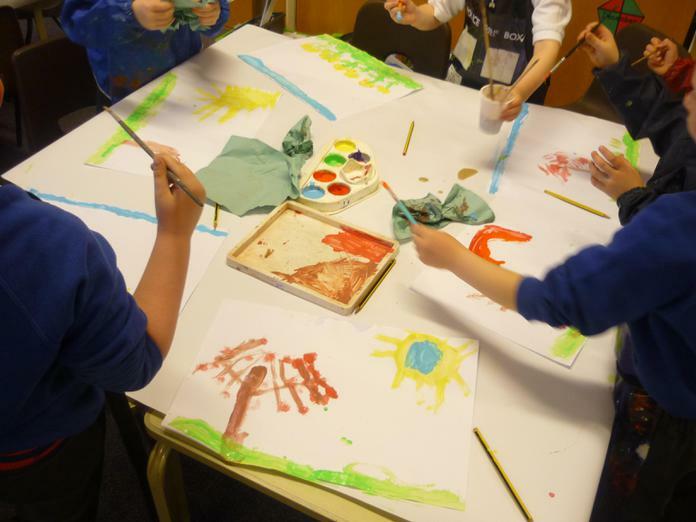 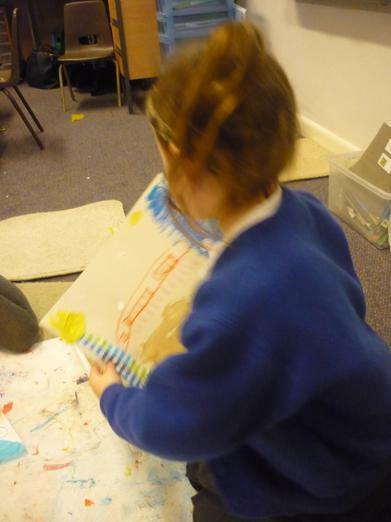 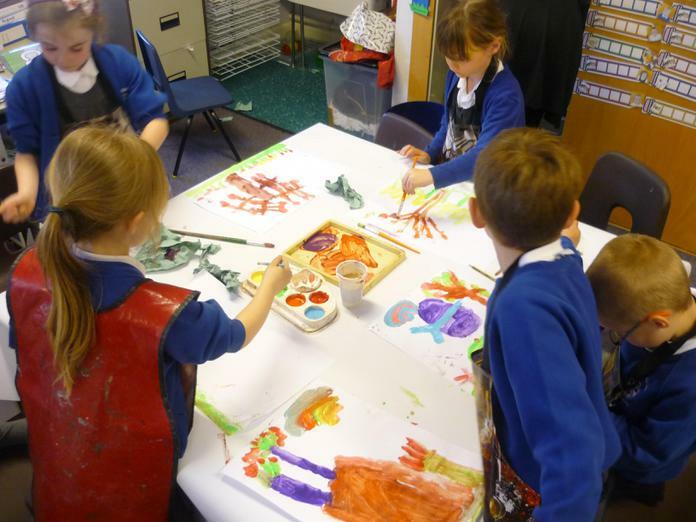 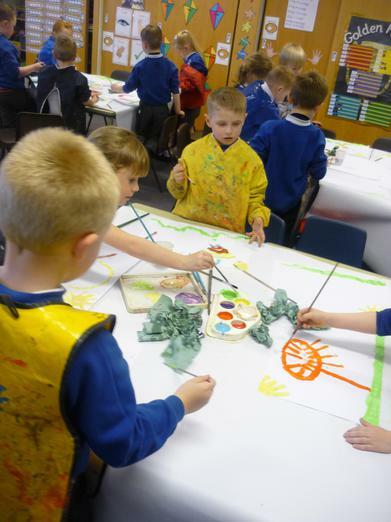 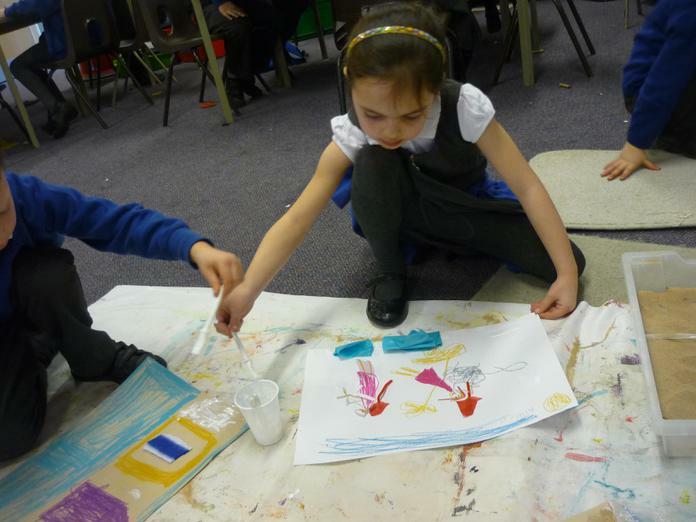 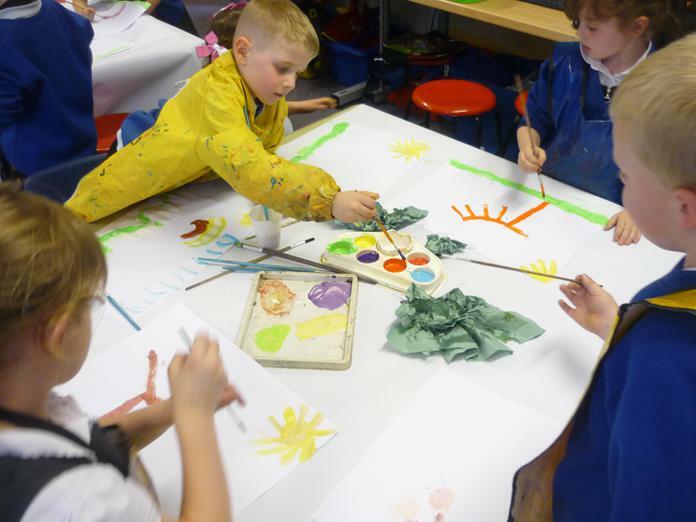 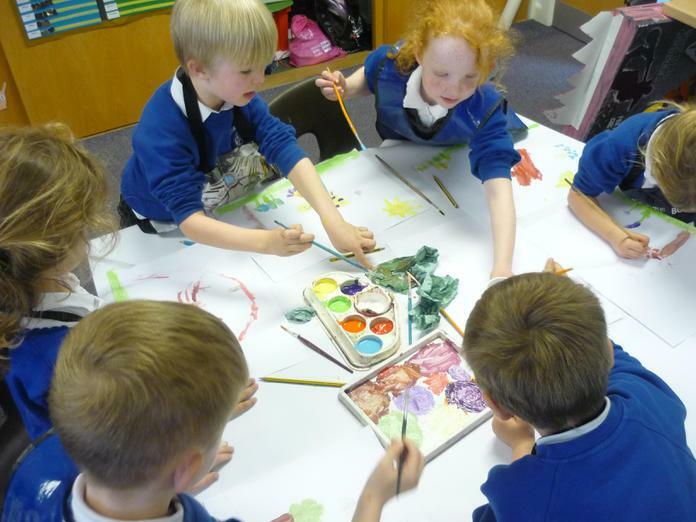 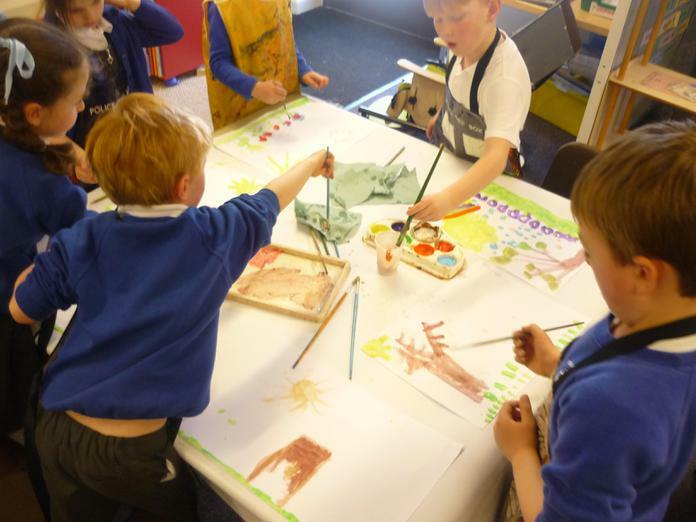 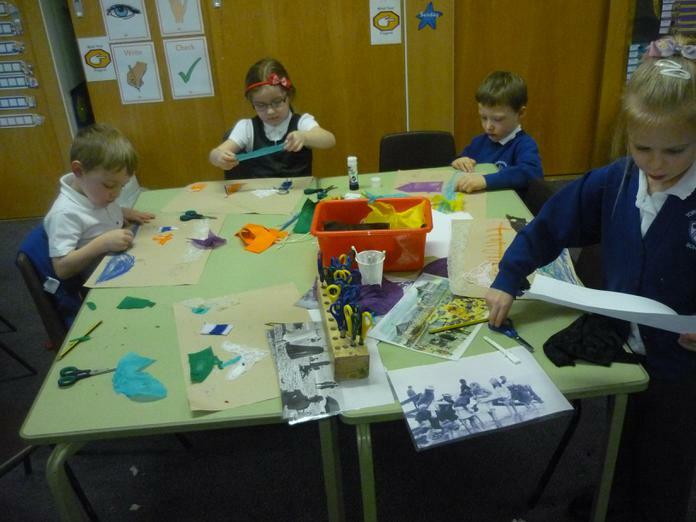 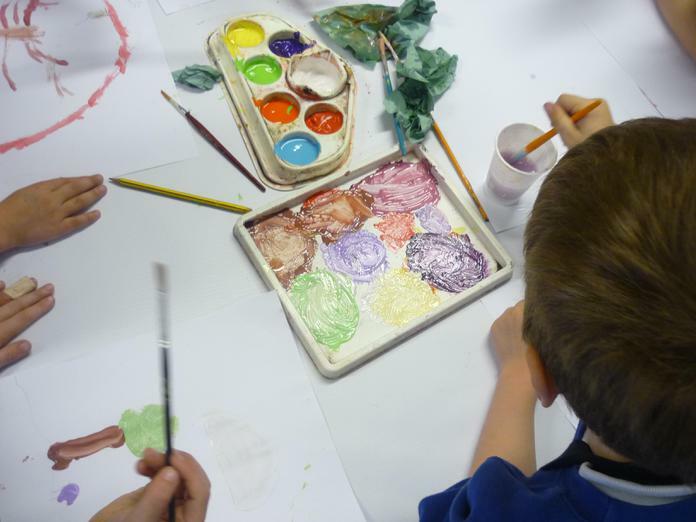 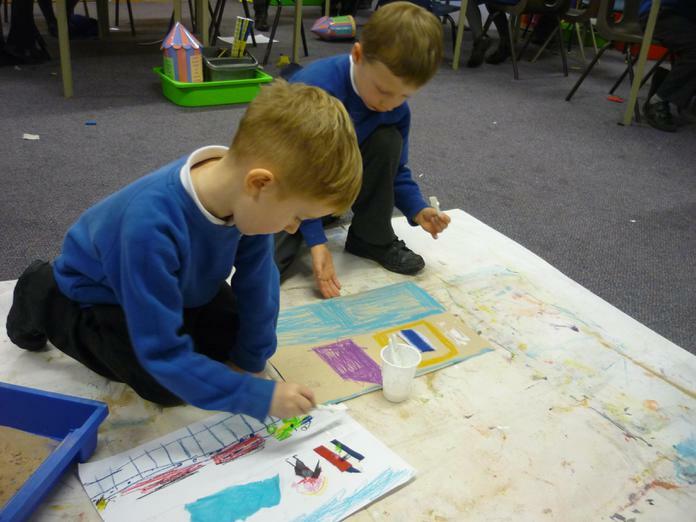 We have been colour mixing today, whilst creating Spring time paintings. 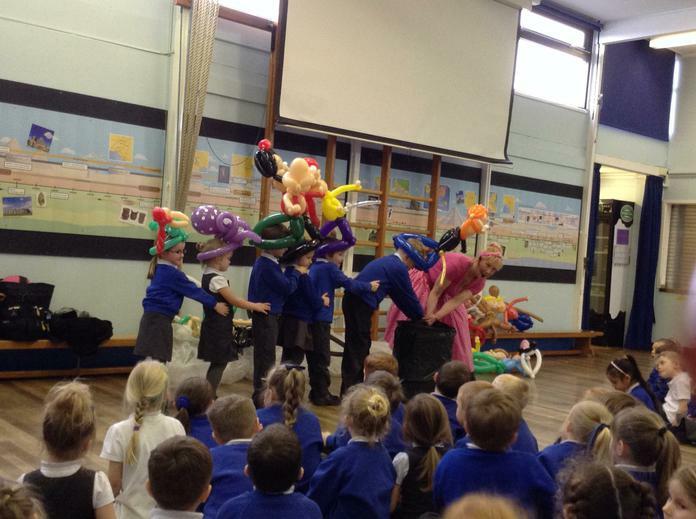 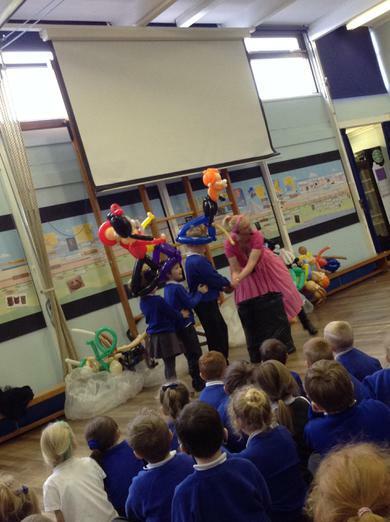 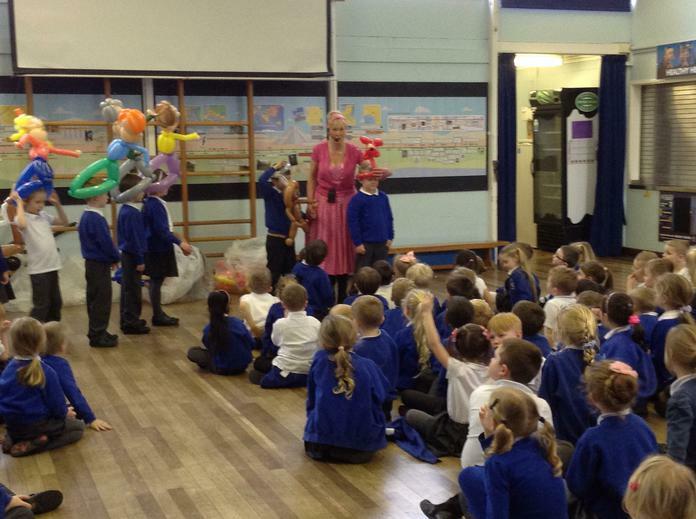 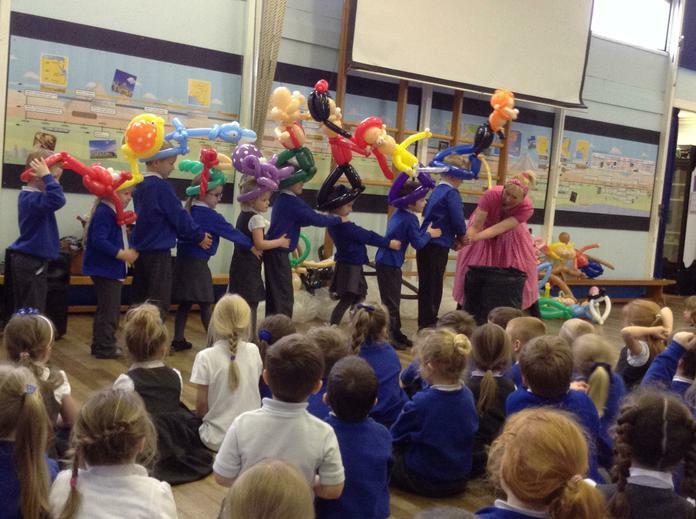 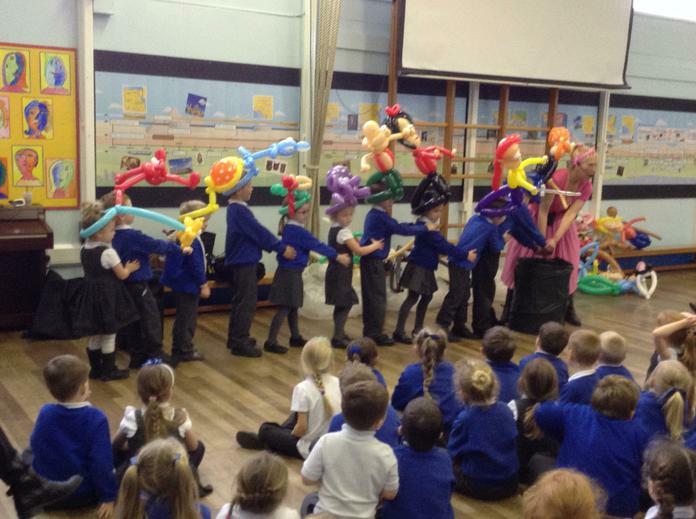 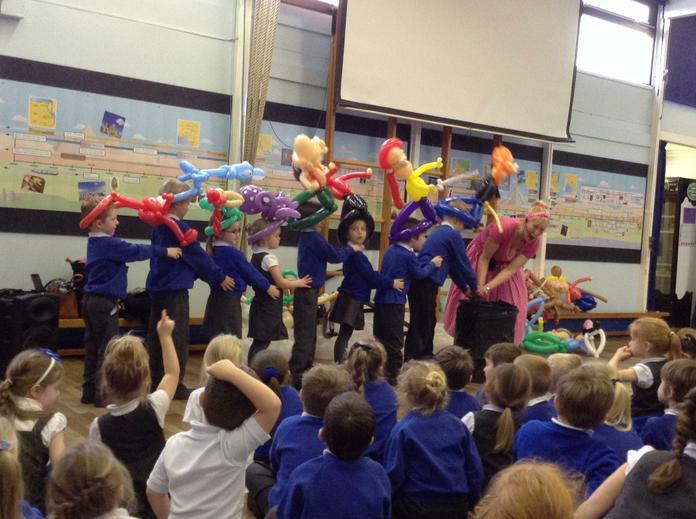 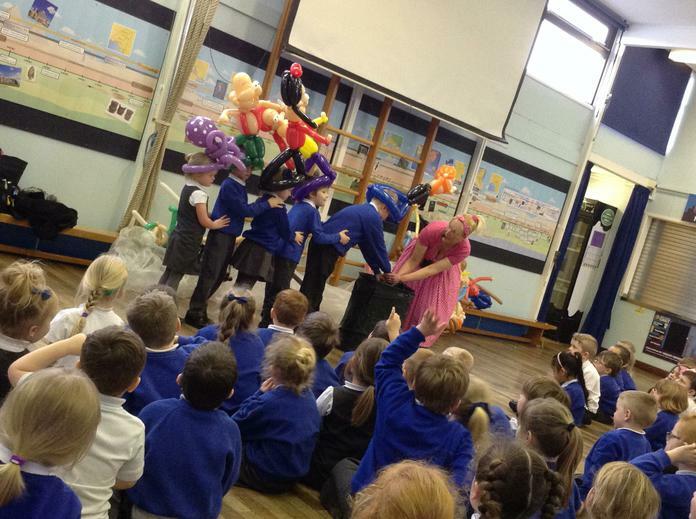 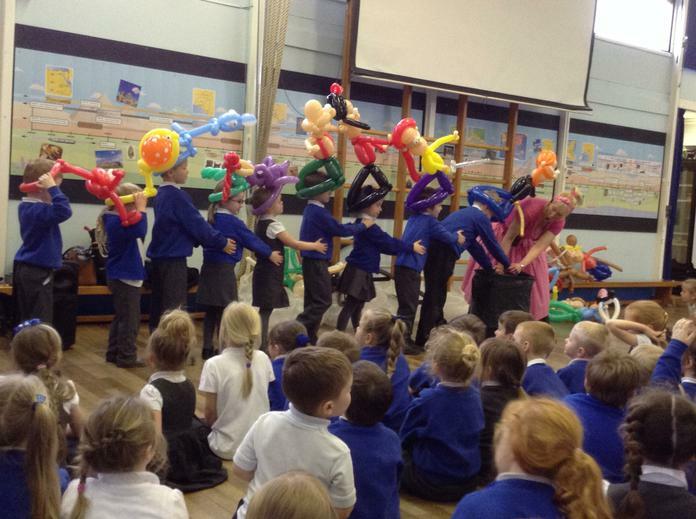 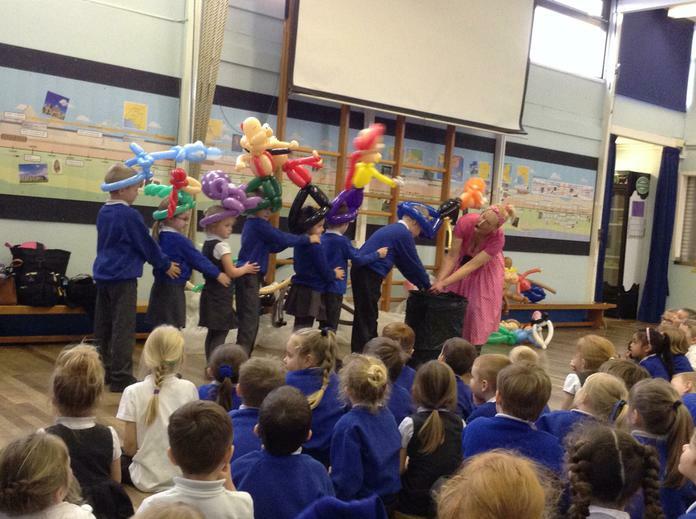 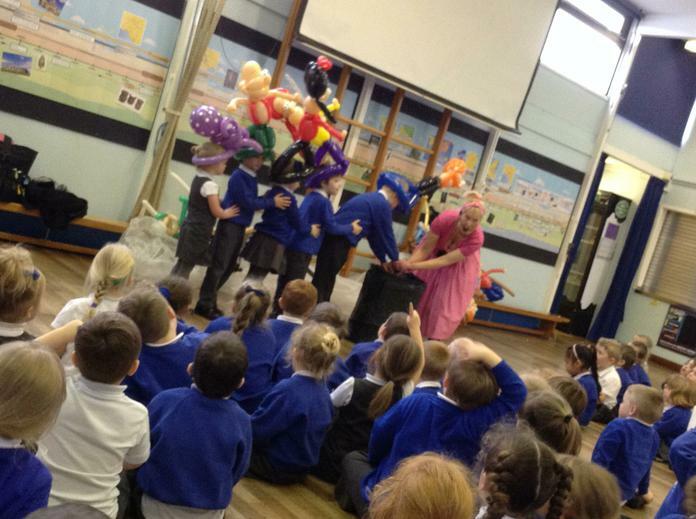 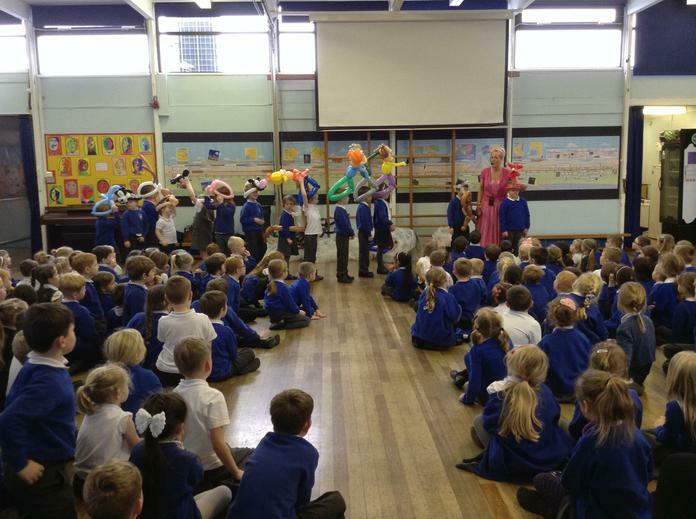 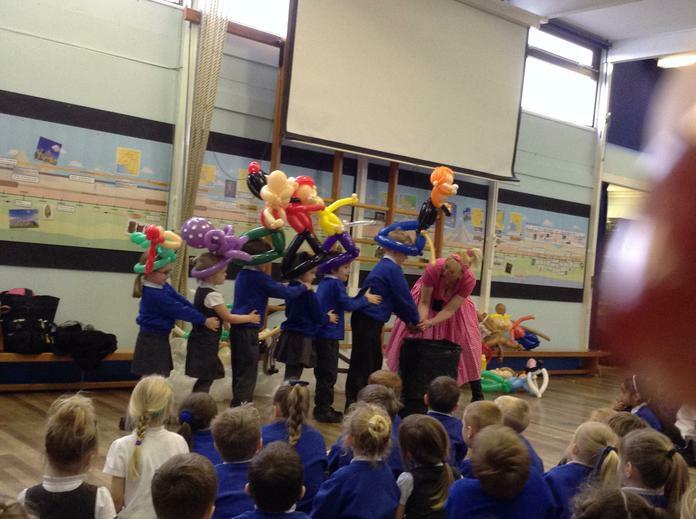 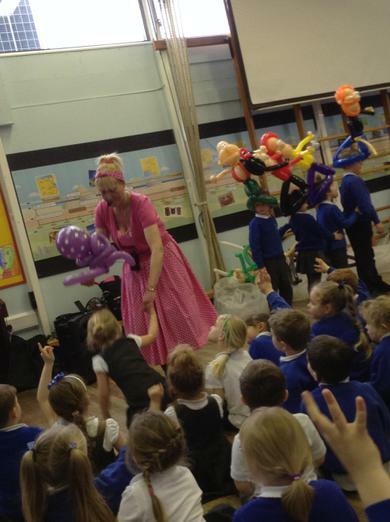 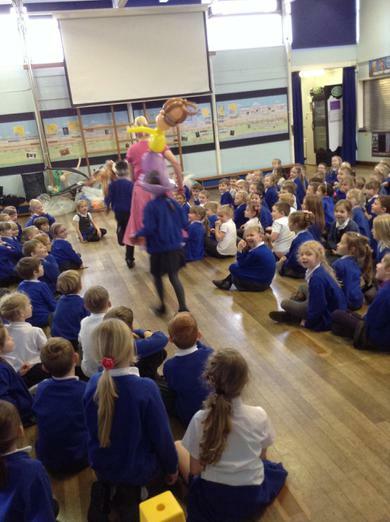 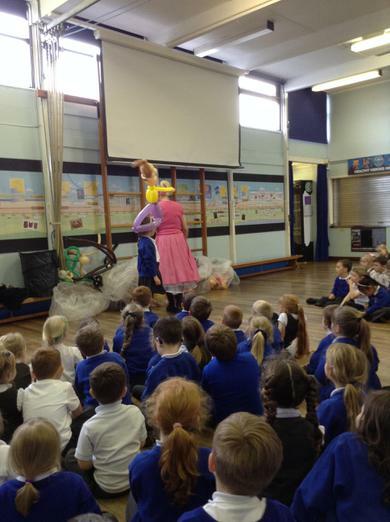 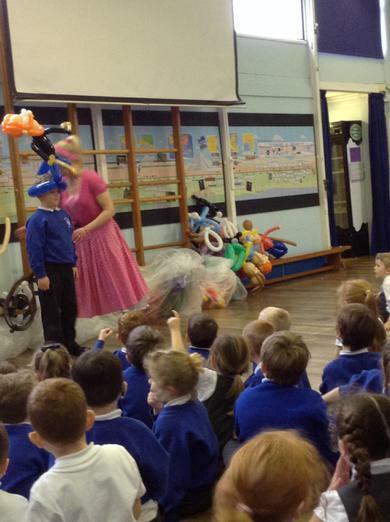 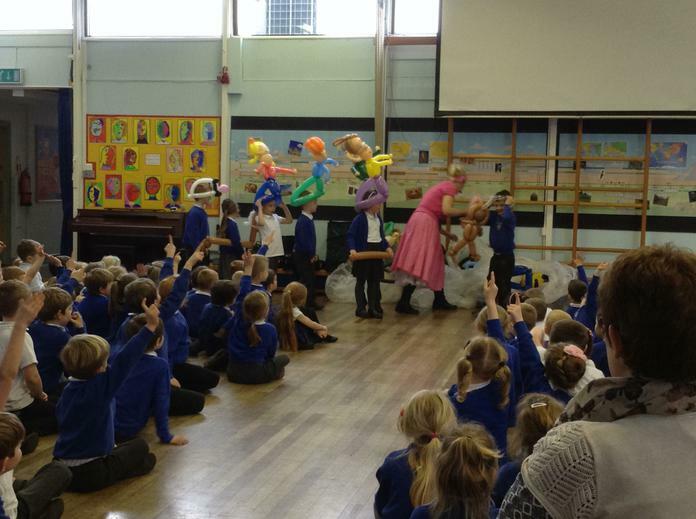 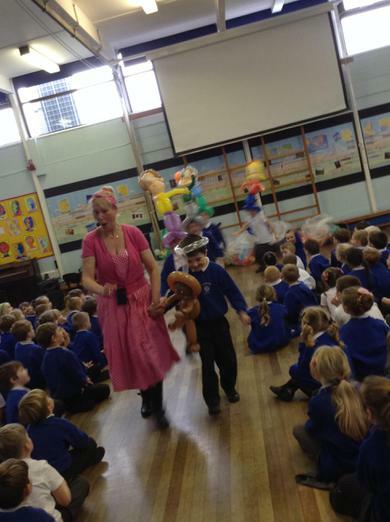 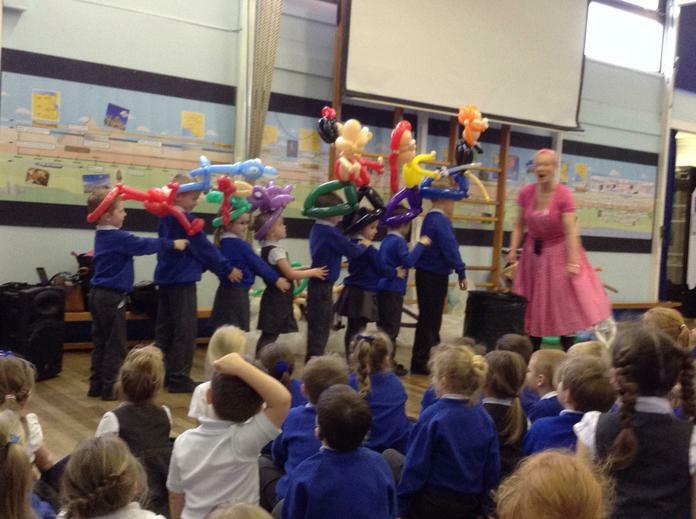 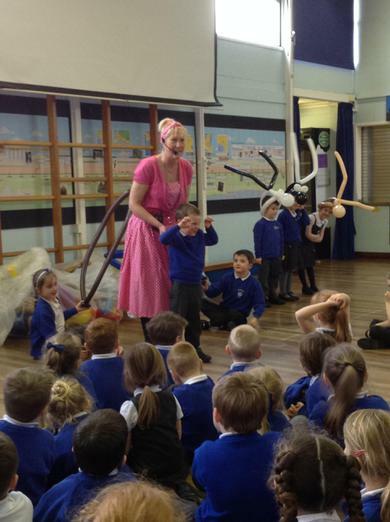 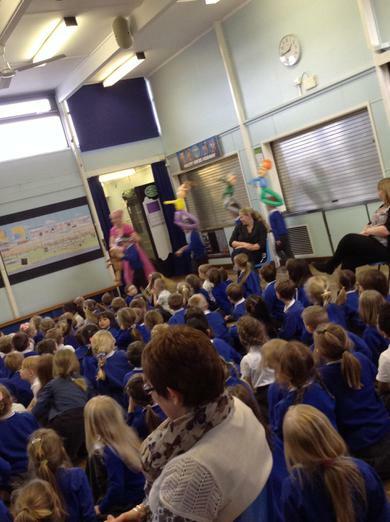 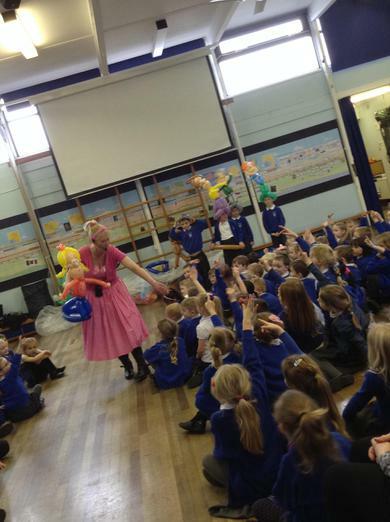 It is World Book Day on Thursday 3rd March and to celebrate Betty Balloon came to visit reception, year one and year two. 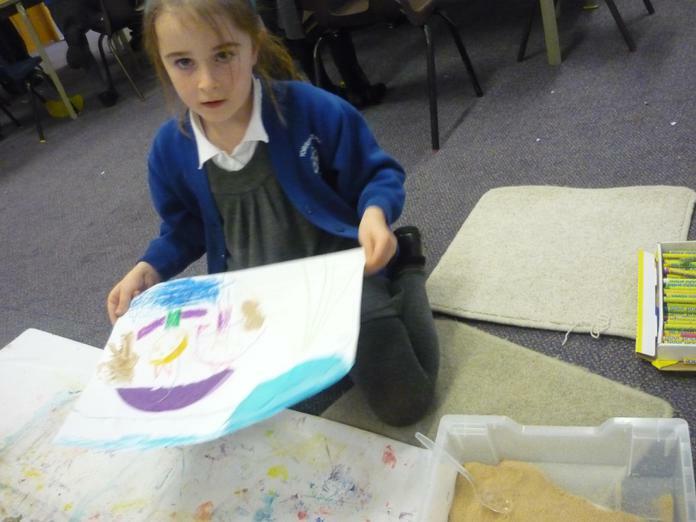 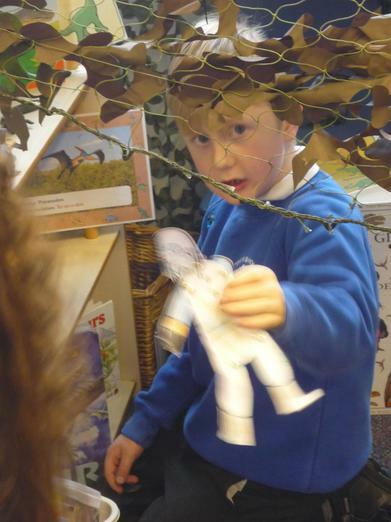 She shared three stories with us: three billy goats gruff, the gingerbread man and Pirate Pete. 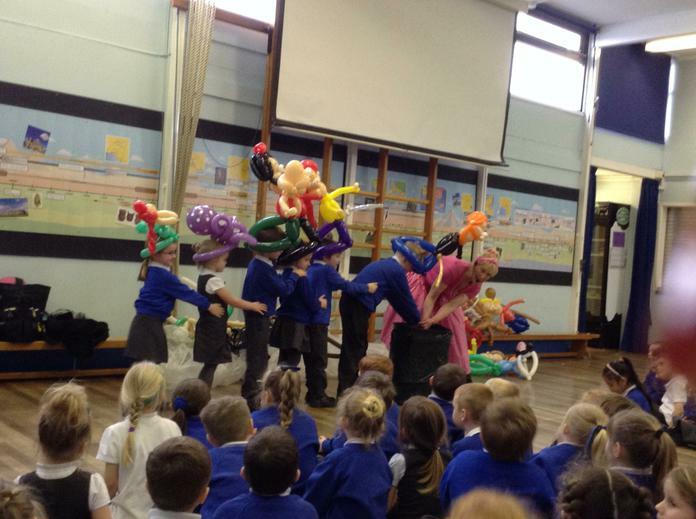 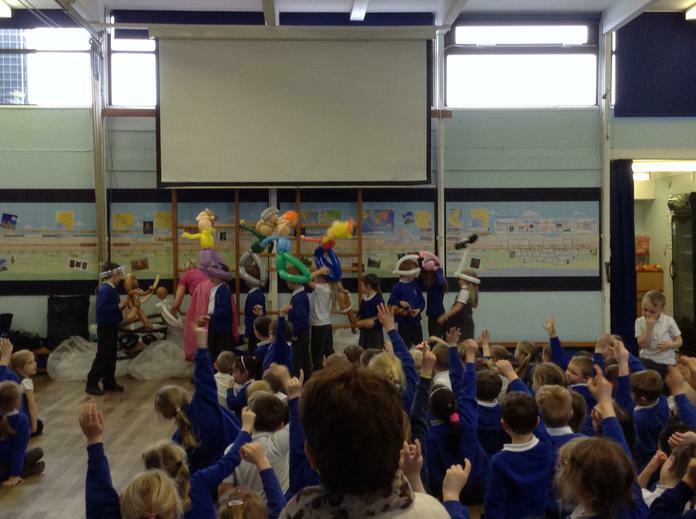 Children from different year groups got to come and join in the stories and got to wear some amazing balloons to transform them into the characters. 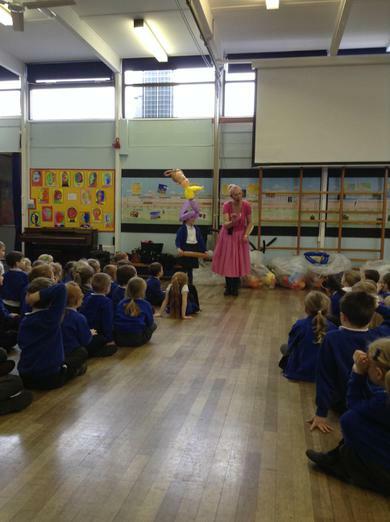 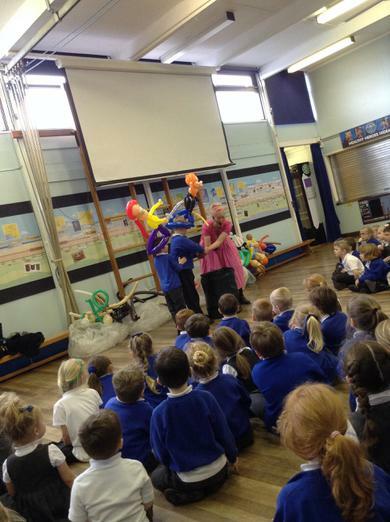 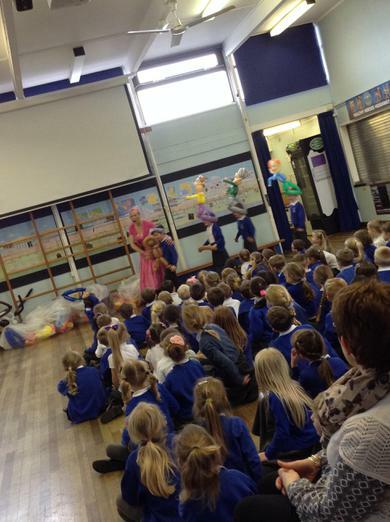 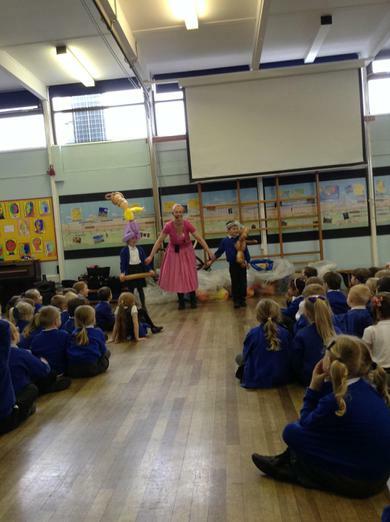 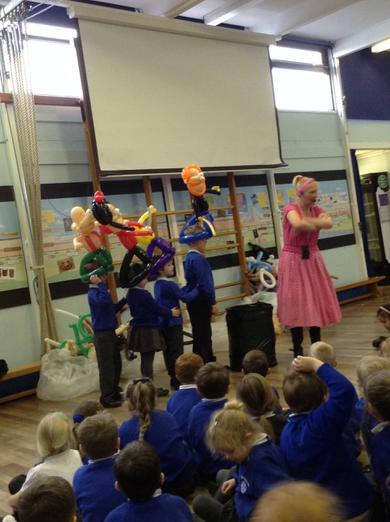 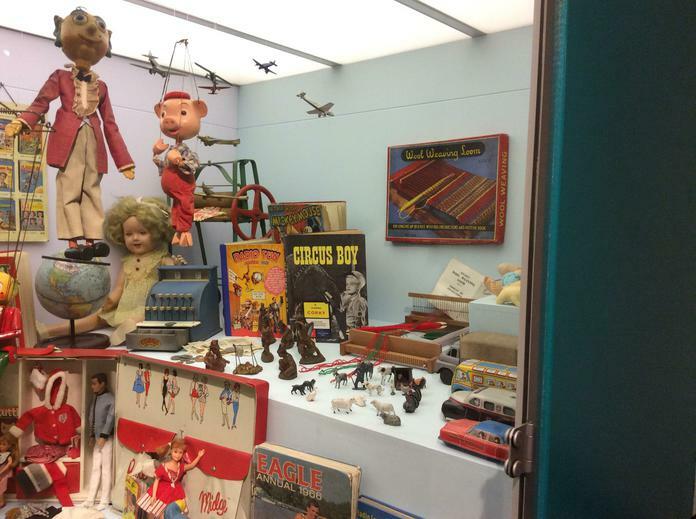 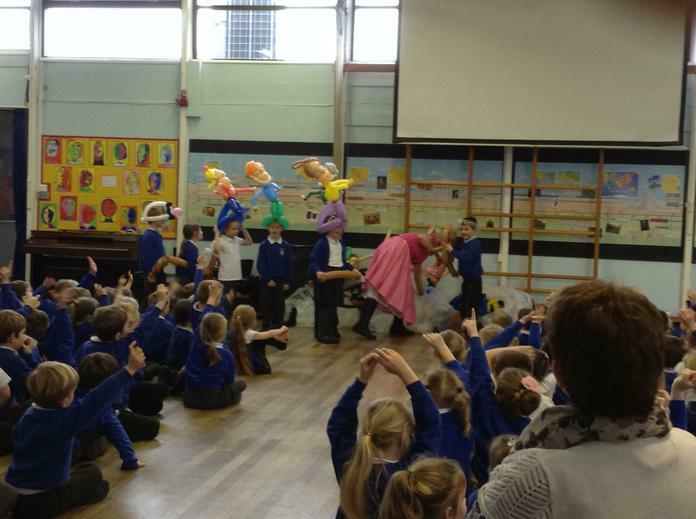 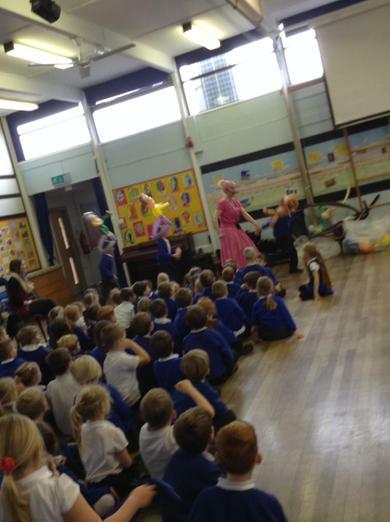 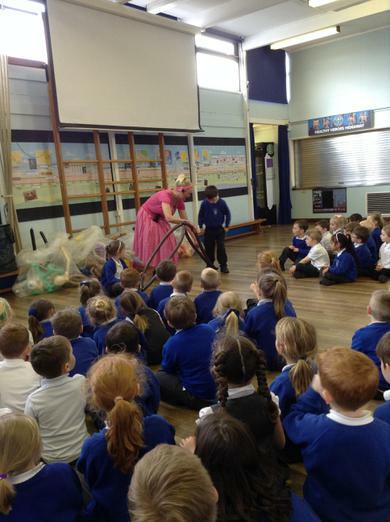 It was a fantastic visit and we are really thankful for Betty Balloon's visit. 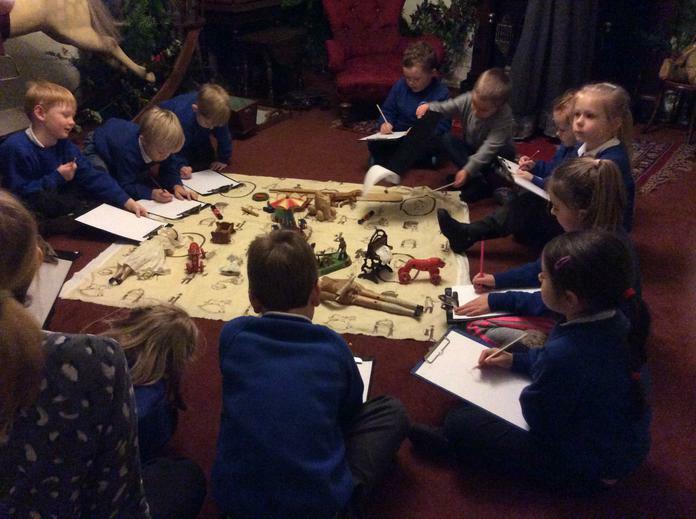 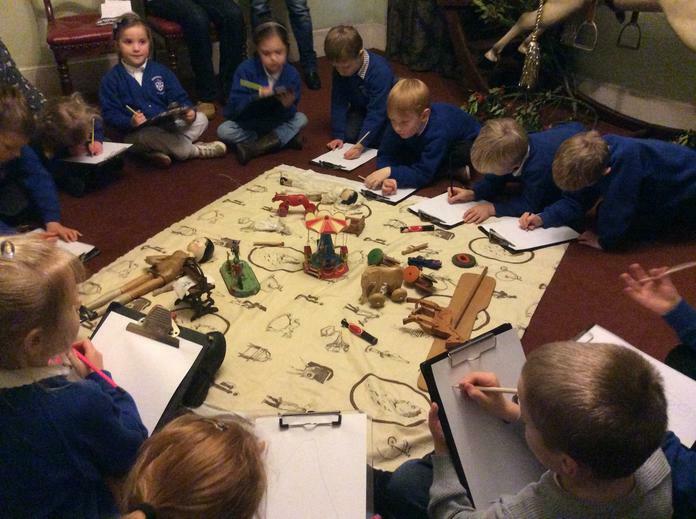 We are going to use the visit to create lots of wonderful writing. 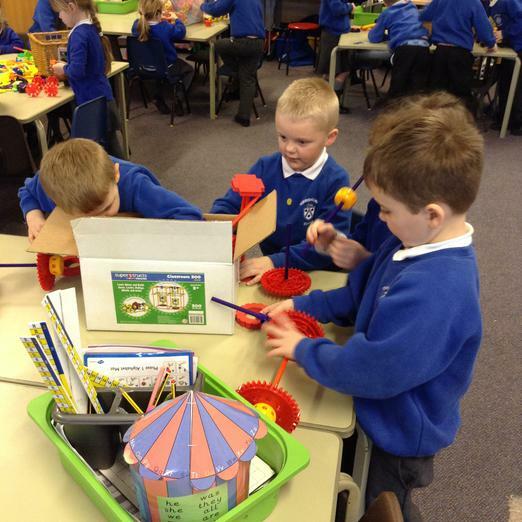 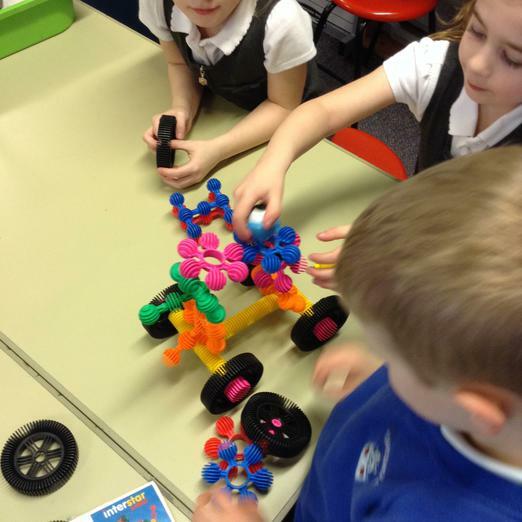 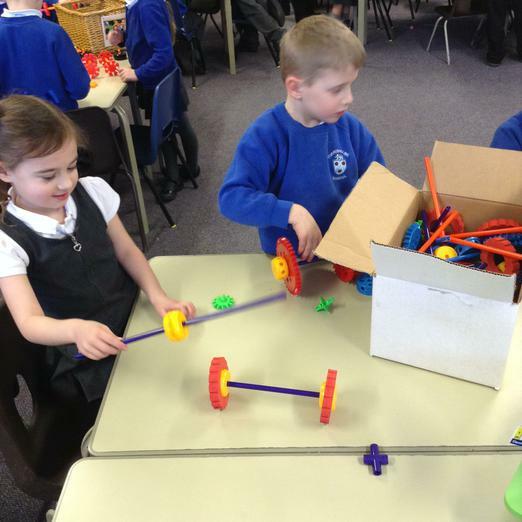 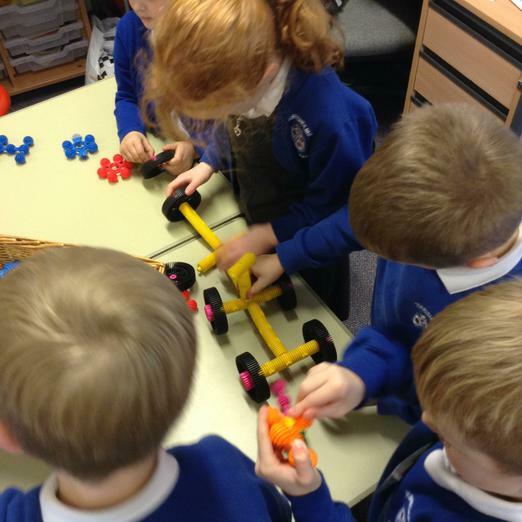 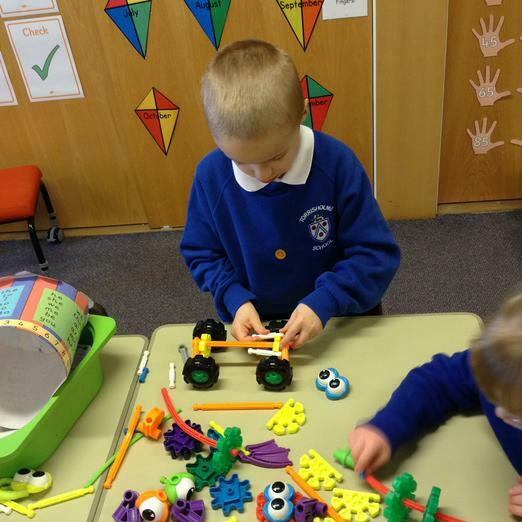 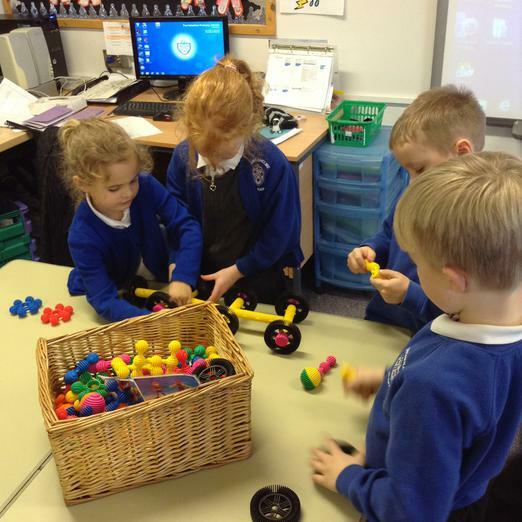 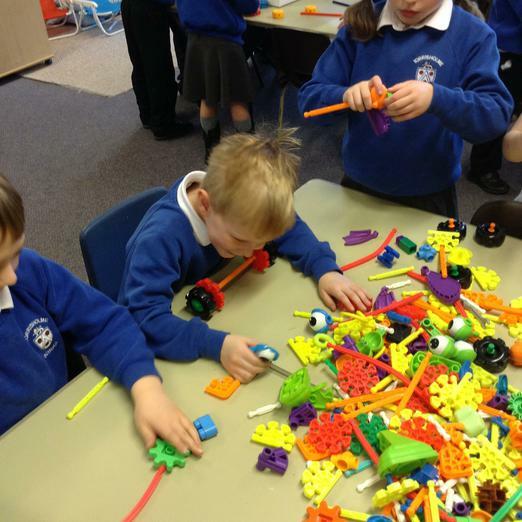 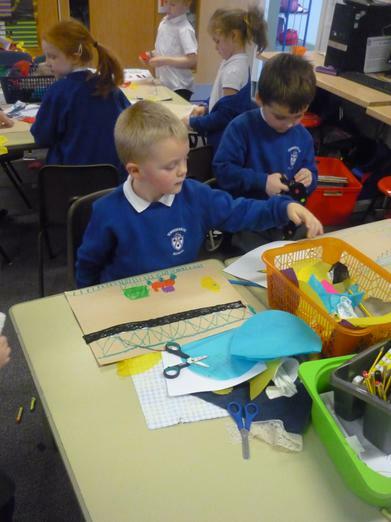 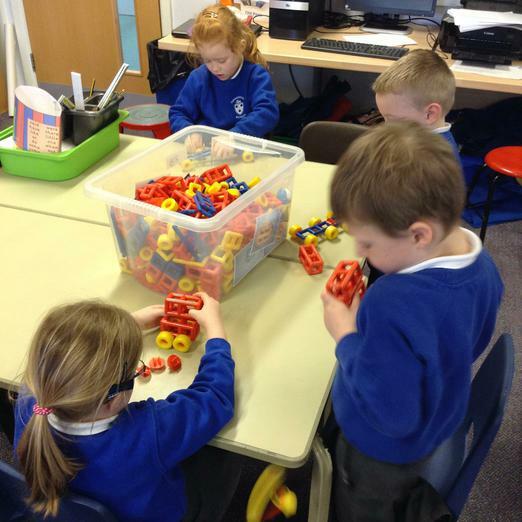 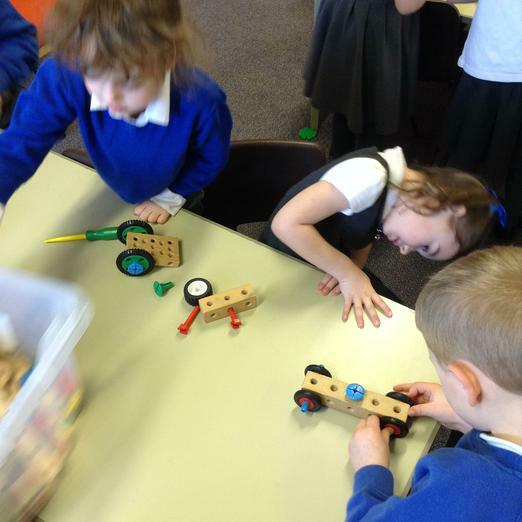 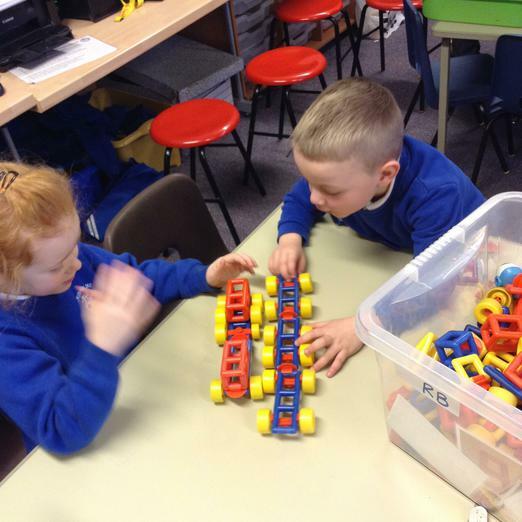 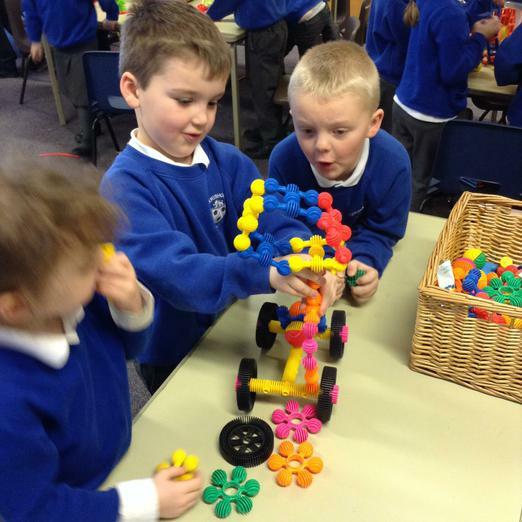 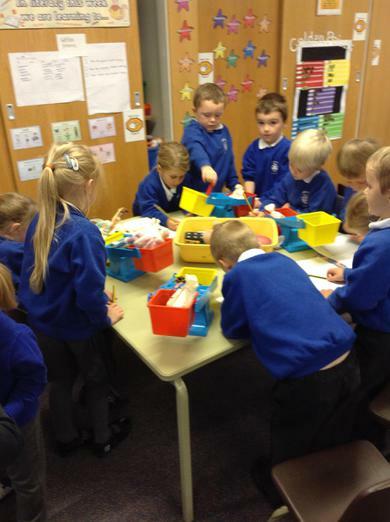 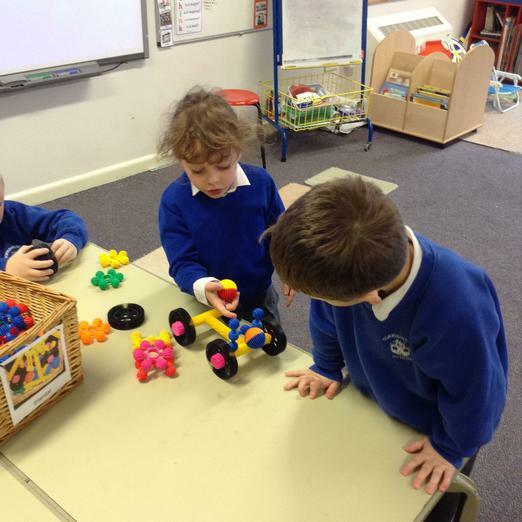 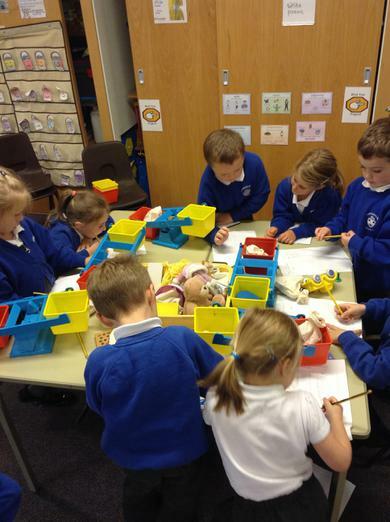 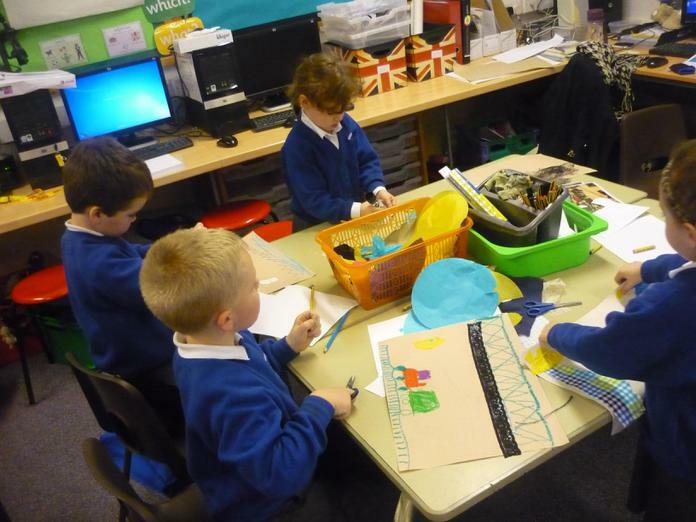 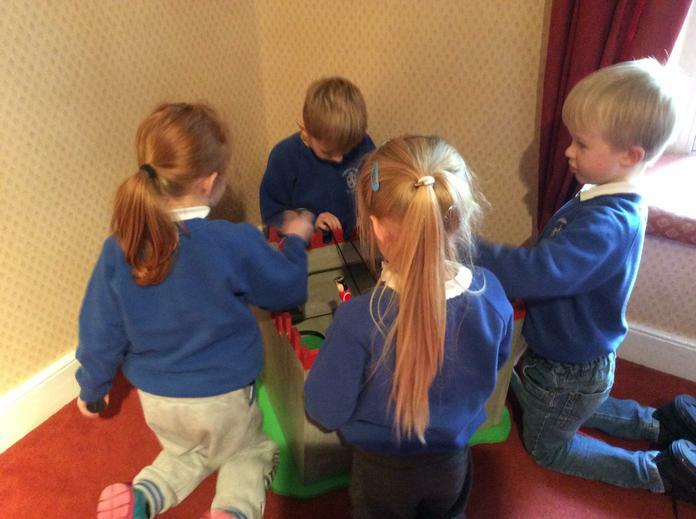 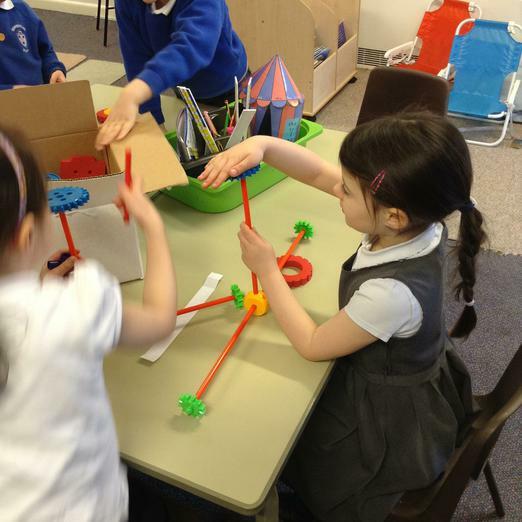 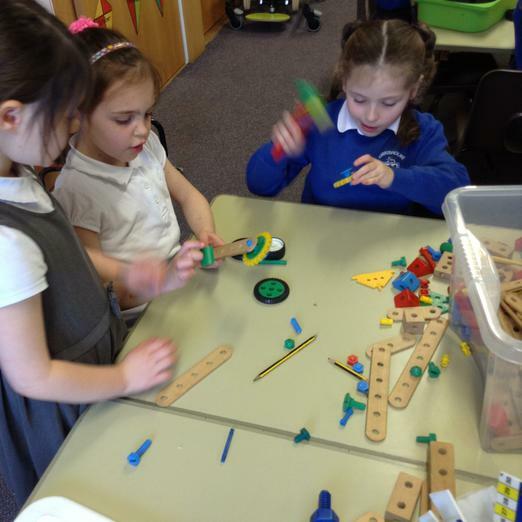 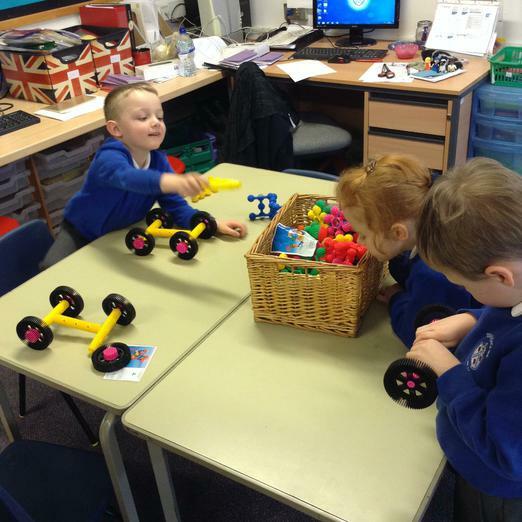 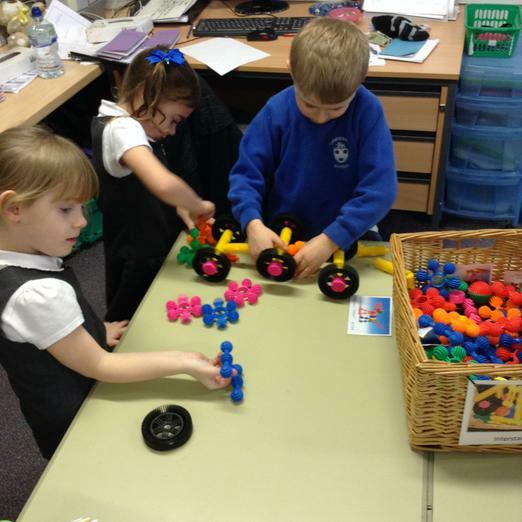 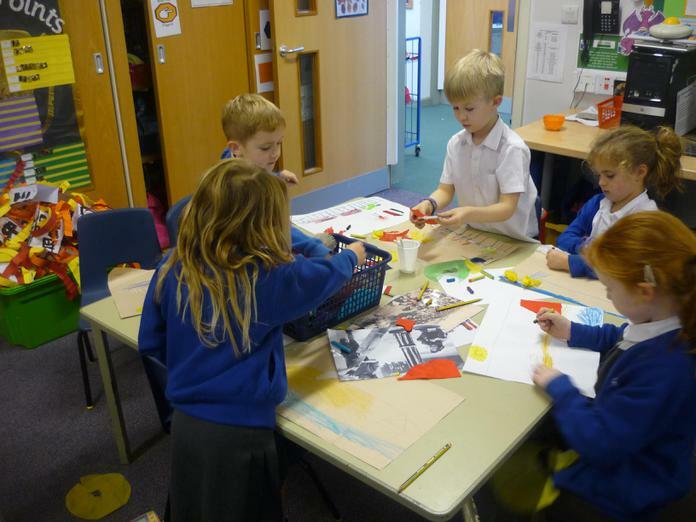 We are beginning to investigate how vehicles move and have been using different equipment to make our own vehicles. 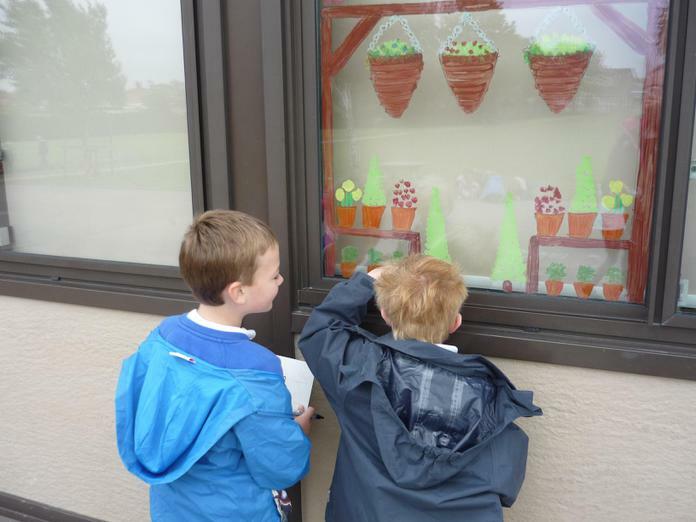 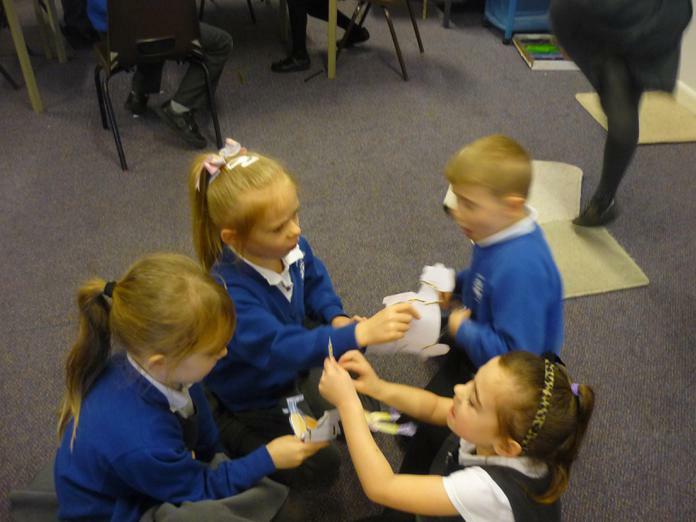 We retold and sequenced the story of the enormous turnip. 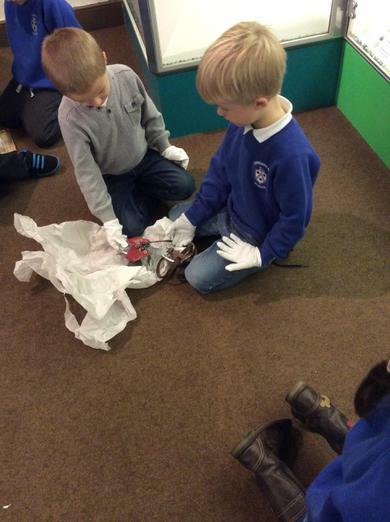 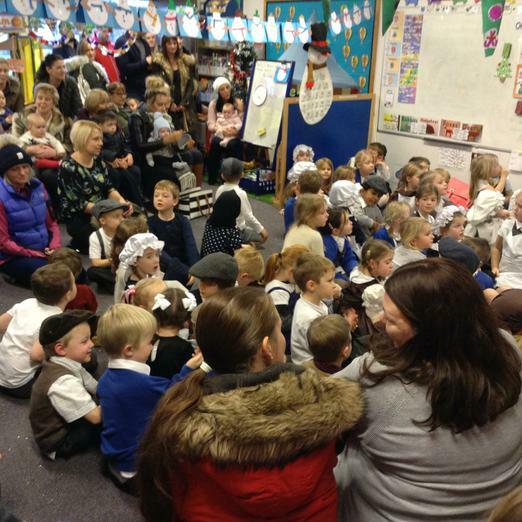 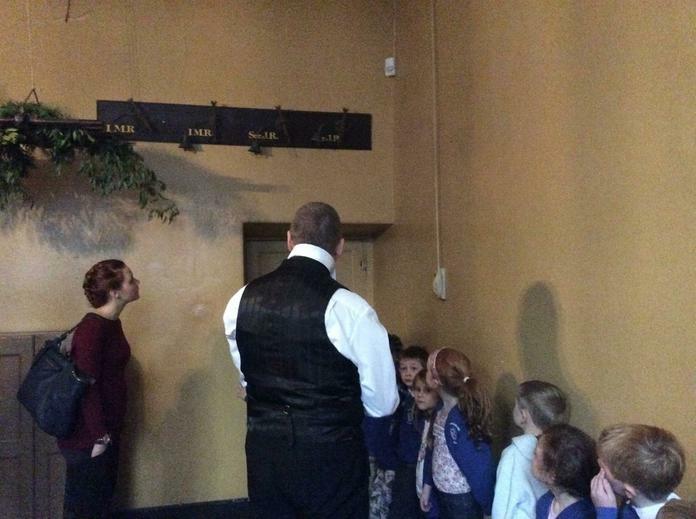 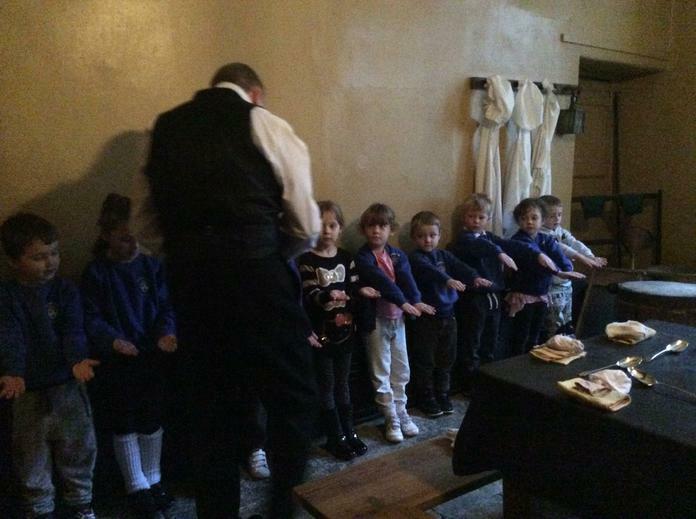 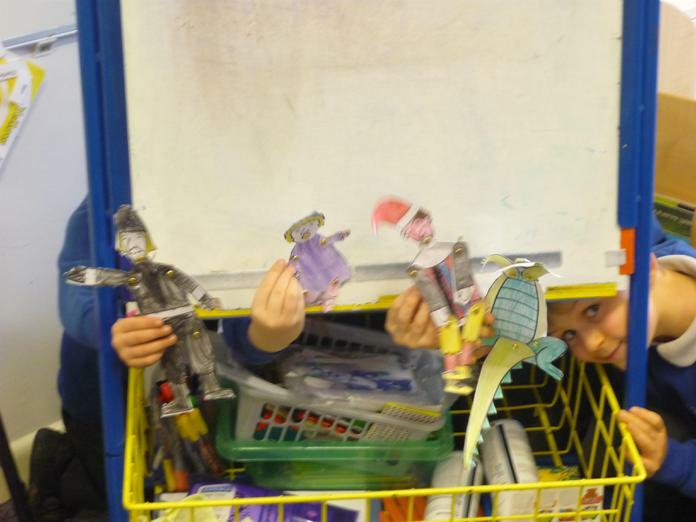 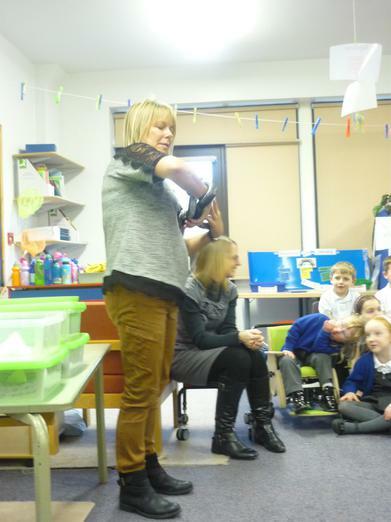 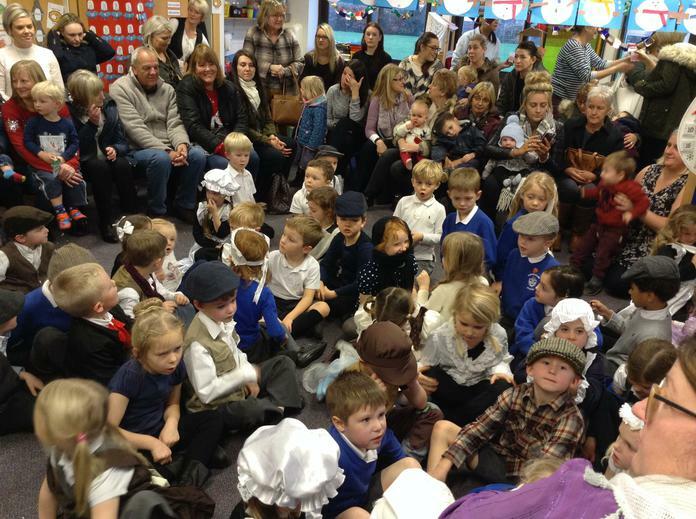 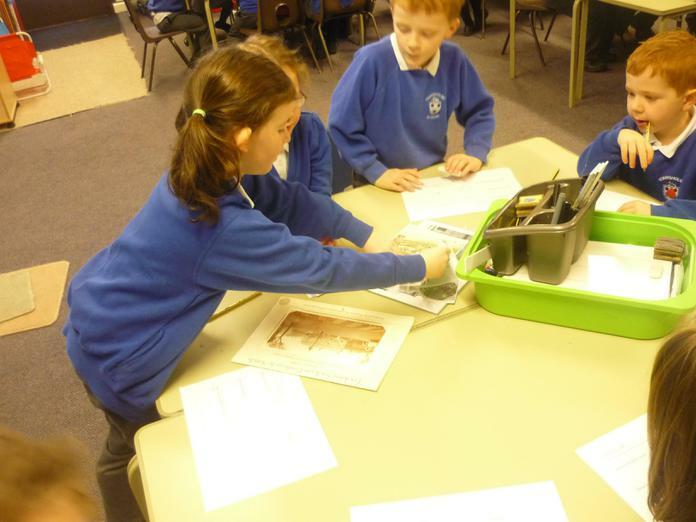 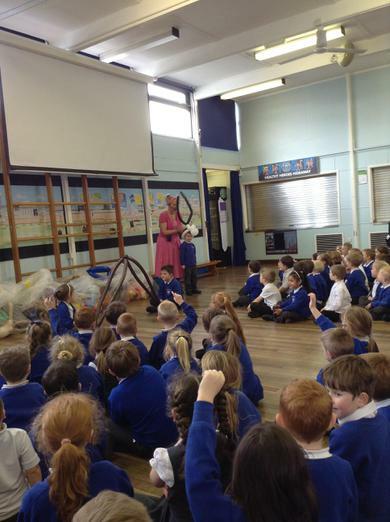 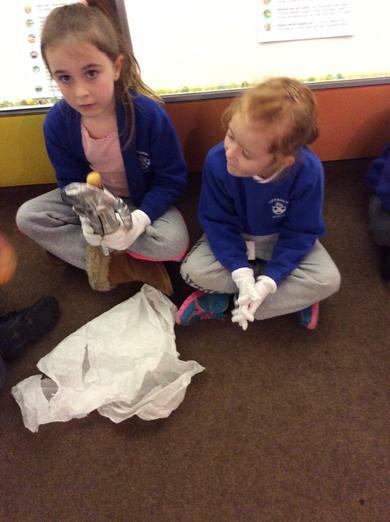 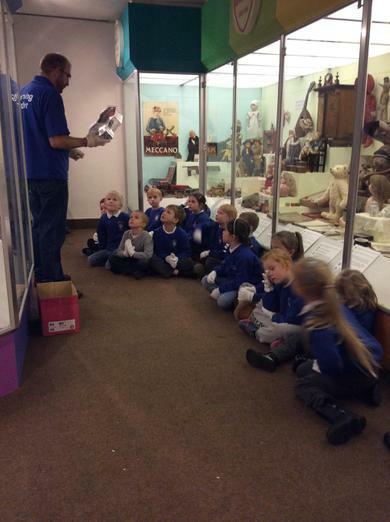 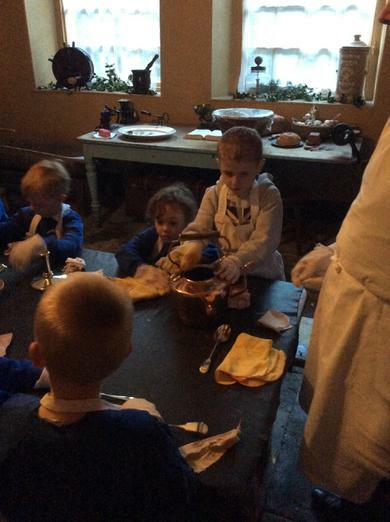 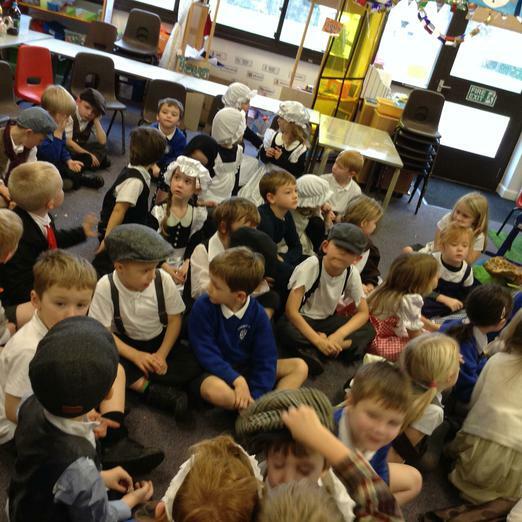 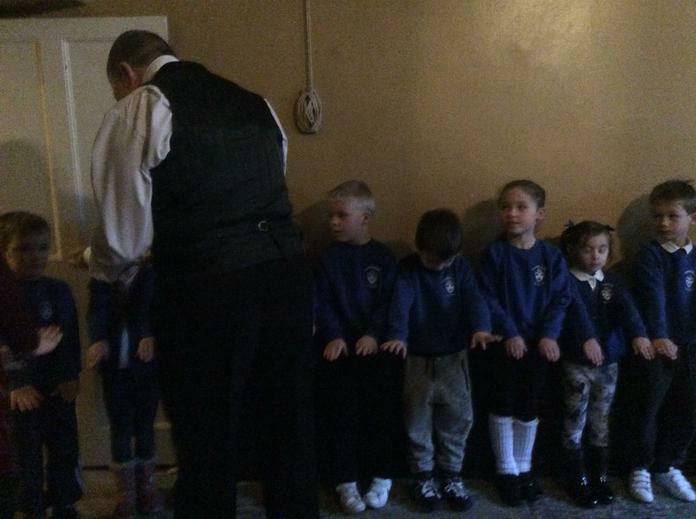 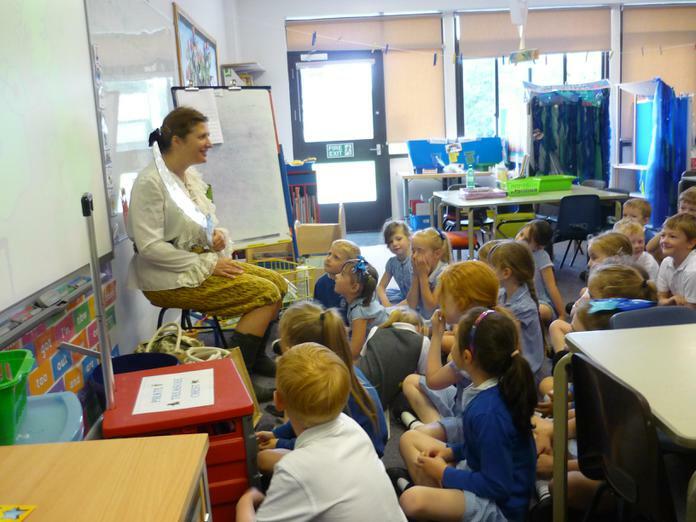 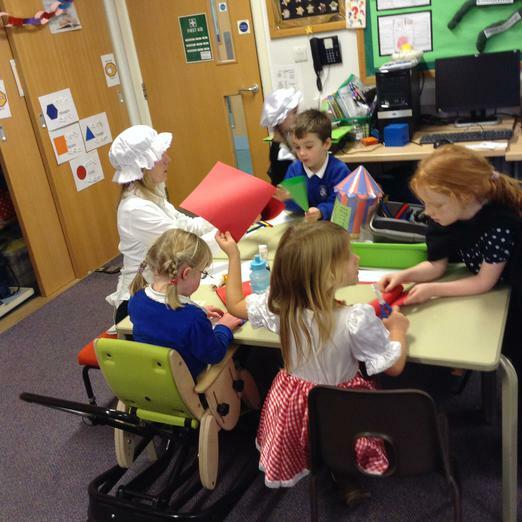 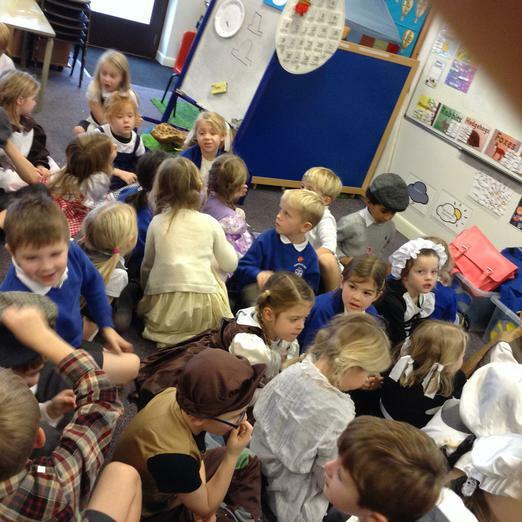 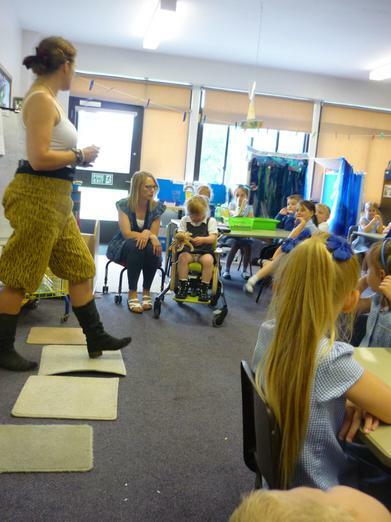 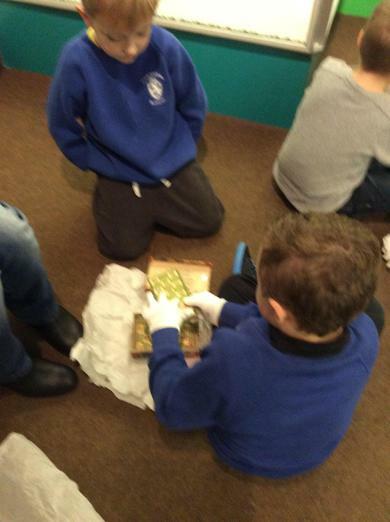 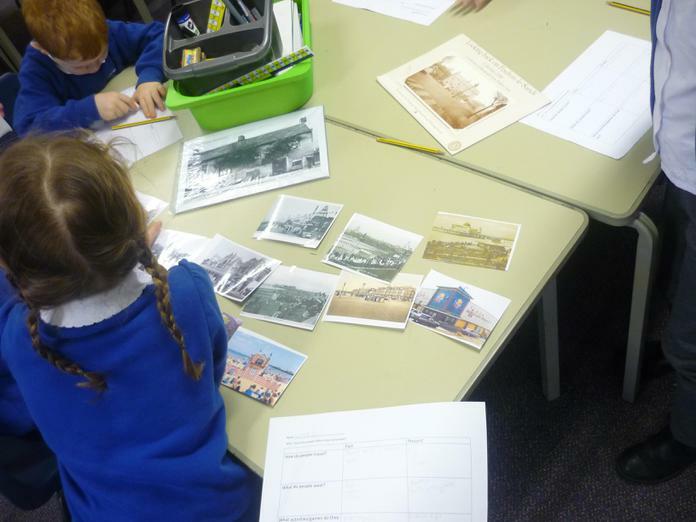 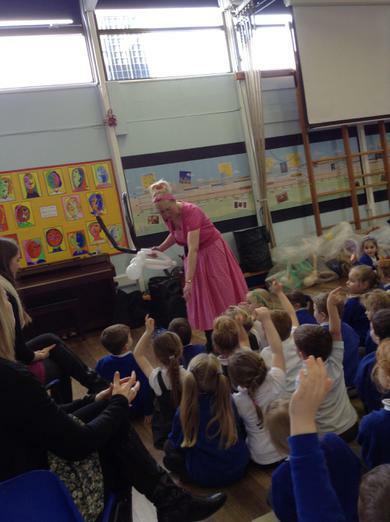 During history week year 1 and year 2 have been time travelling back to Morecambe during the Victorian era. 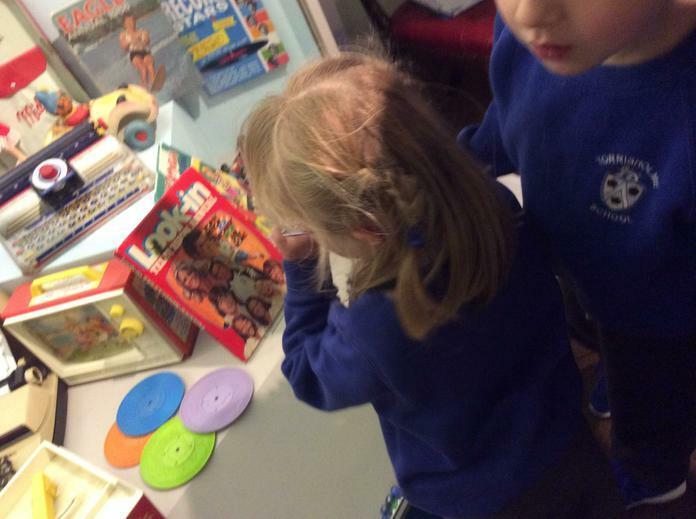 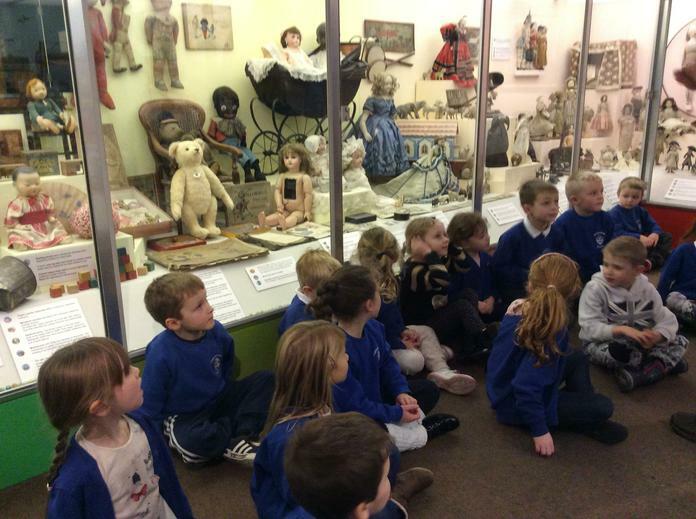 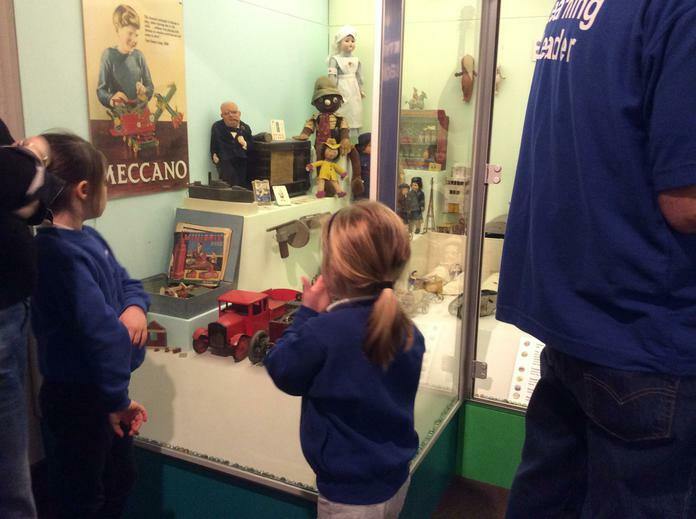 We have learnt facts about Morecambe's history, looked at how people dressed and travelled and the history of Punch and Judy. 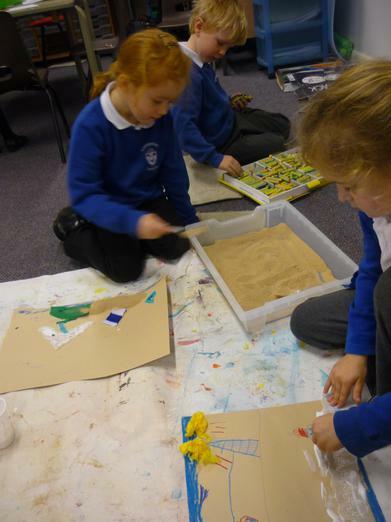 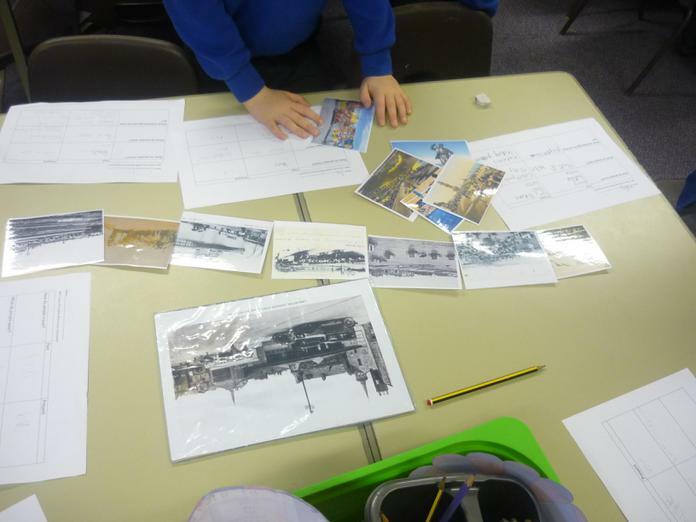 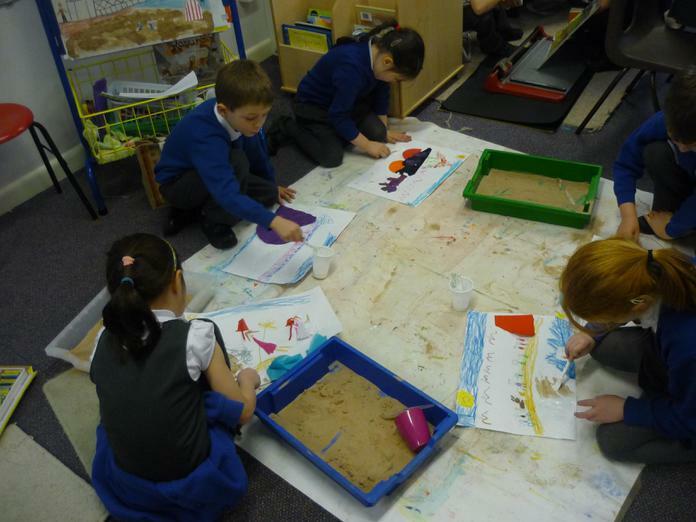 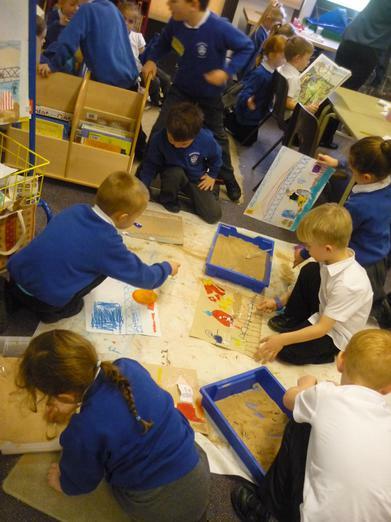 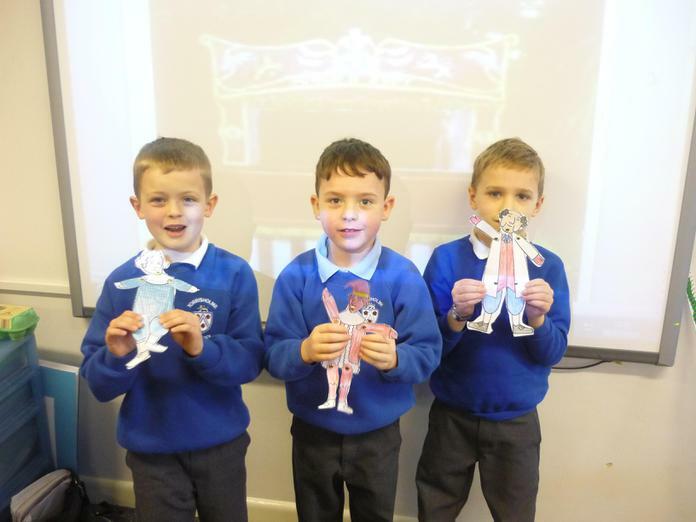 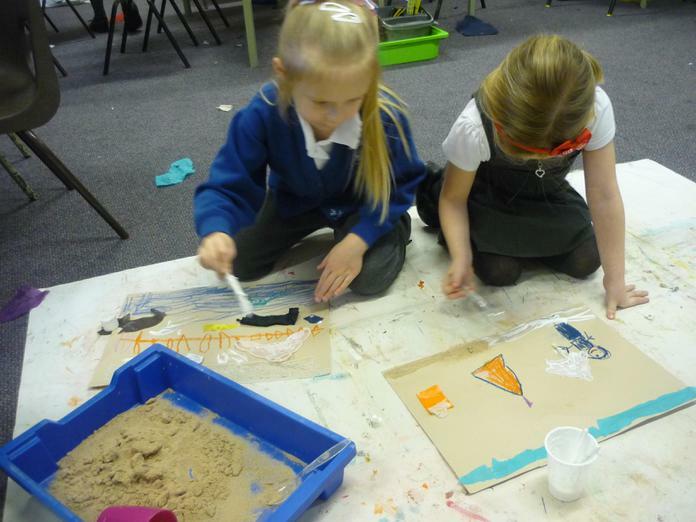 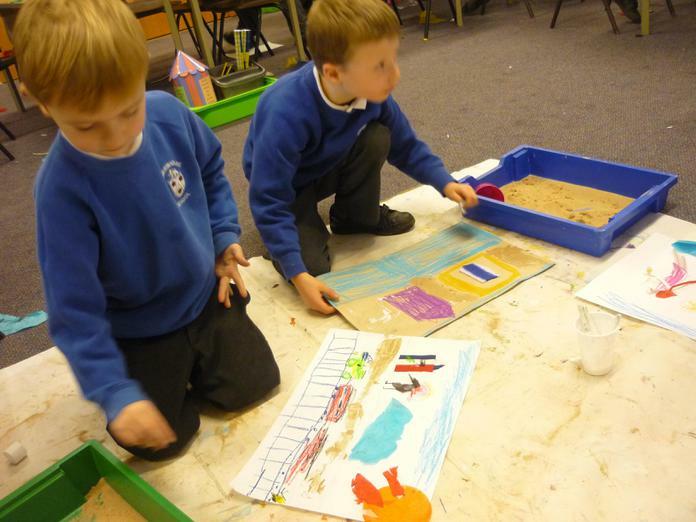 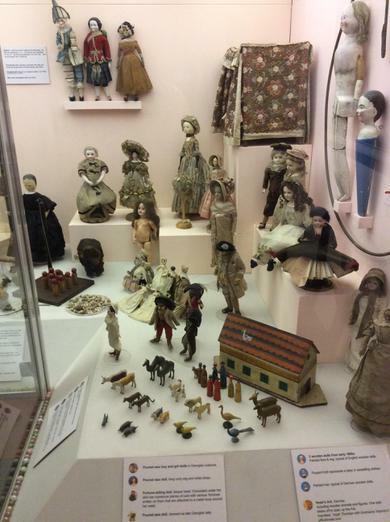 We have used this information to create Punch and Judy split pin puppets to create our own shows and made sand pictures of Morecambe 100 years ago. 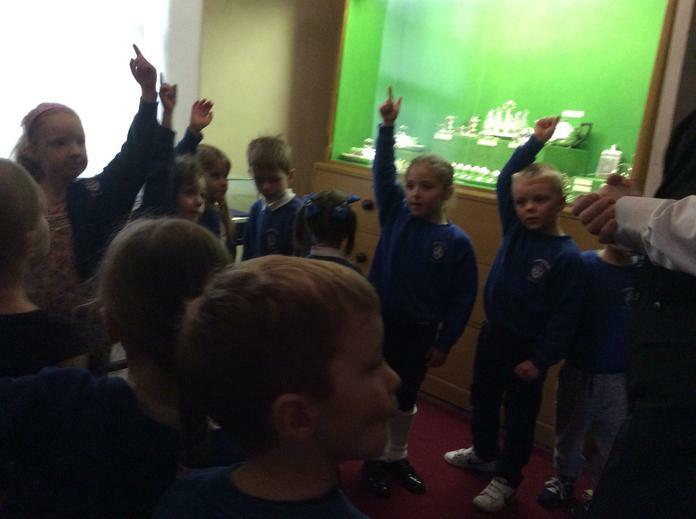 Year 1 went to see Shrek at the Lowry on Wednesday. 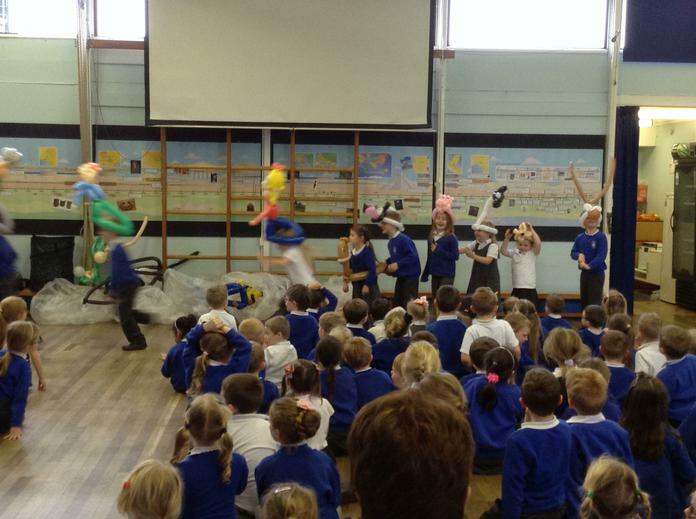 We thought it was amazing, fantastic and shrek-tacular! 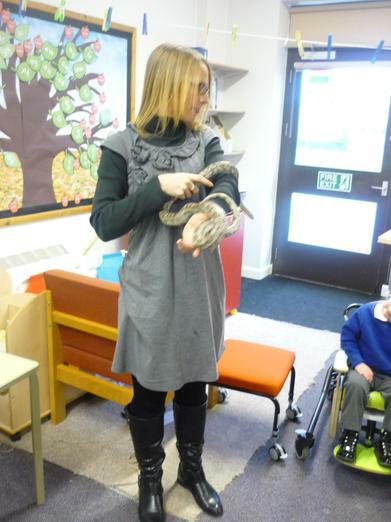 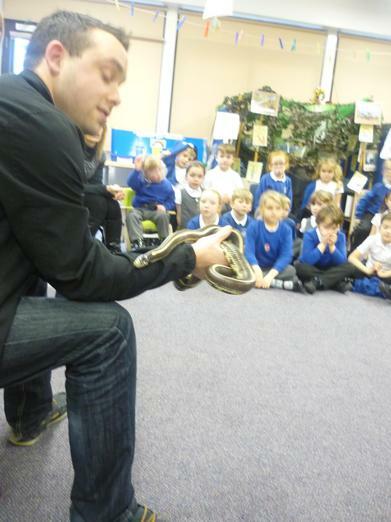 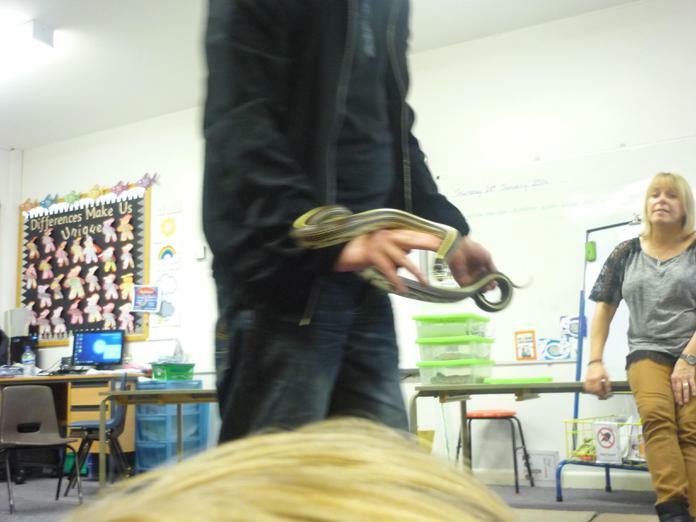 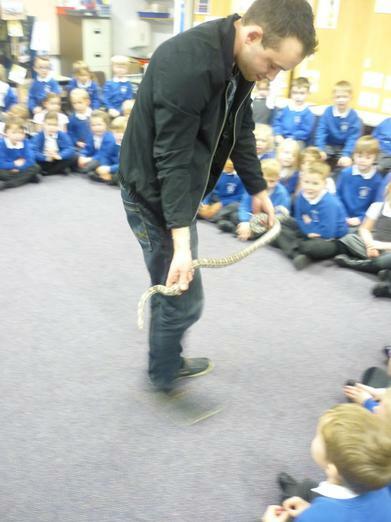 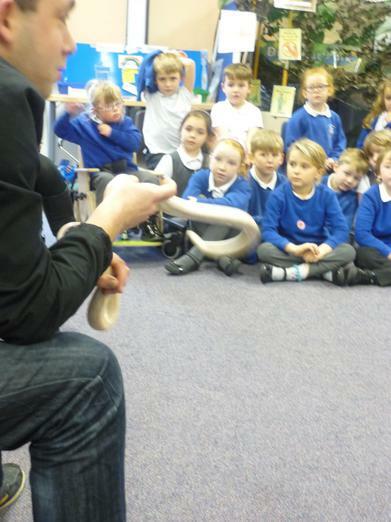 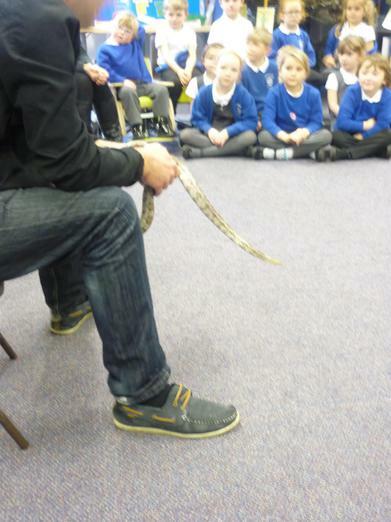 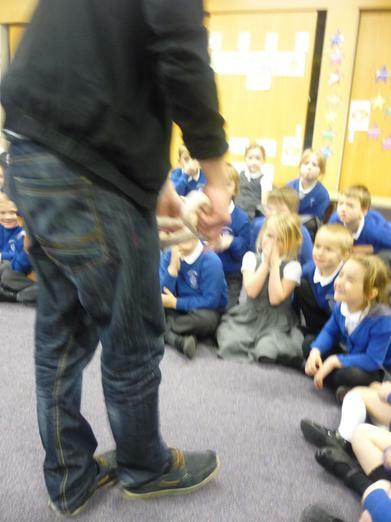 We had some special visitors today with four snakes and a lizard coming to see us! 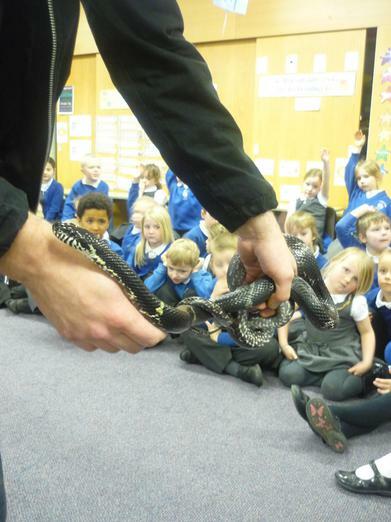 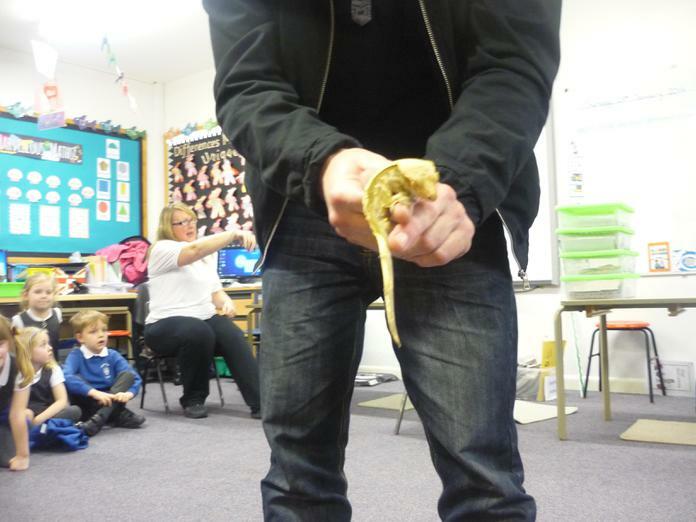 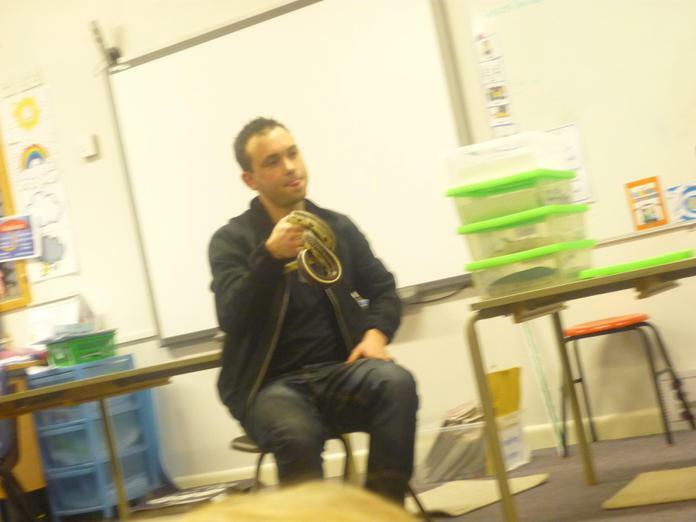 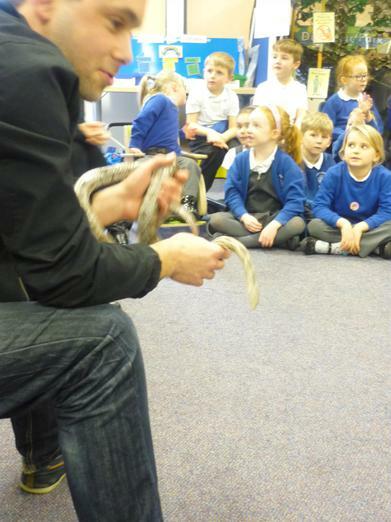 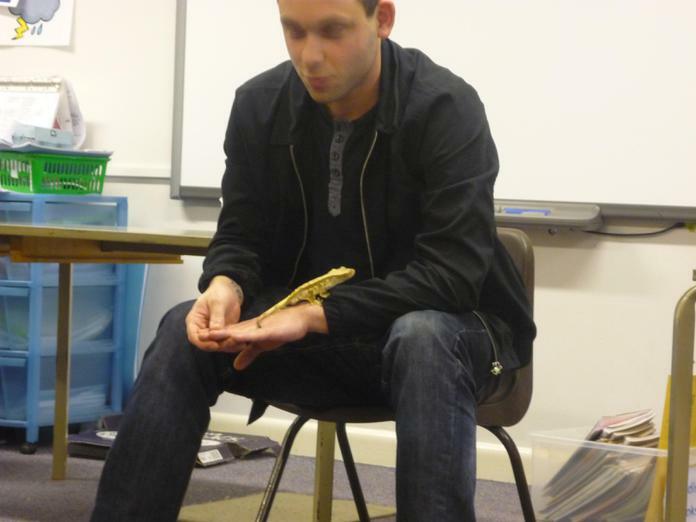 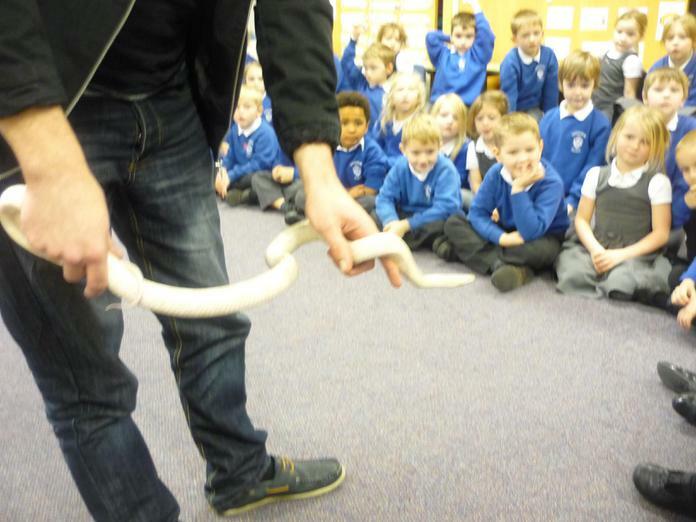 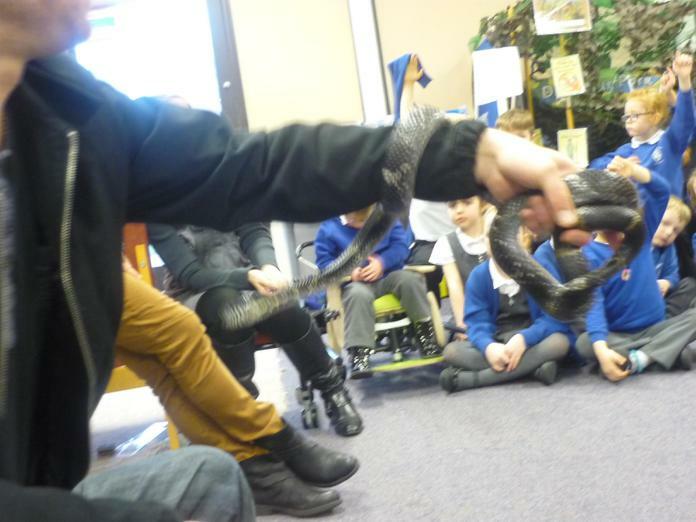 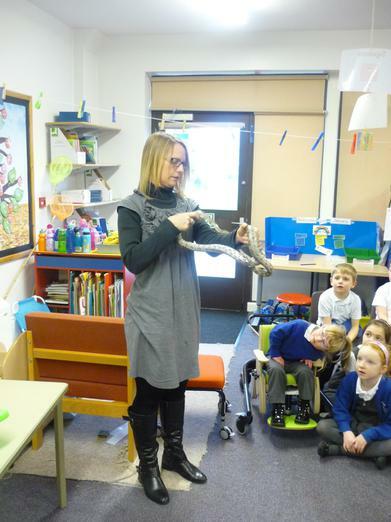 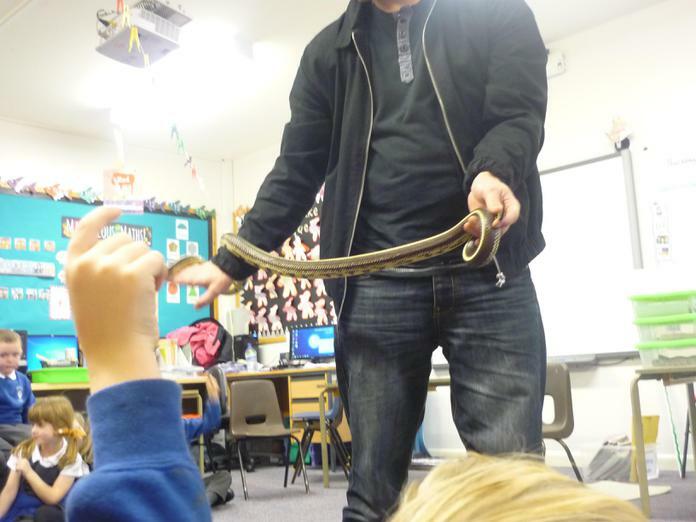 We found out lots of facts about snakes and lizards including how and what they eat, how they breathe, how they sense and many more. 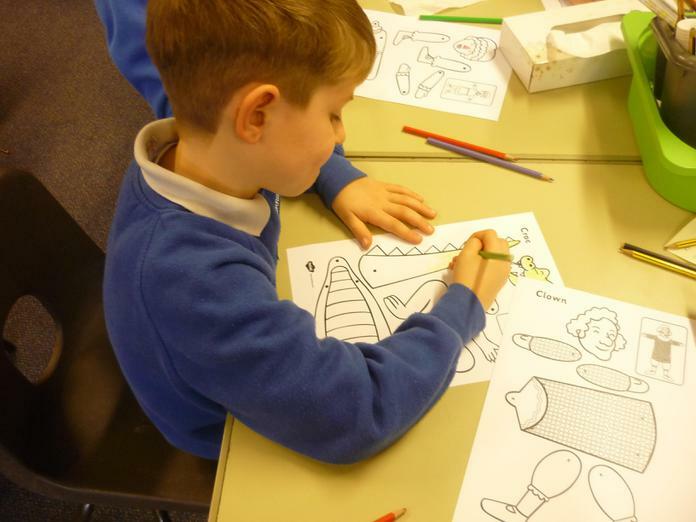 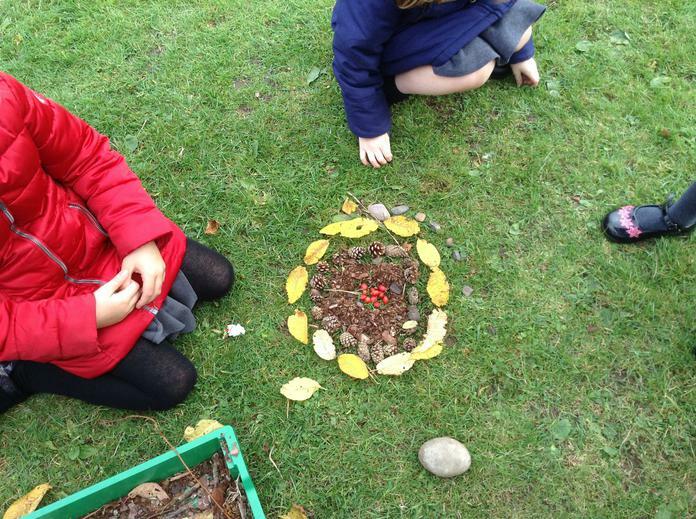 Snakes and lizards lay eggs on land like dinosaurs which has helped us to understand why we think dinosaurs would be reptiles. 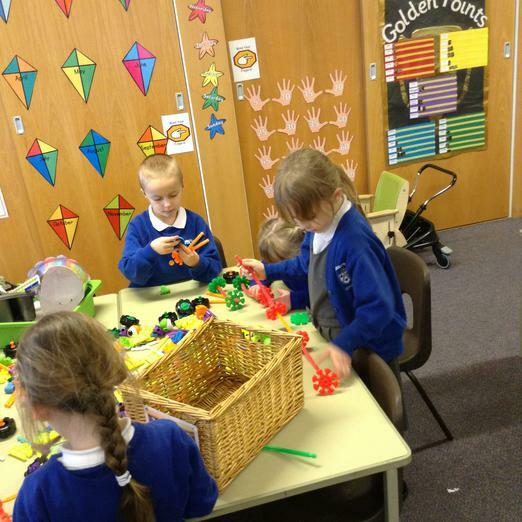 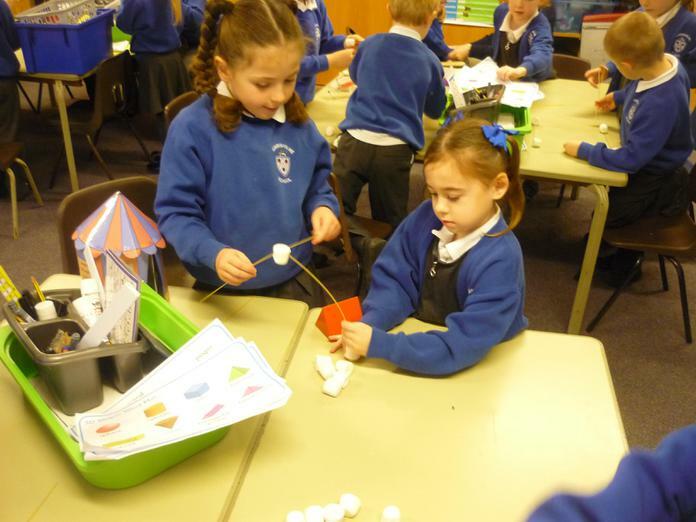 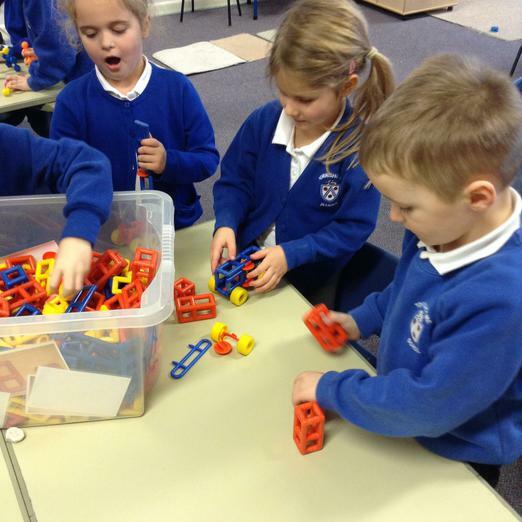 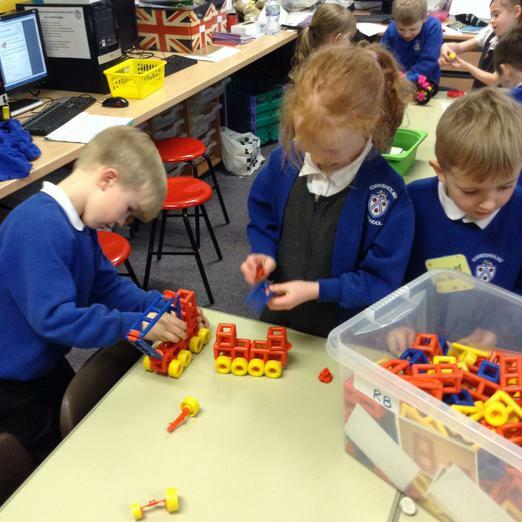 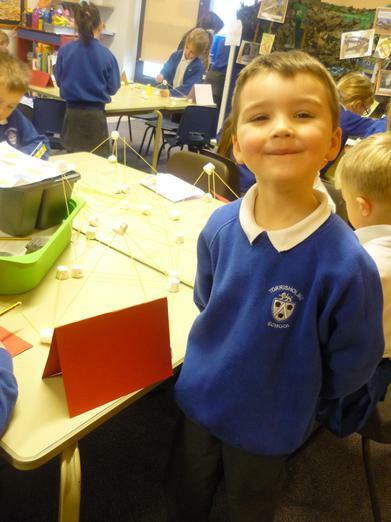 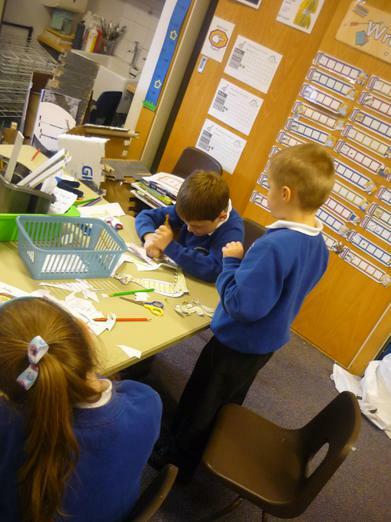 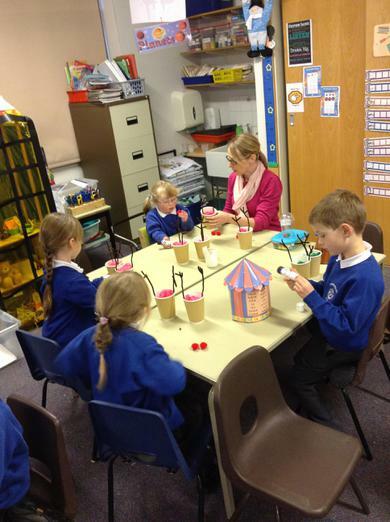 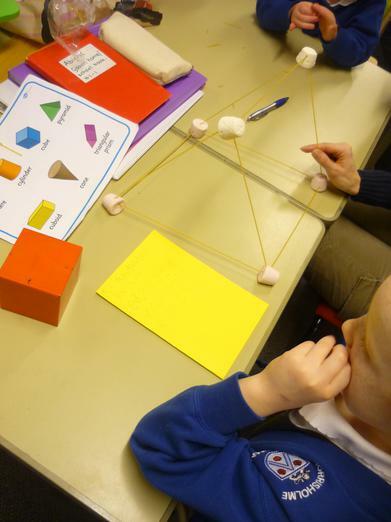 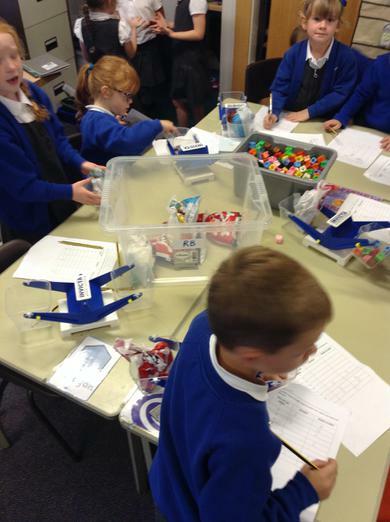 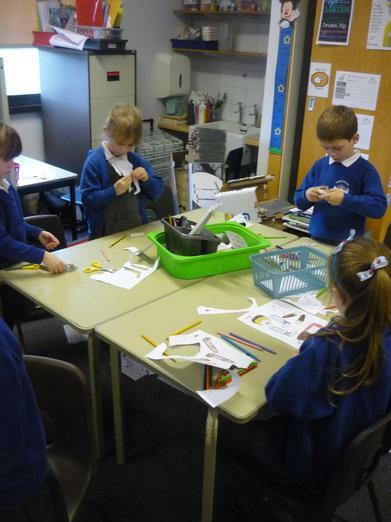 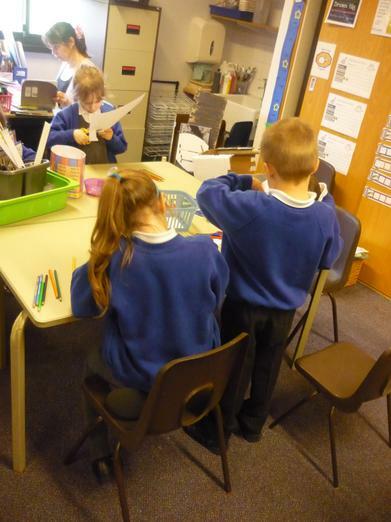 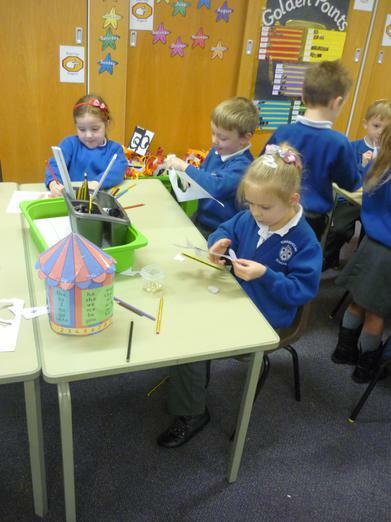 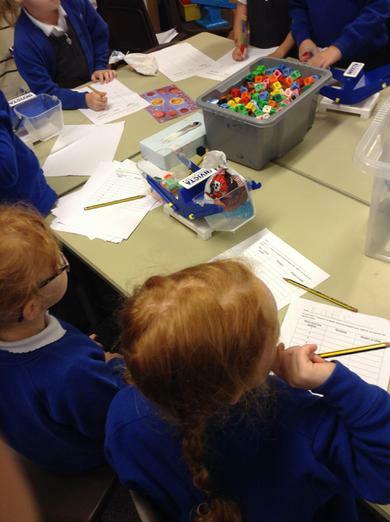 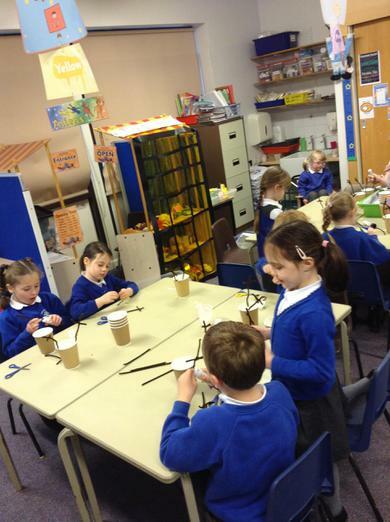 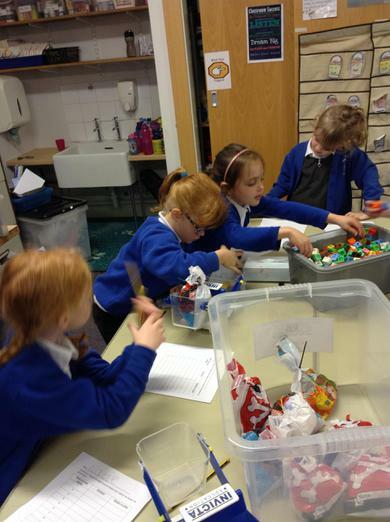 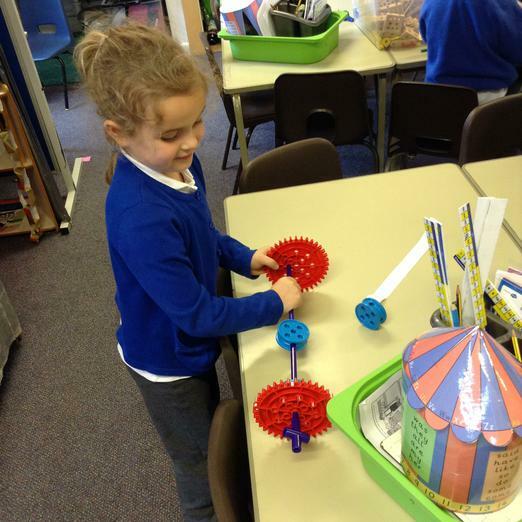 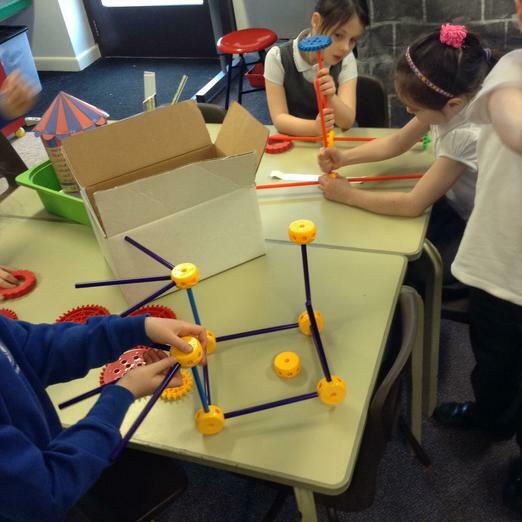 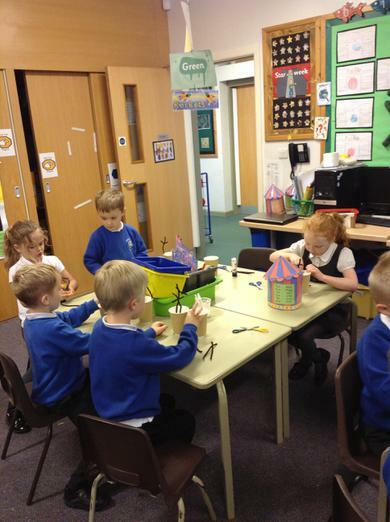 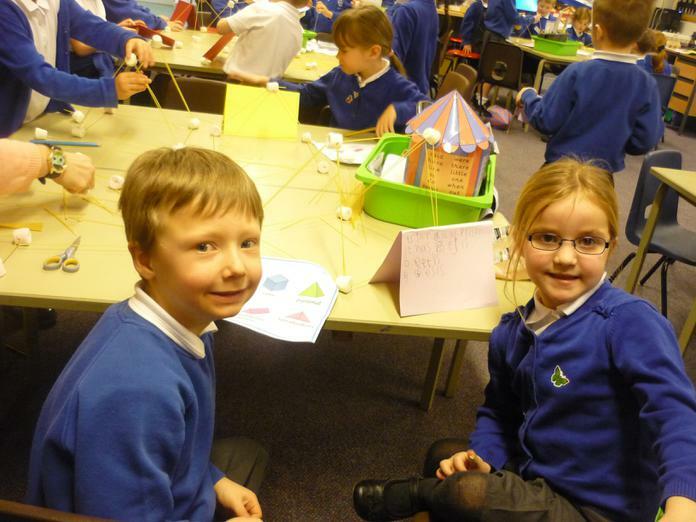 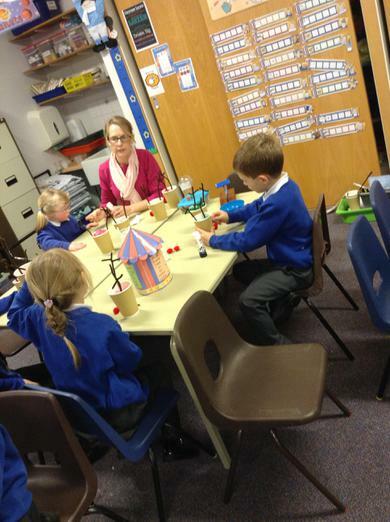 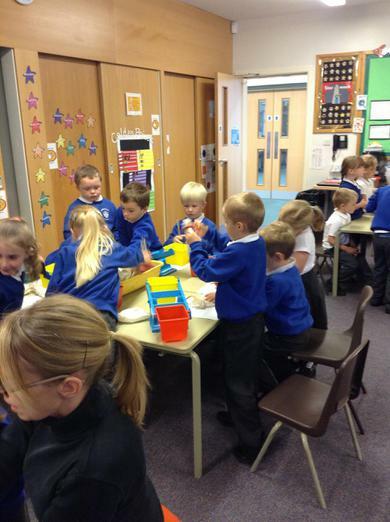 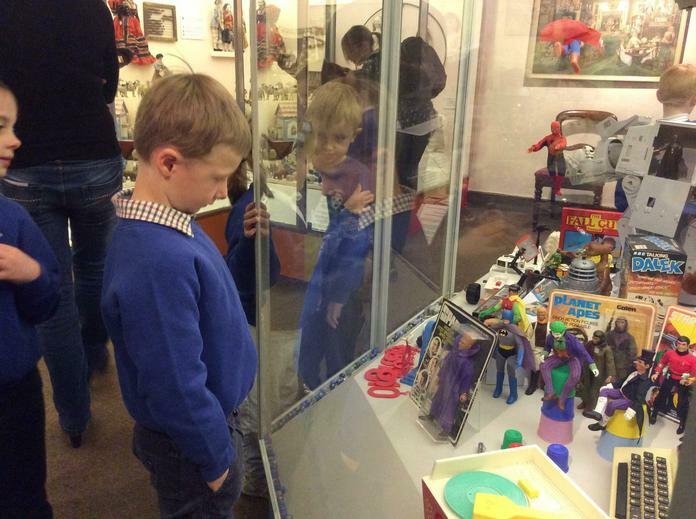 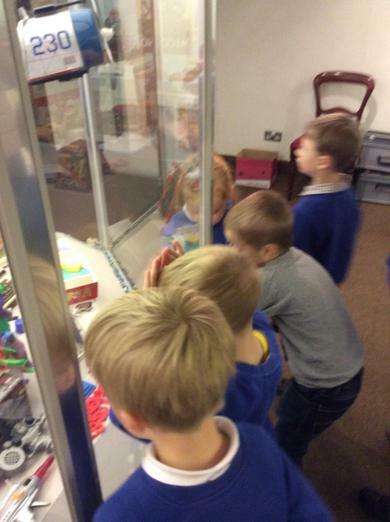 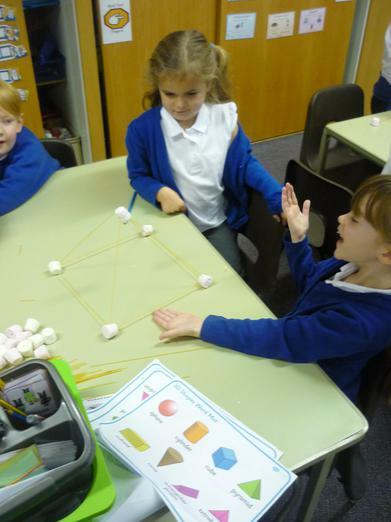 We have been learning about 3D shapes and today we have had a 3D shape exhibition. 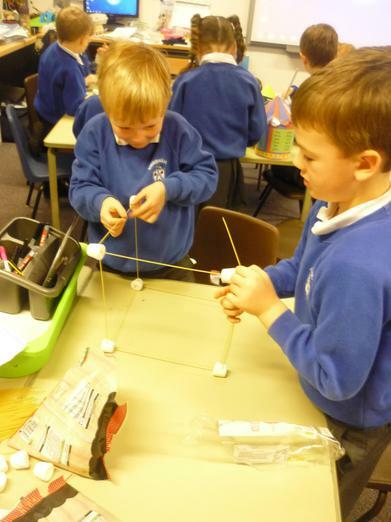 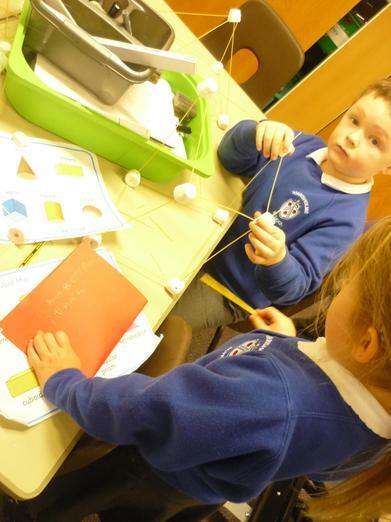 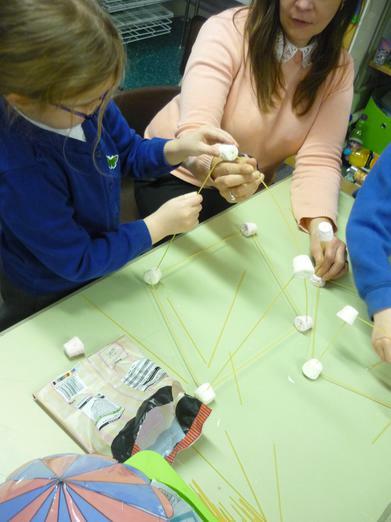 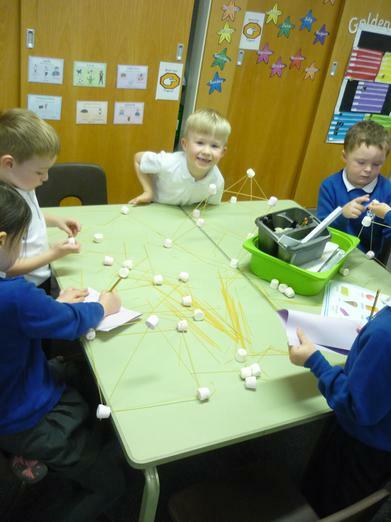 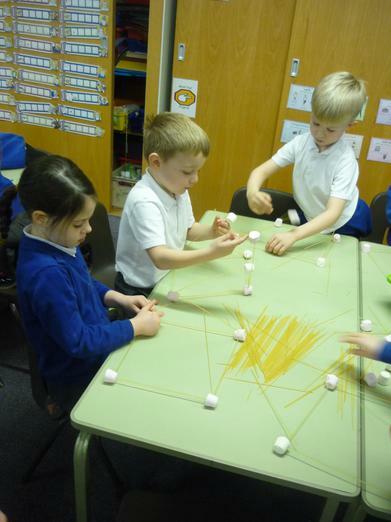 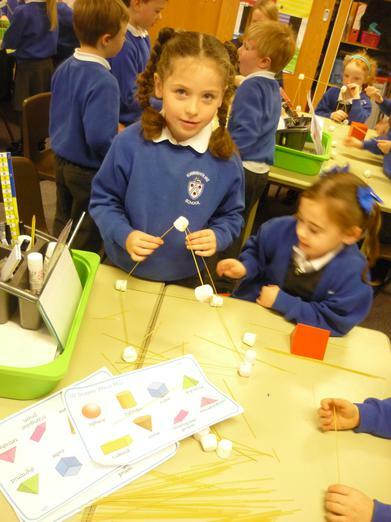 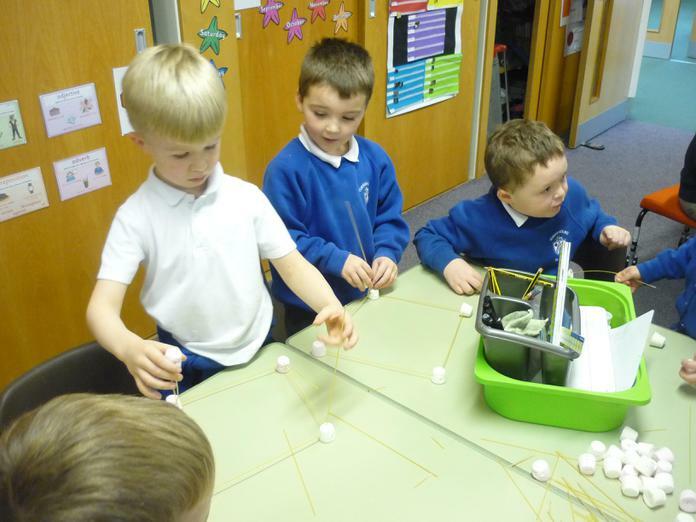 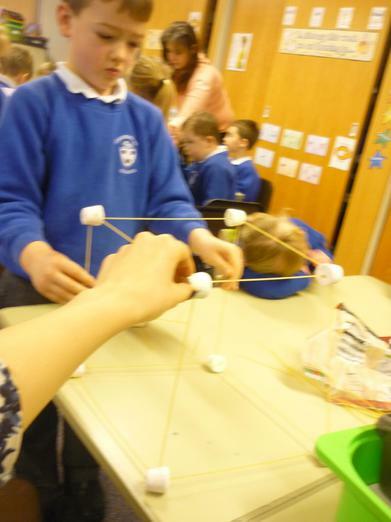 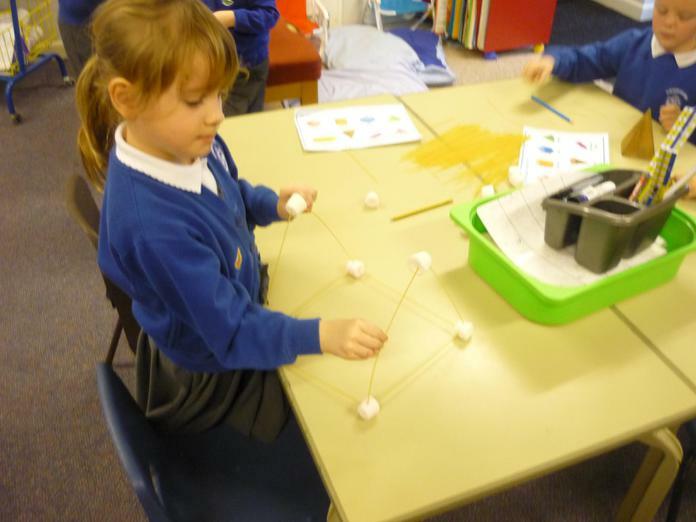 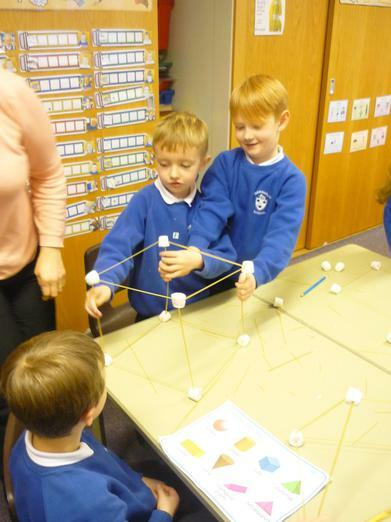 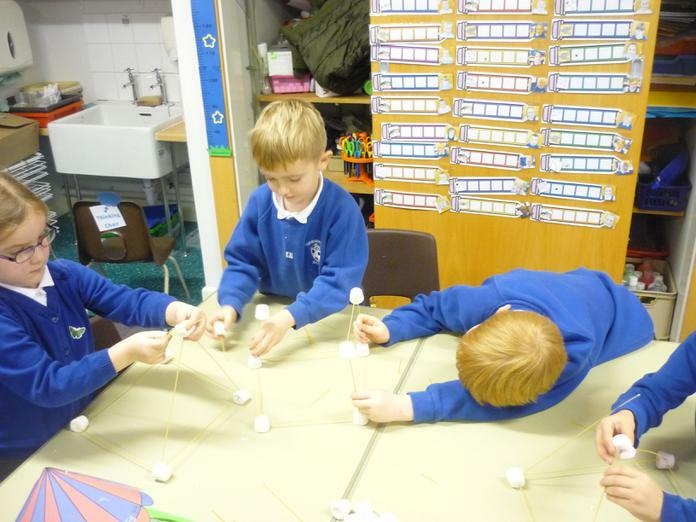 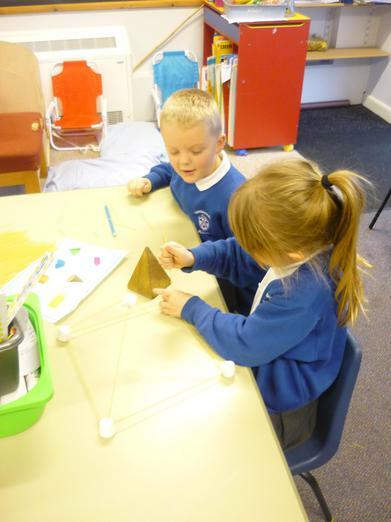 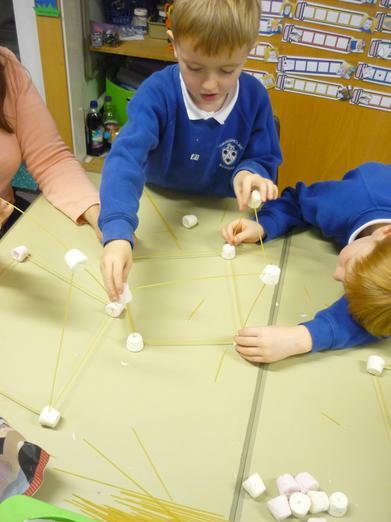 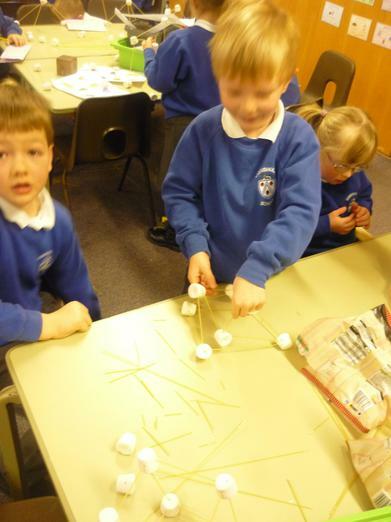 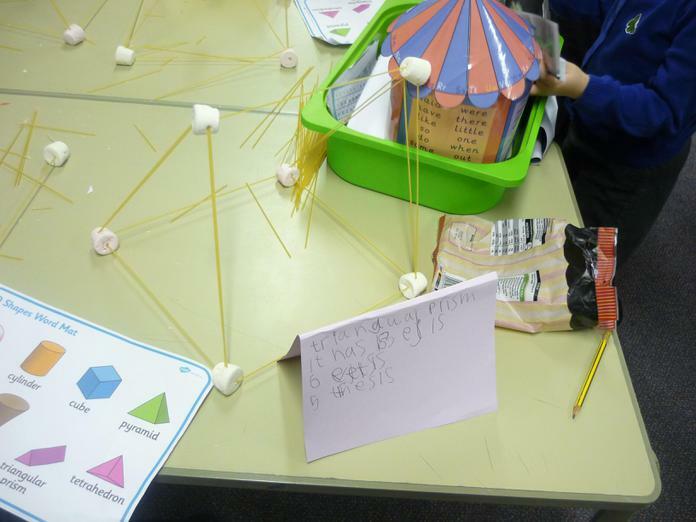 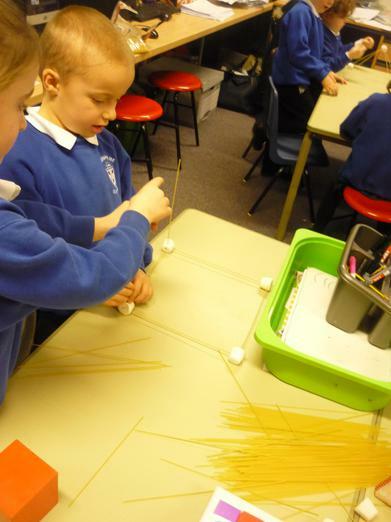 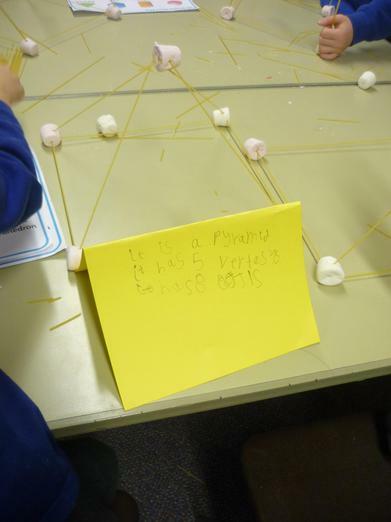 We made different 3D shapes using spaghetti and marshmallows. 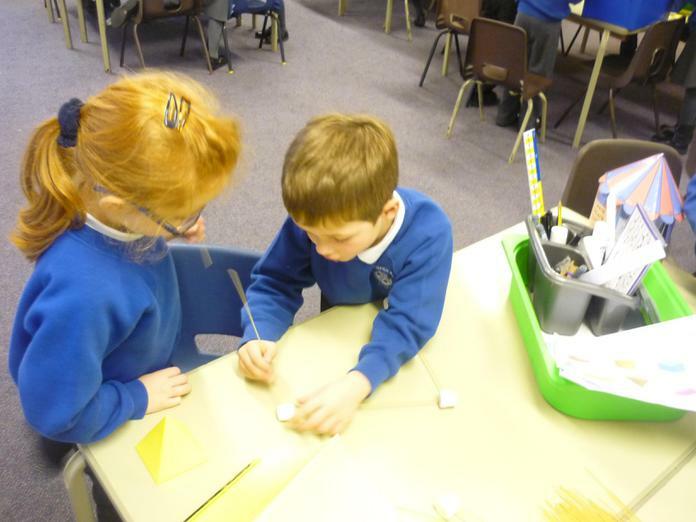 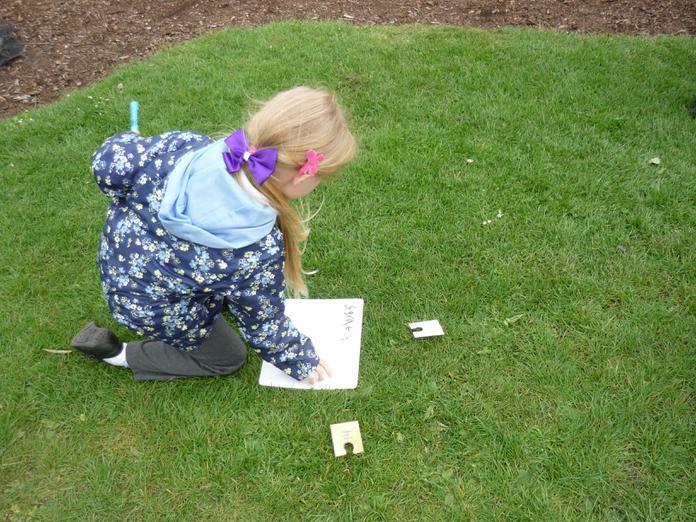 We then made plaque cards with their properties on. 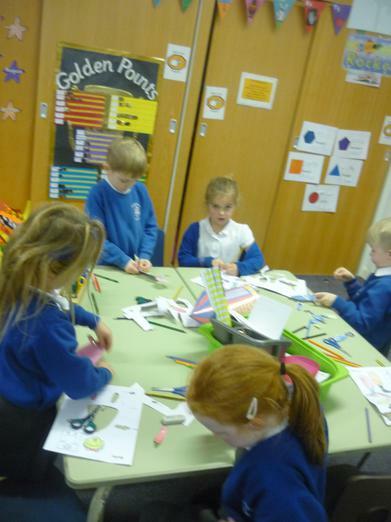 It was great fun and helped us to visualise and understand the faces, edges and vertices of the shapes. 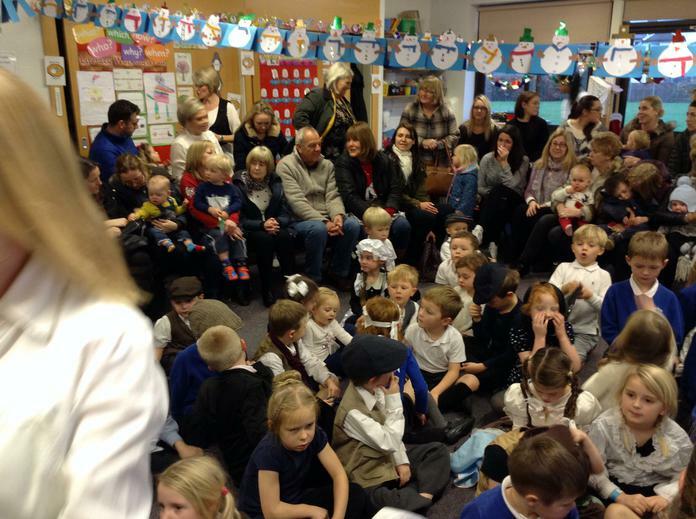 What an exciting start to 2016. 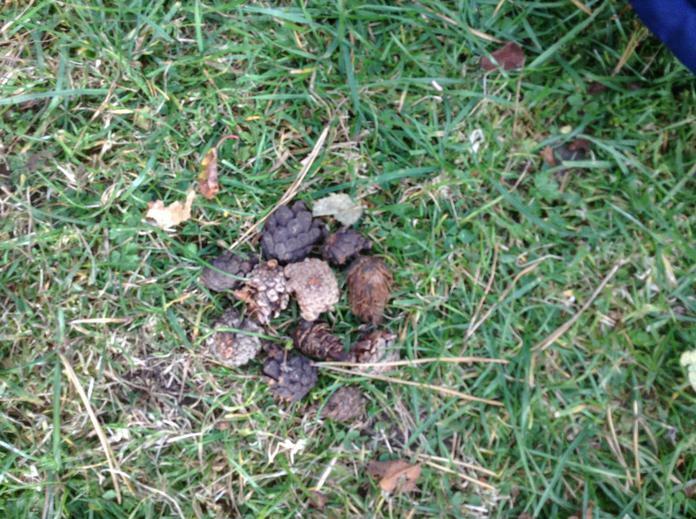 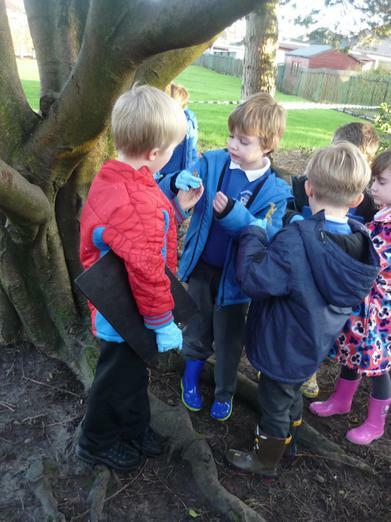 Builders uncovered some strange bones and fossils in our school grounds and Mrs Penney gave us the job to investigate what they were. 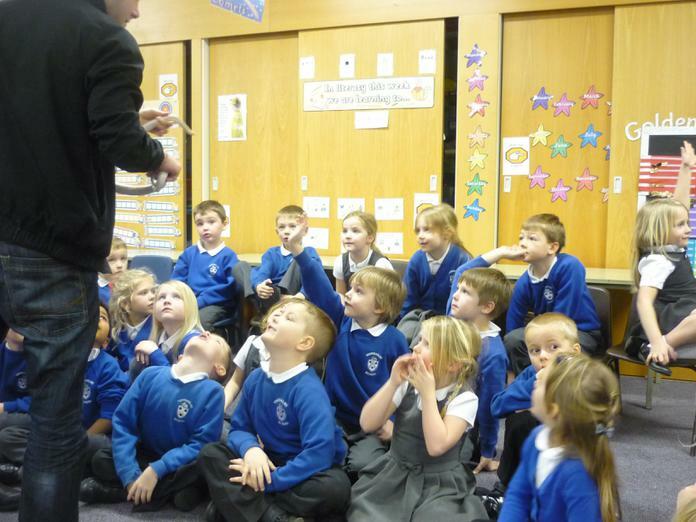 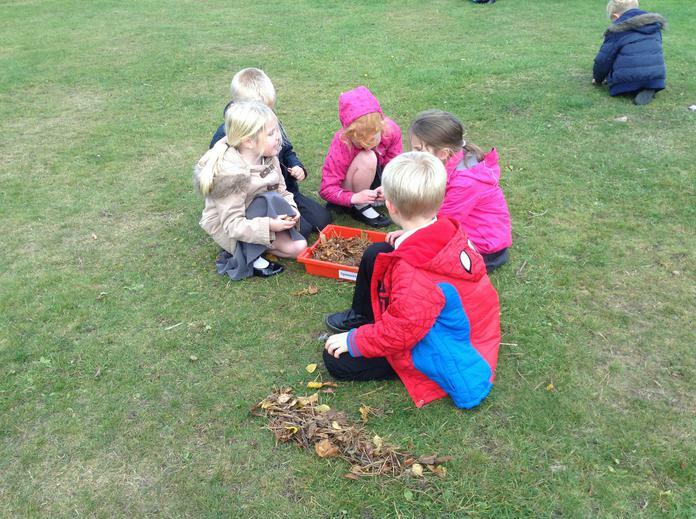 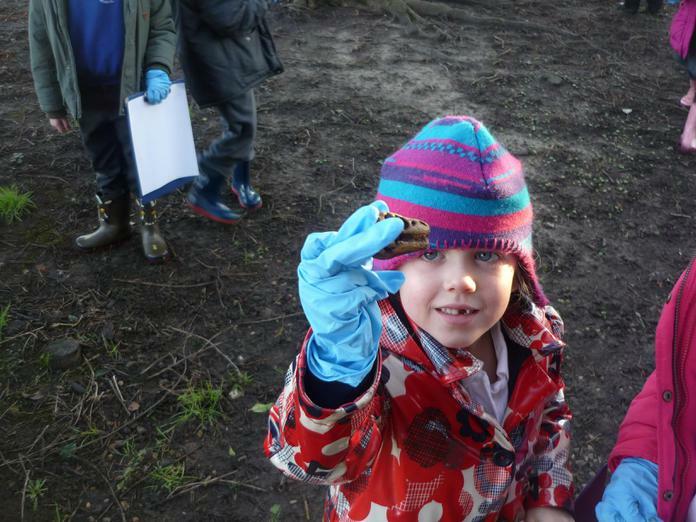 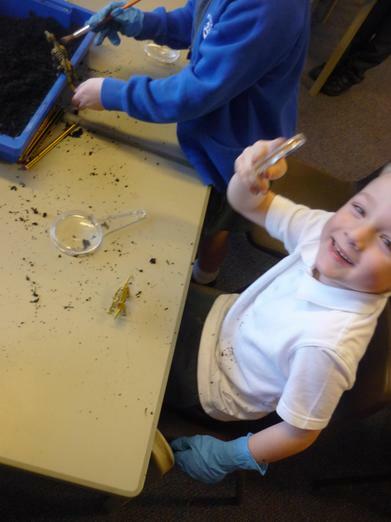 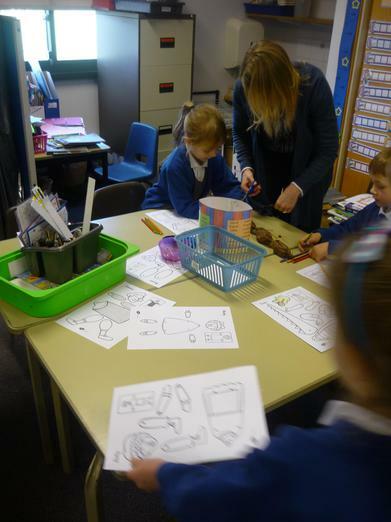 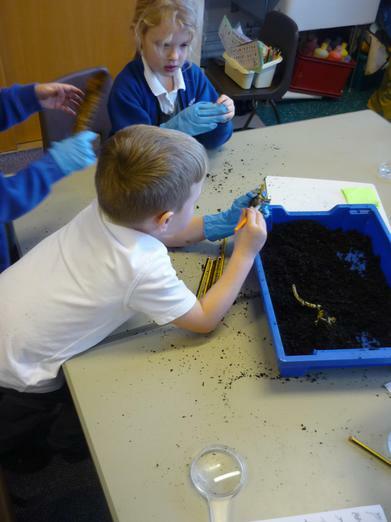 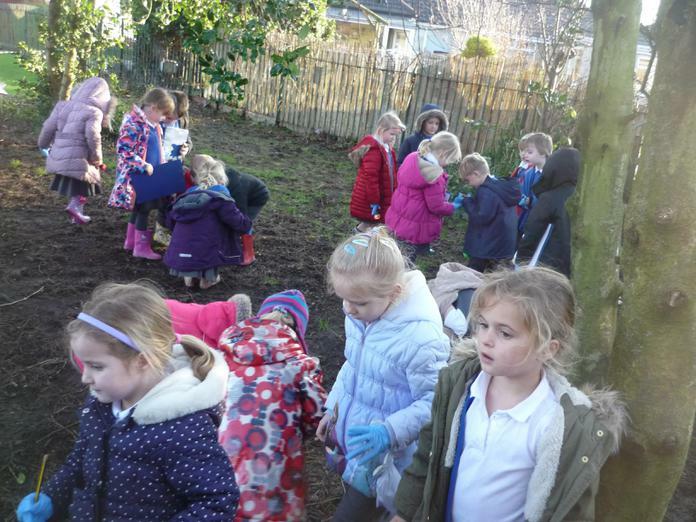 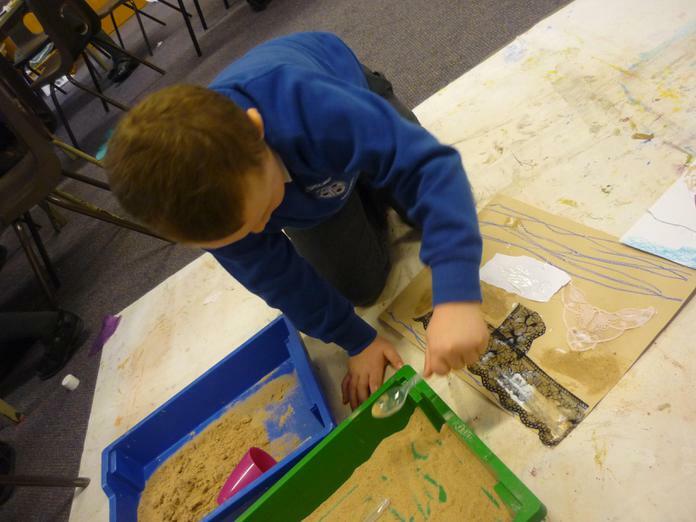 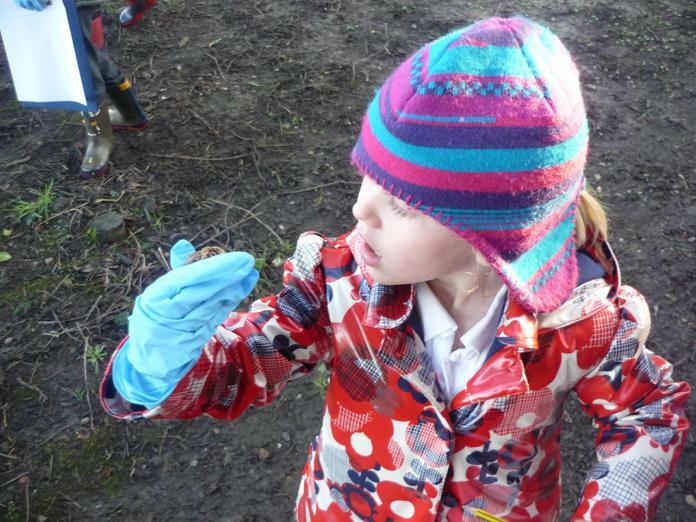 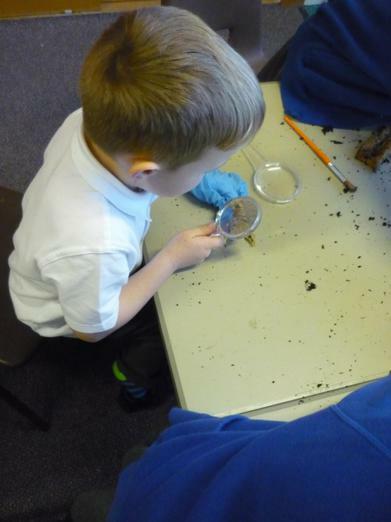 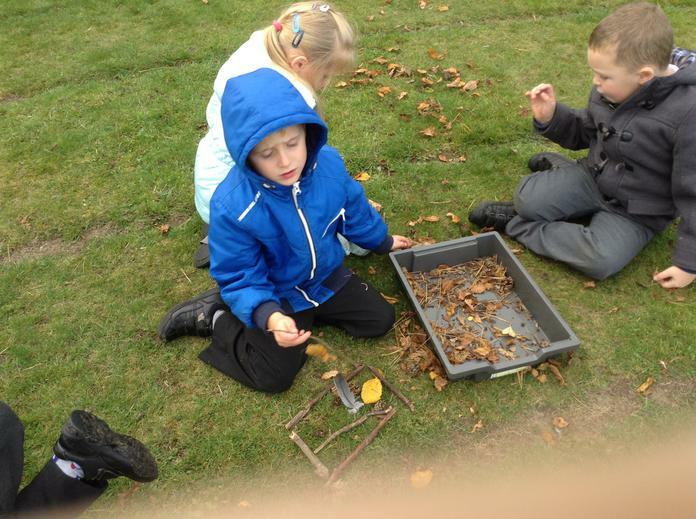 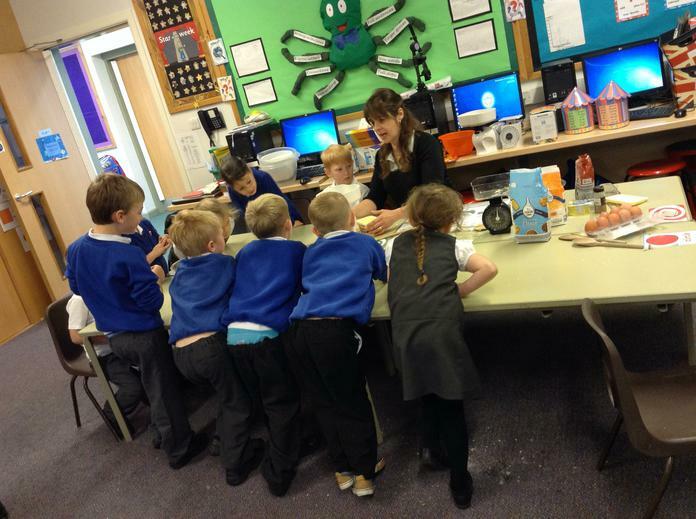 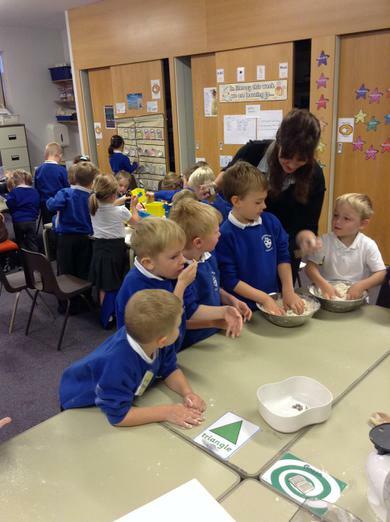 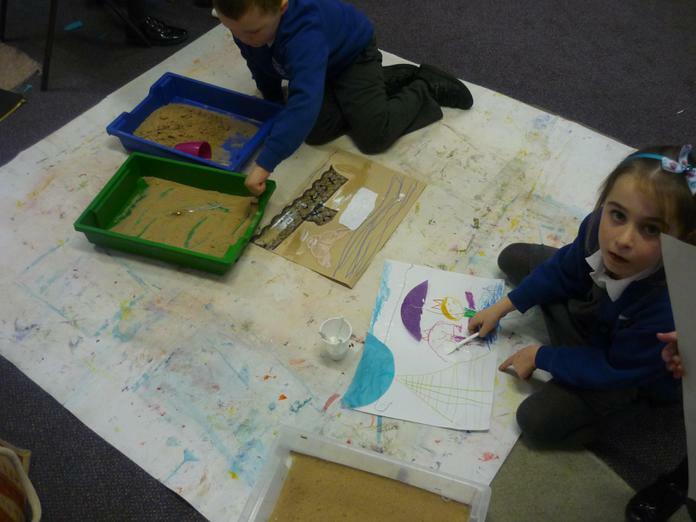 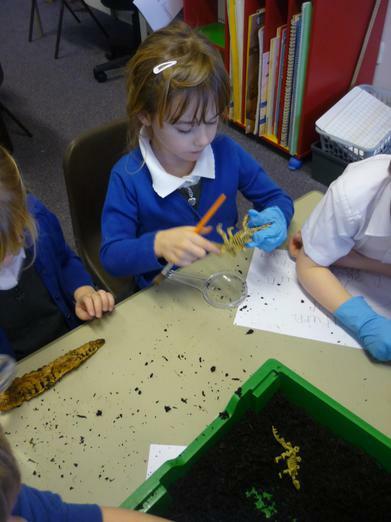 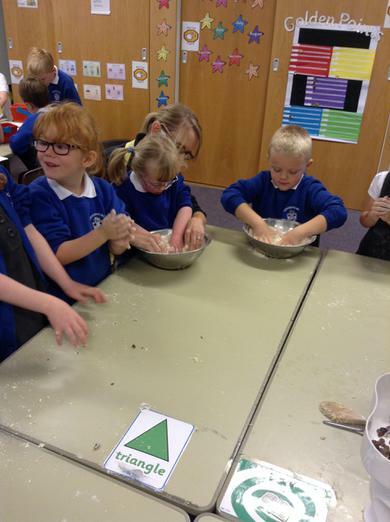 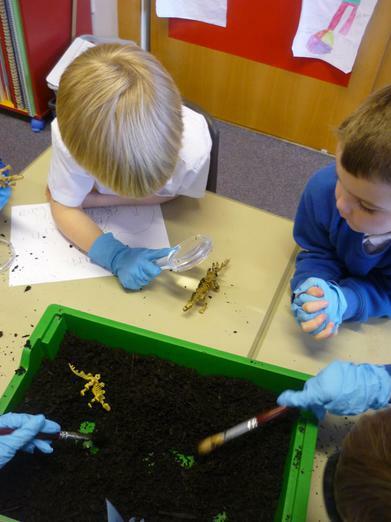 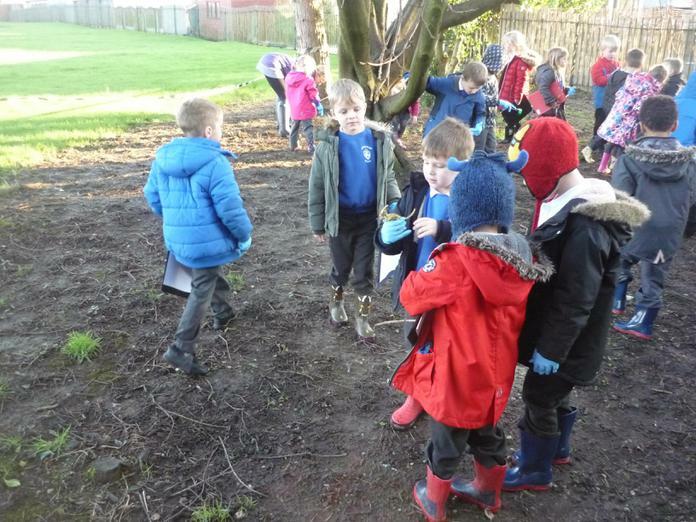 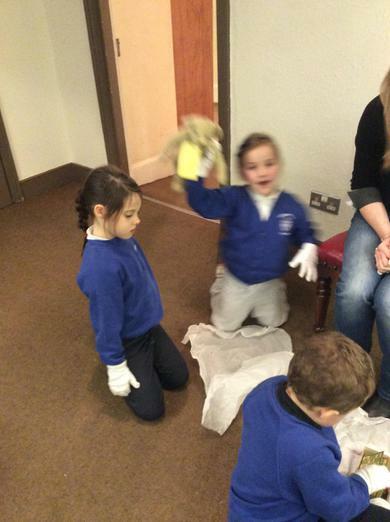 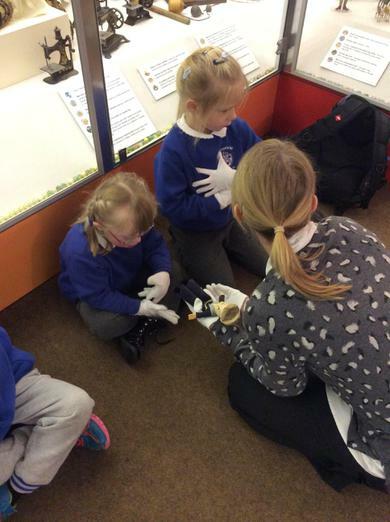 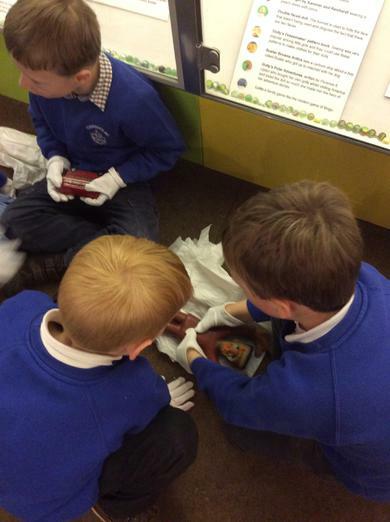 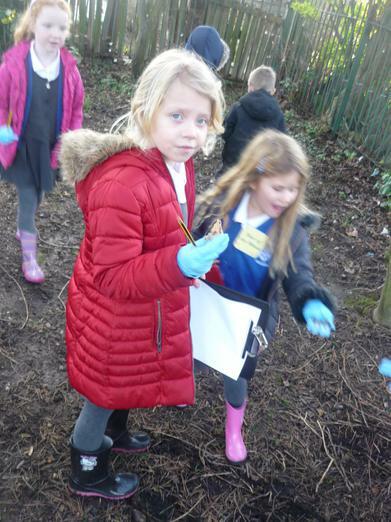 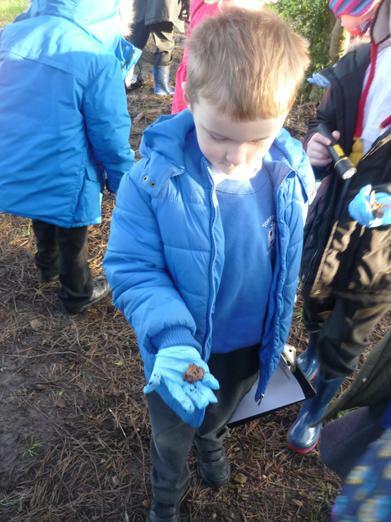 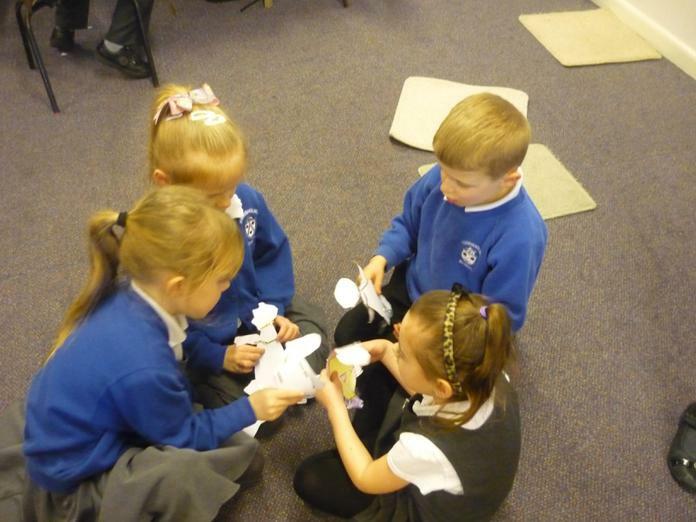 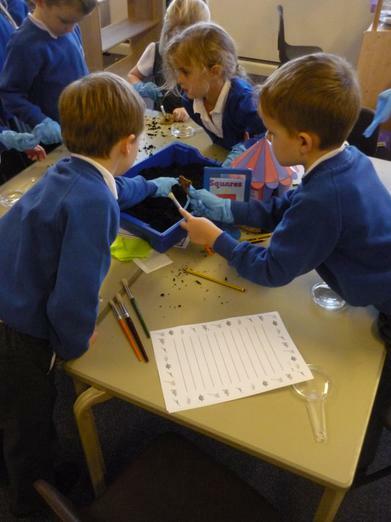 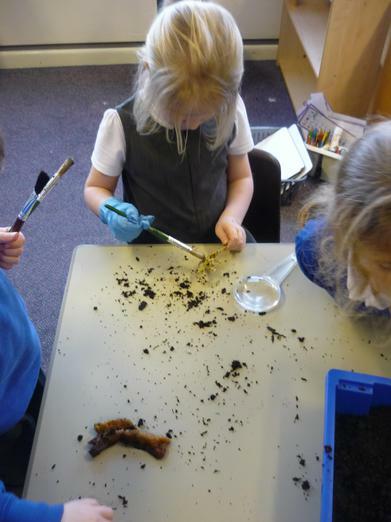 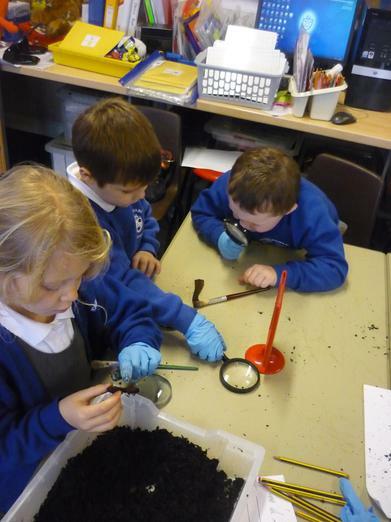 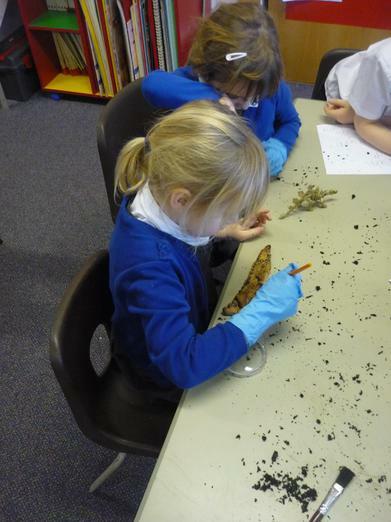 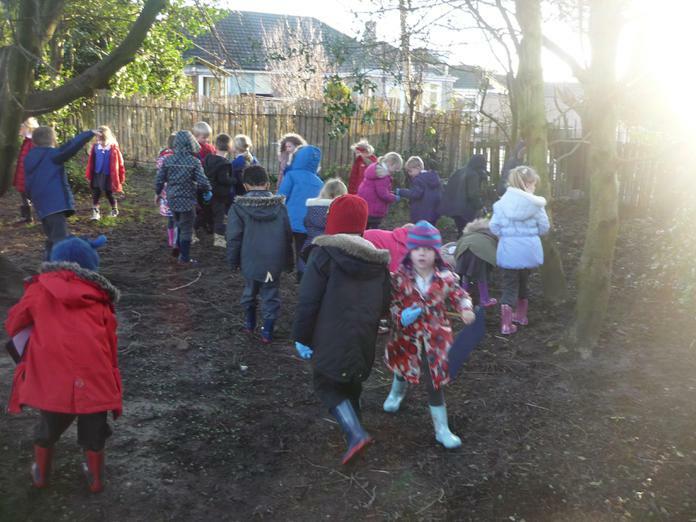 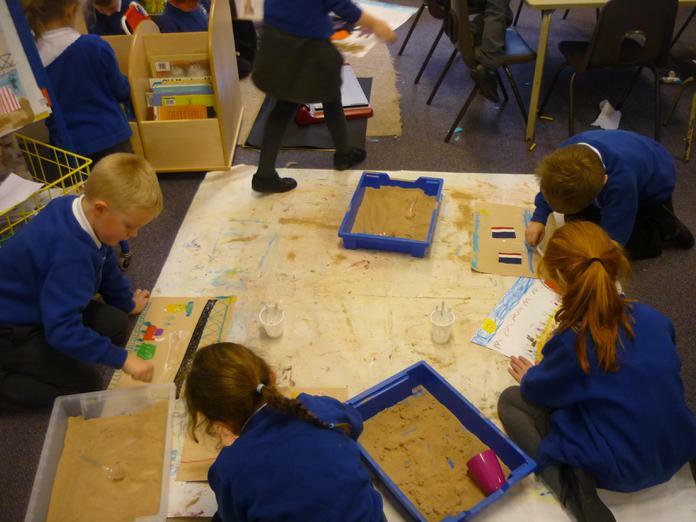 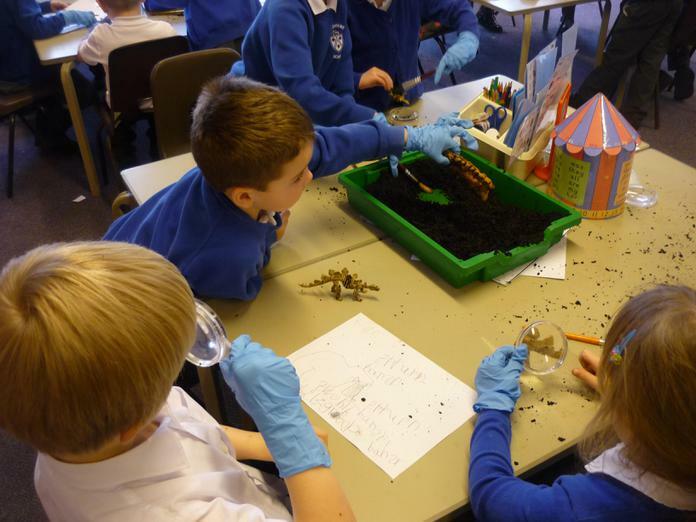 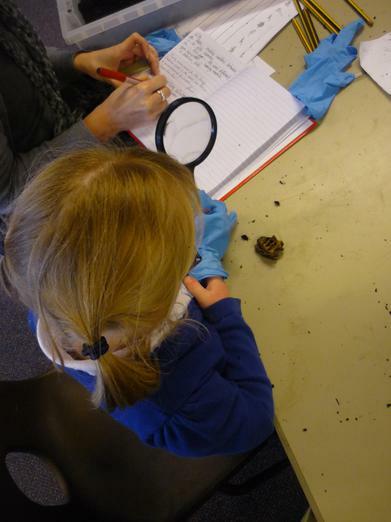 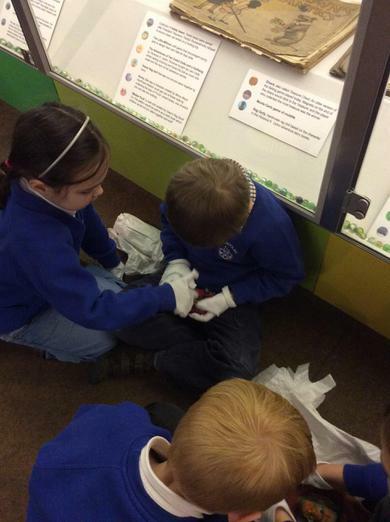 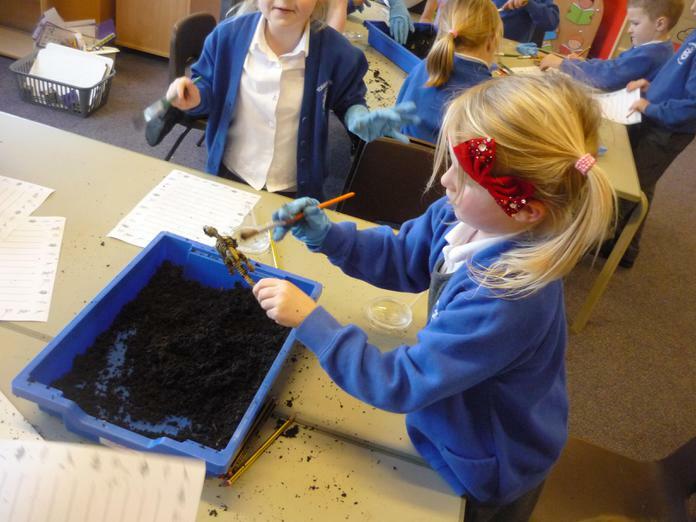 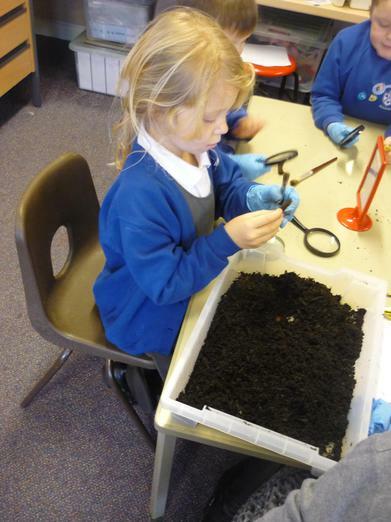 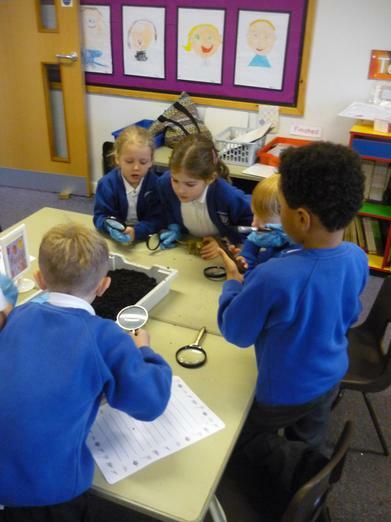 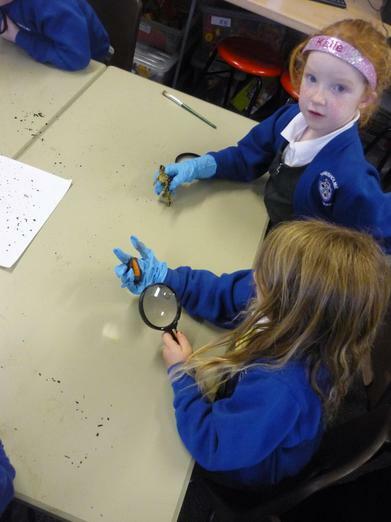 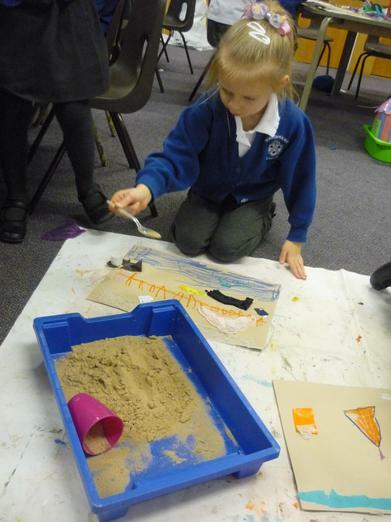 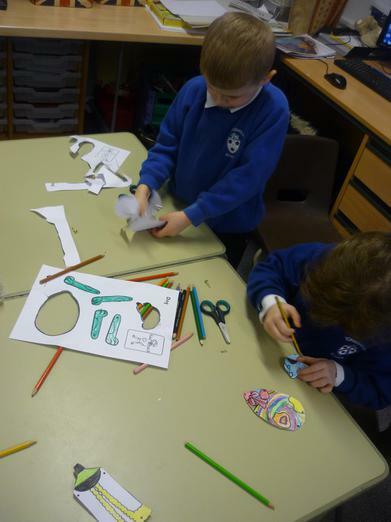 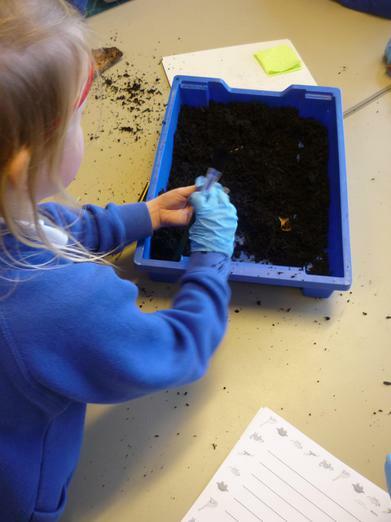 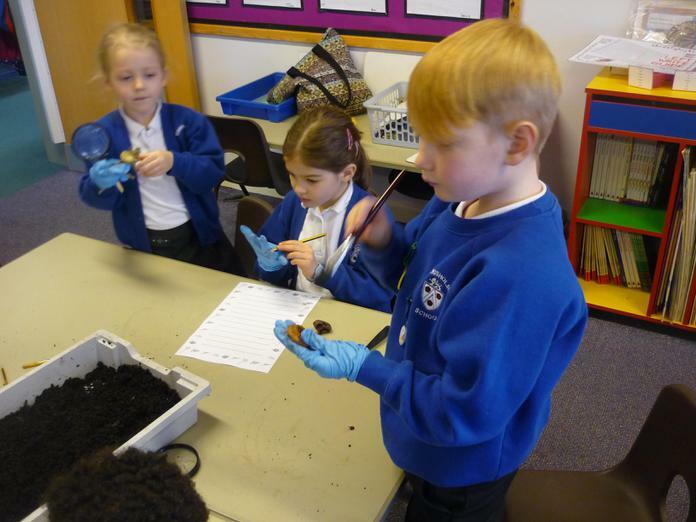 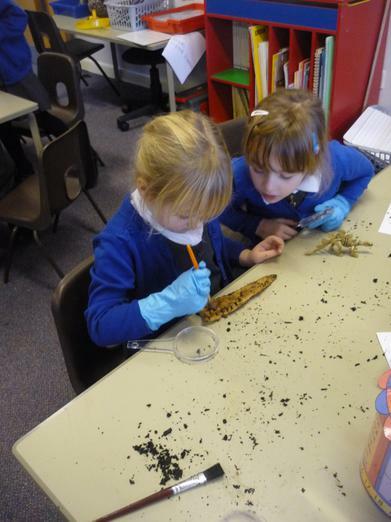 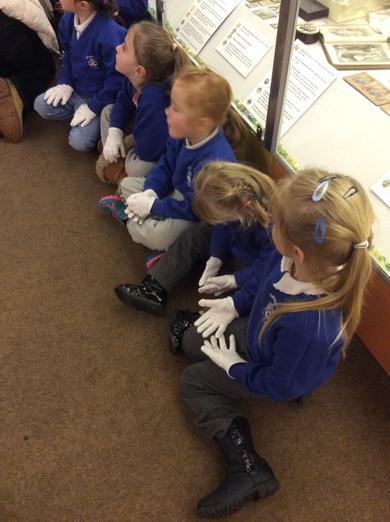 All of year one helped during an excavation and we found bones, fossils and skeletons of what we think are dinosaurs! 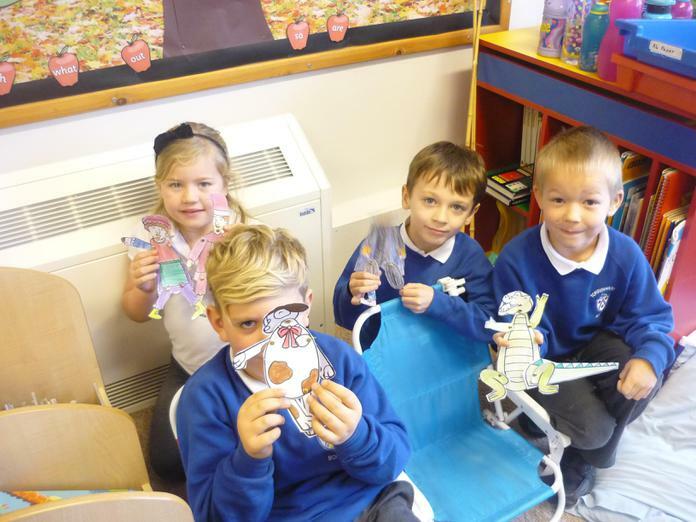 We've decided this will be our new topic and we are going to learn lots about dinosaurs and try to work out how they ended up here. 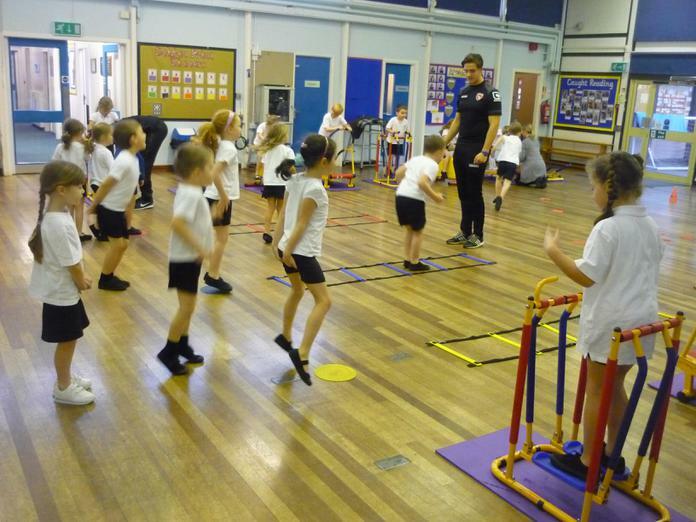 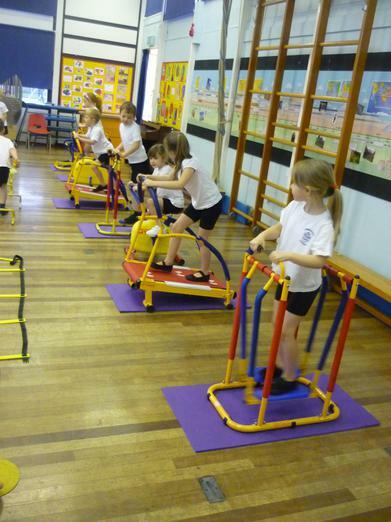 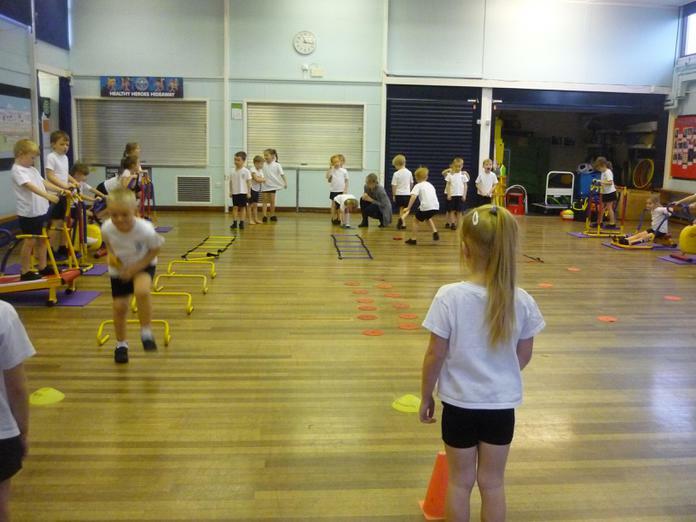 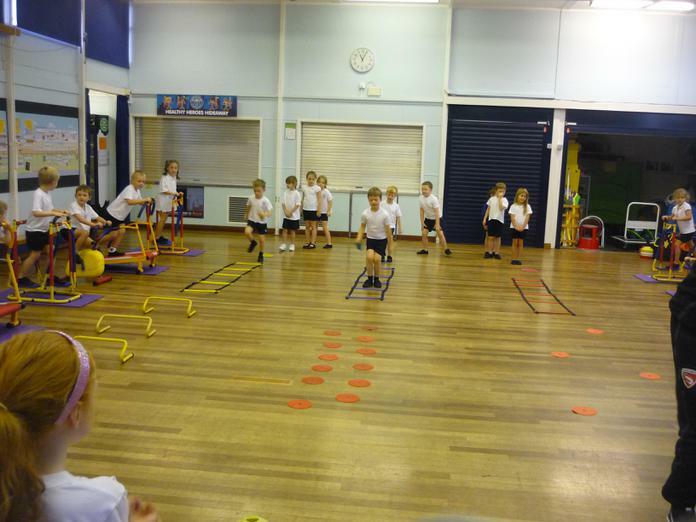 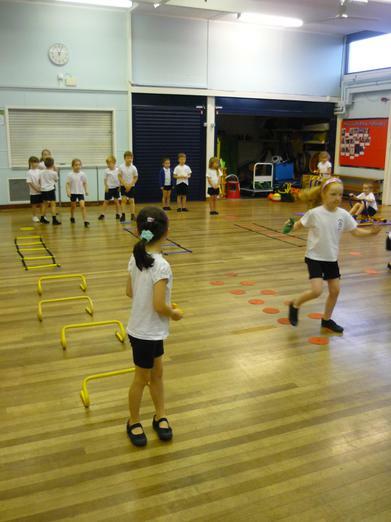 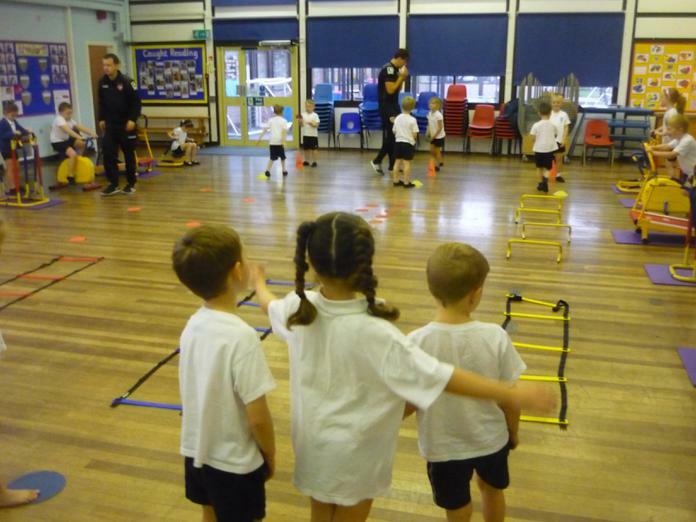 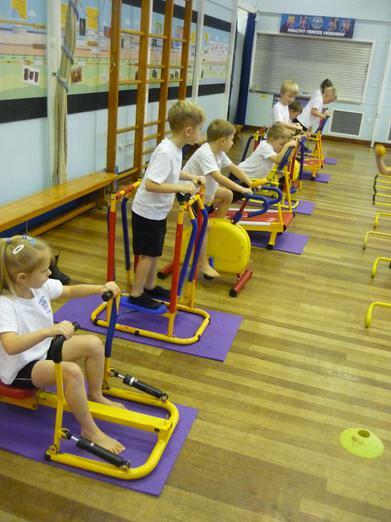 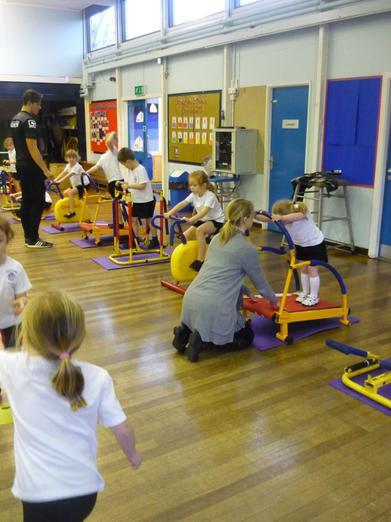 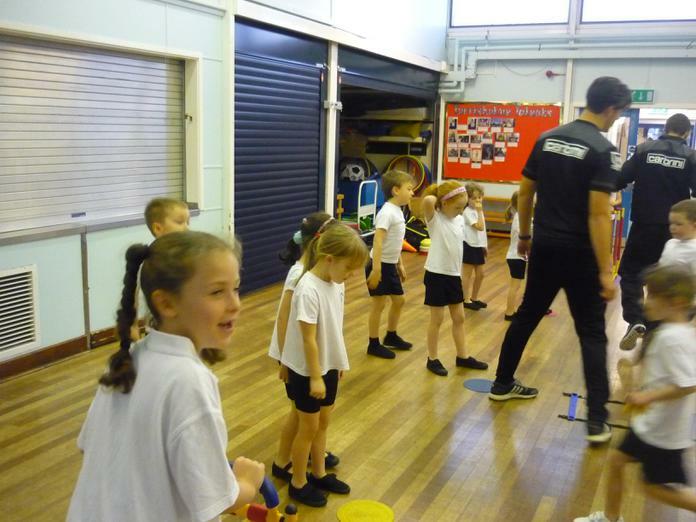 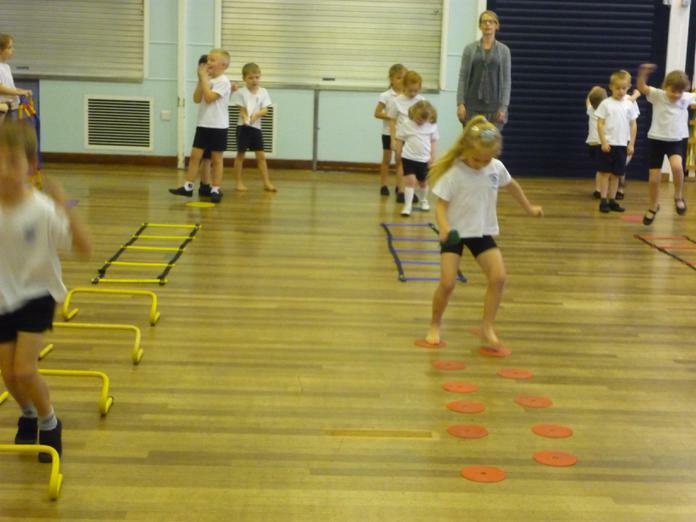 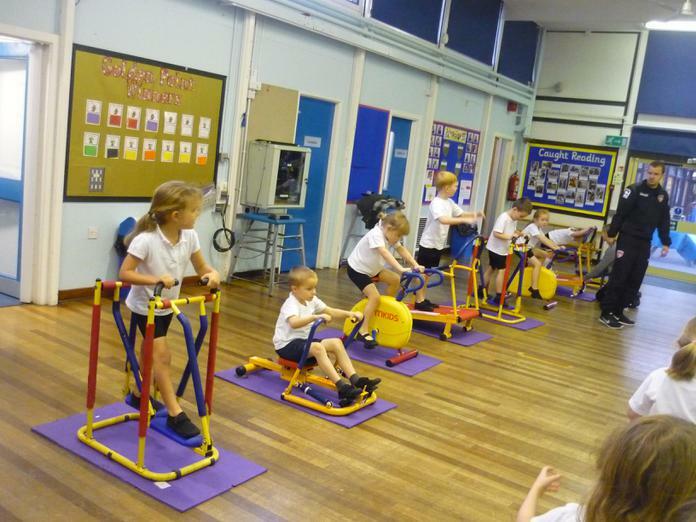 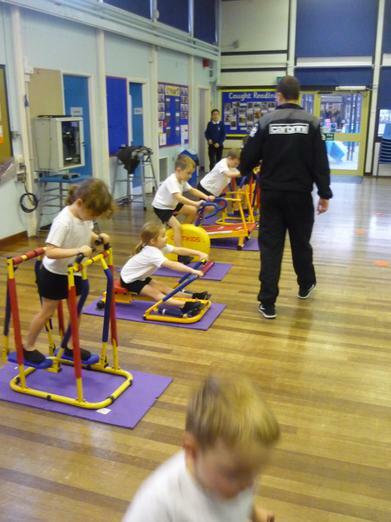 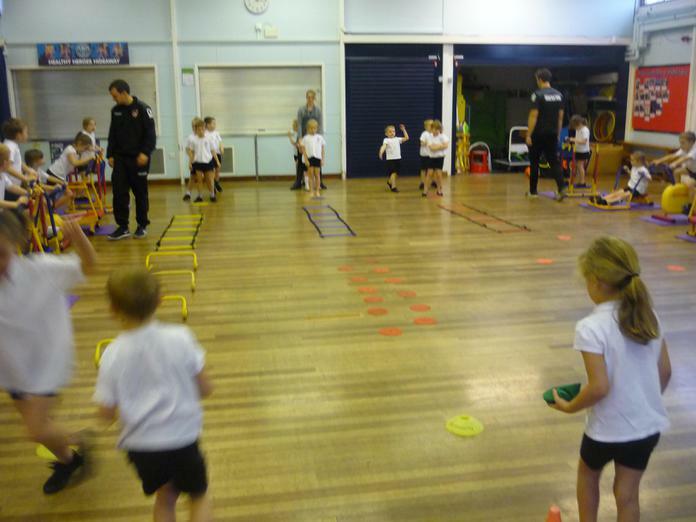 We are very lucky to have Gym Stars visiting year one each Wednesday for six weeks during our PE lesson. 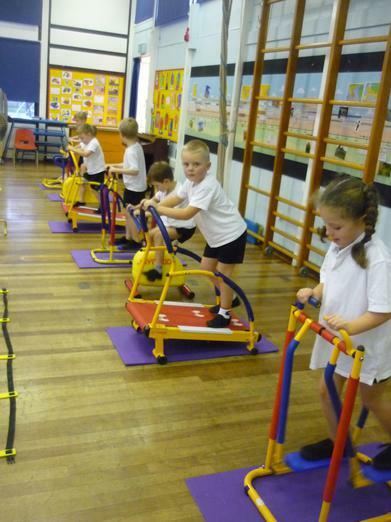 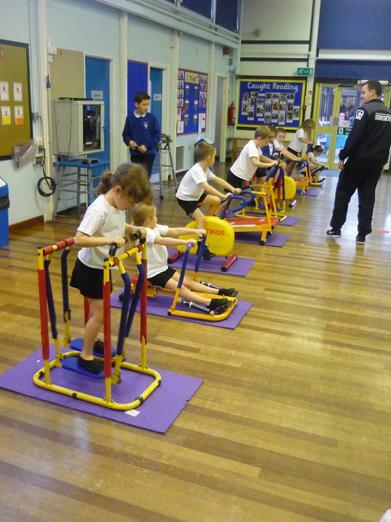 We will be using different fitness equipment and doing a range of exciting activities. 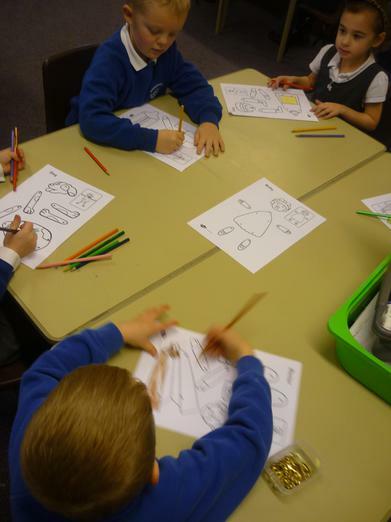 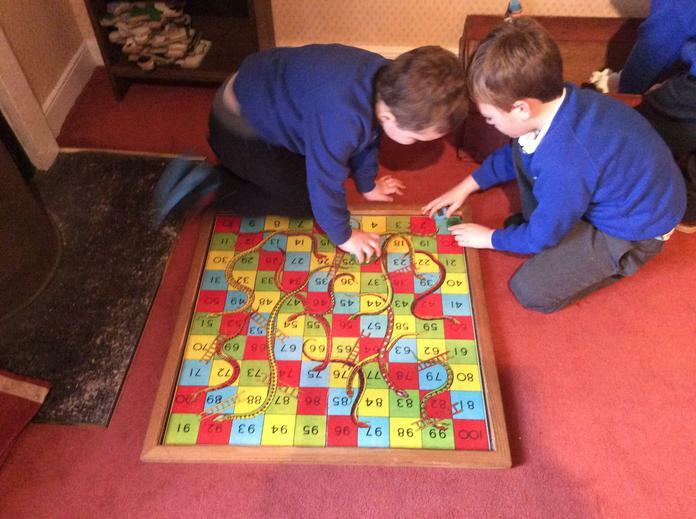 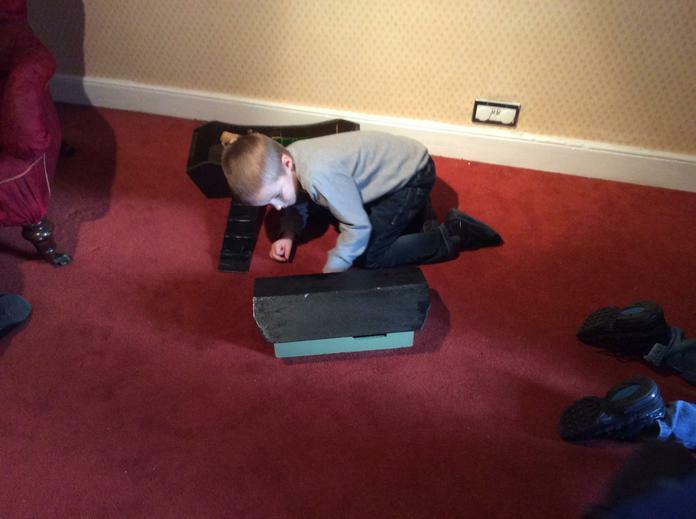 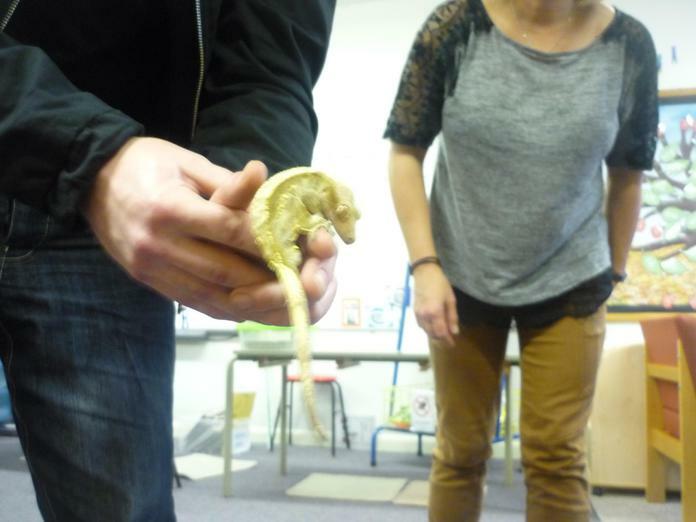 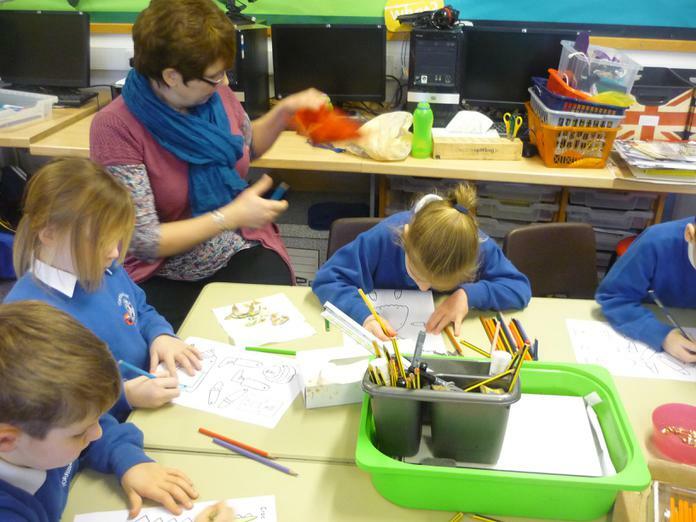 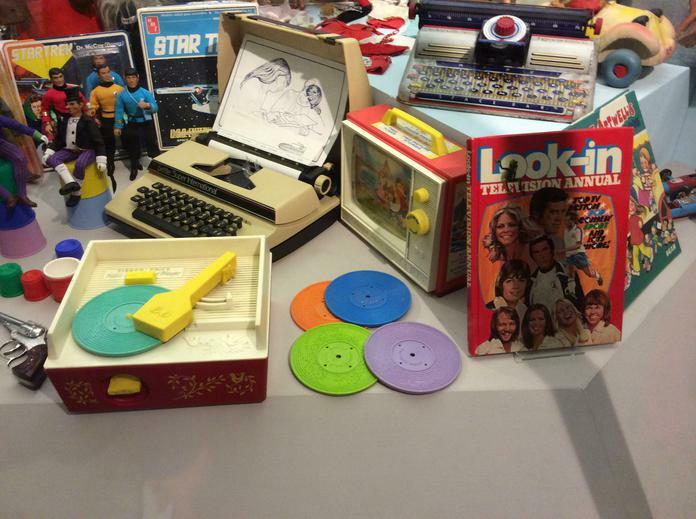 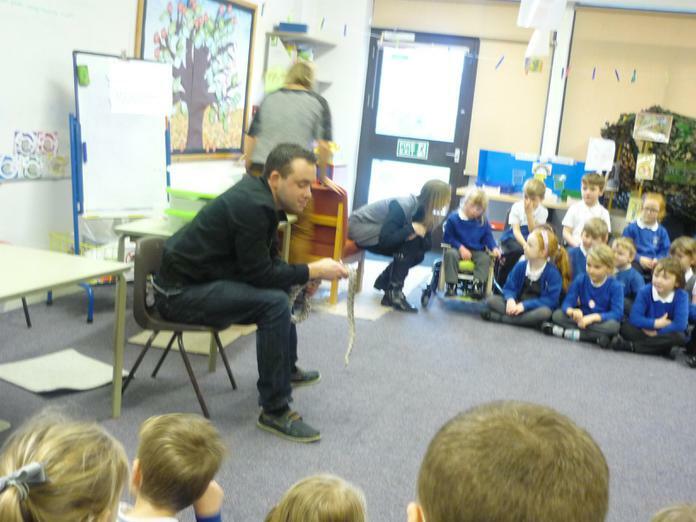 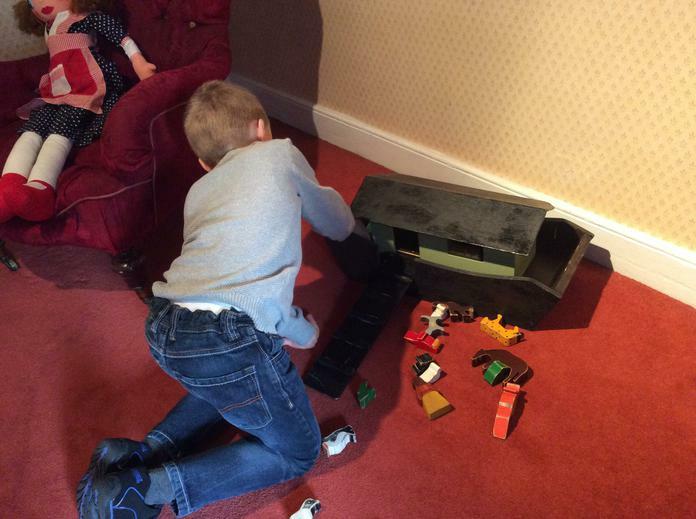 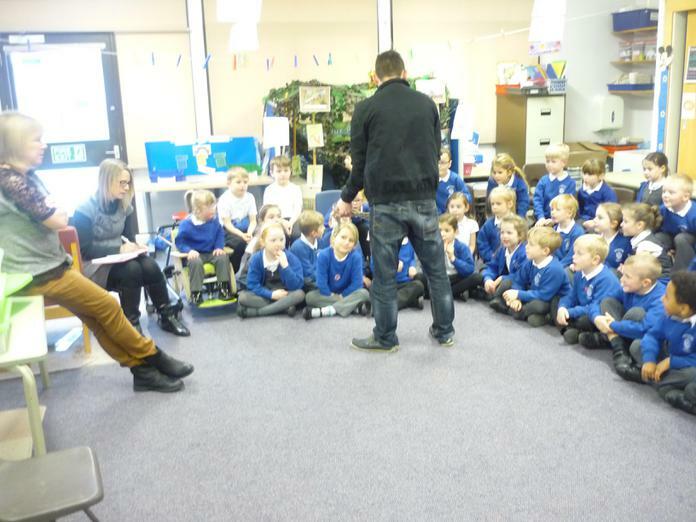 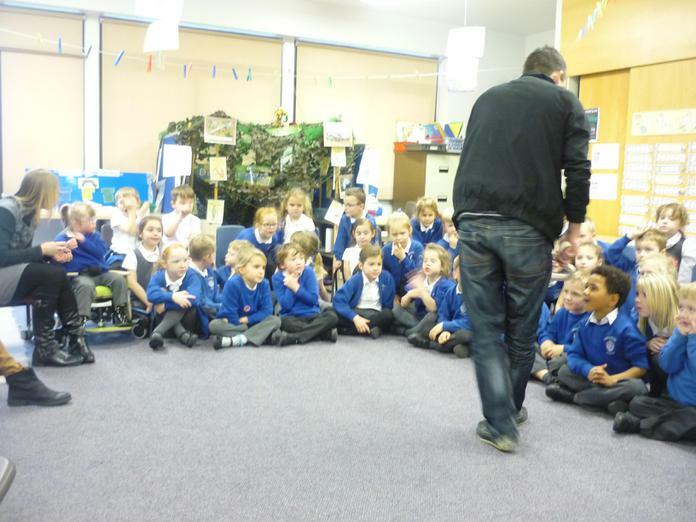 We had our first session on Wednesday 6th January and it was great! 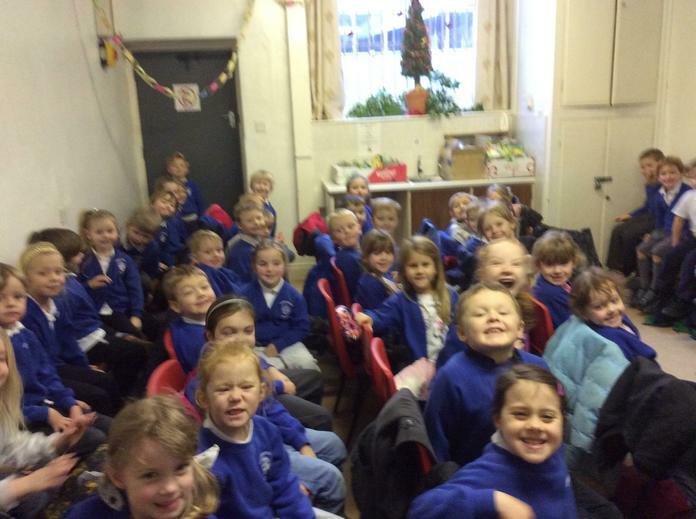 A very merry Christmas to everyone from 1M. 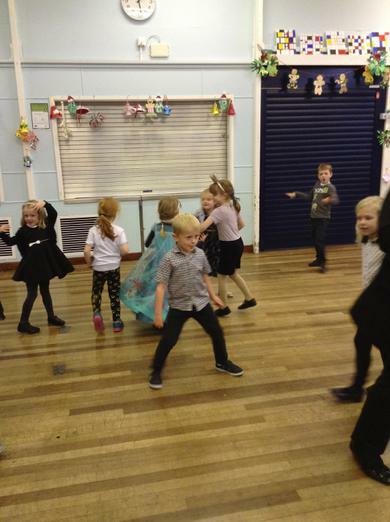 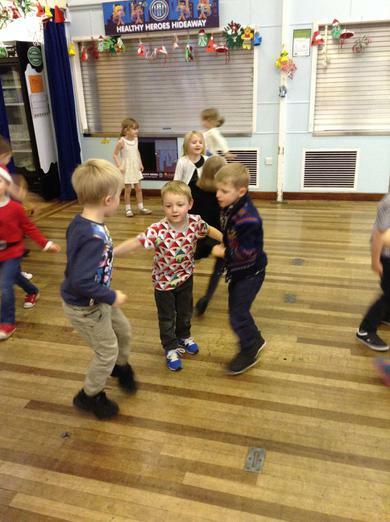 1M and 1D showing off their best moves at the year one Christmas party. 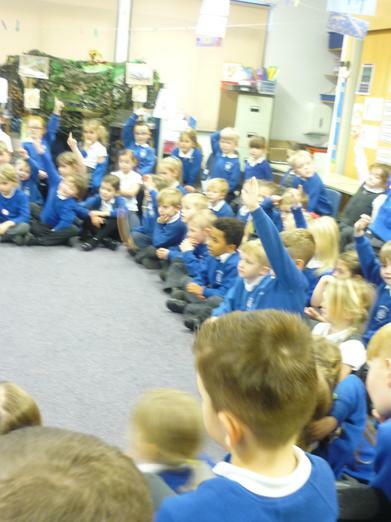 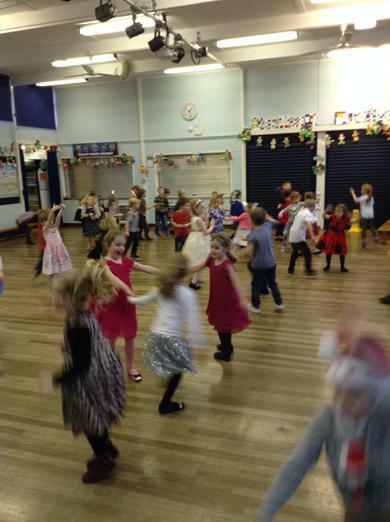 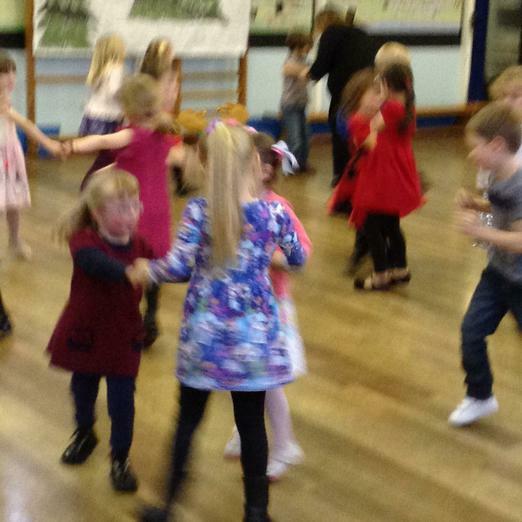 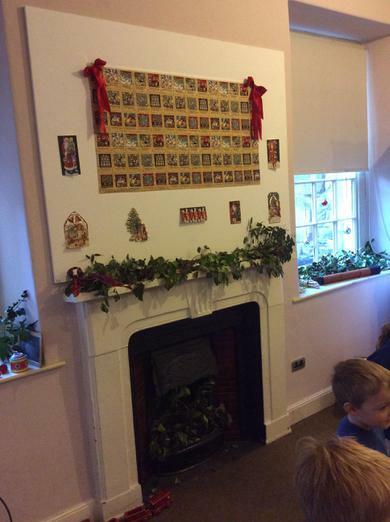 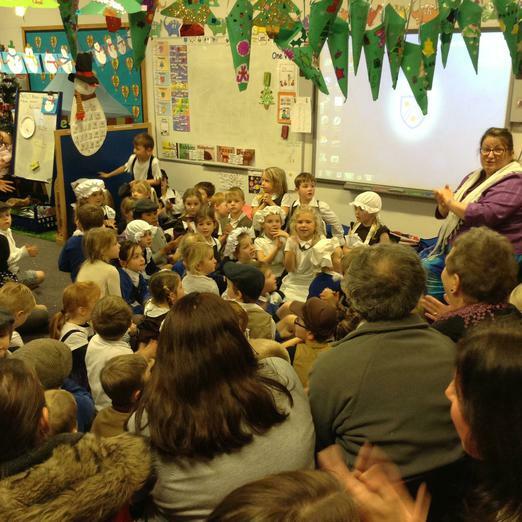 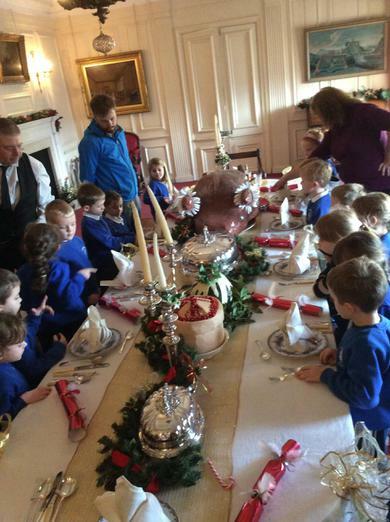 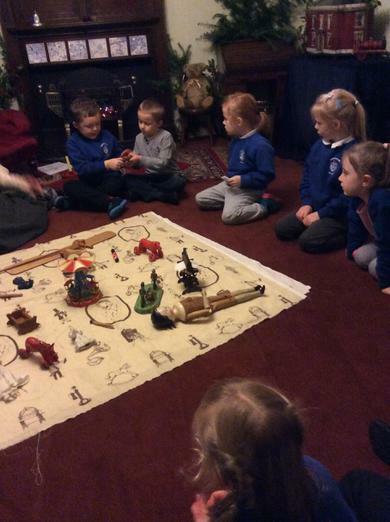 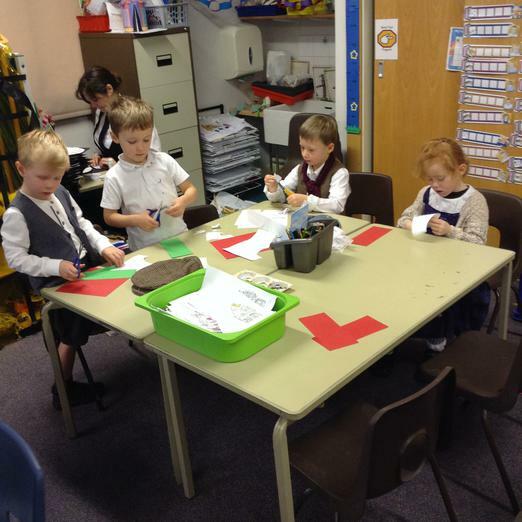 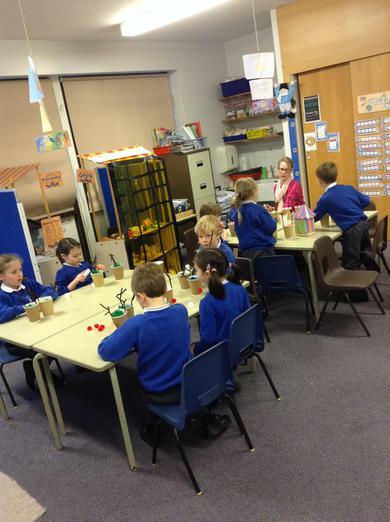 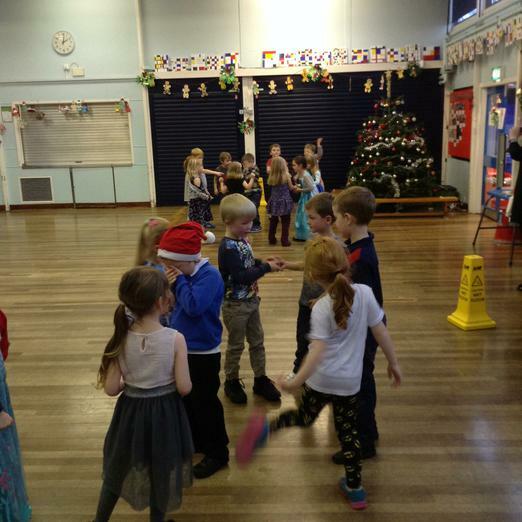 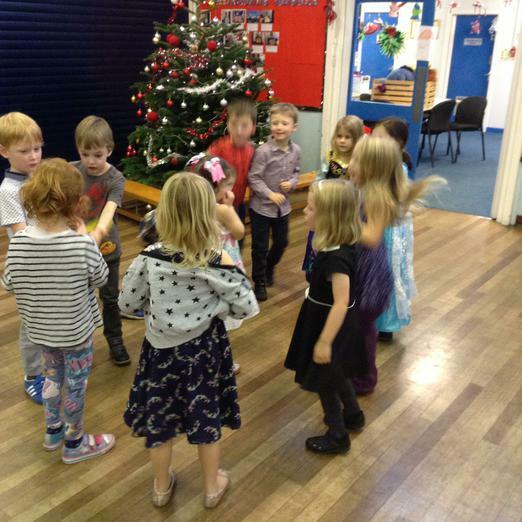 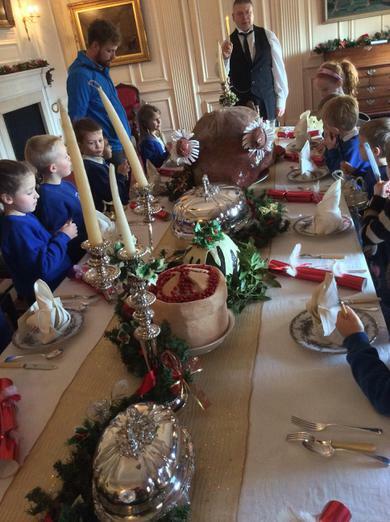 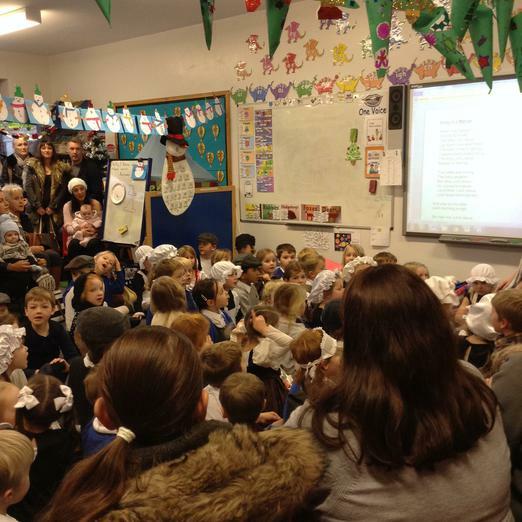 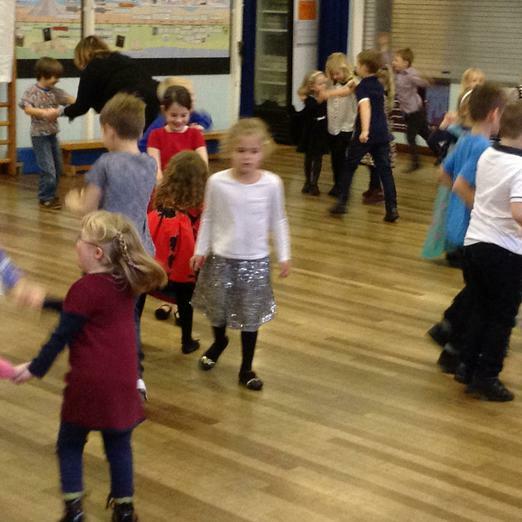 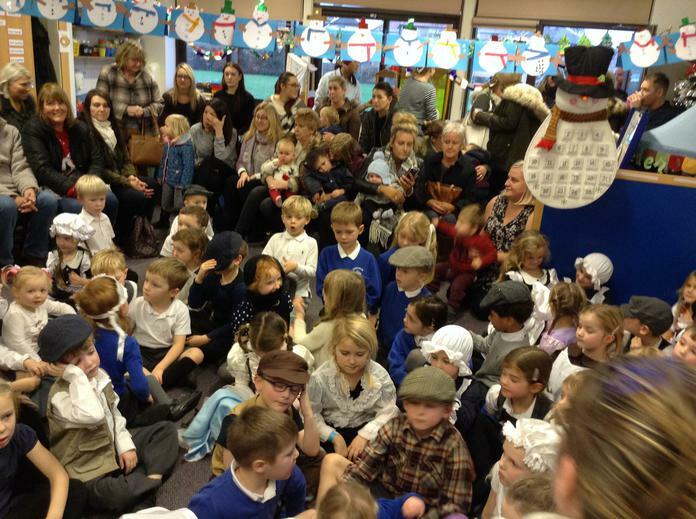 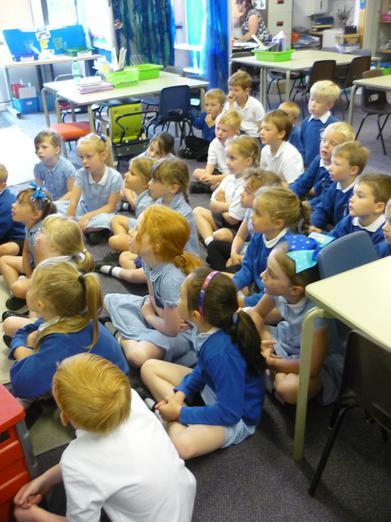 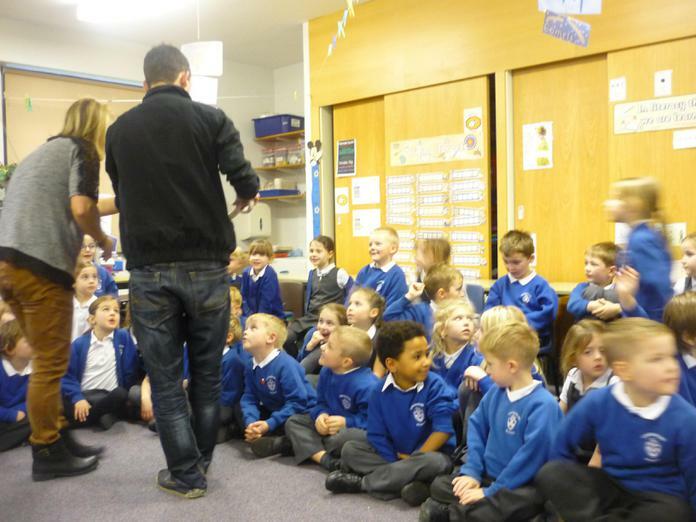 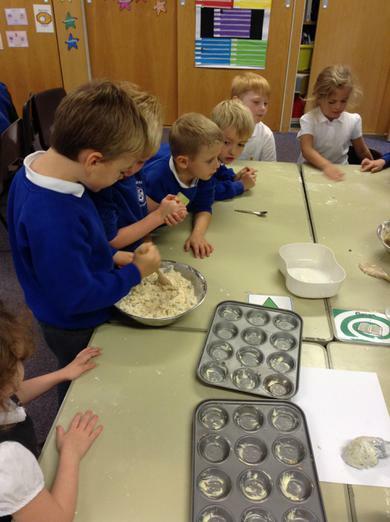 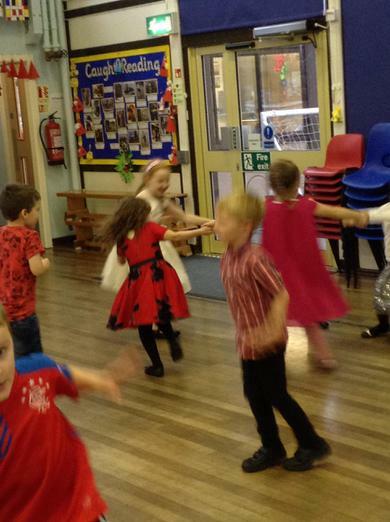 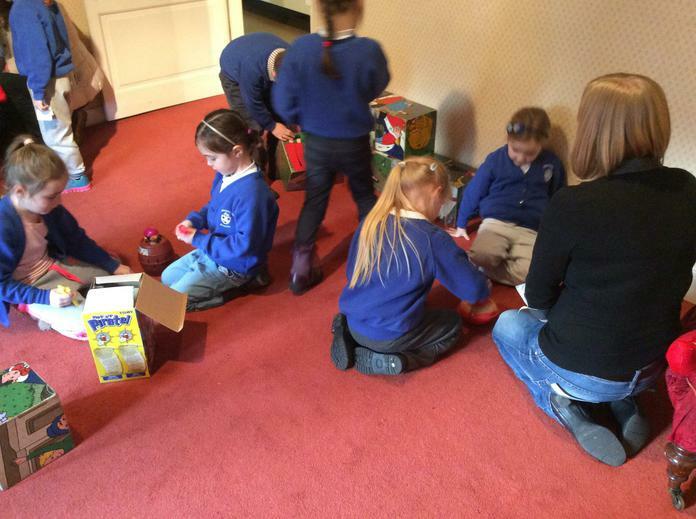 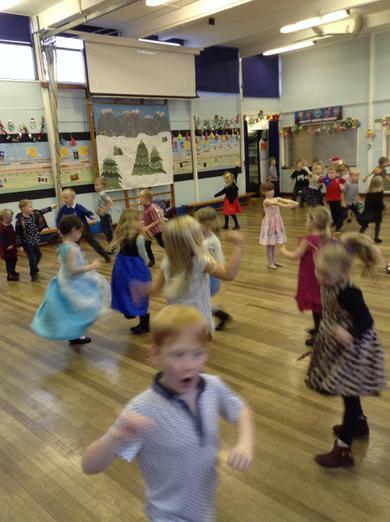 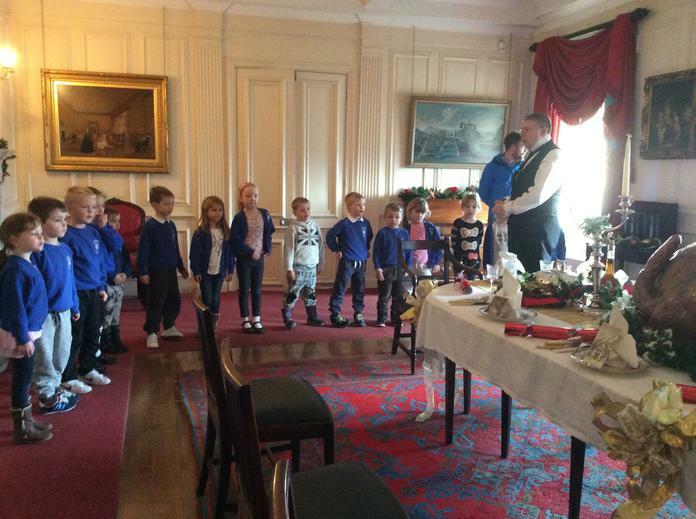 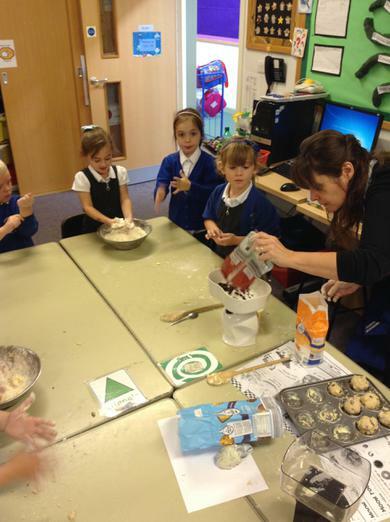 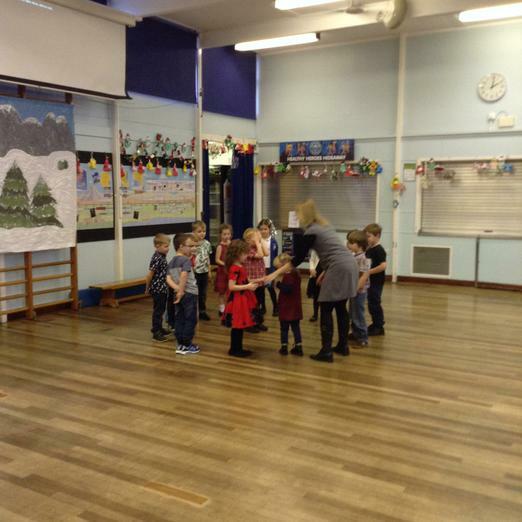 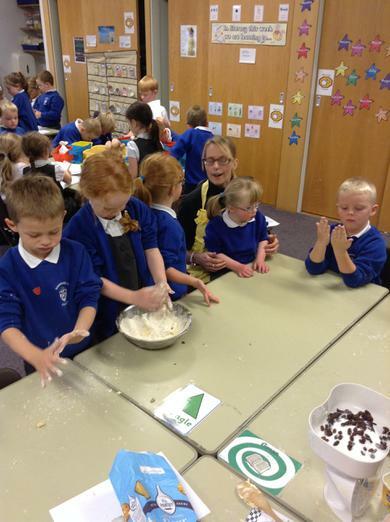 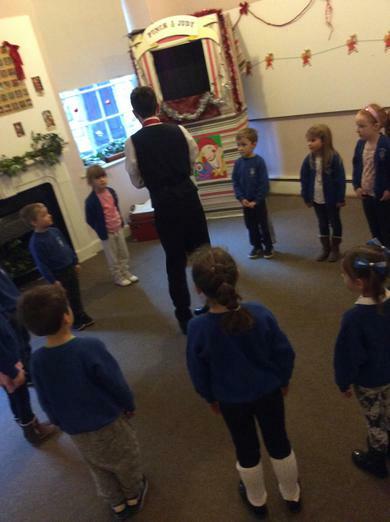 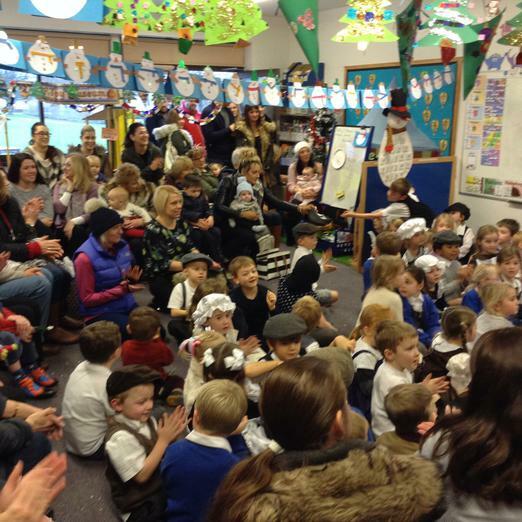 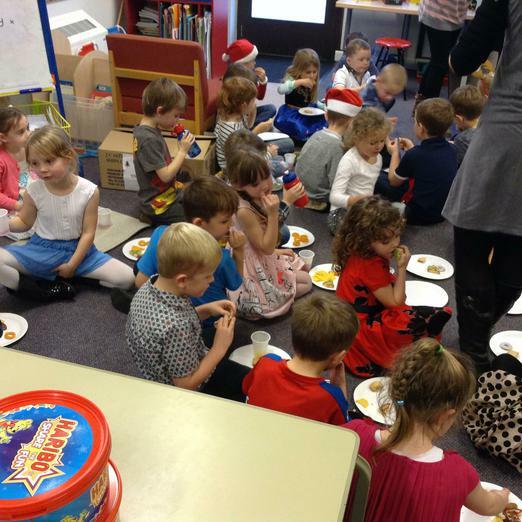 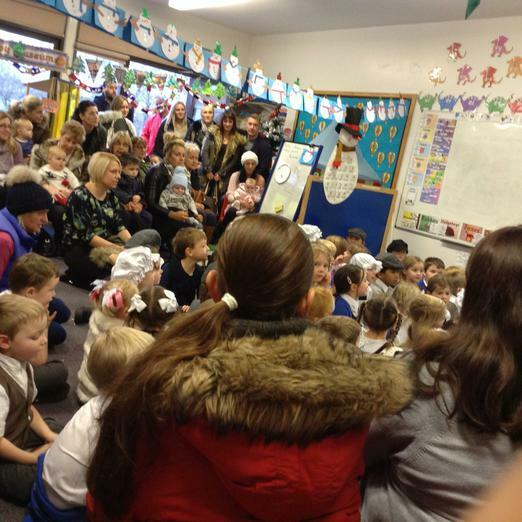 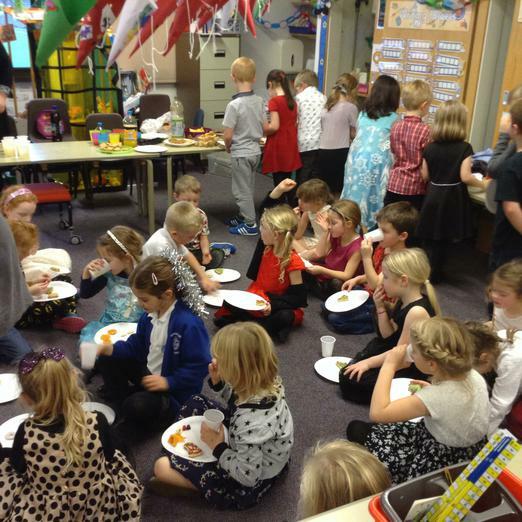 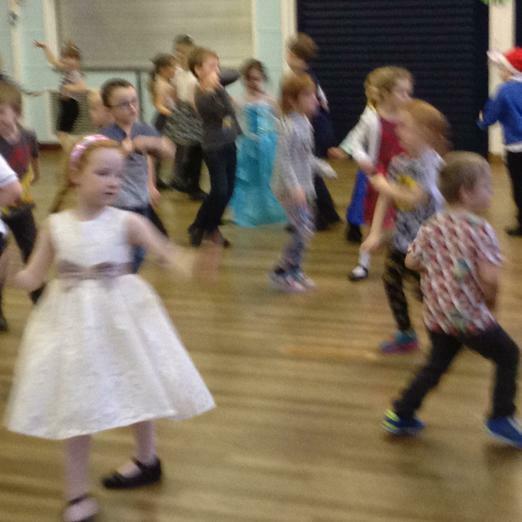 To celebrate Christmas all of year one came together and had a Christmas party. 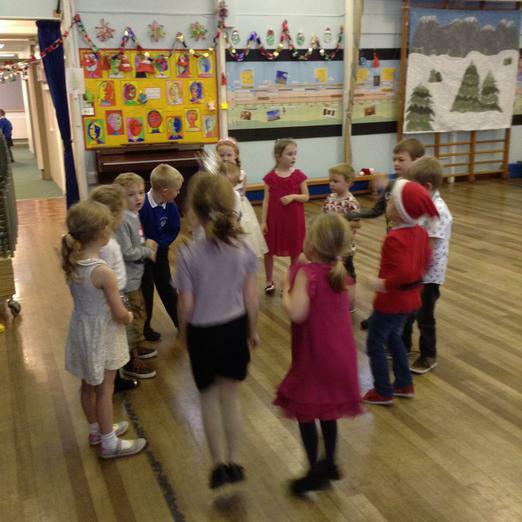 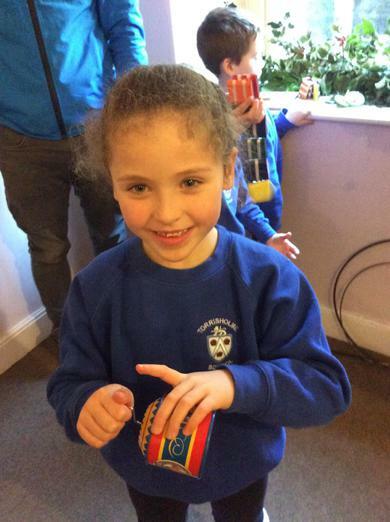 We had lots of fun dancing, playing games and had party food to finish off a great afternoon! 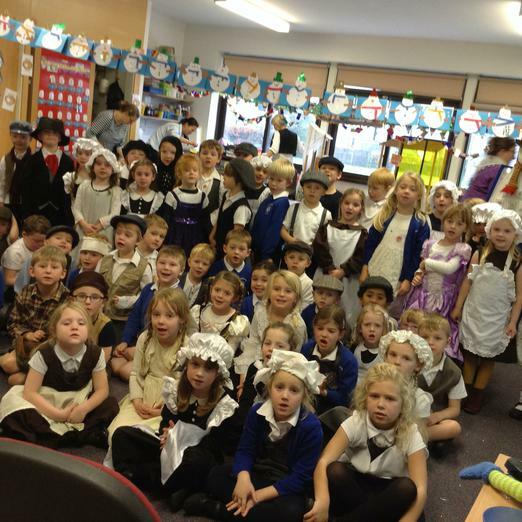 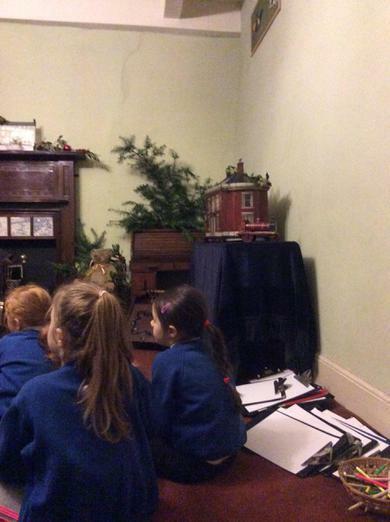 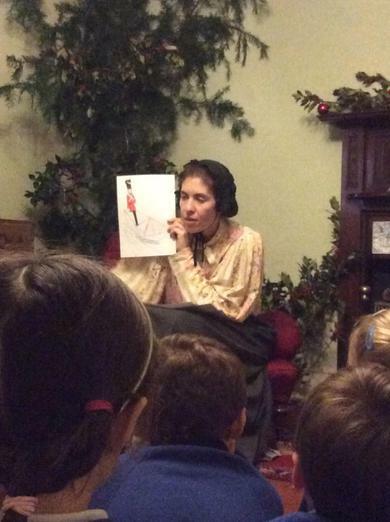 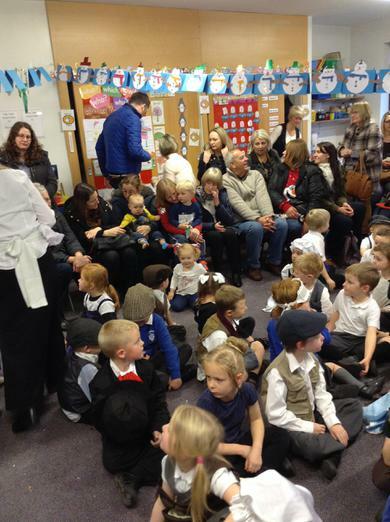 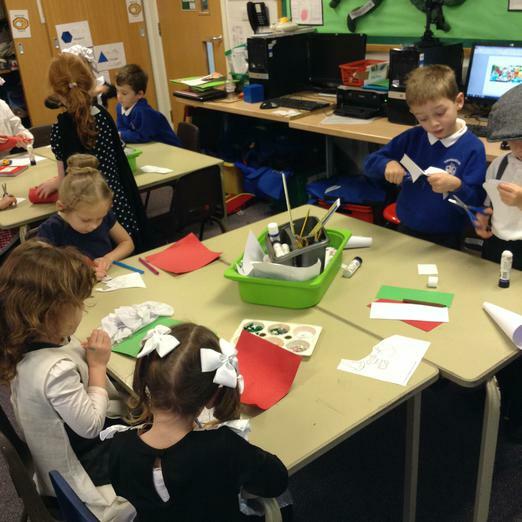 On Monday 14th December we had a Victorian Christmas theme day when we dressed up as Victorians and learned about how the Victorians celebrated Christmas. 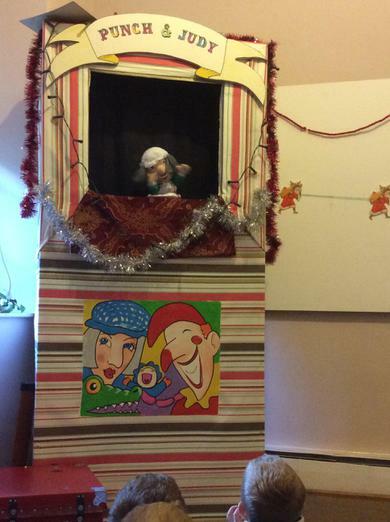 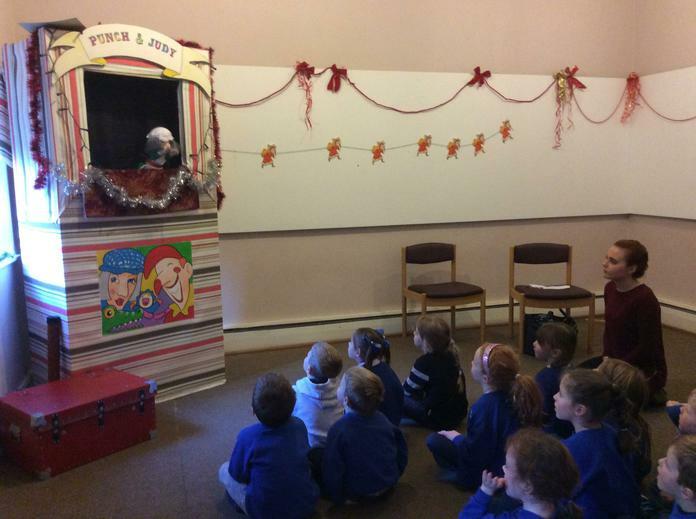 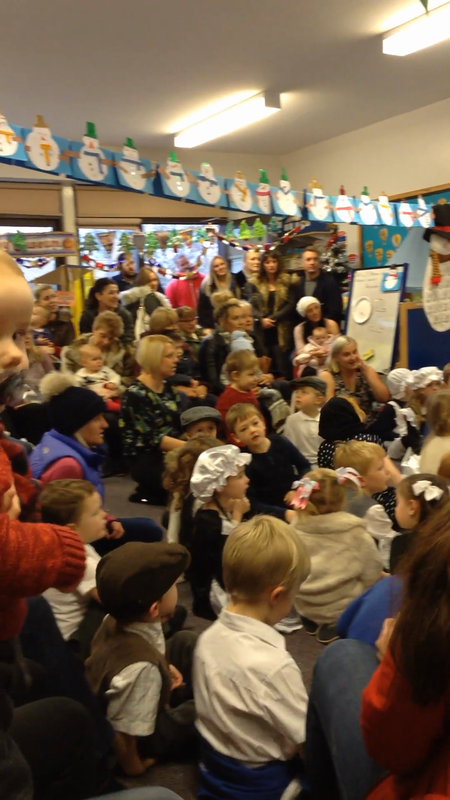 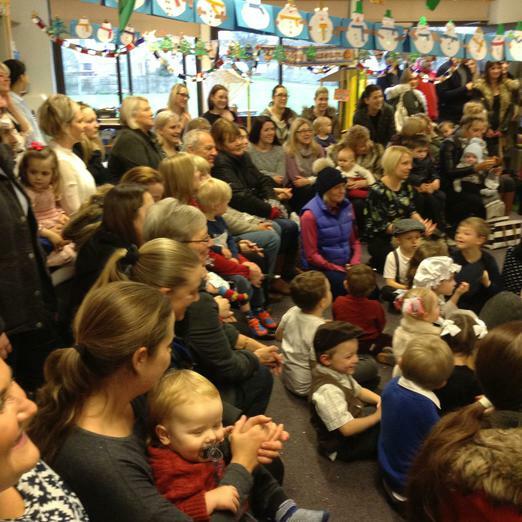 Thank you to everyone that came to the year one Christmas sing along. 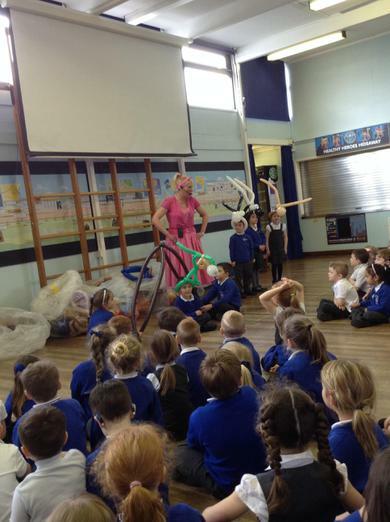 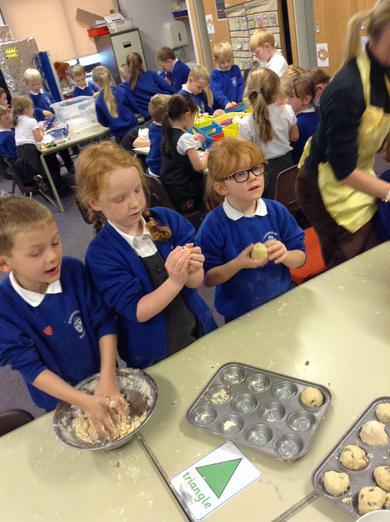 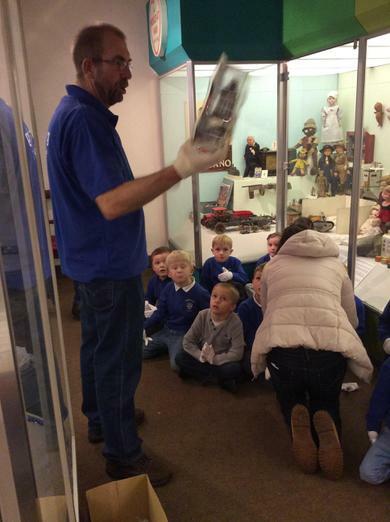 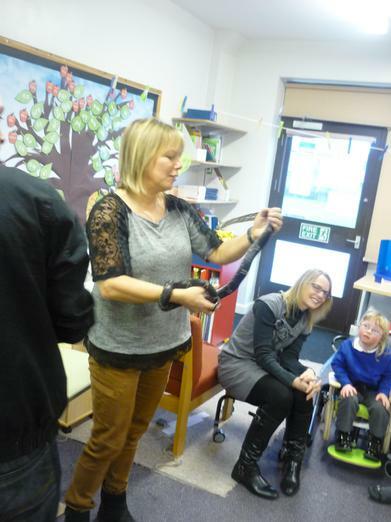 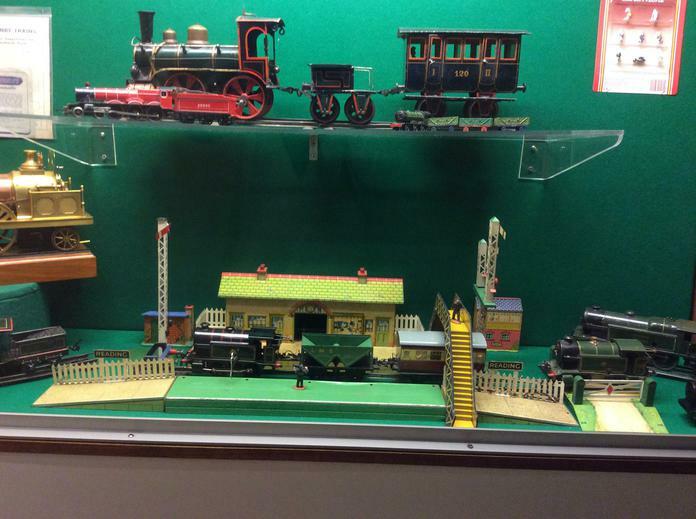 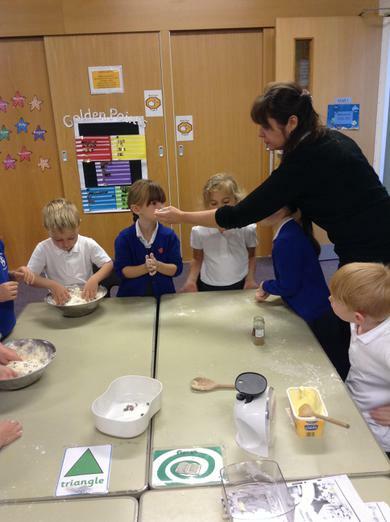 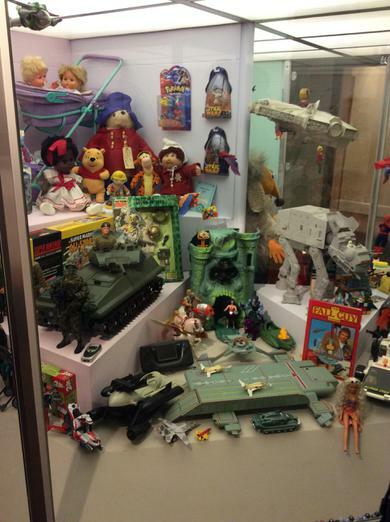 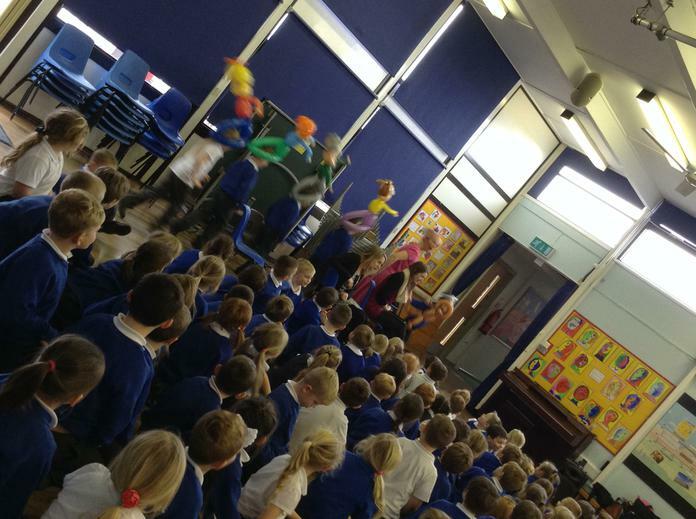 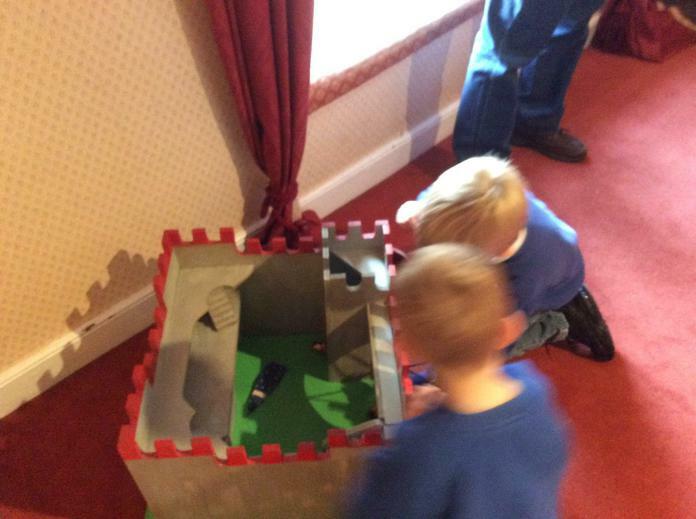 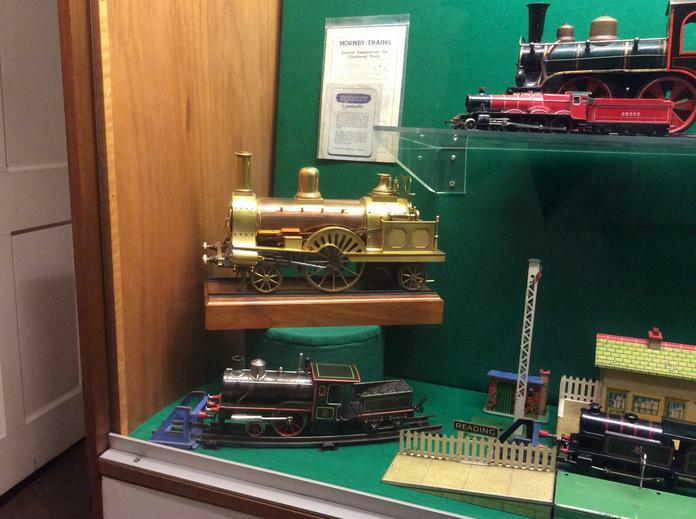 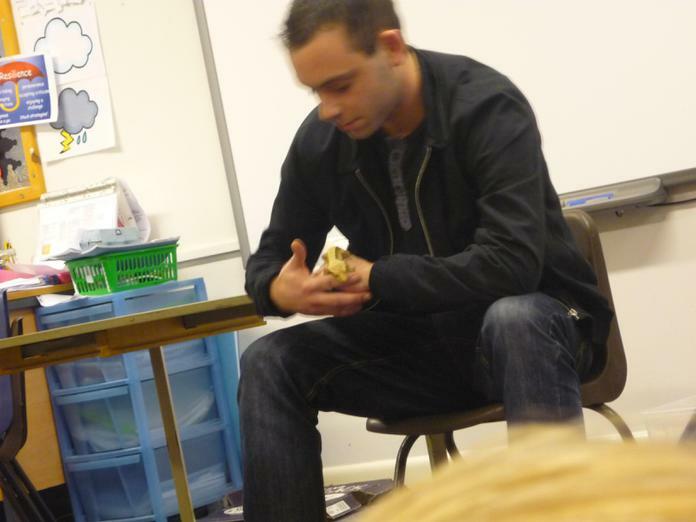 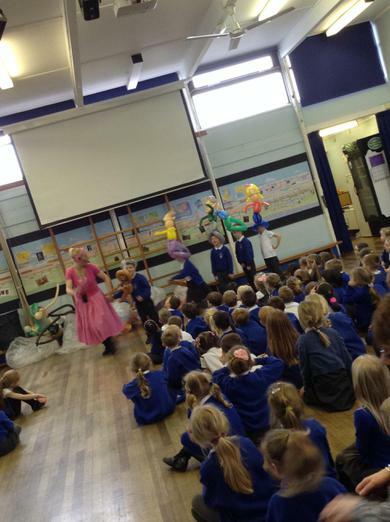 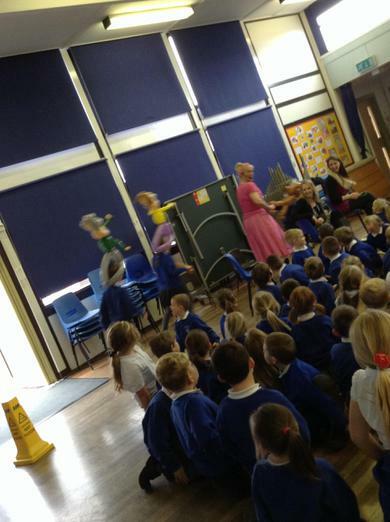 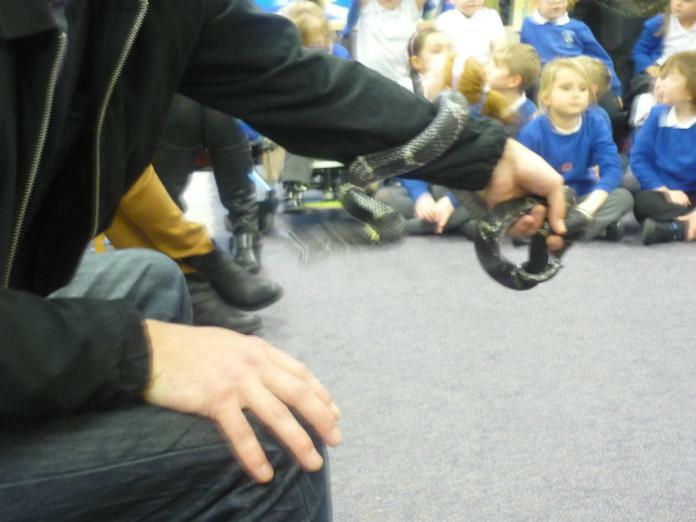 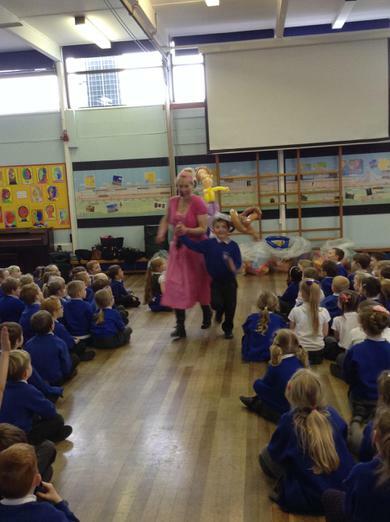 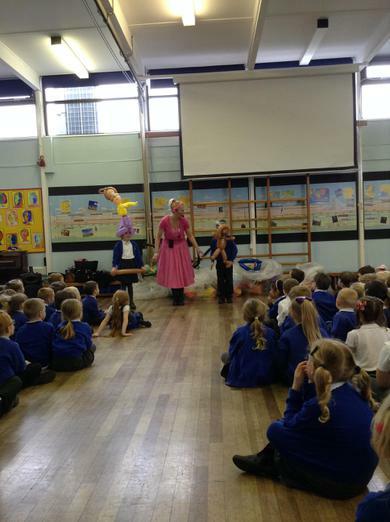 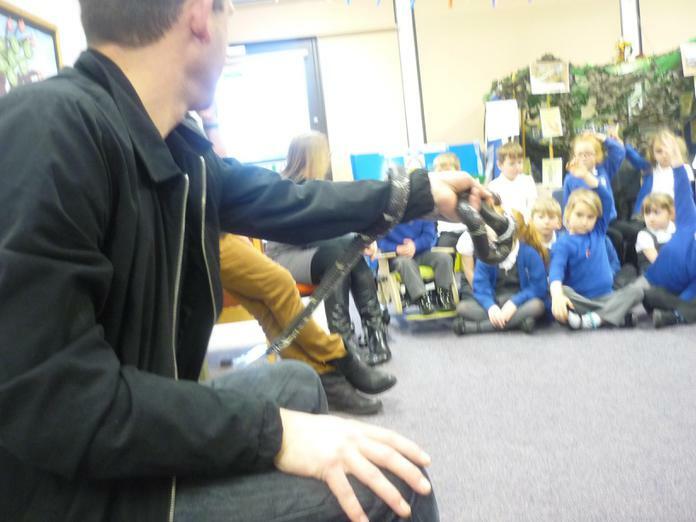 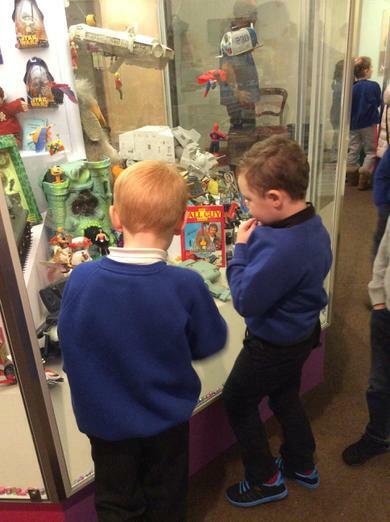 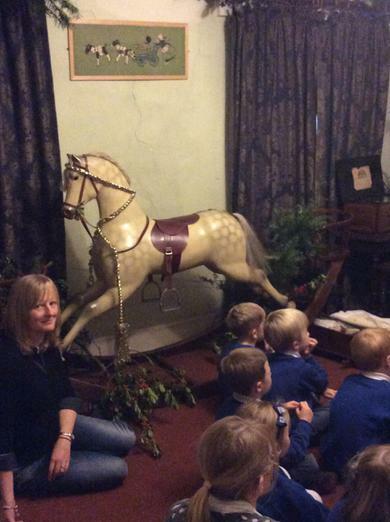 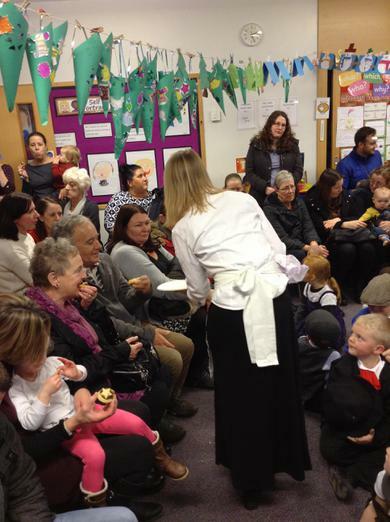 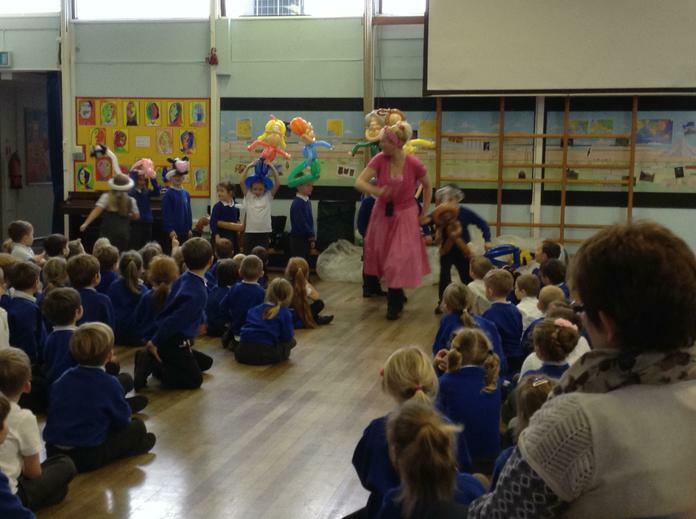 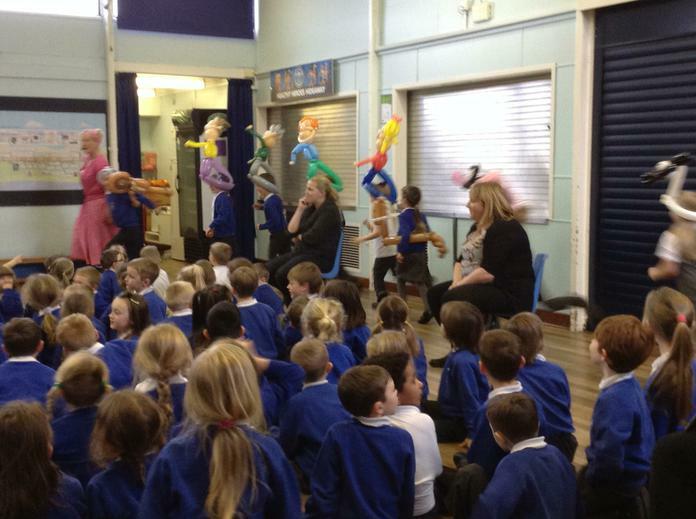 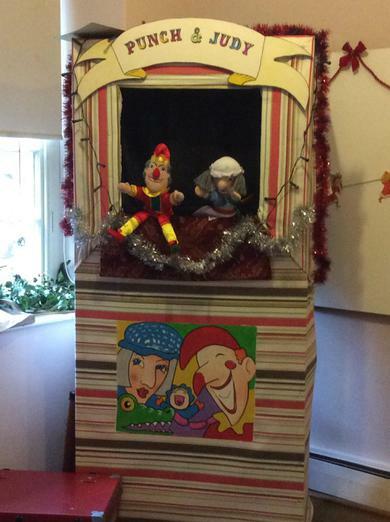 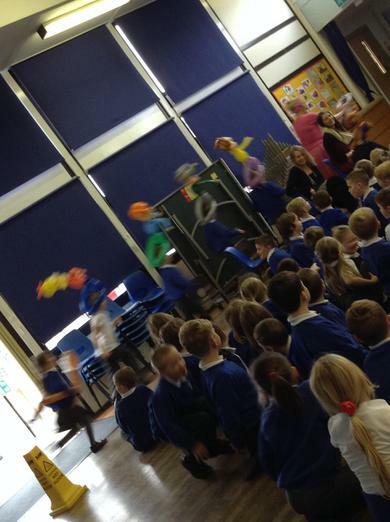 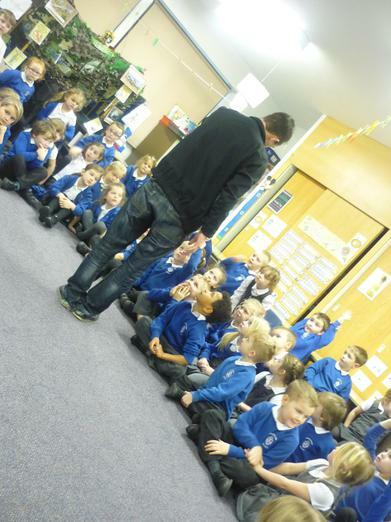 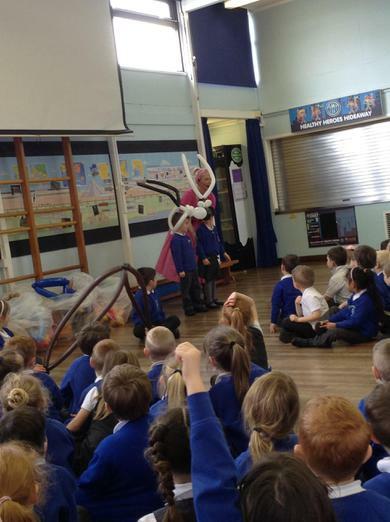 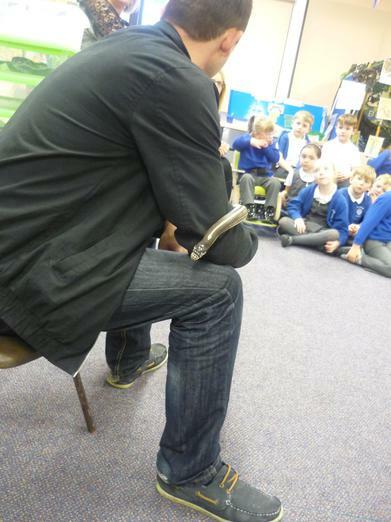 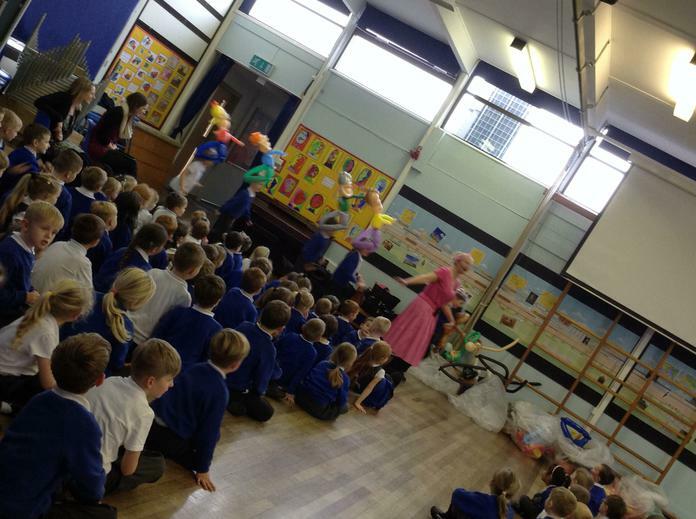 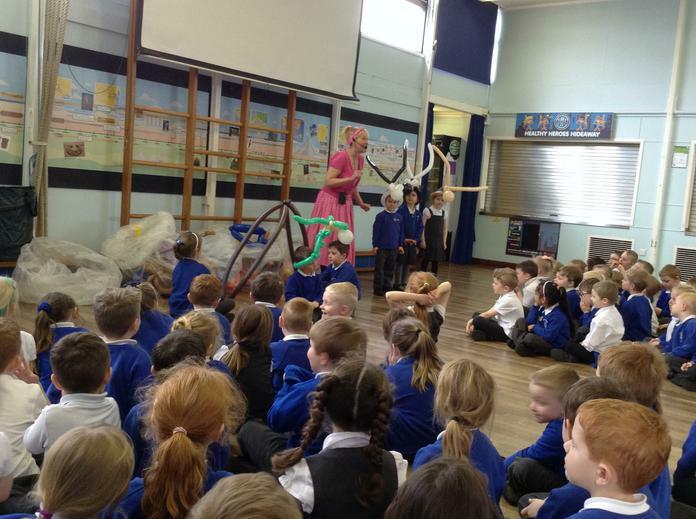 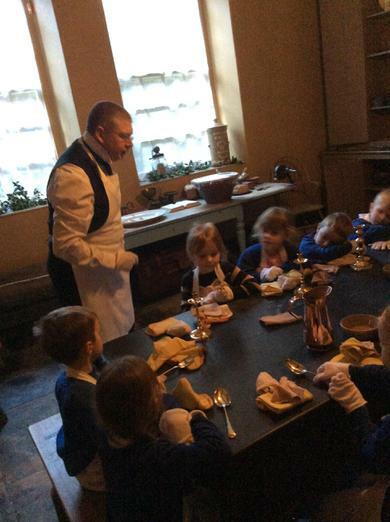 The children and staff really enjoyed it and we hoped you did too! 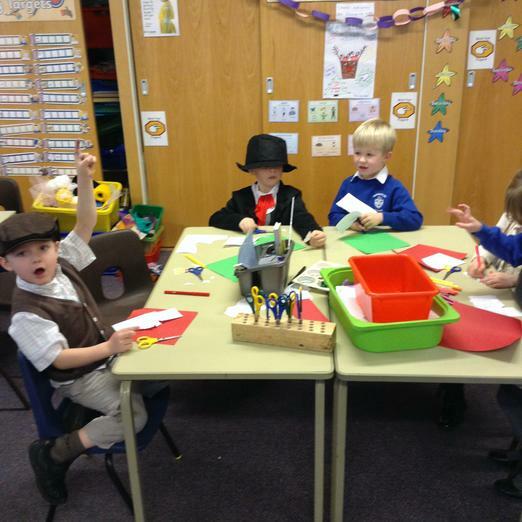 Thank you for all the effort you went to for the Victorian day, the outfits were fantastic! 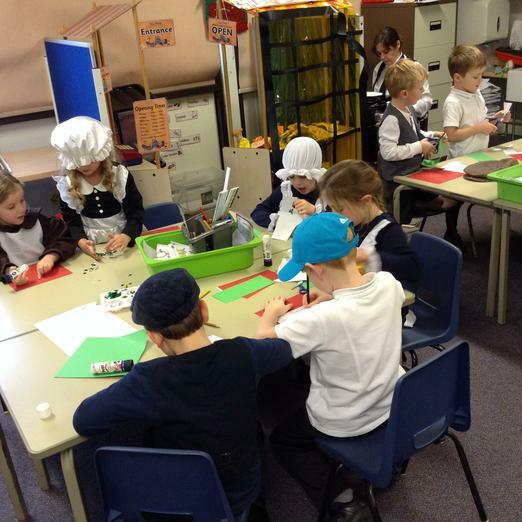 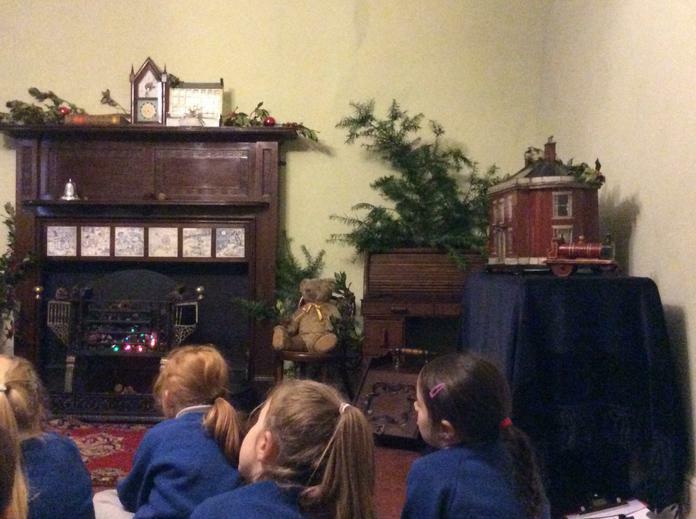 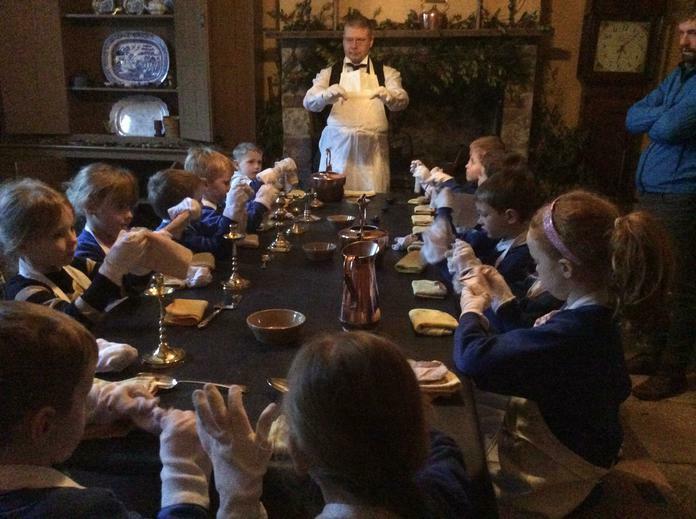 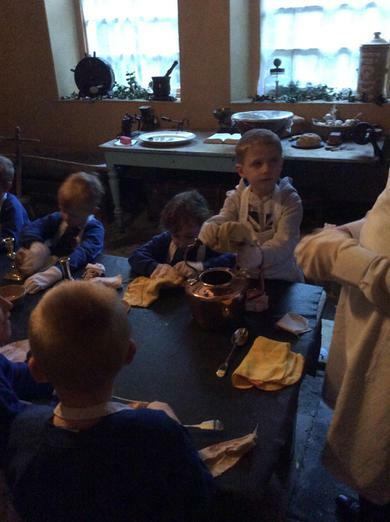 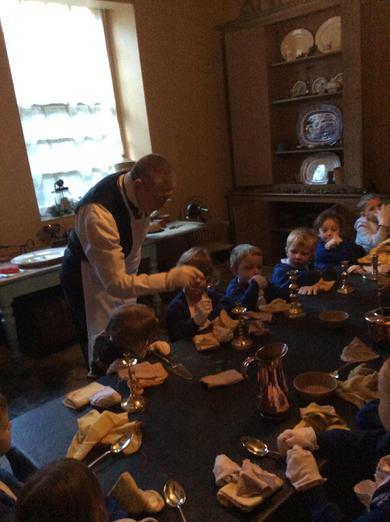 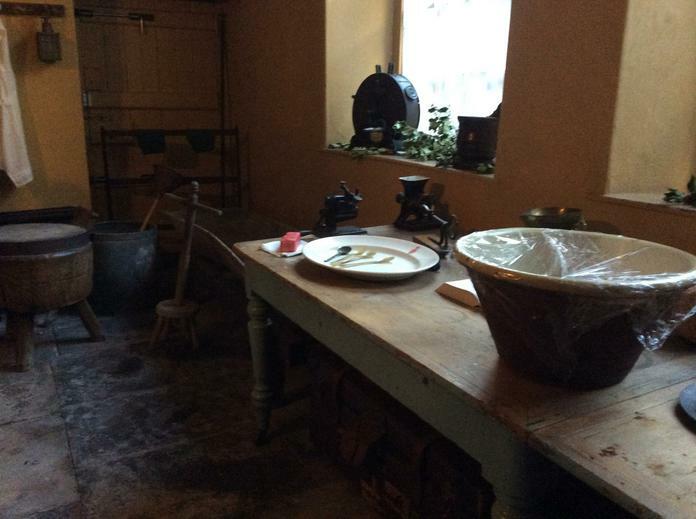 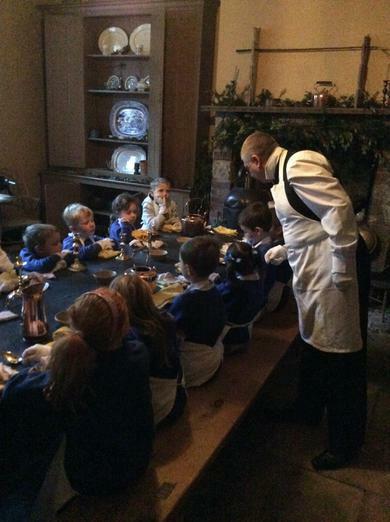 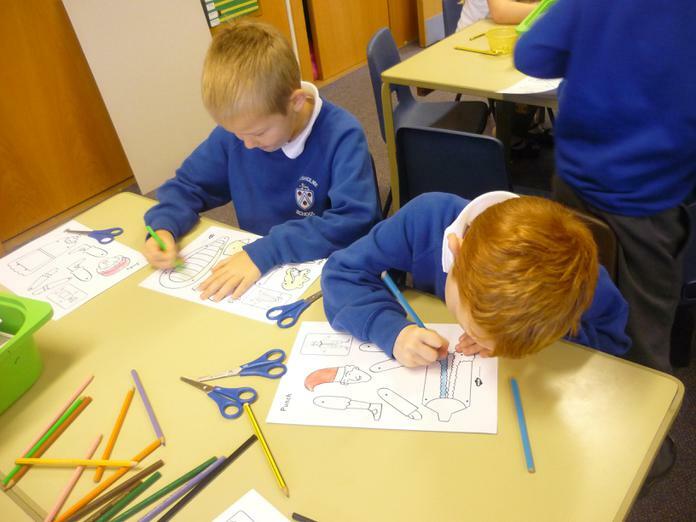 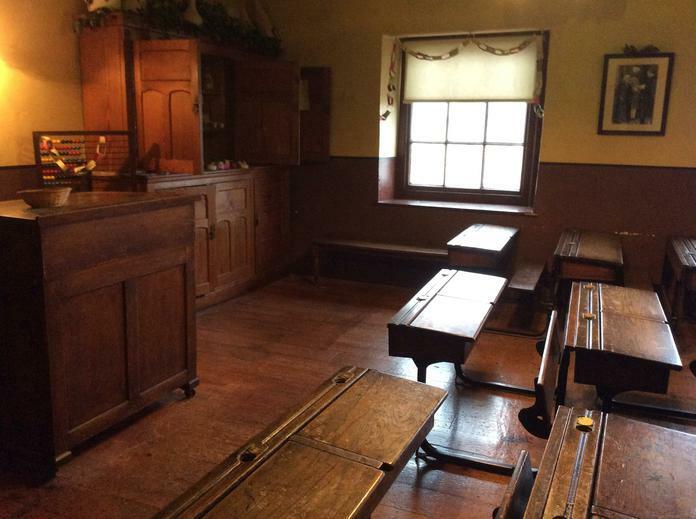 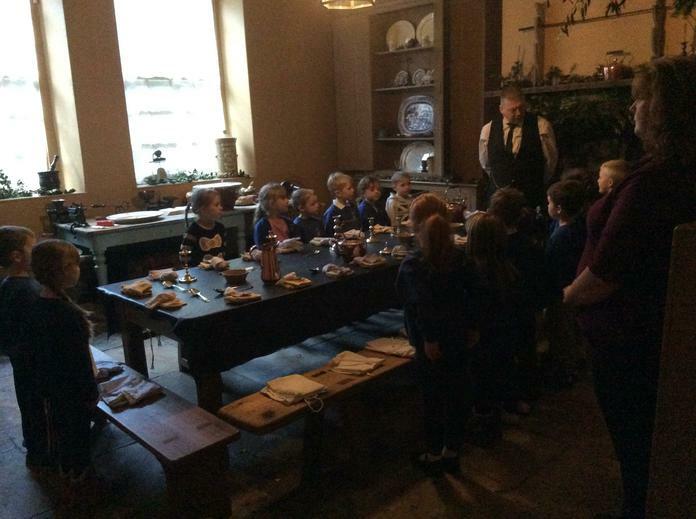 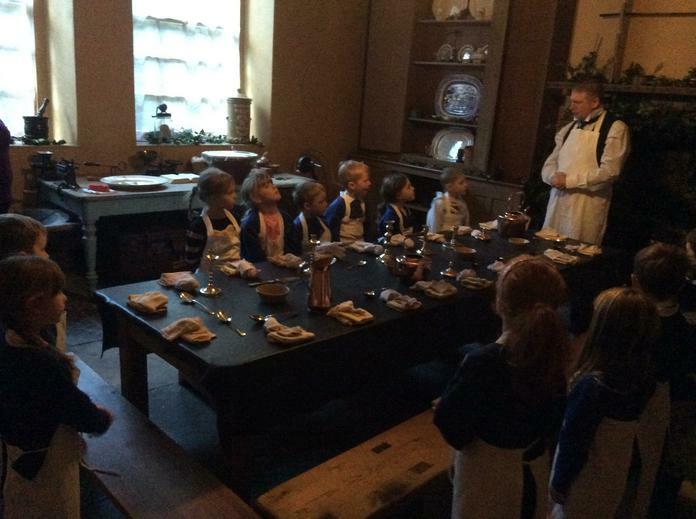 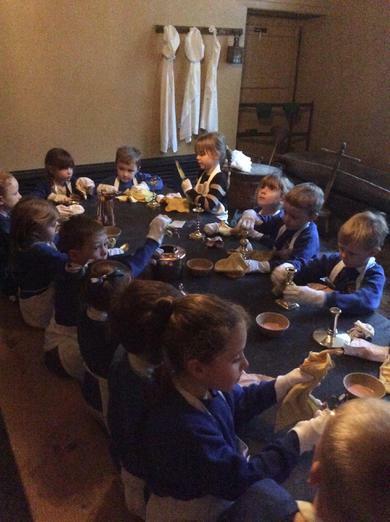 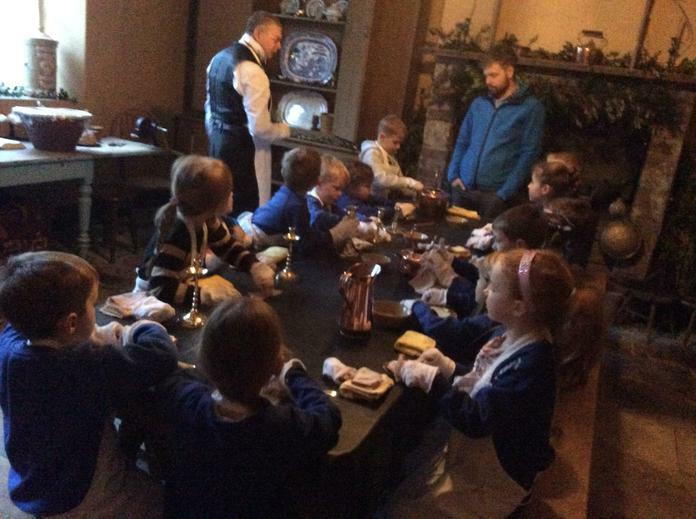 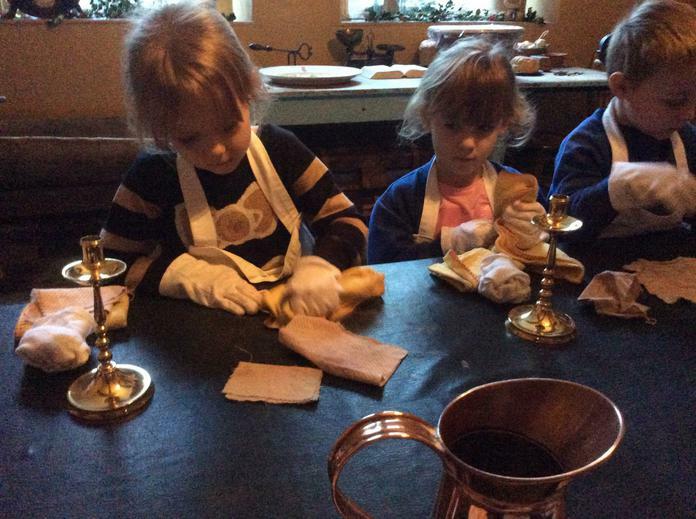 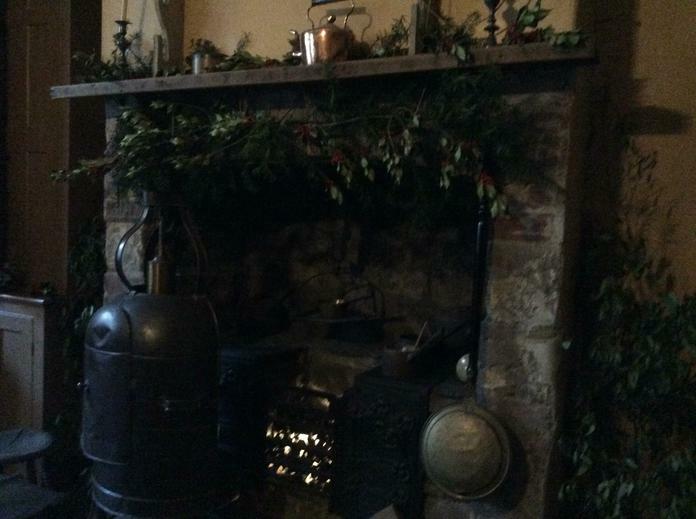 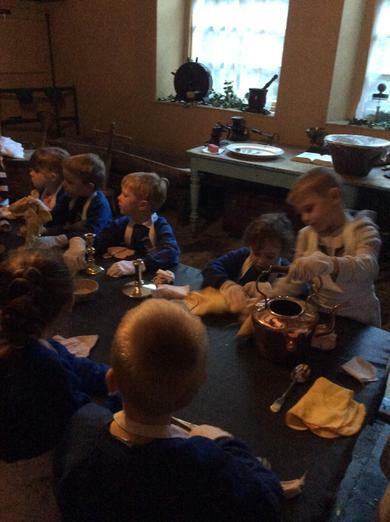 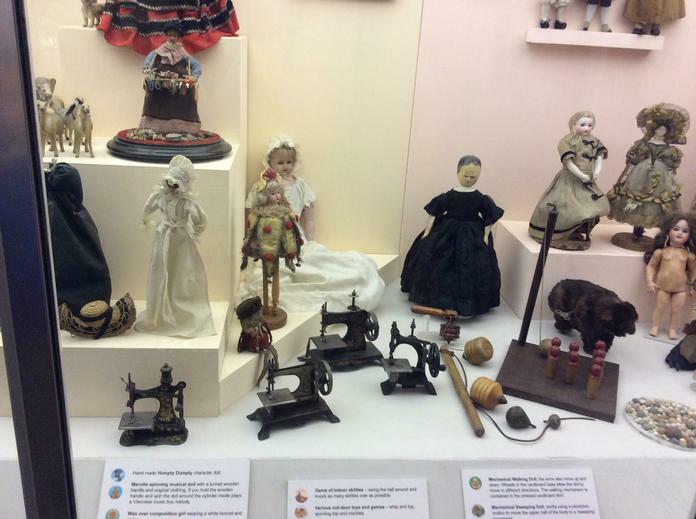 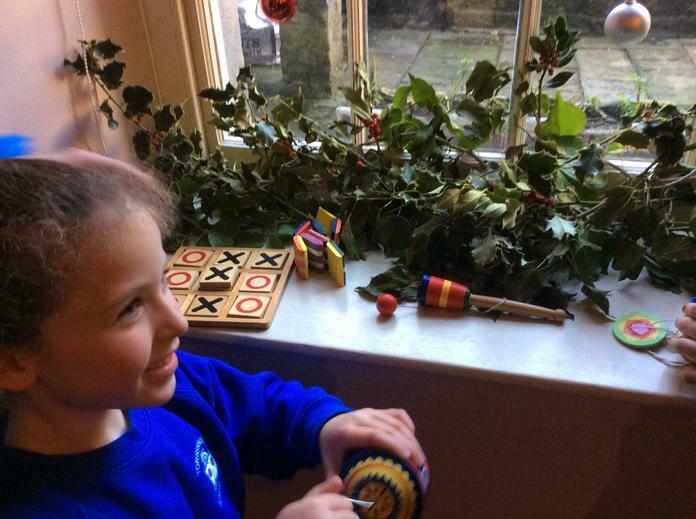 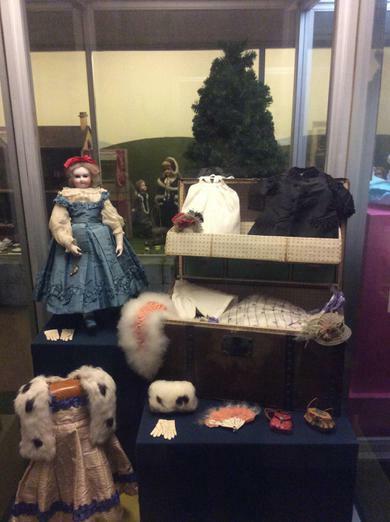 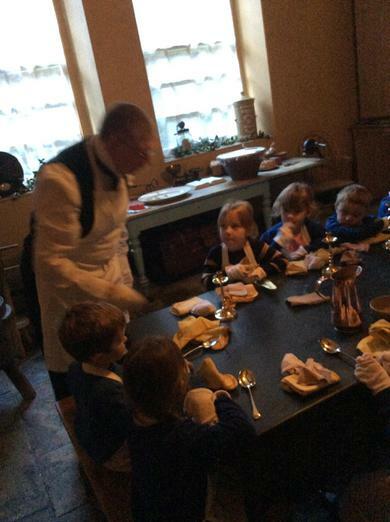 We had a great day, learning about the history of Victorian Christmas and making Victorian Christmas crafts and toys such as peg dolls, Christmas tress and cornucopias. 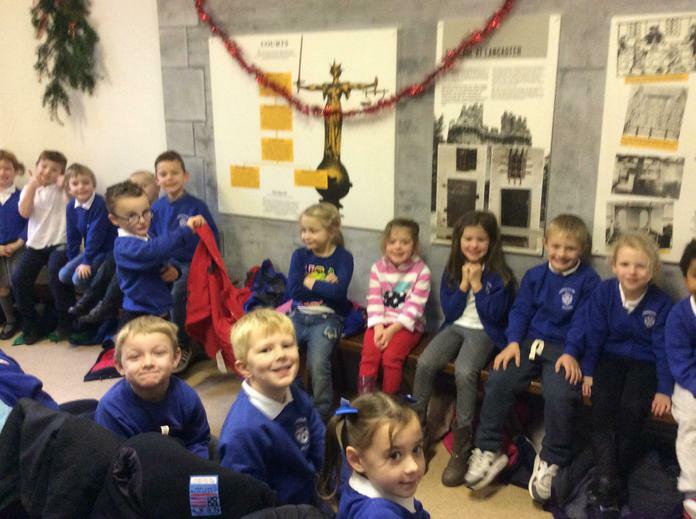 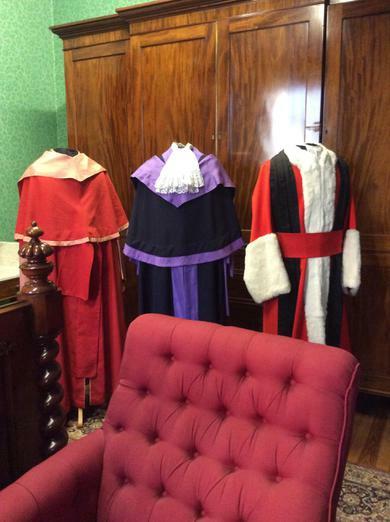 We had a fantastic trip to the Judges' Lodgings. 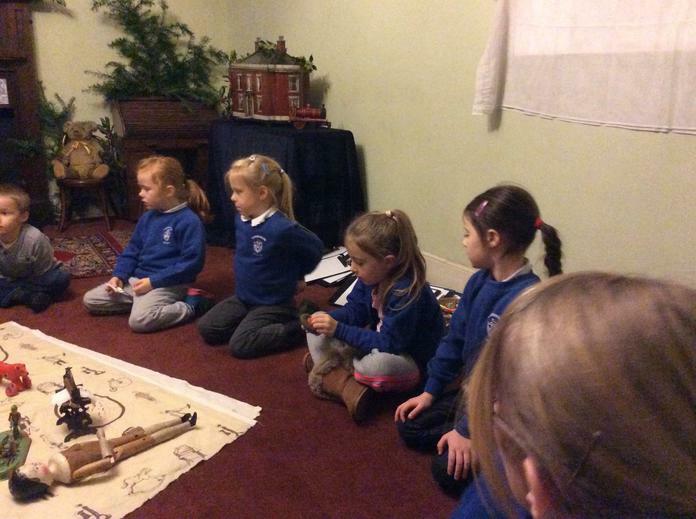 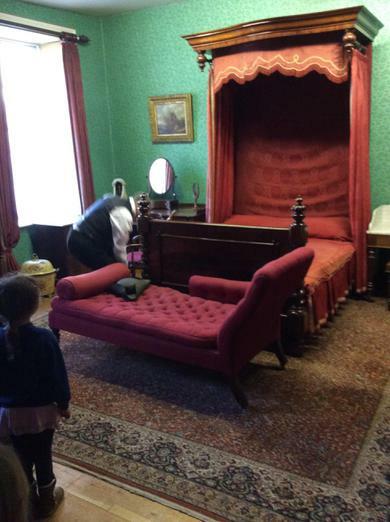 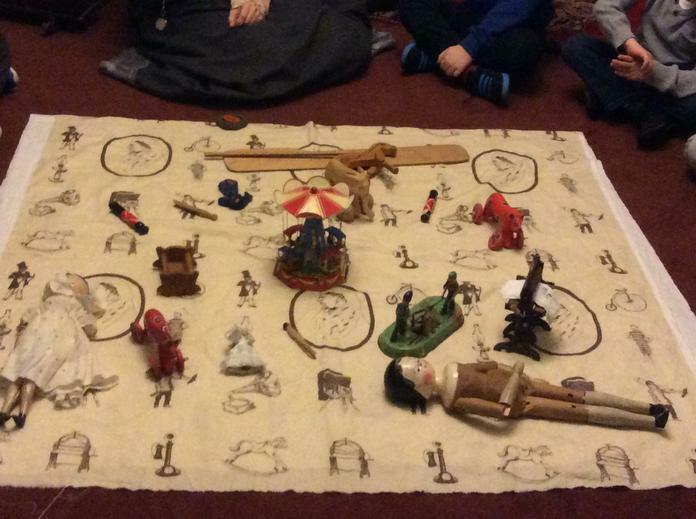 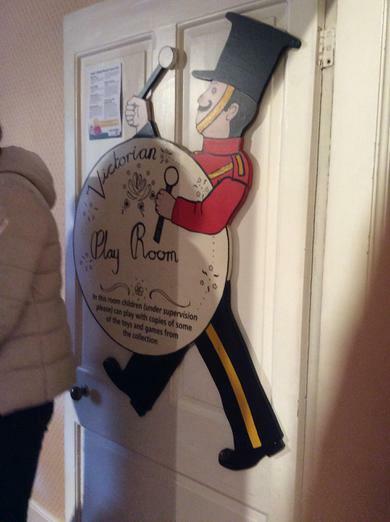 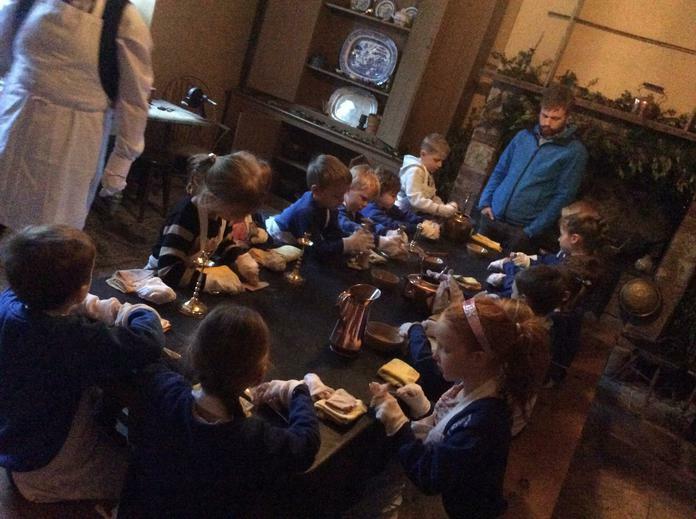 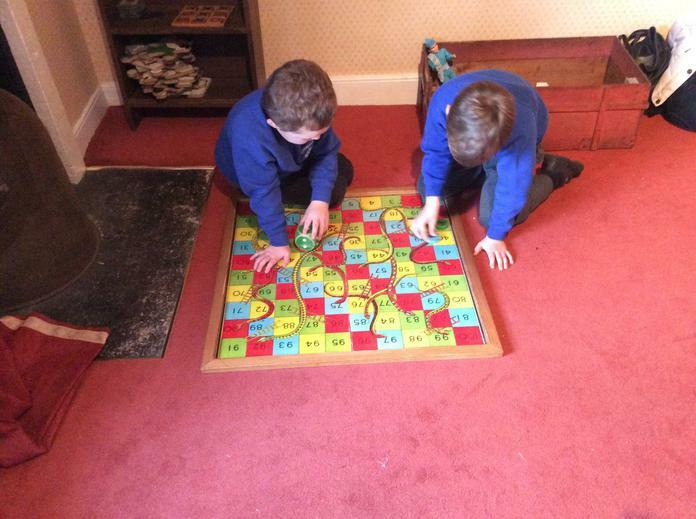 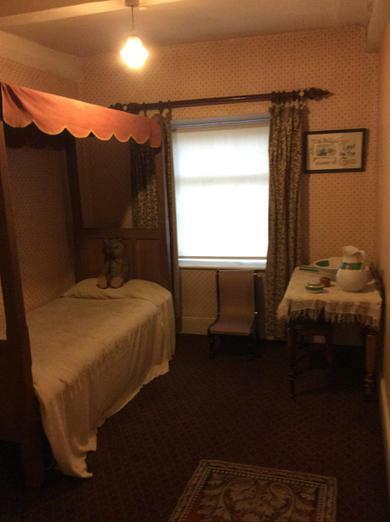 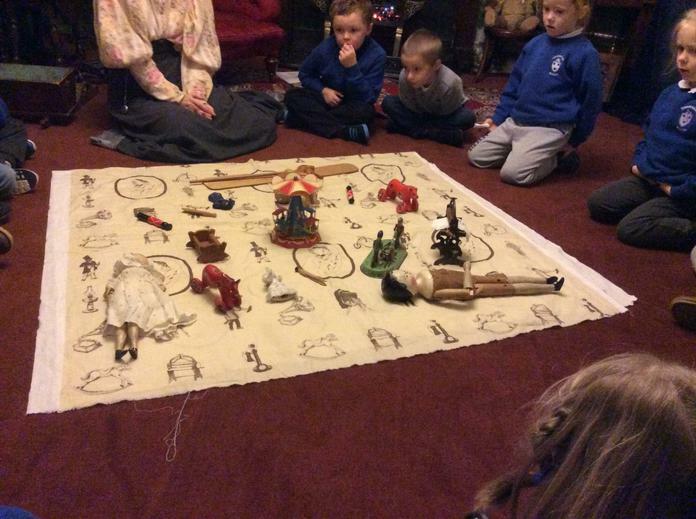 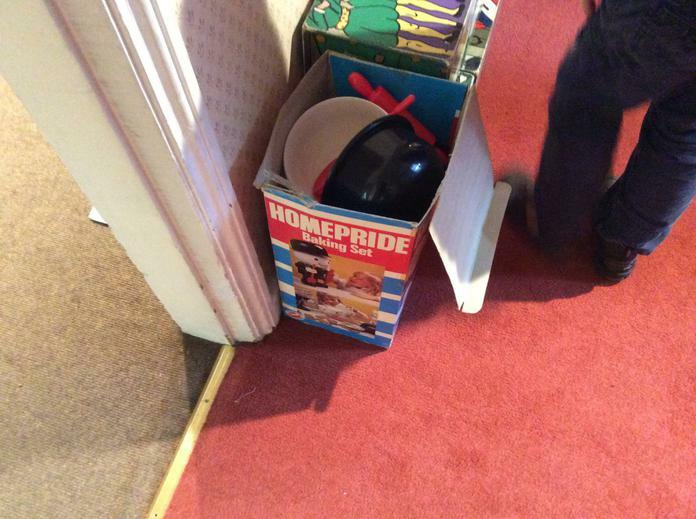 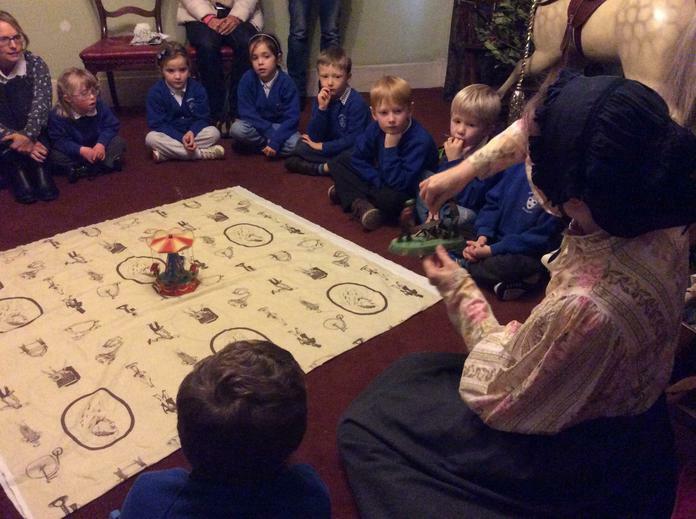 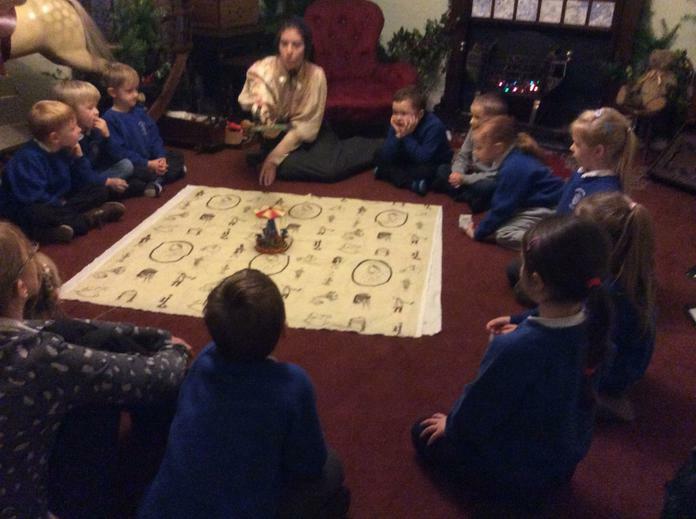 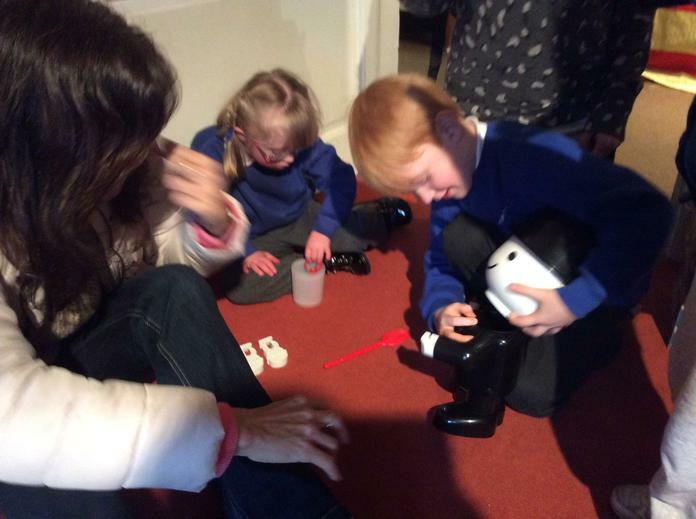 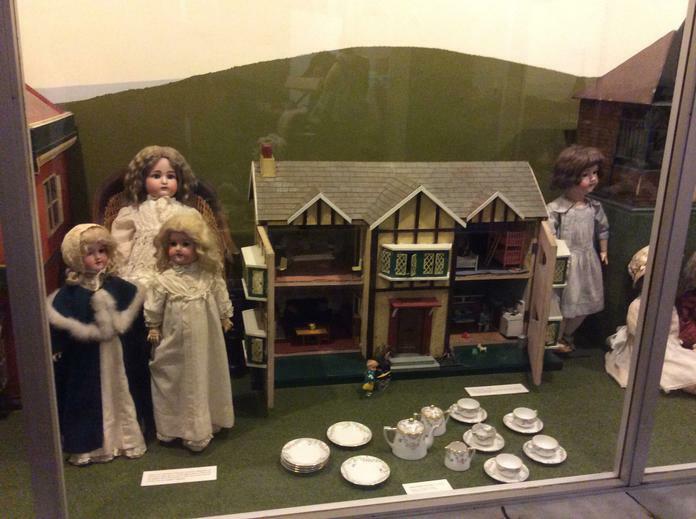 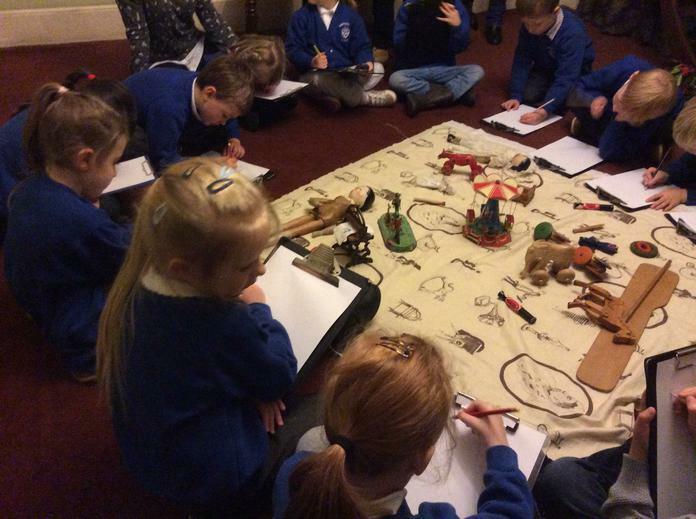 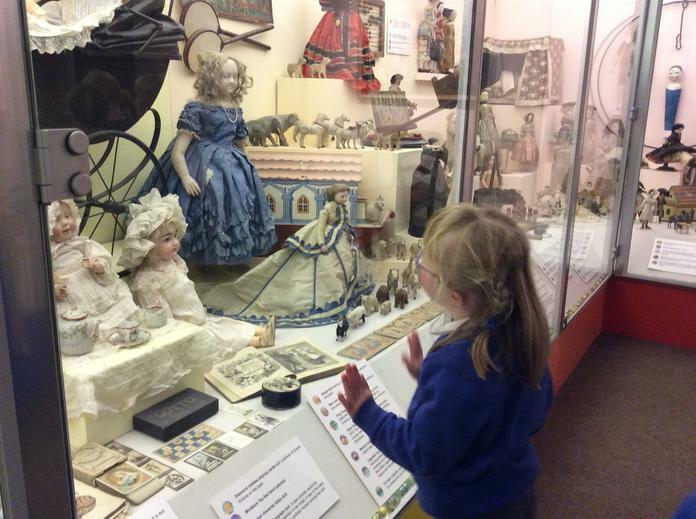 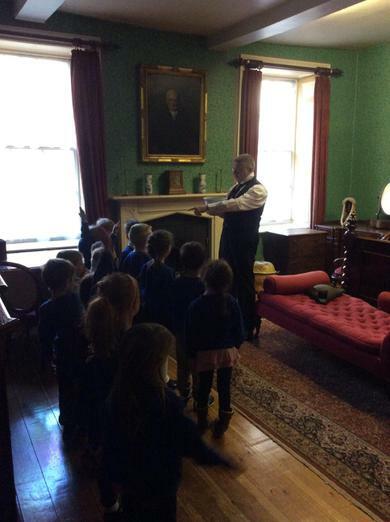 We learnt about toys from the past 200 years, we played parlour games, we heard traditional tales and learnt how Victorian servants lived. 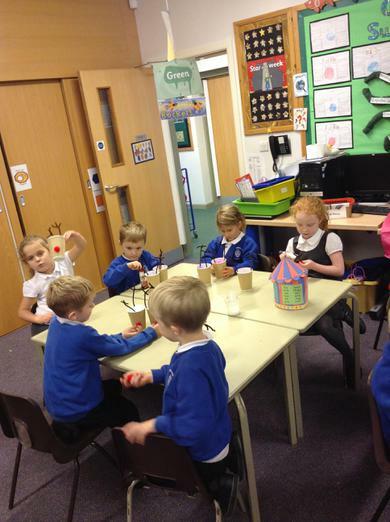 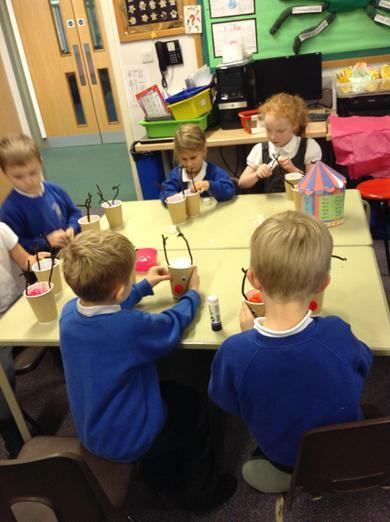 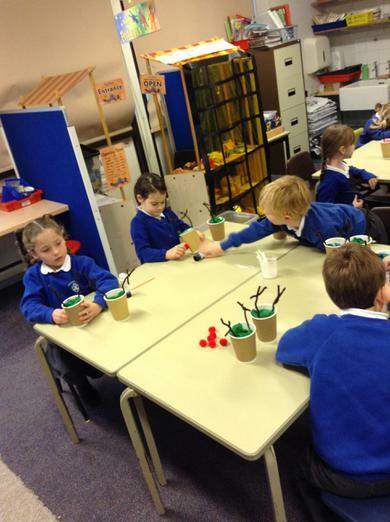 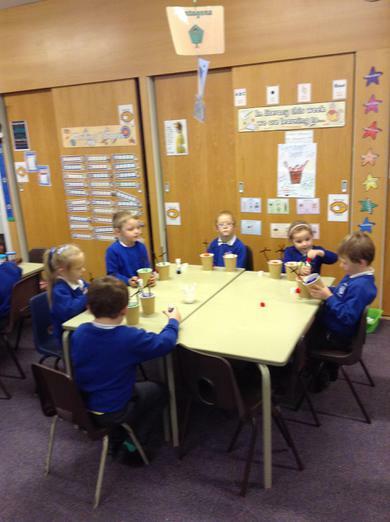 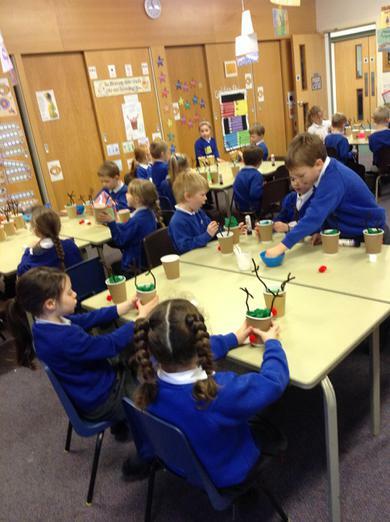 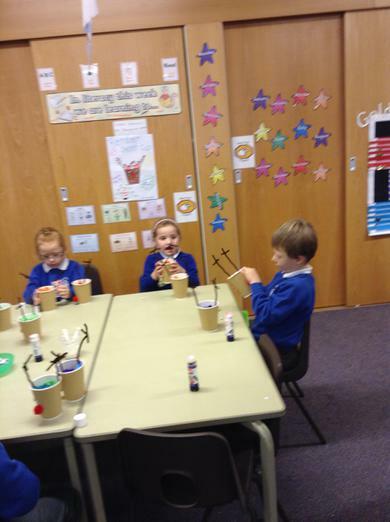 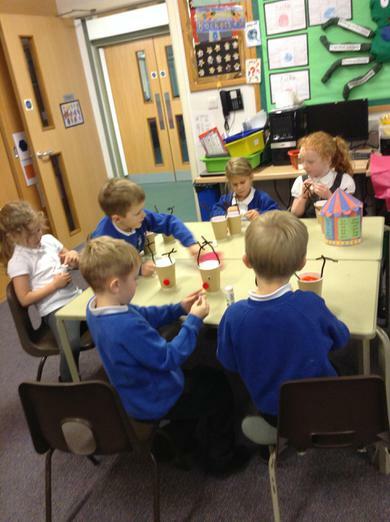 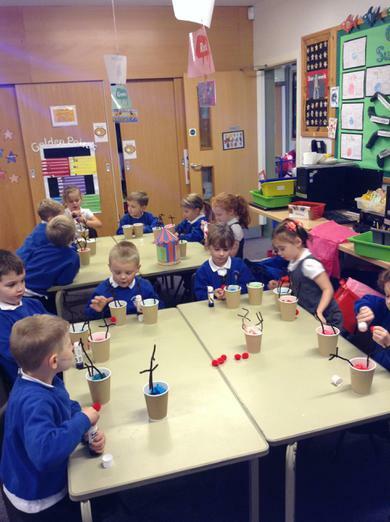 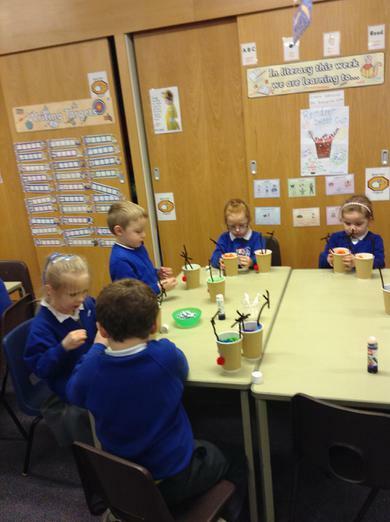 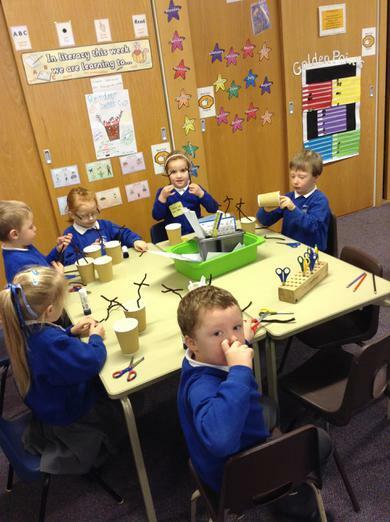 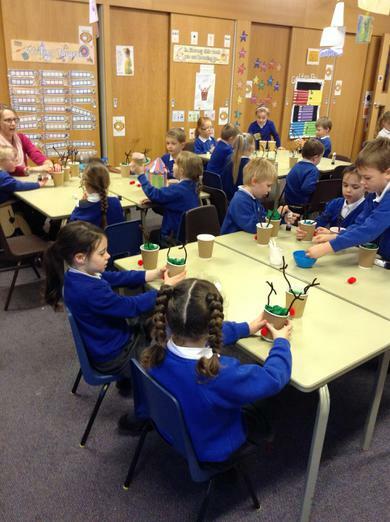 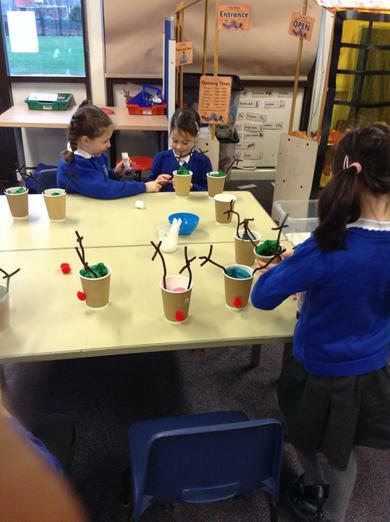 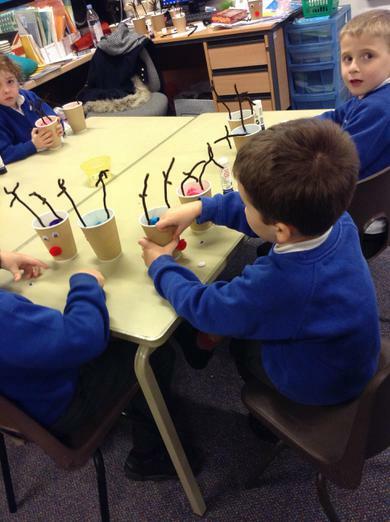 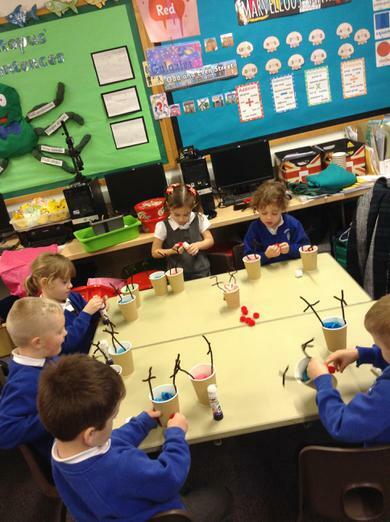 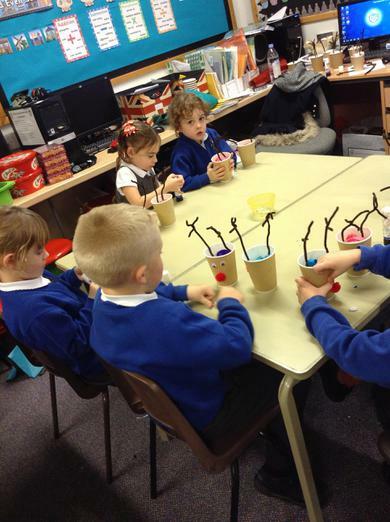 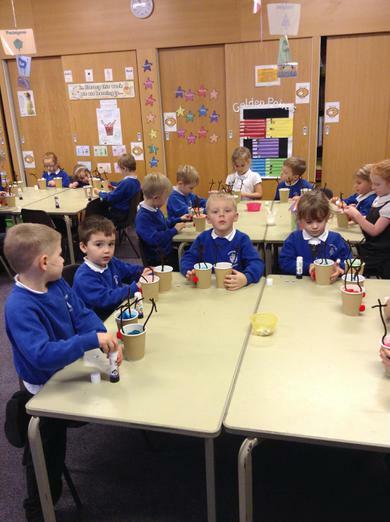 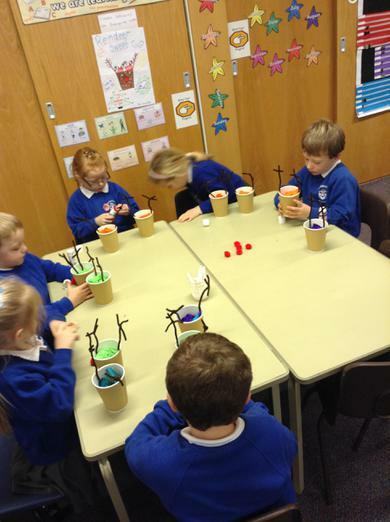 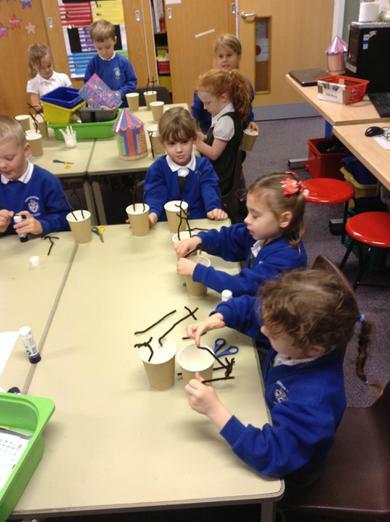 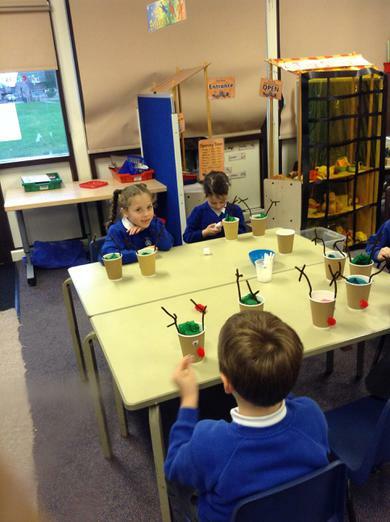 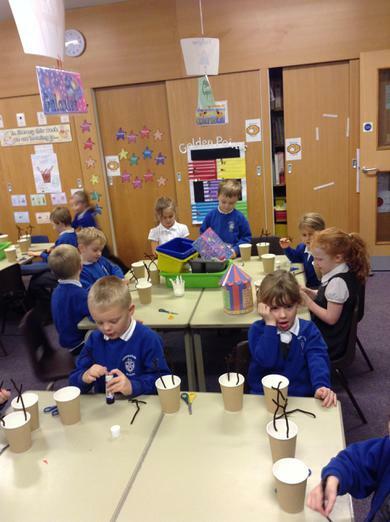 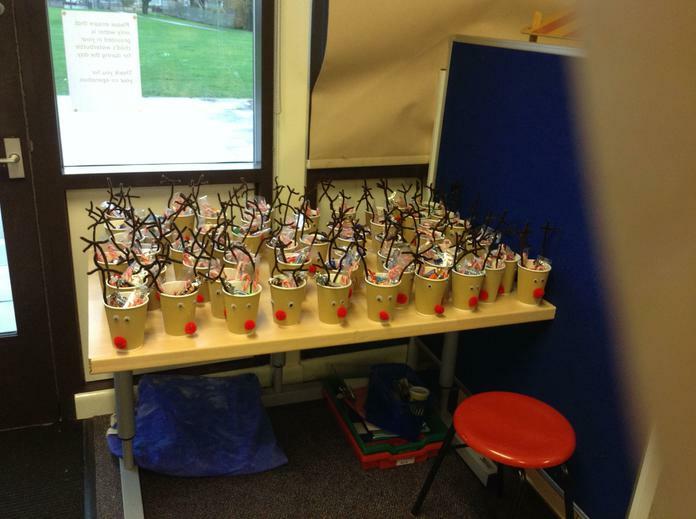 We really enjoyed making Reindeer sweet cups for the Christmas fair. 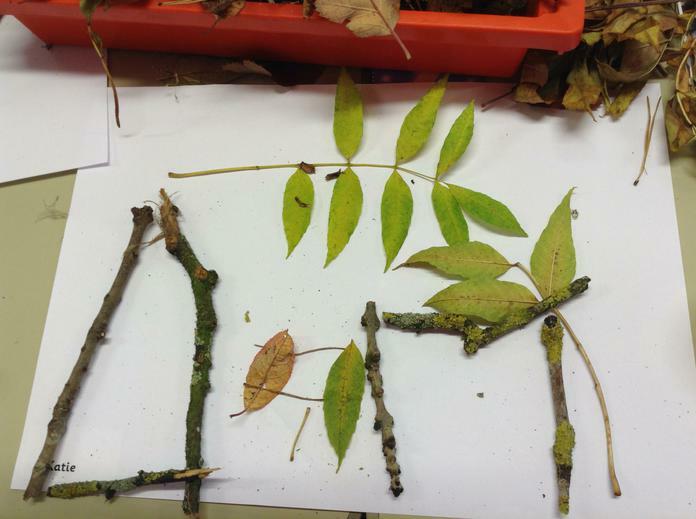 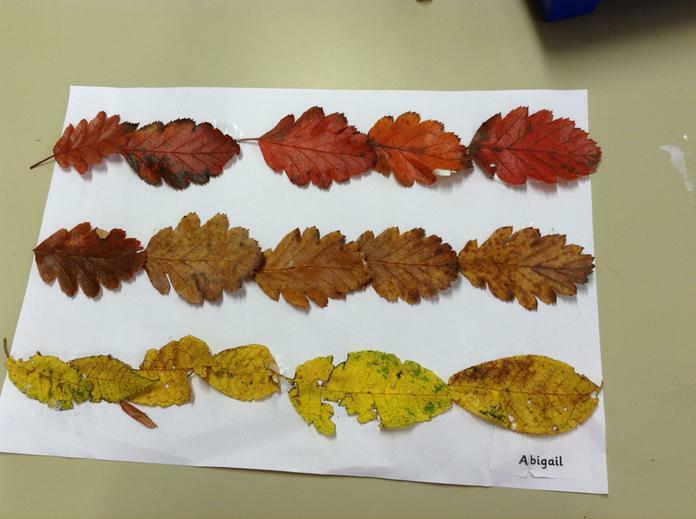 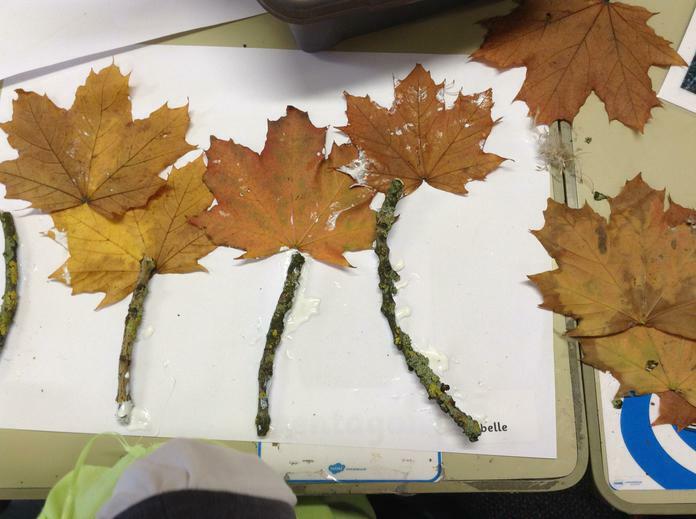 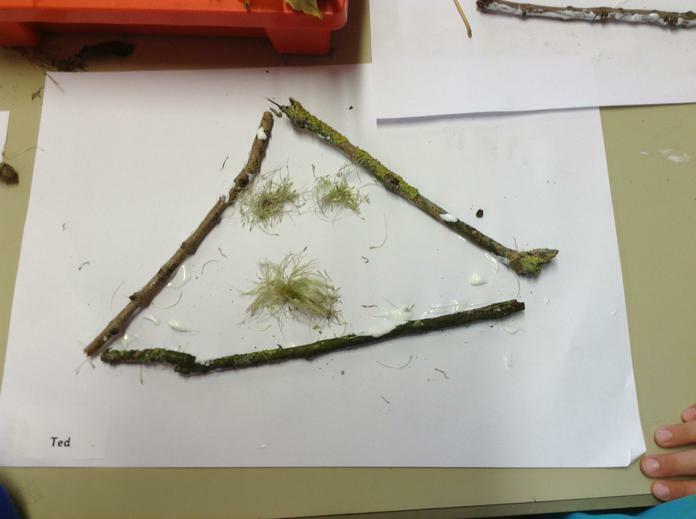 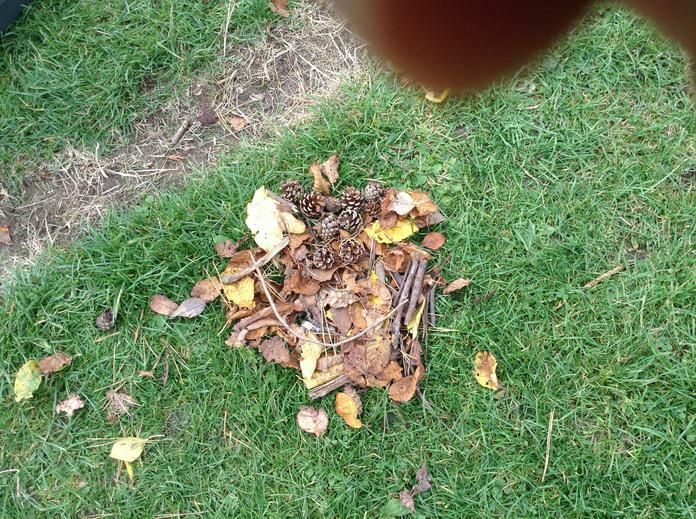 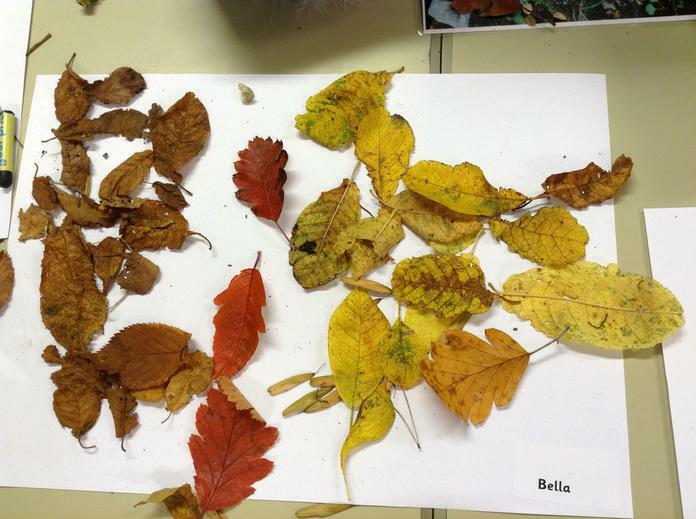 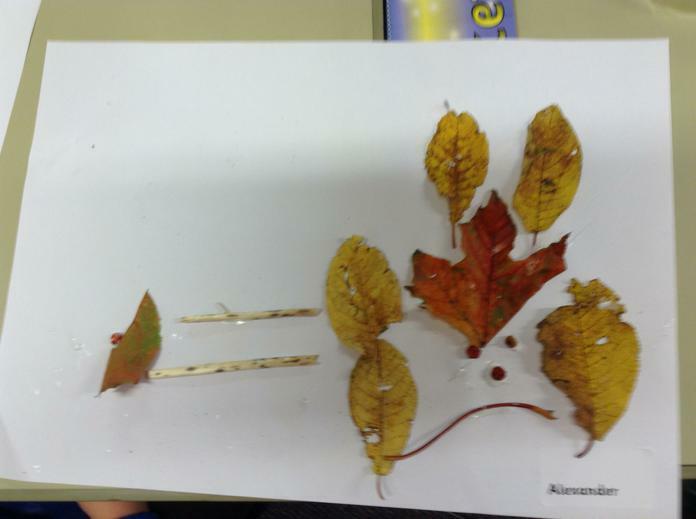 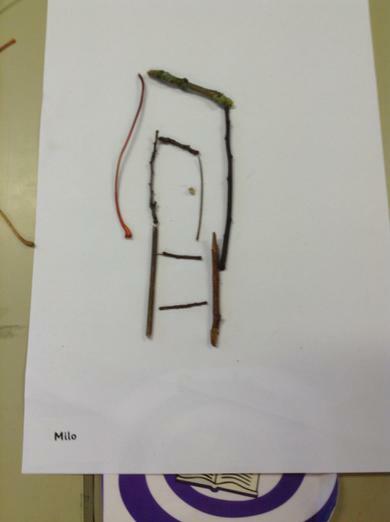 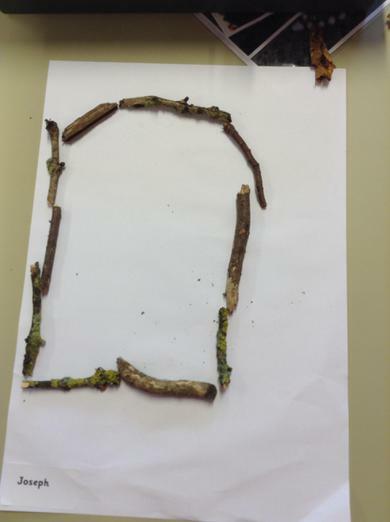 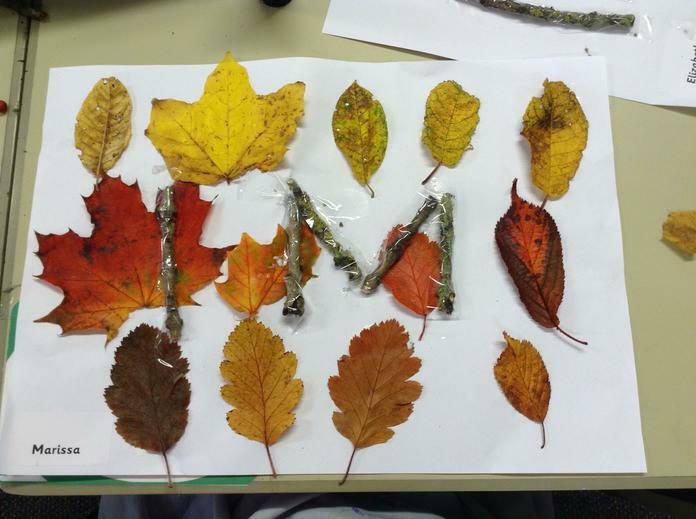 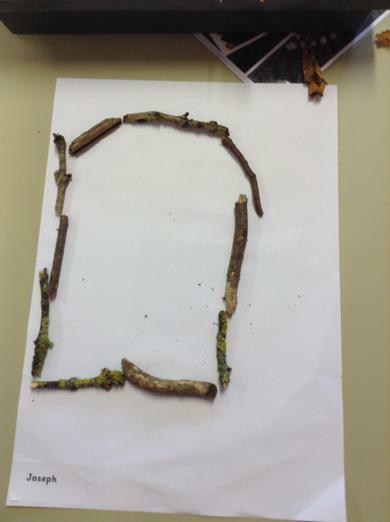 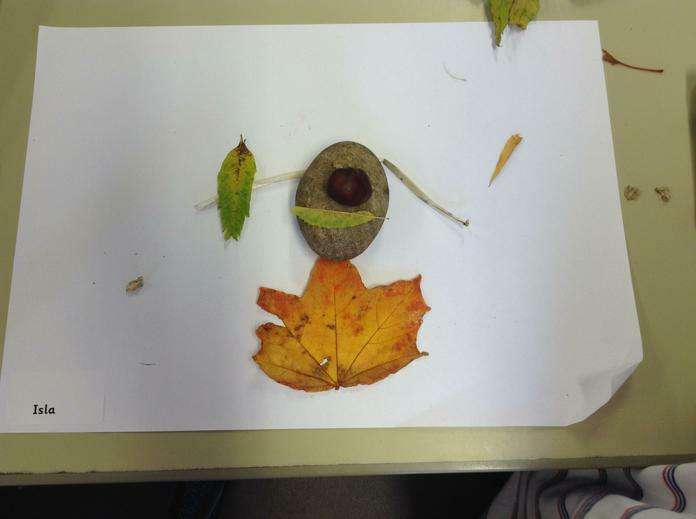 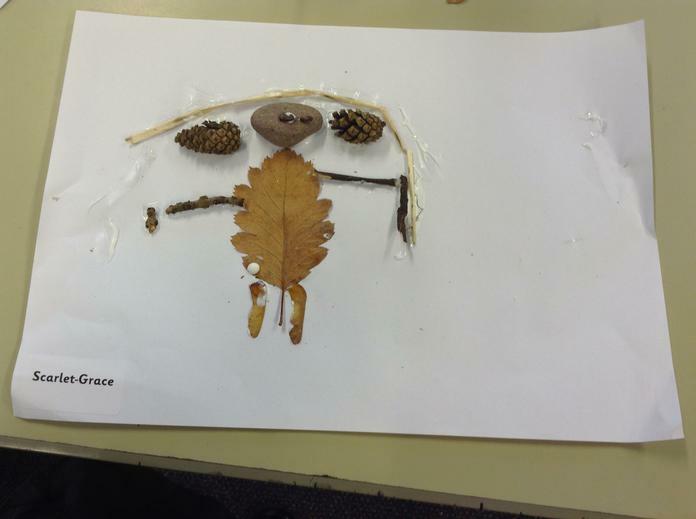 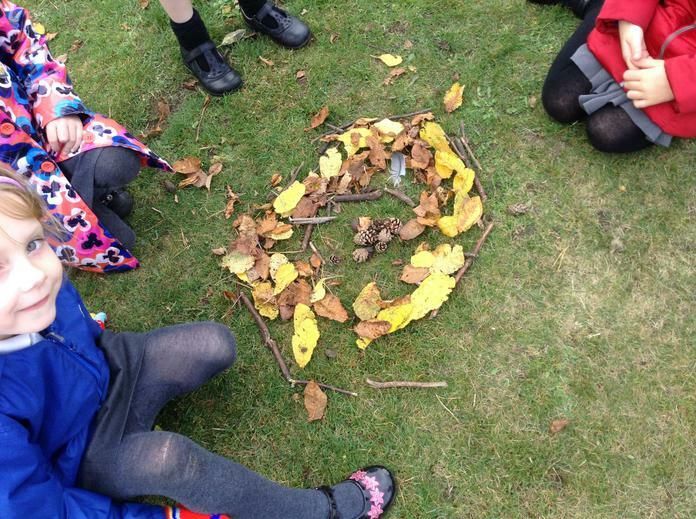 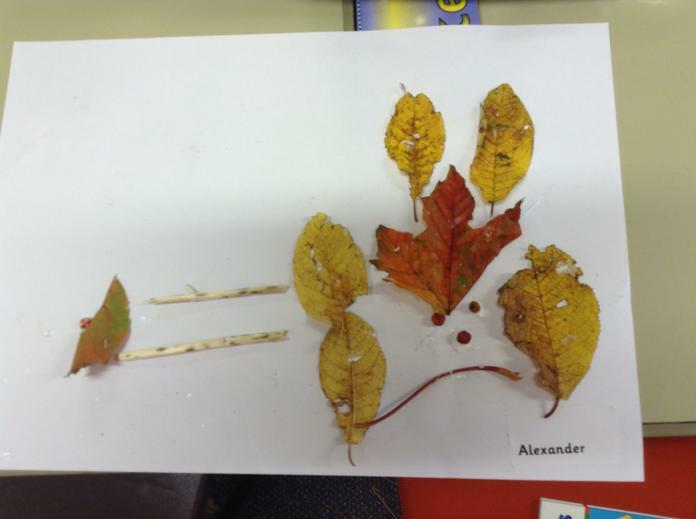 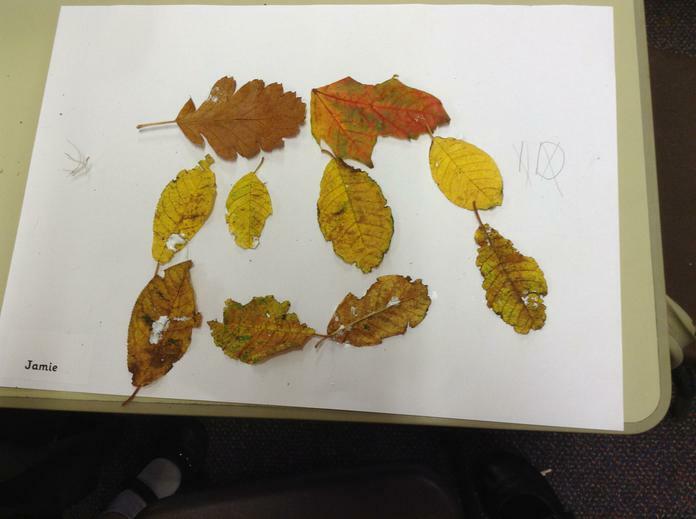 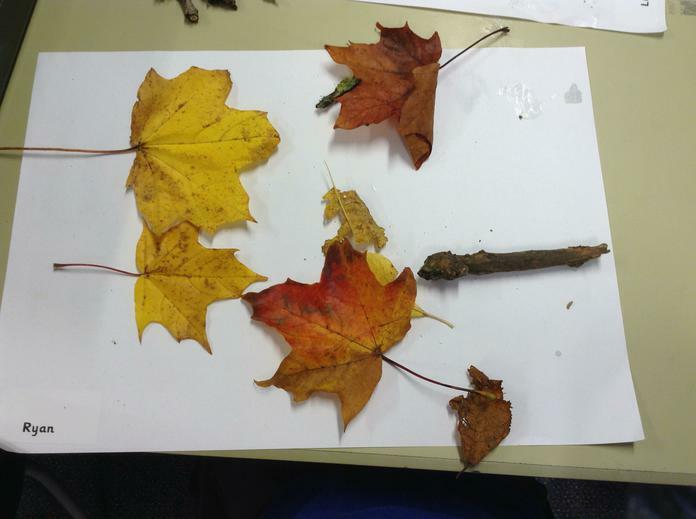 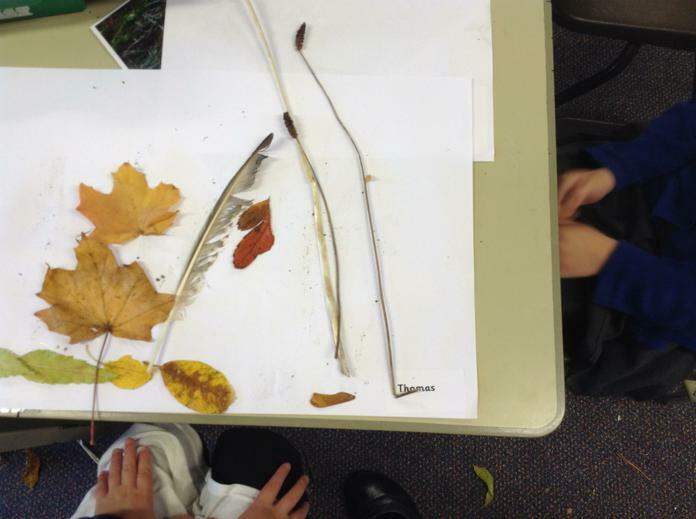 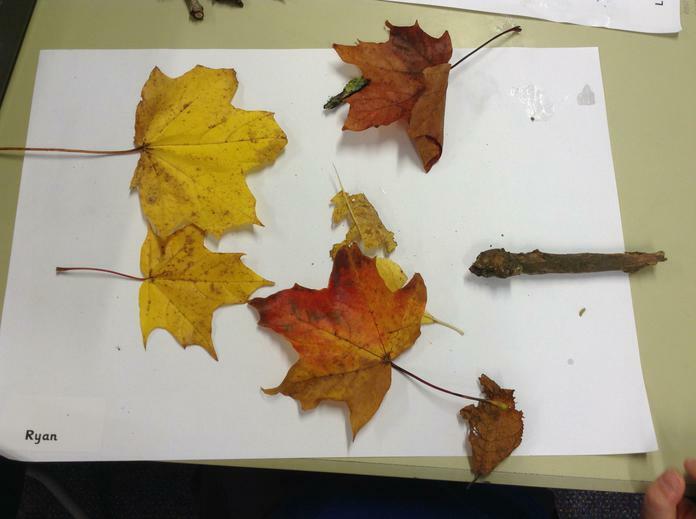 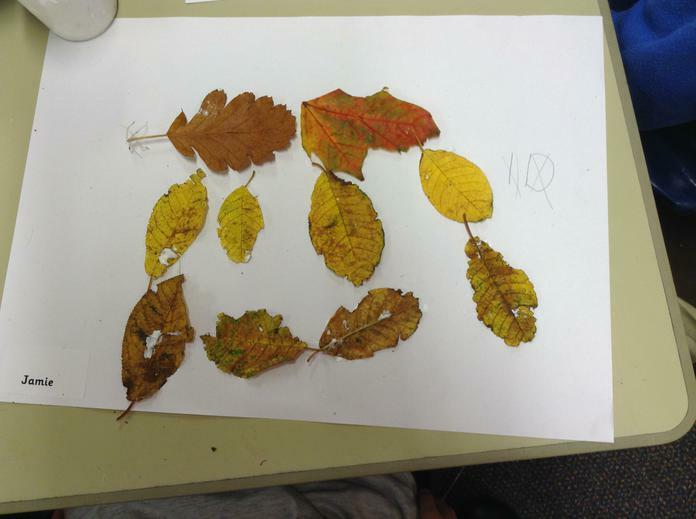 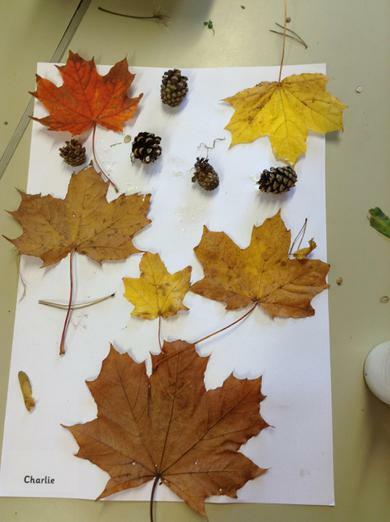 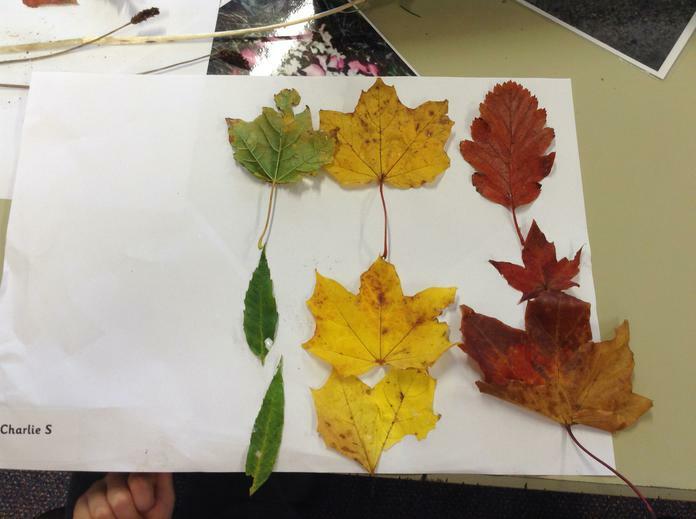 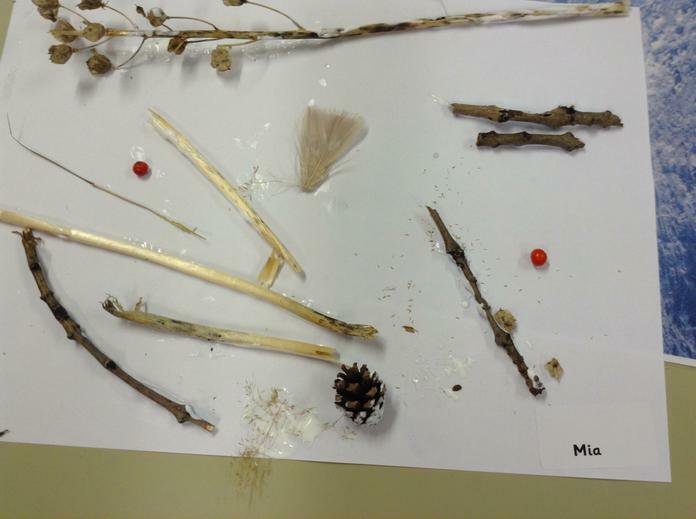 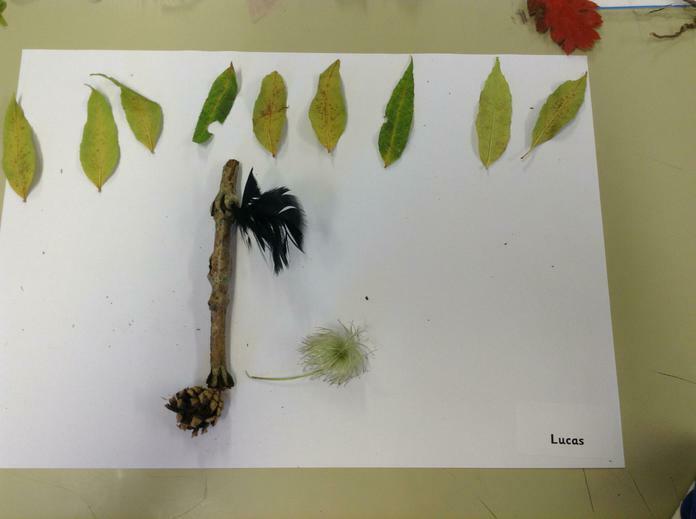 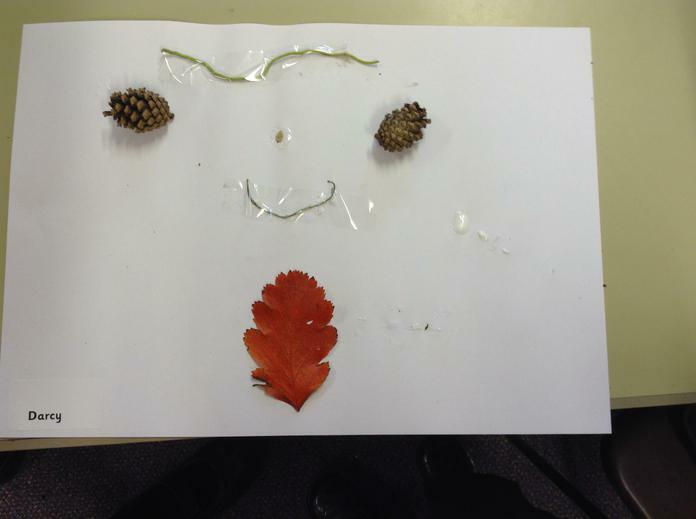 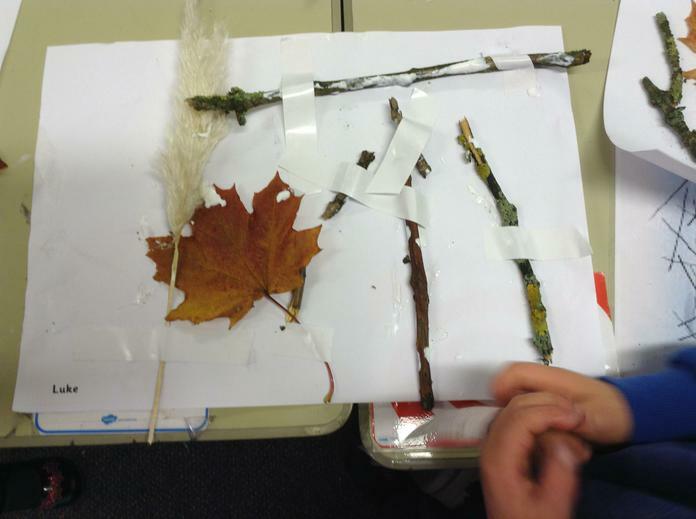 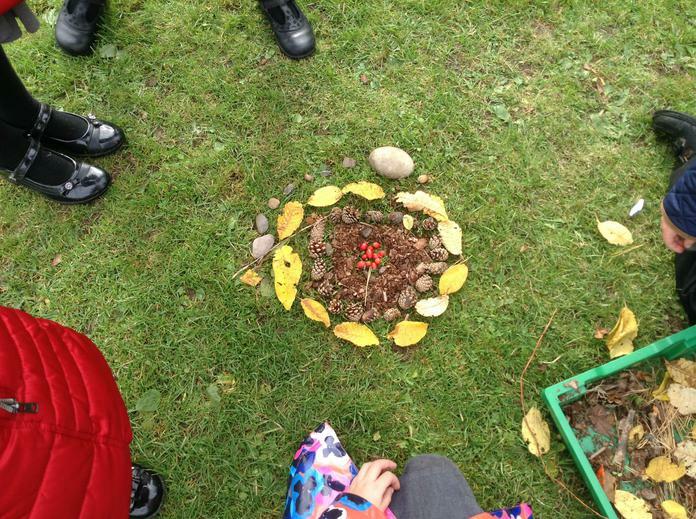 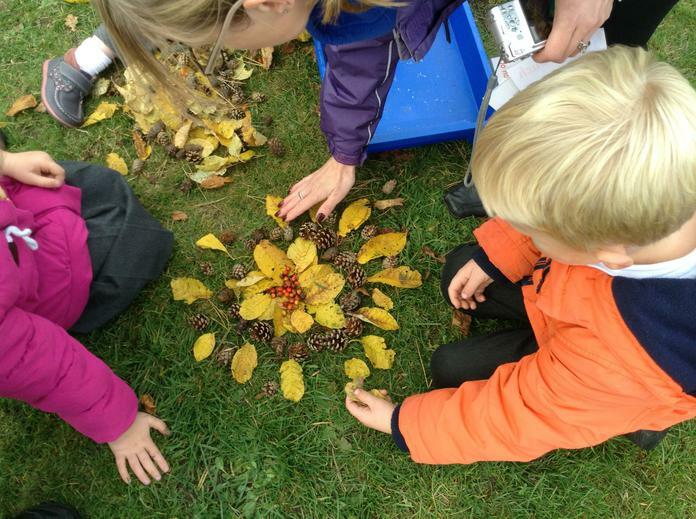 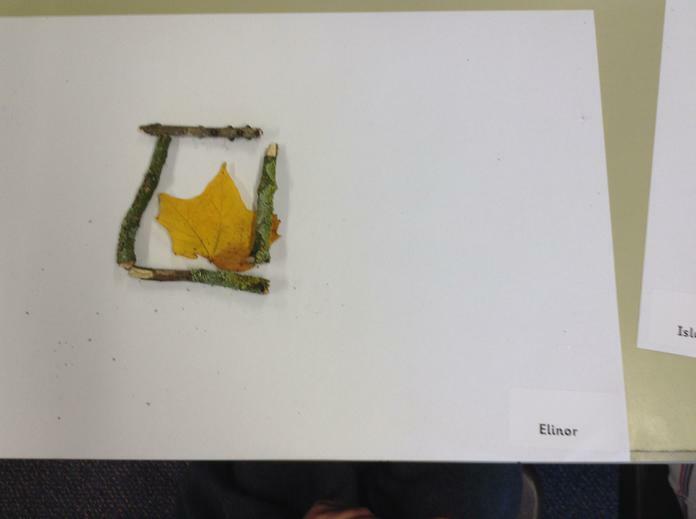 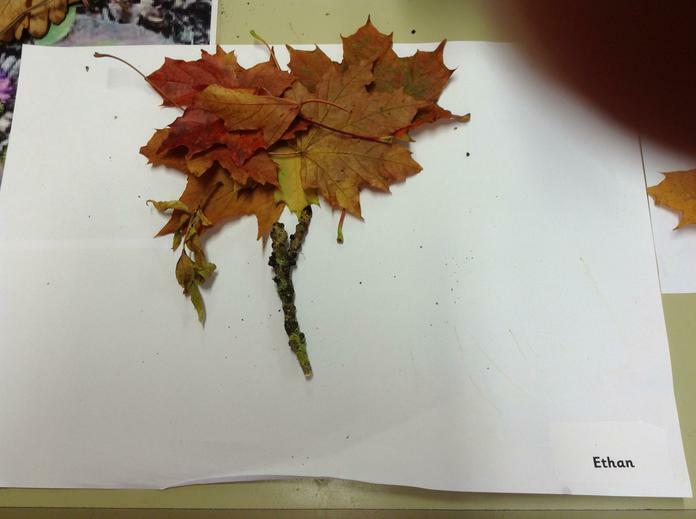 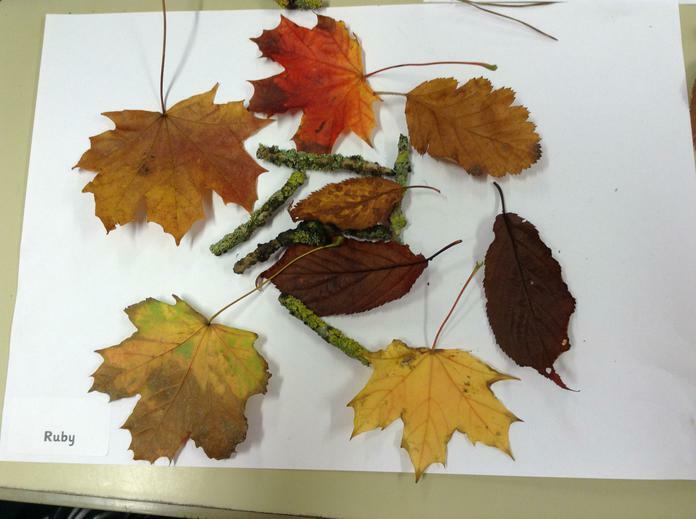 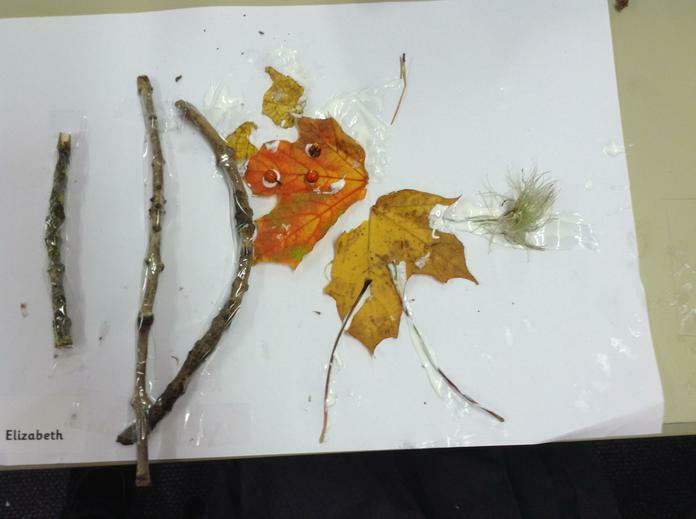 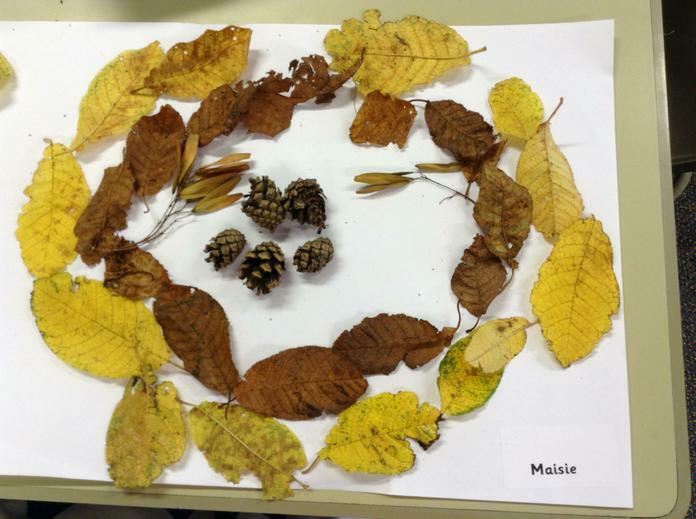 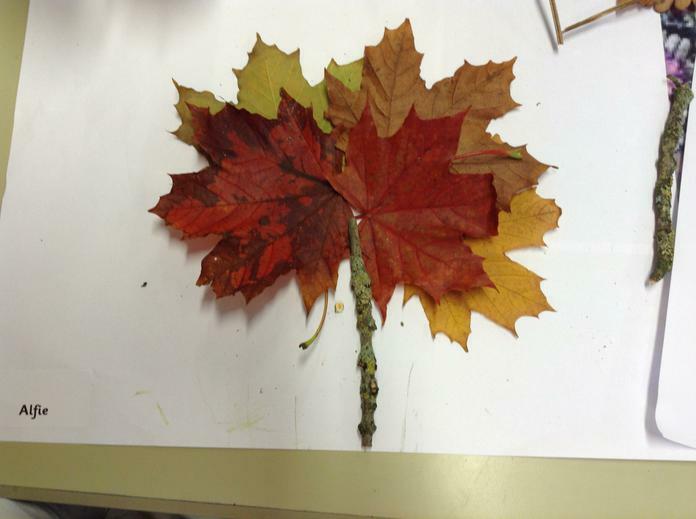 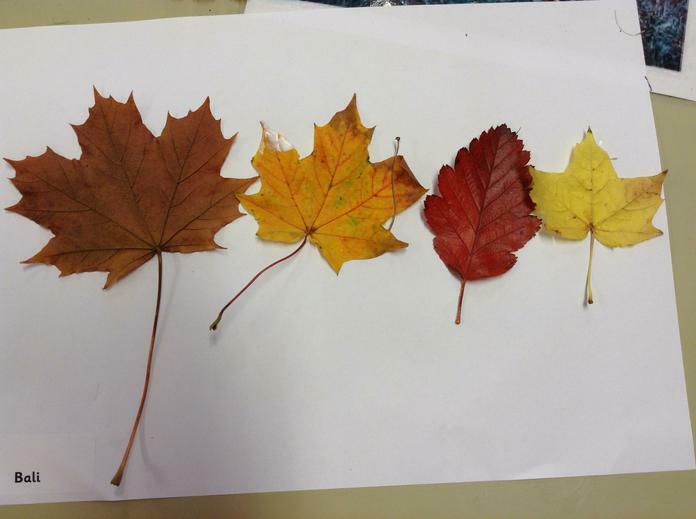 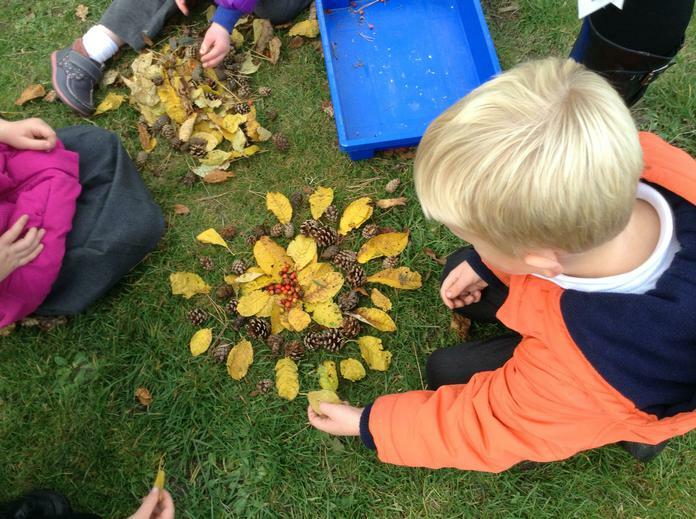 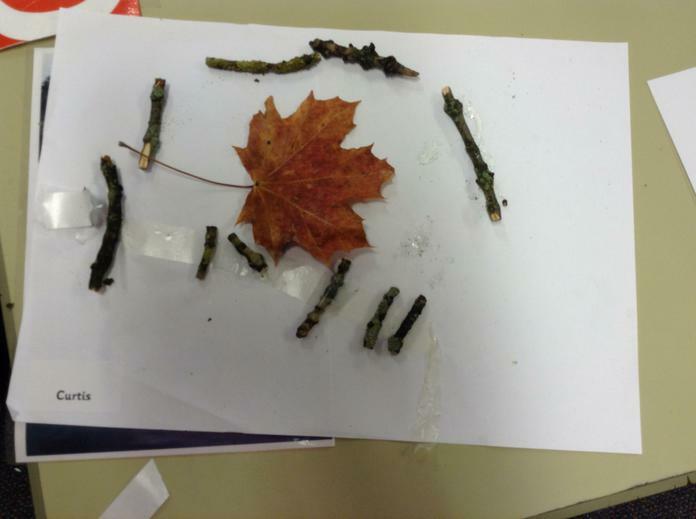 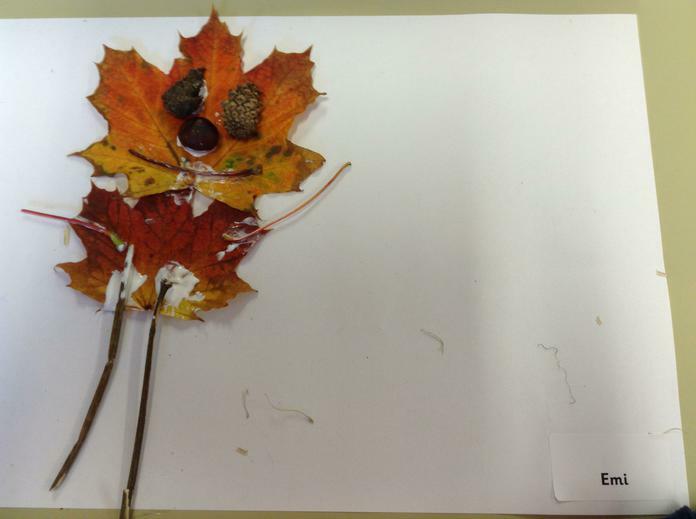 We made collages out of natural materials in the style of Andy Goldsworthy. 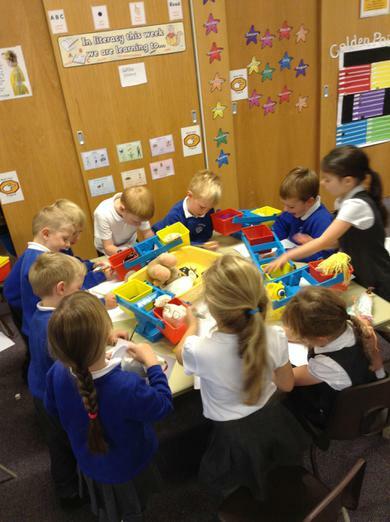 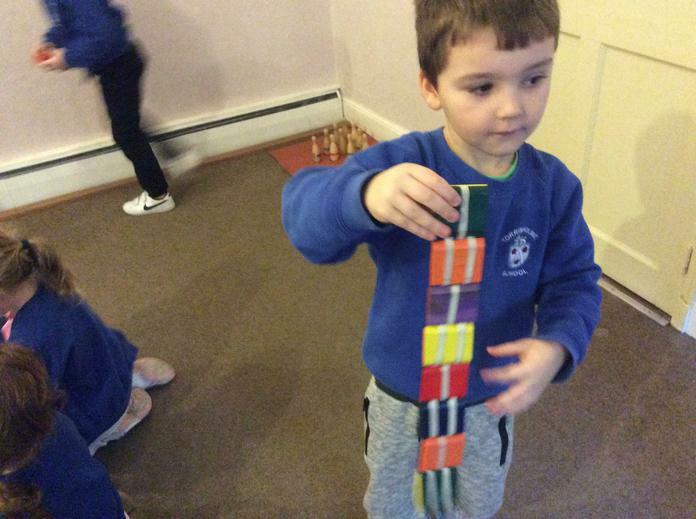 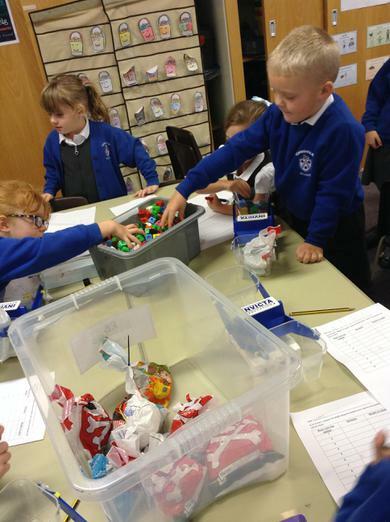 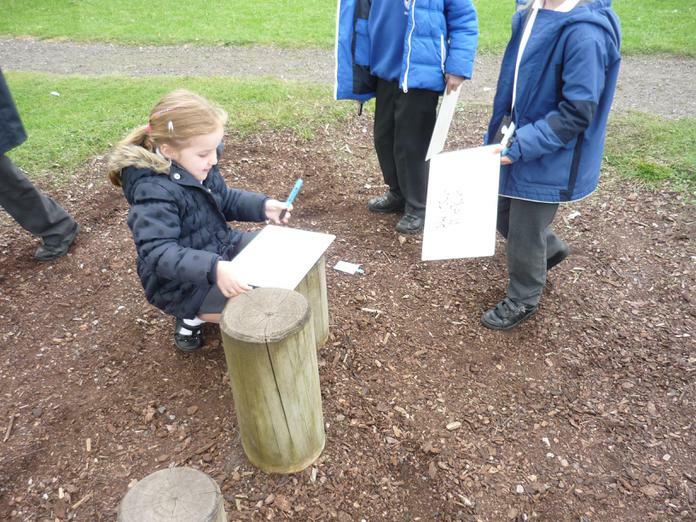 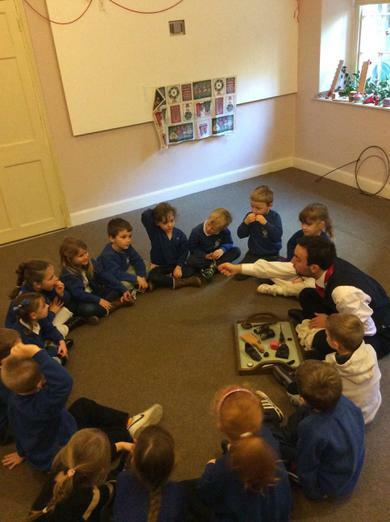 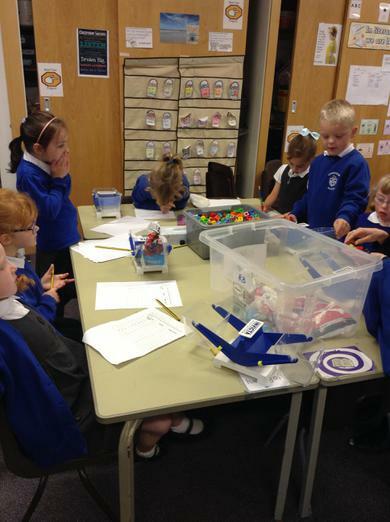 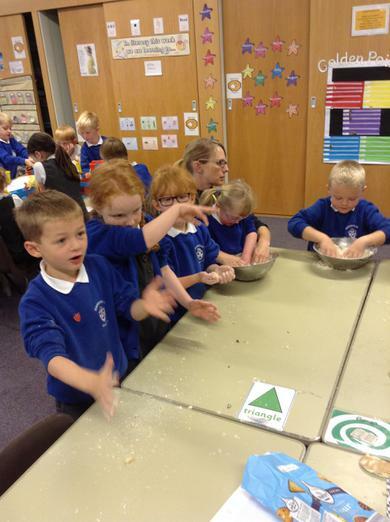 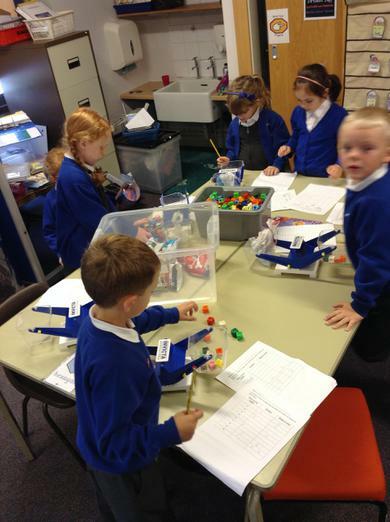 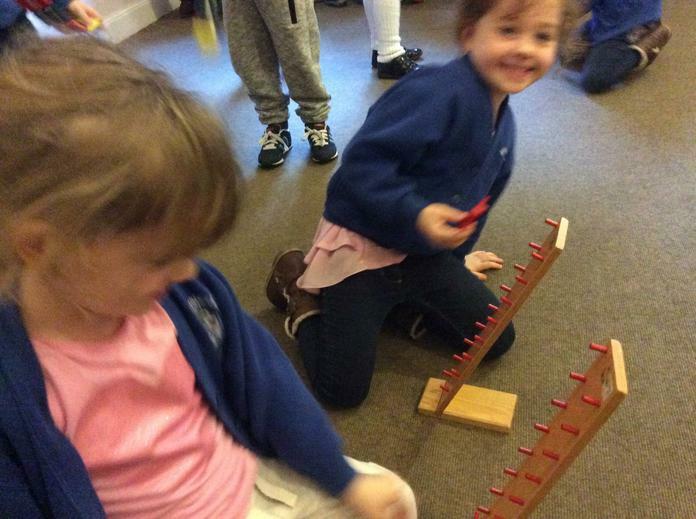 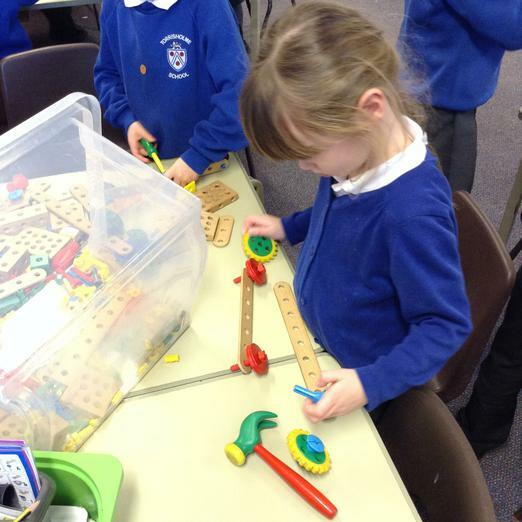 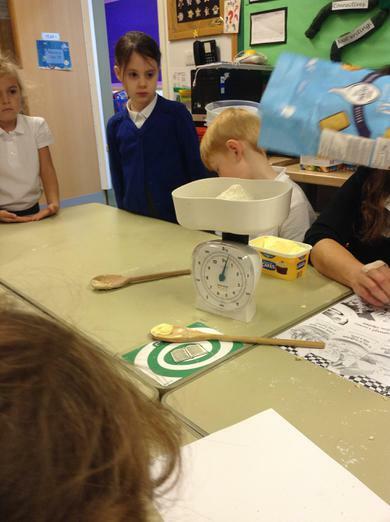 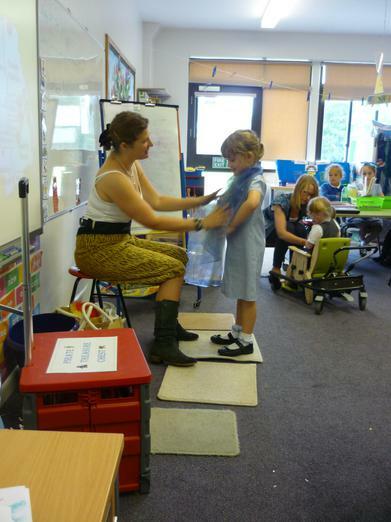 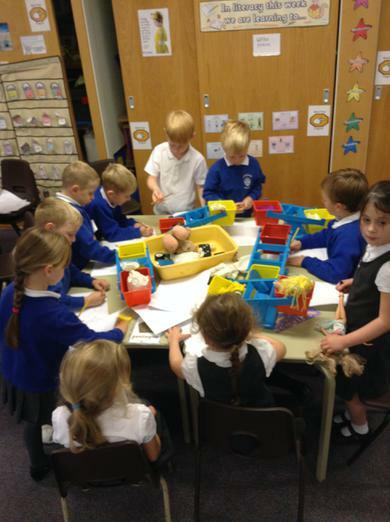 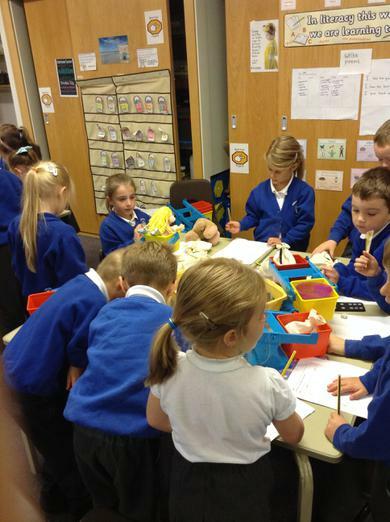 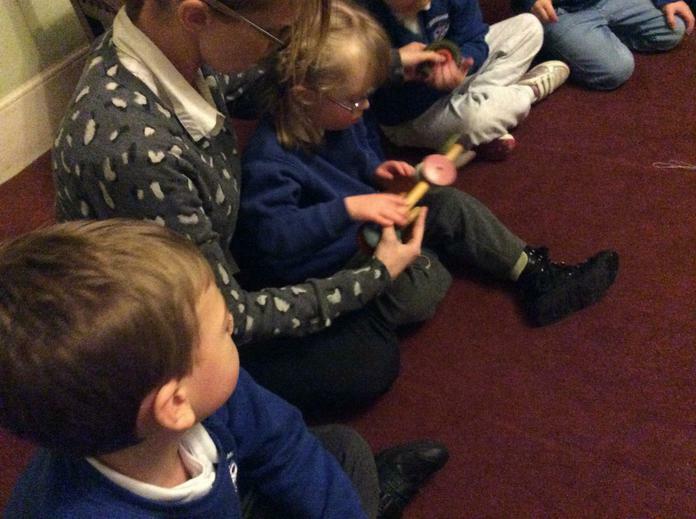 We had great fun on Monday learning all about measuring. 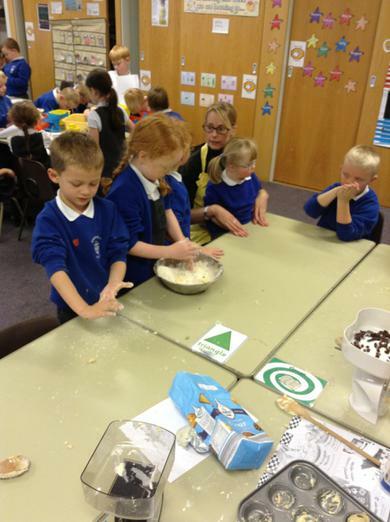 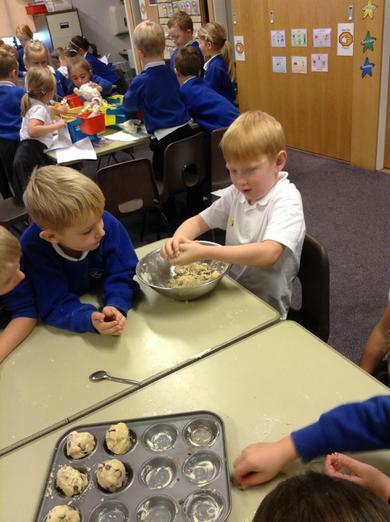 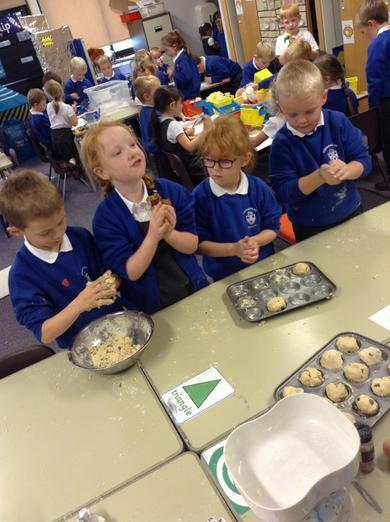 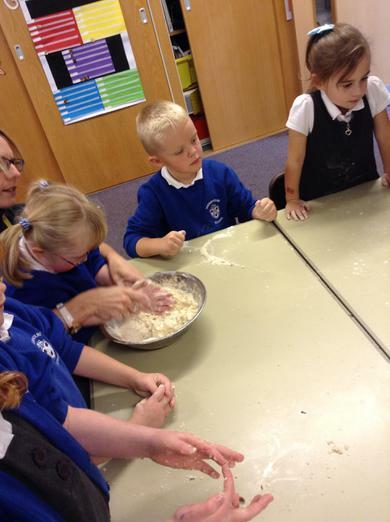 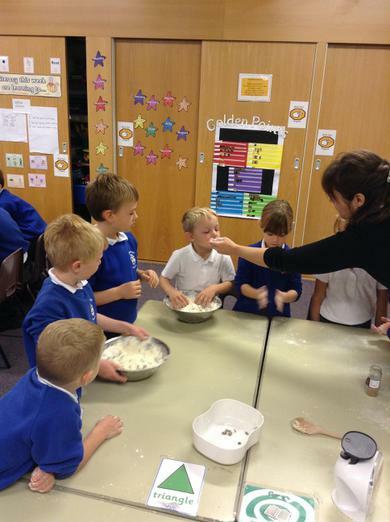 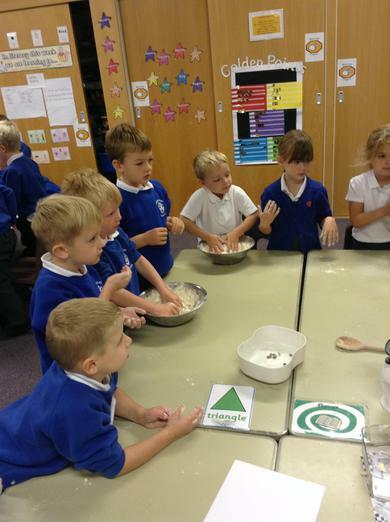 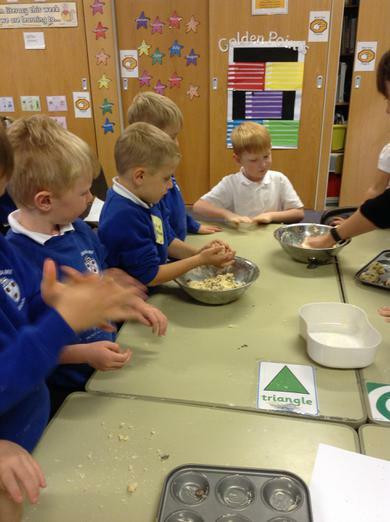 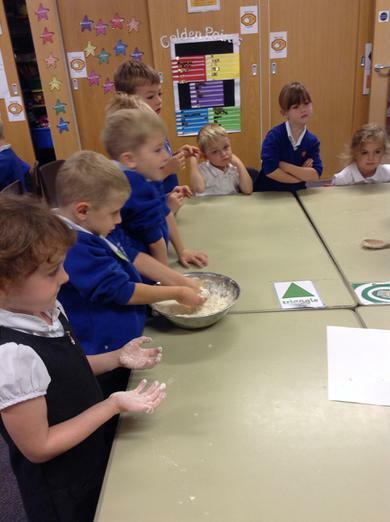 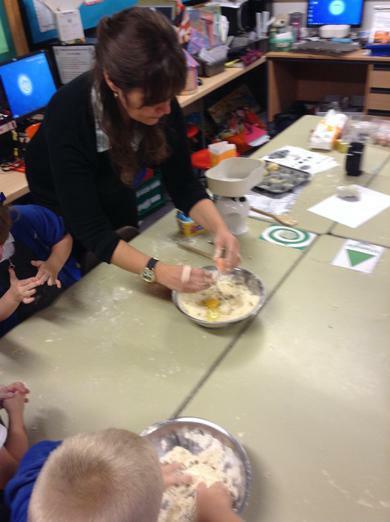 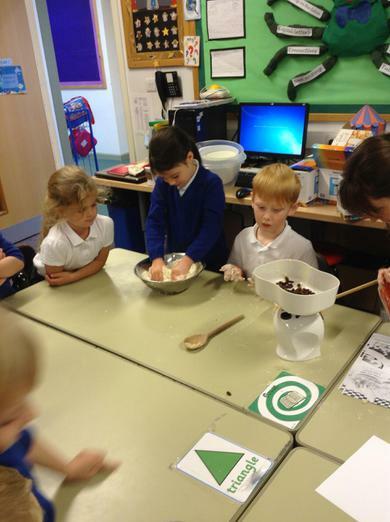 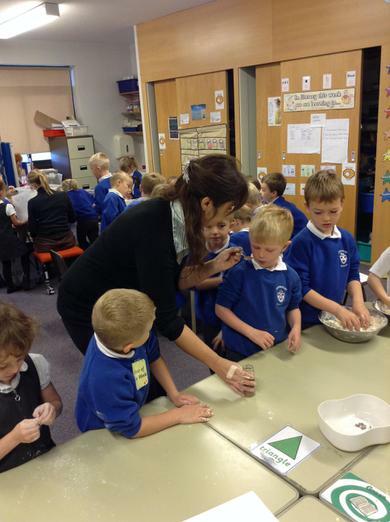 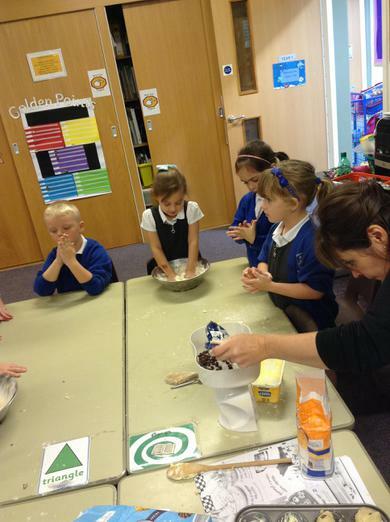 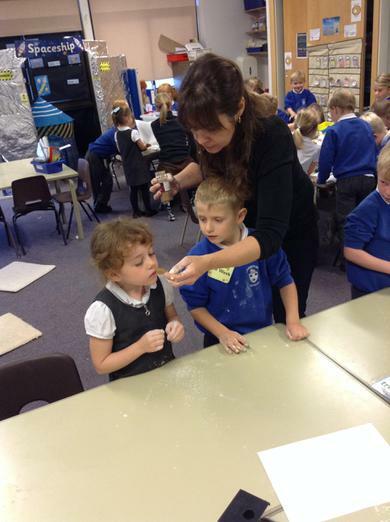 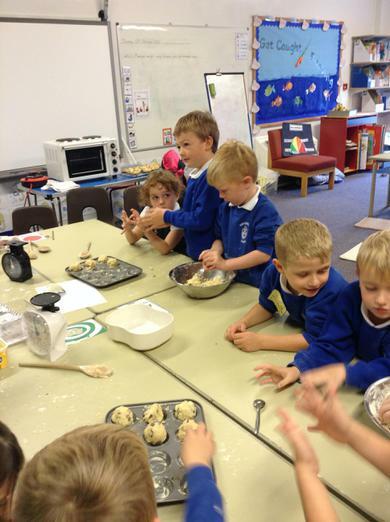 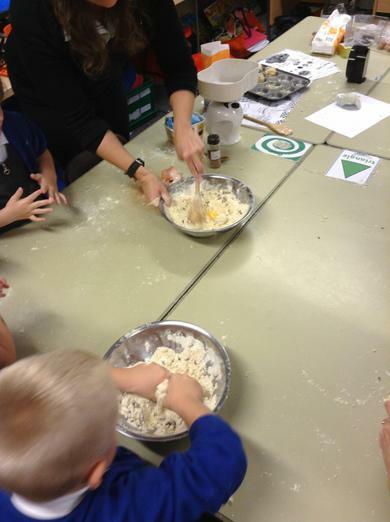 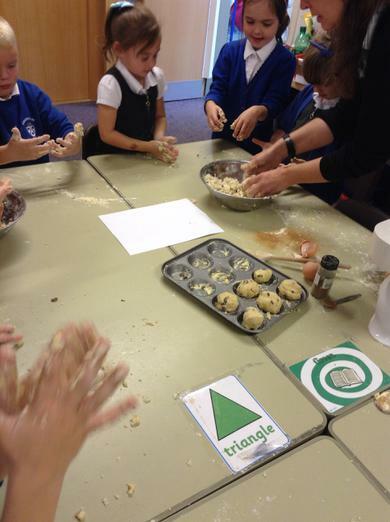 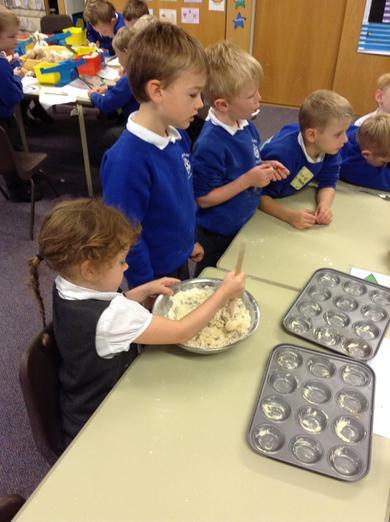 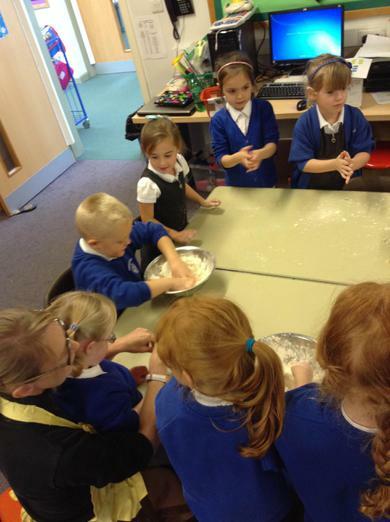 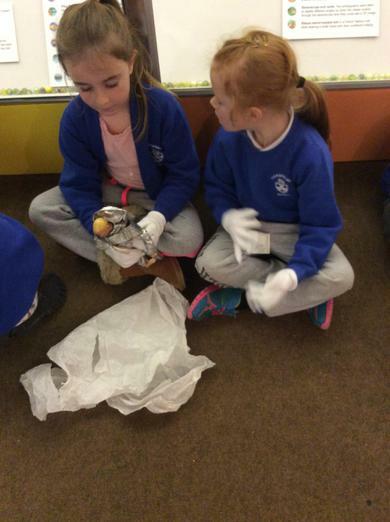 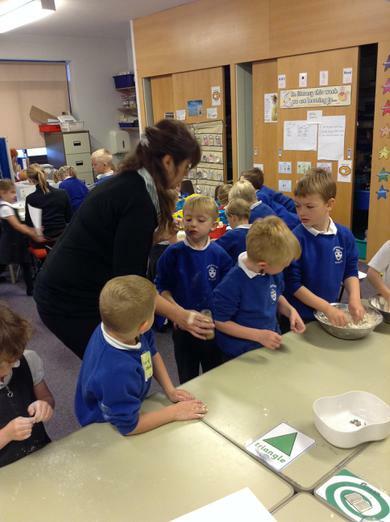 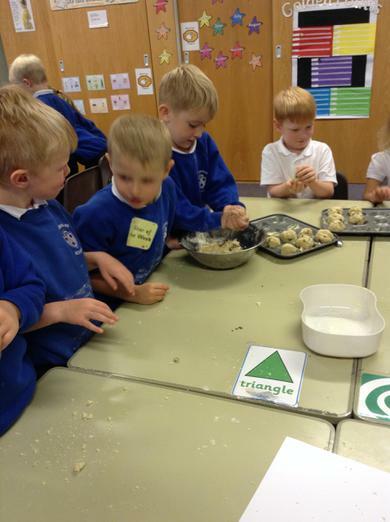 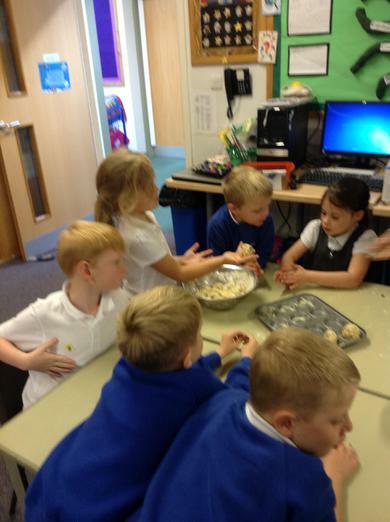 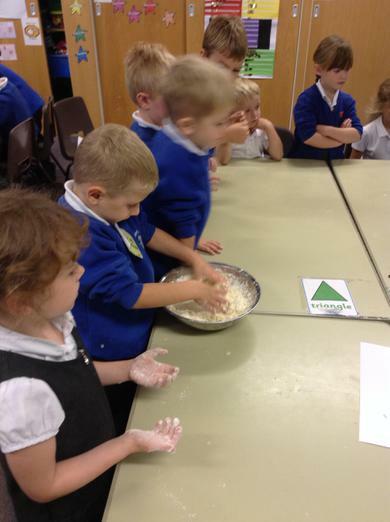 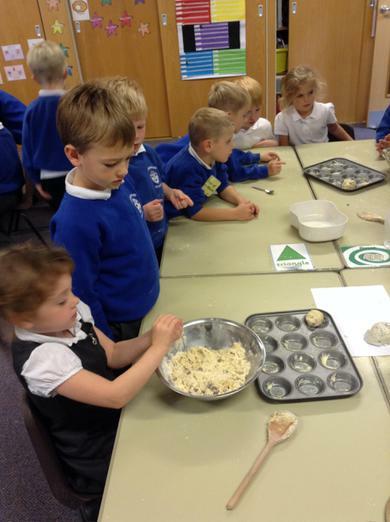 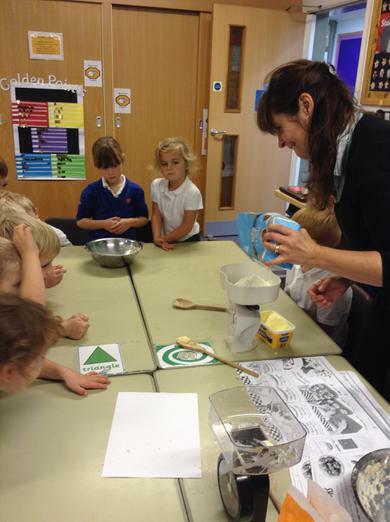 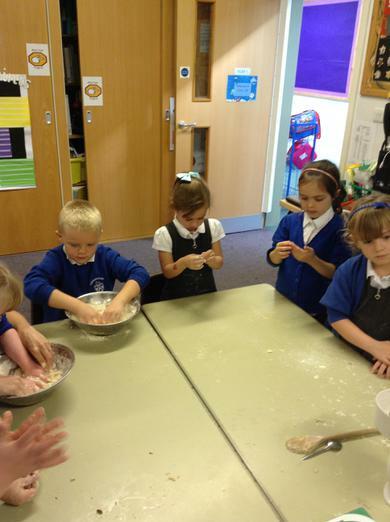 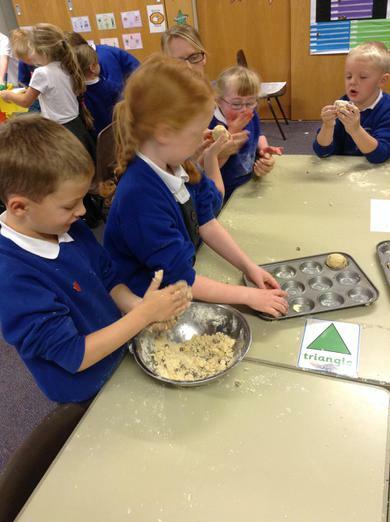 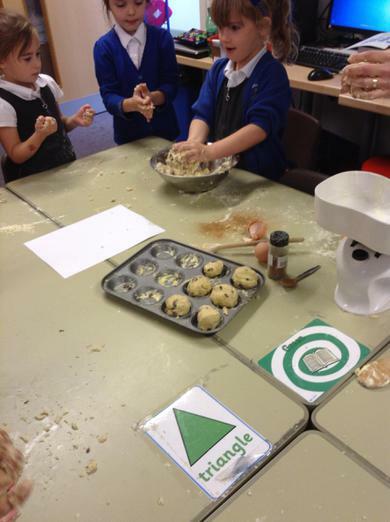 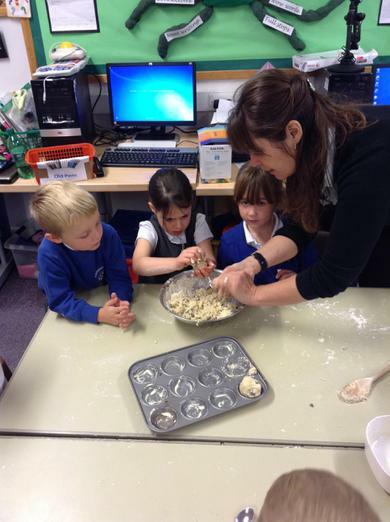 We did different activities, including following instructions to make moon rocks! 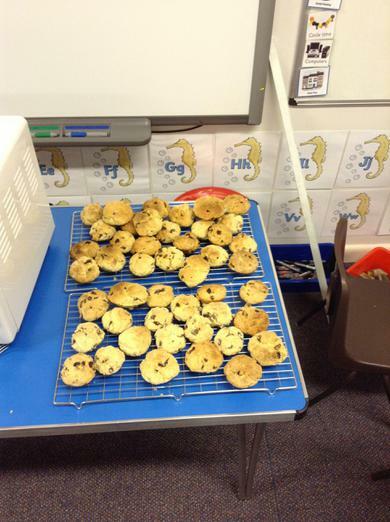 We all got to help make them and they were delicious!